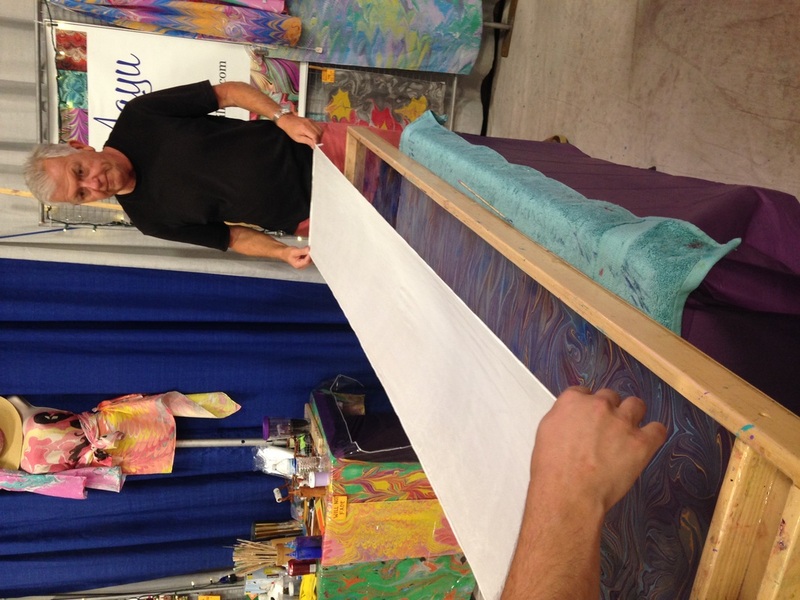 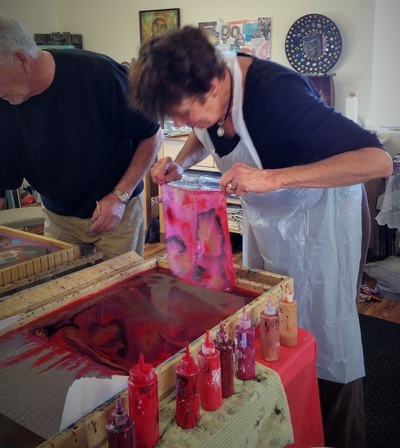 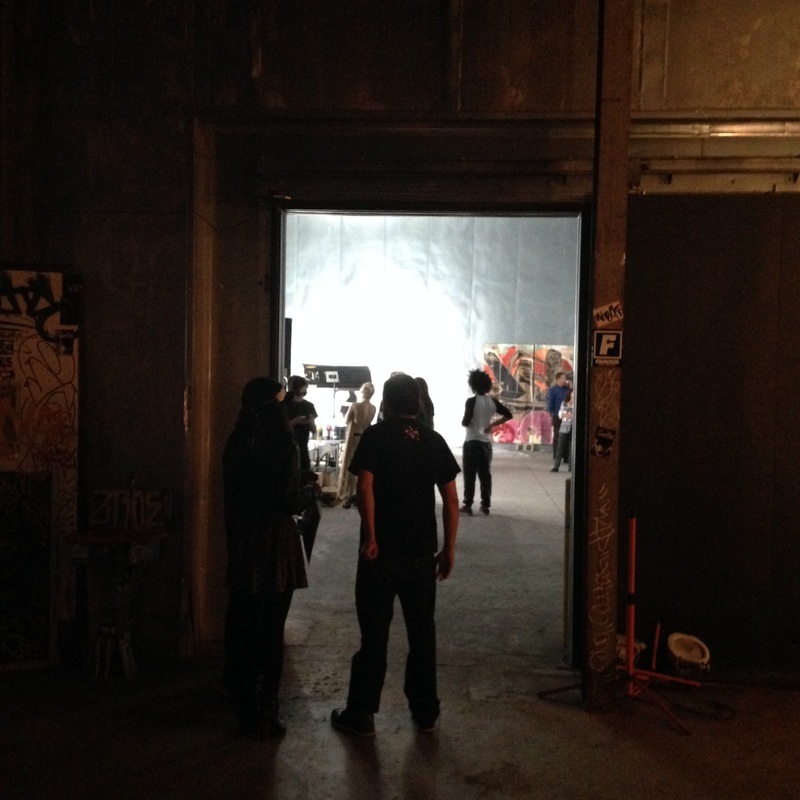 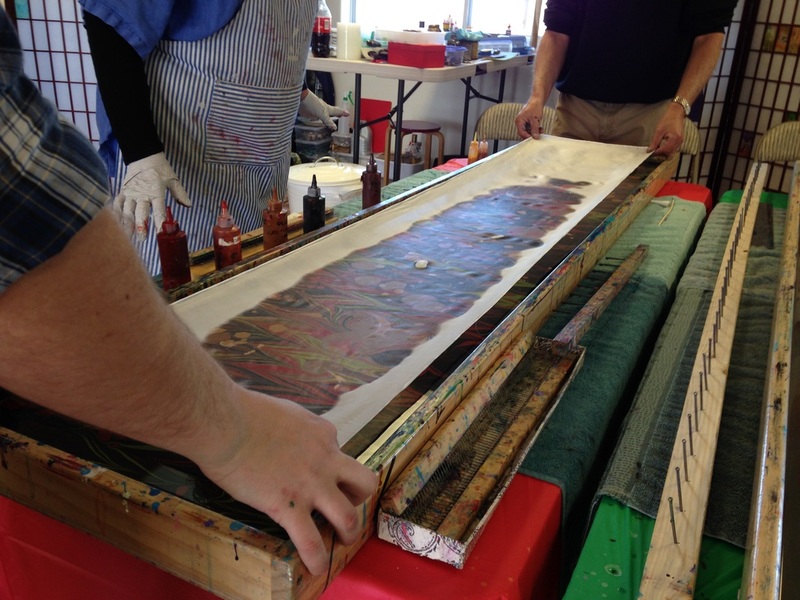 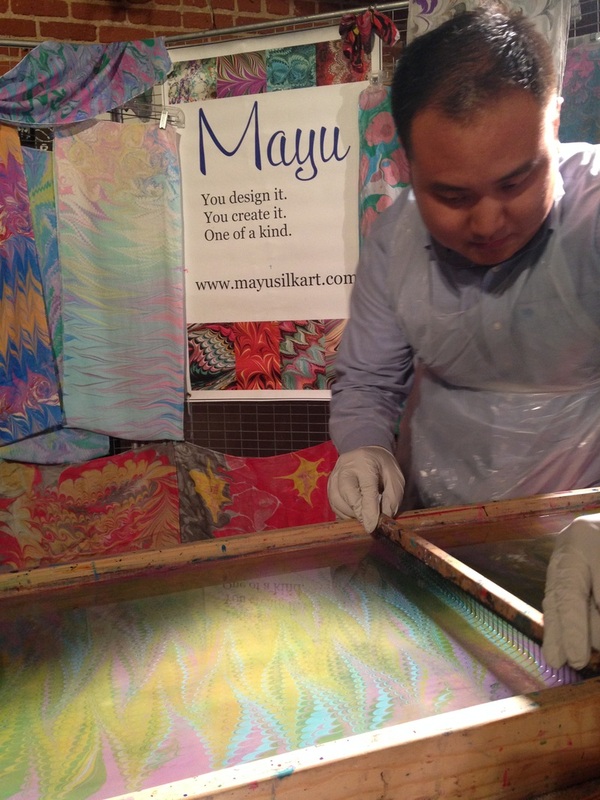 What is the Mayu Silk Art Experience? 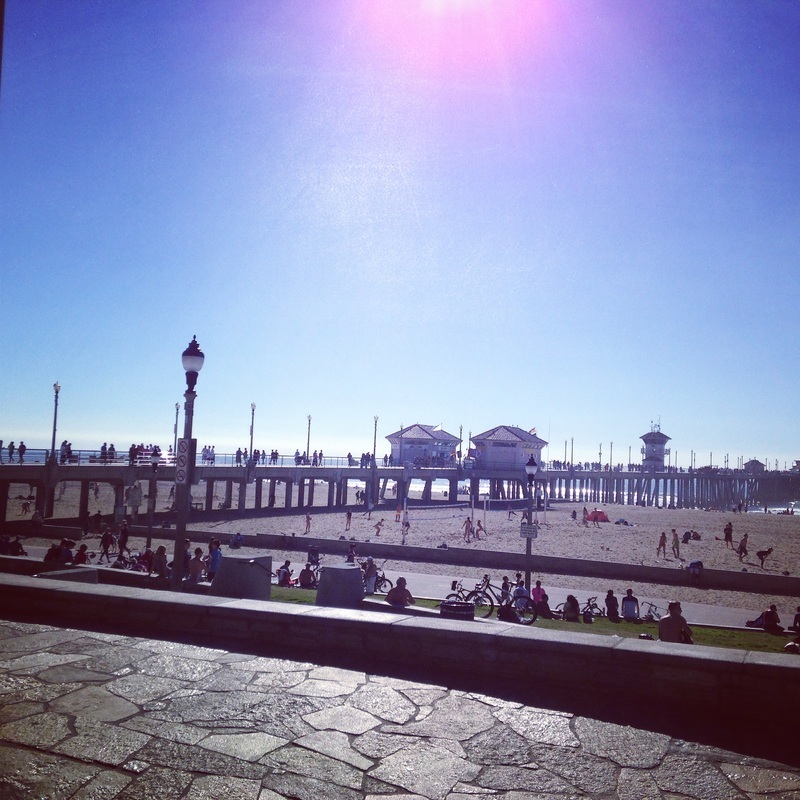 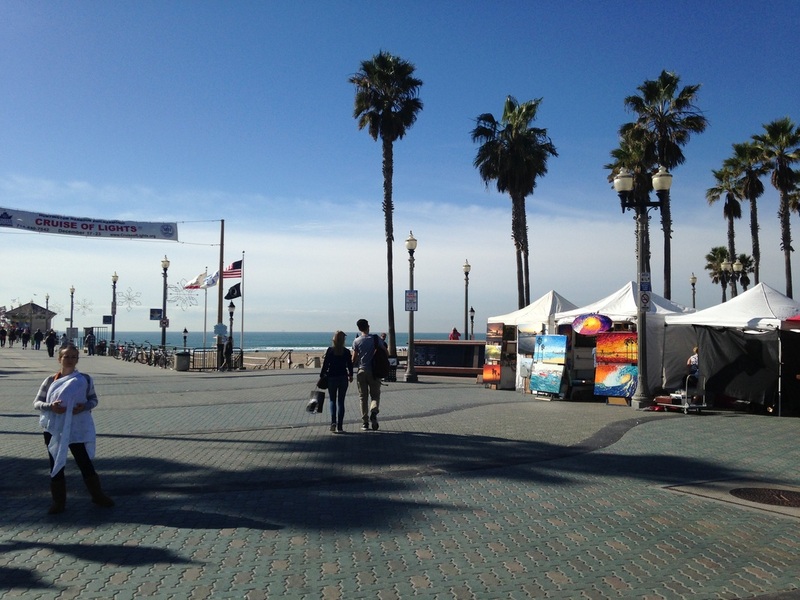 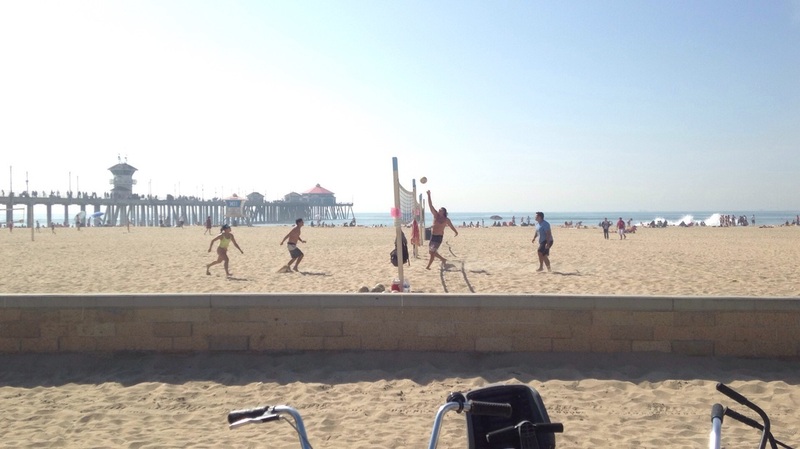 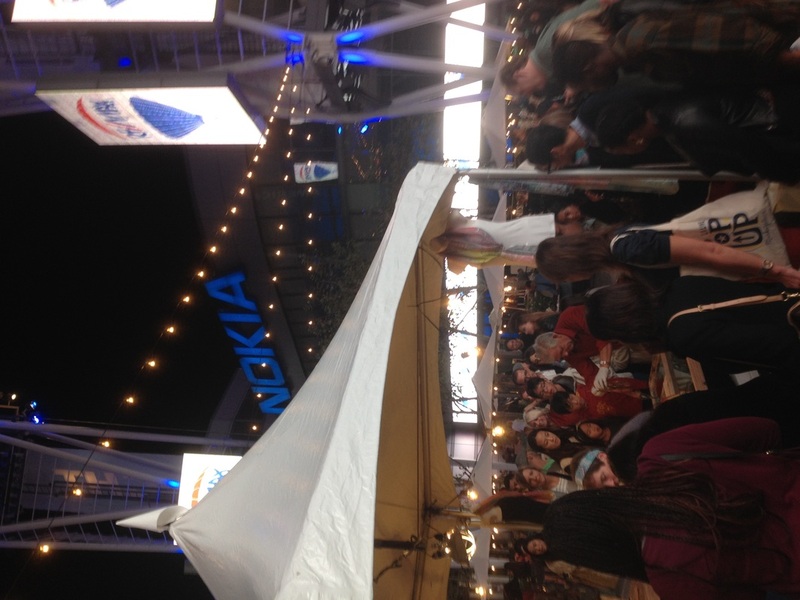 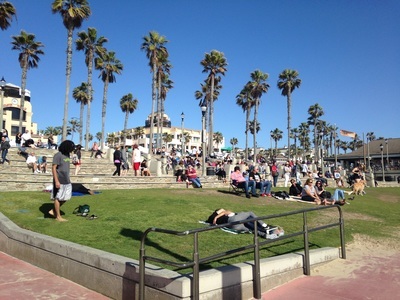 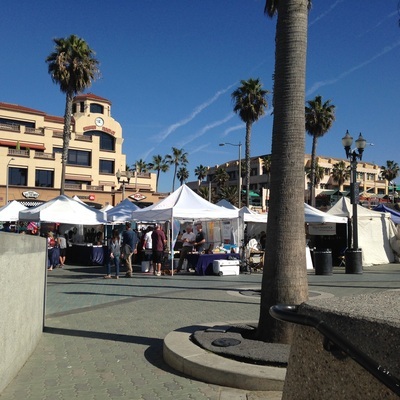 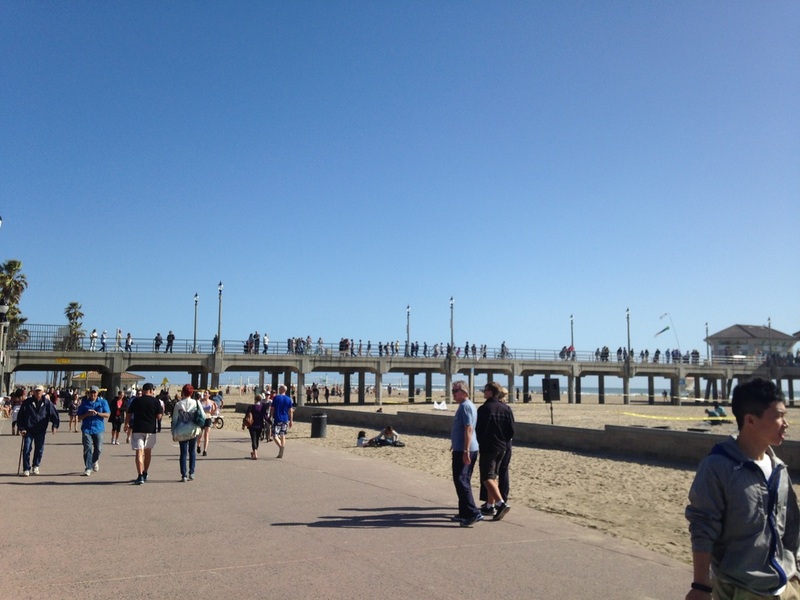 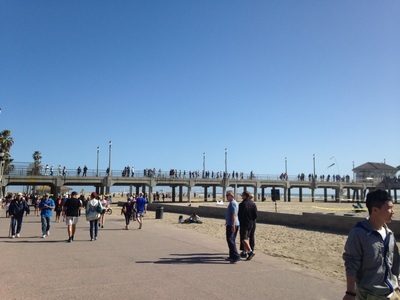 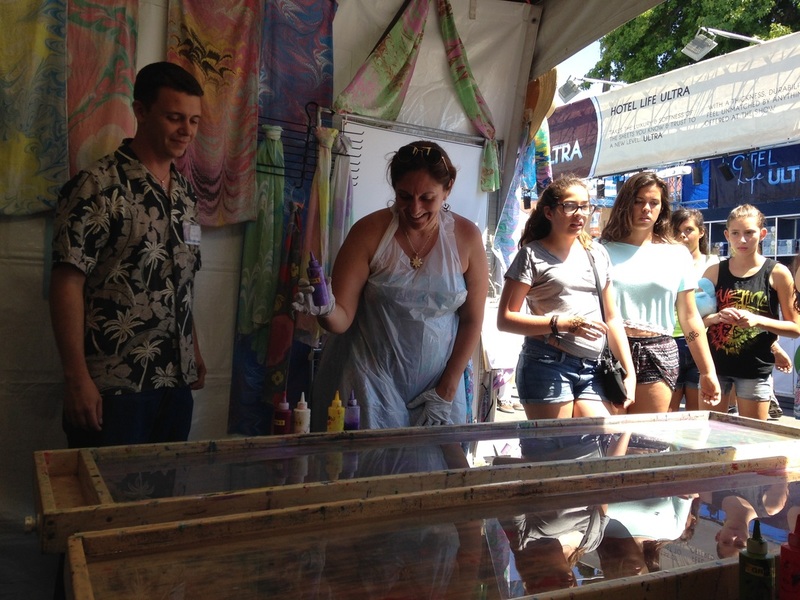 Our very own Kennedy Martin shared this video log of her first visit to our booth back in 2015, when she made a tour of California colleges. 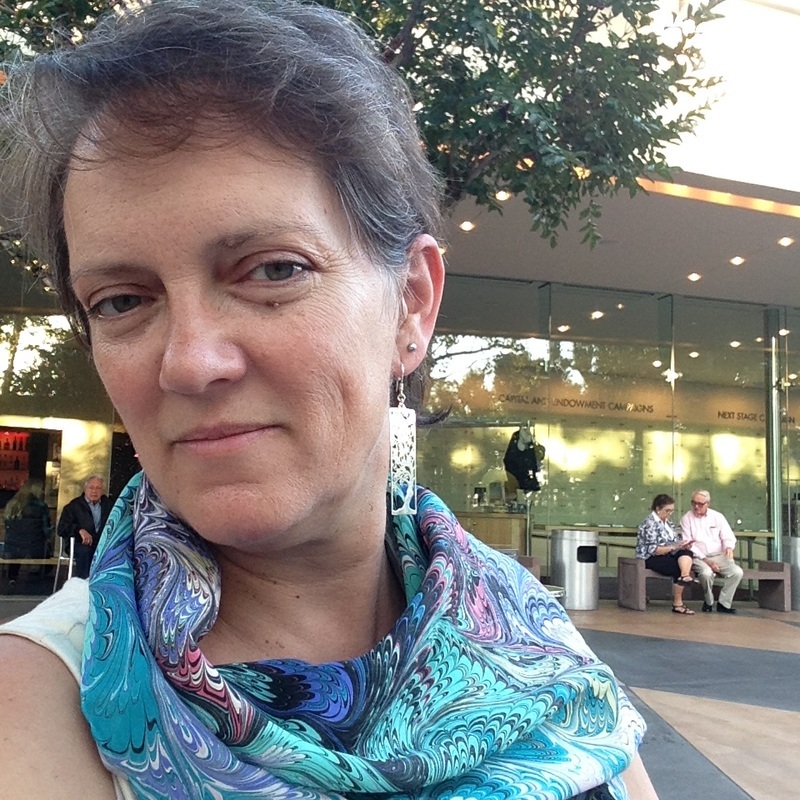 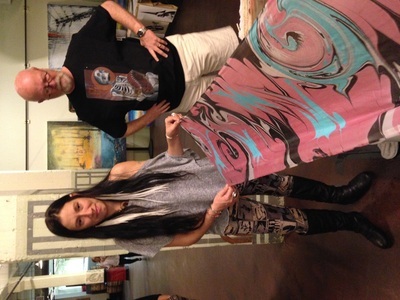 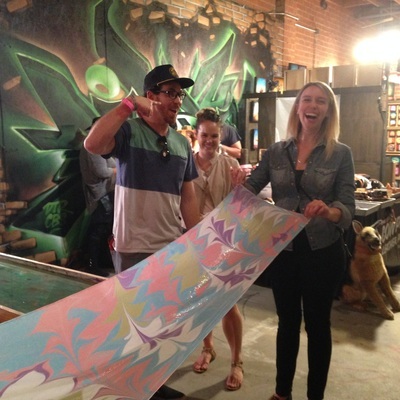 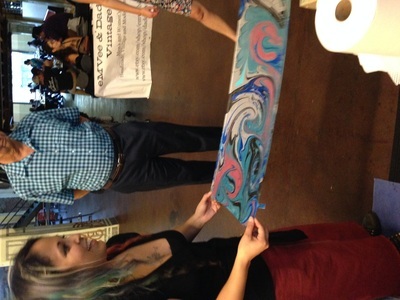 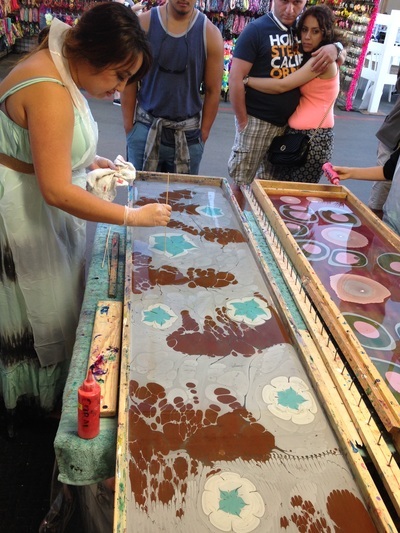 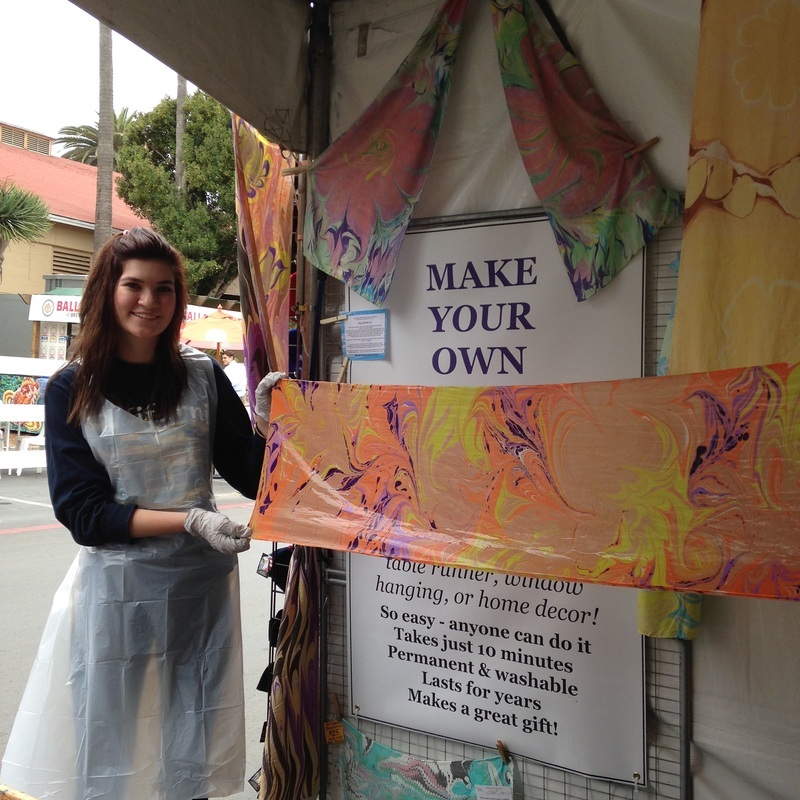 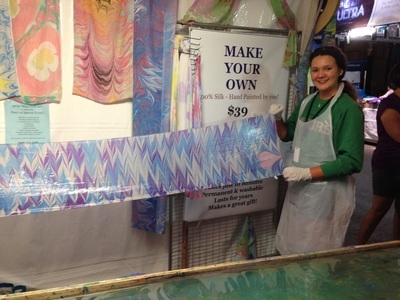 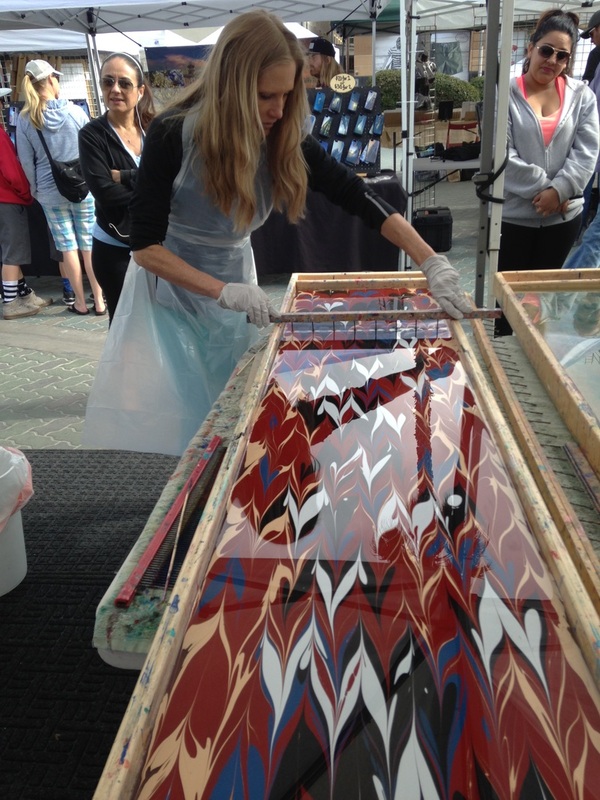 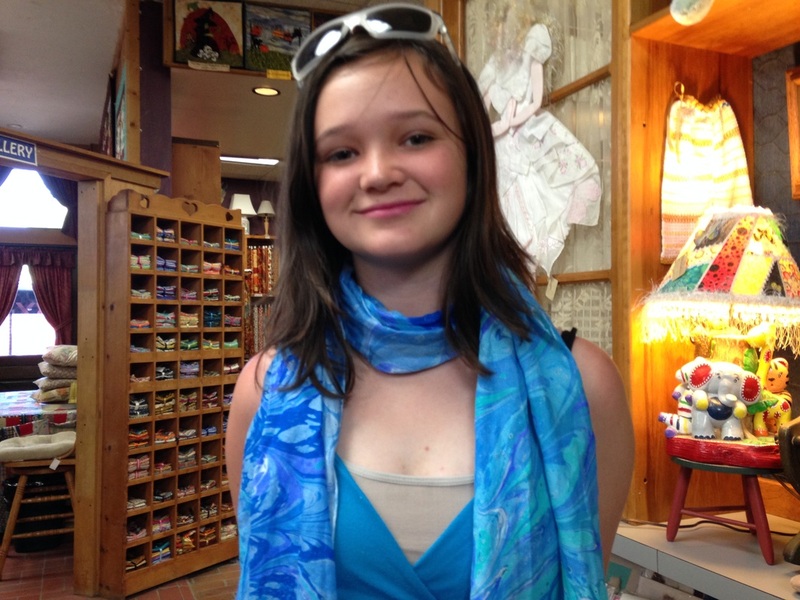 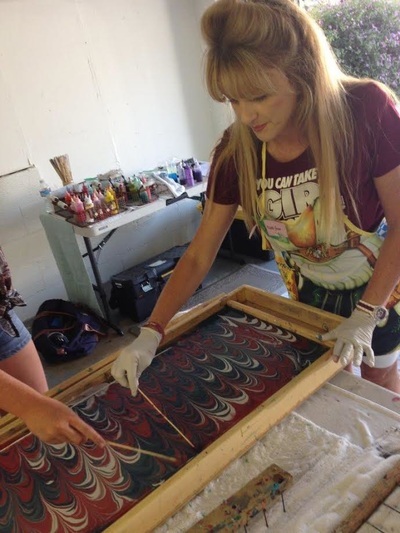 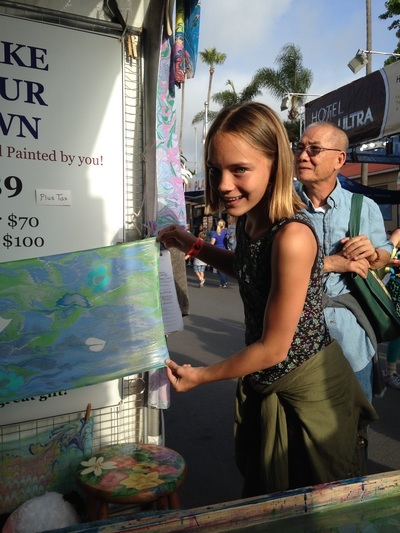 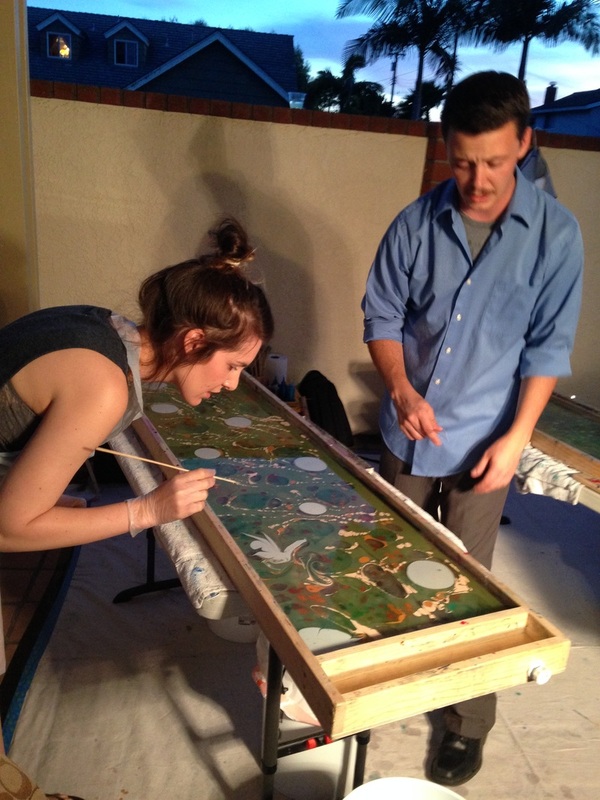 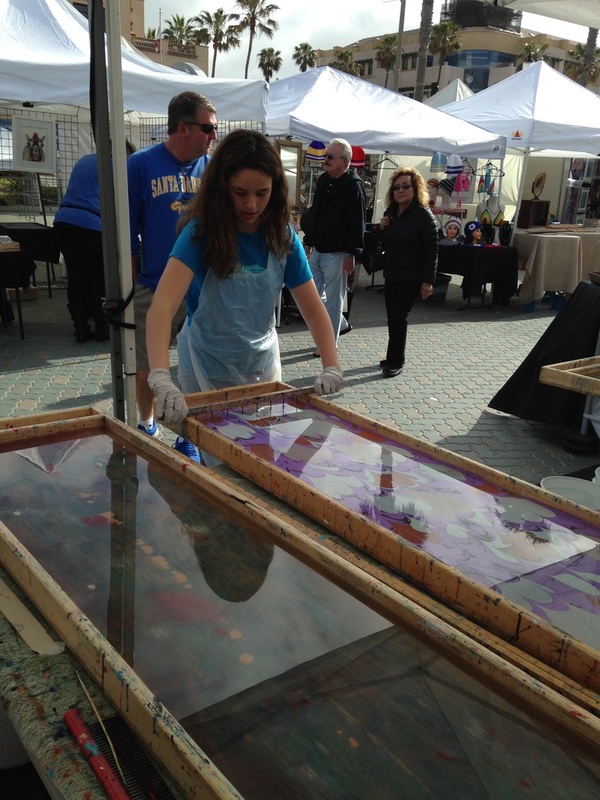 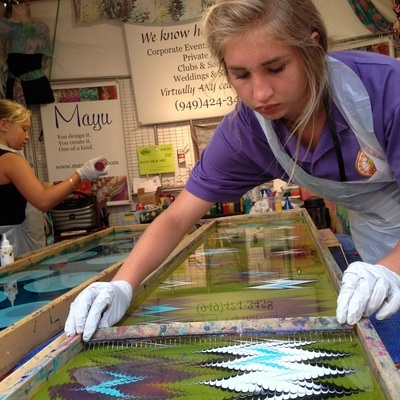 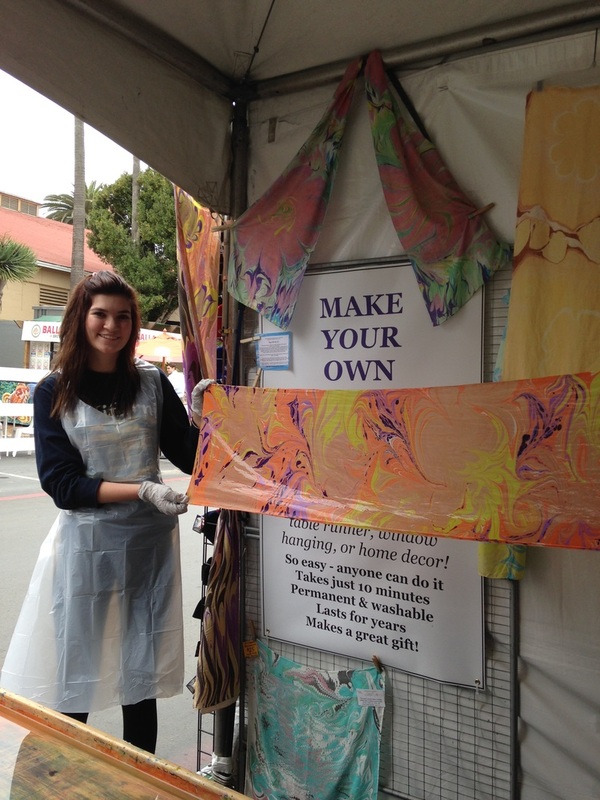 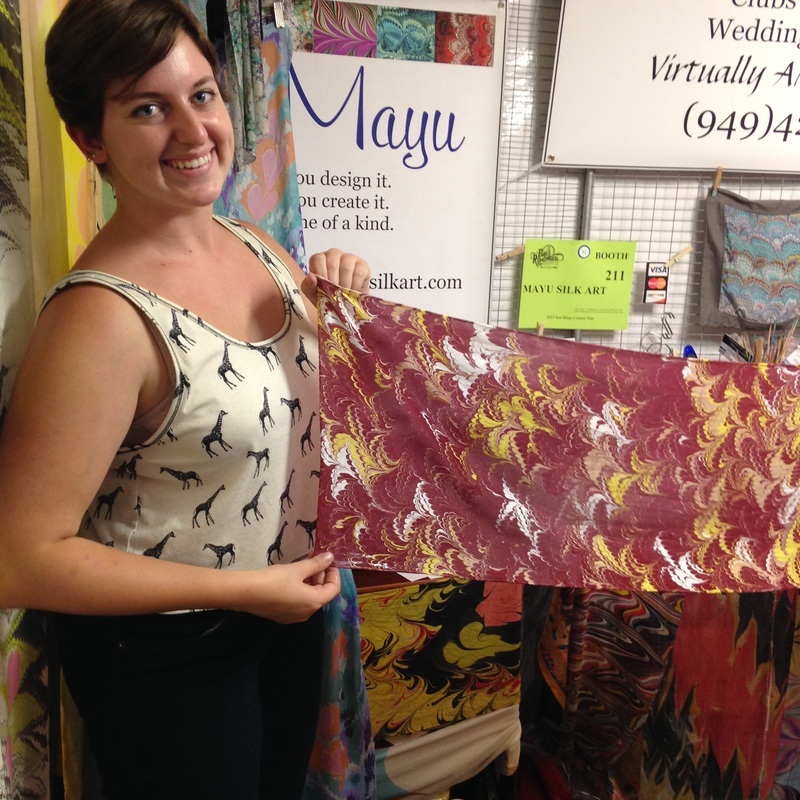 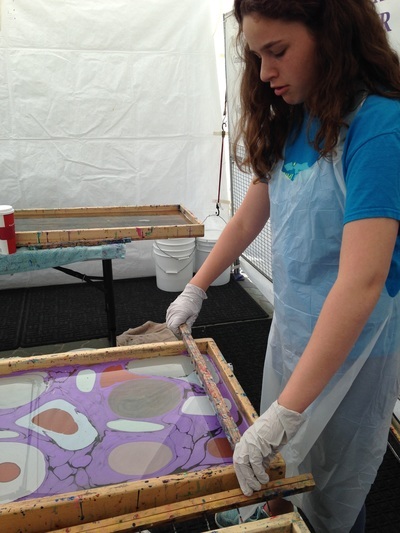 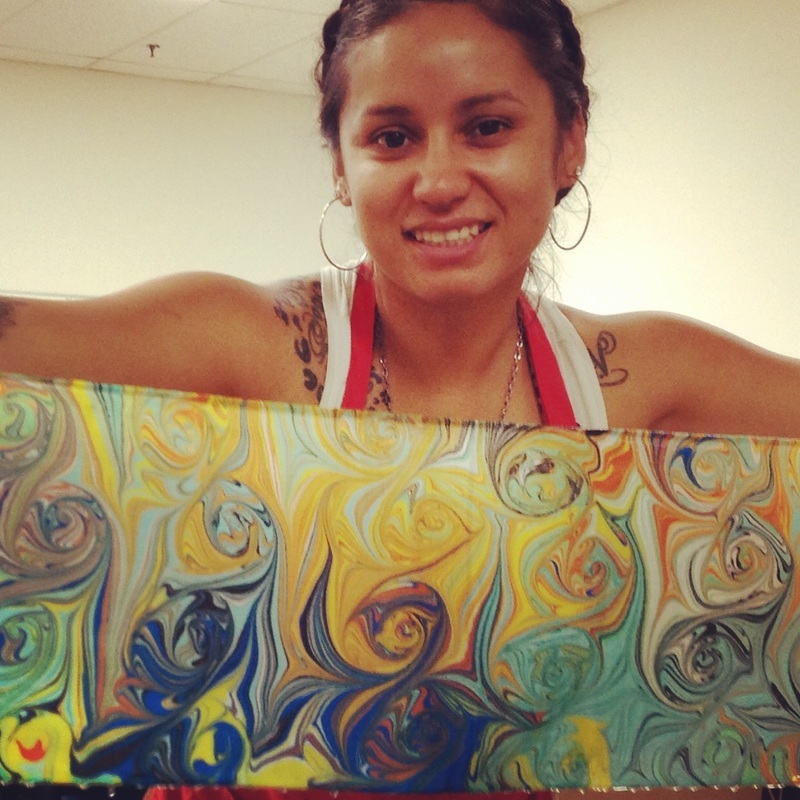 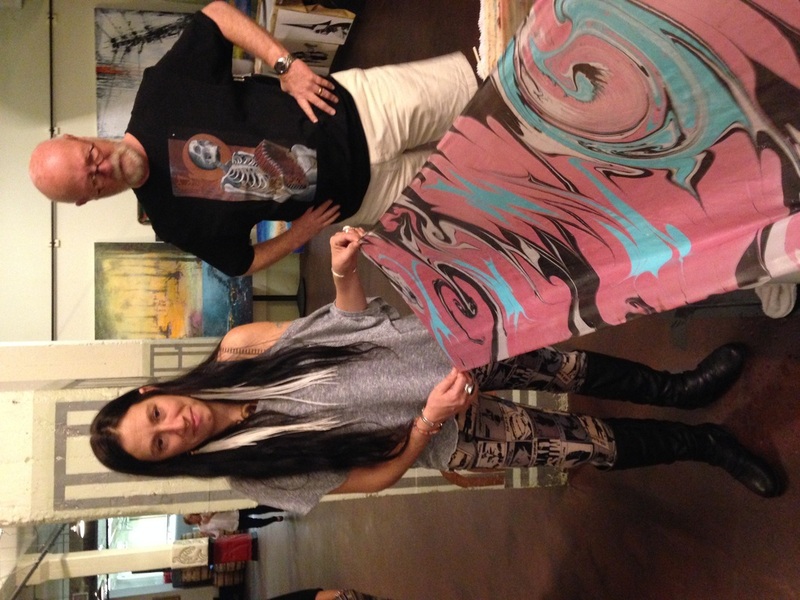 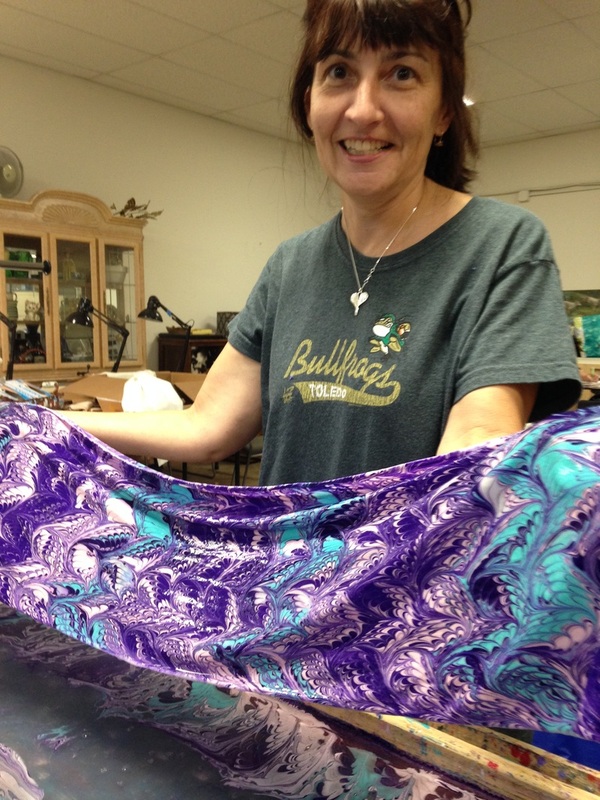 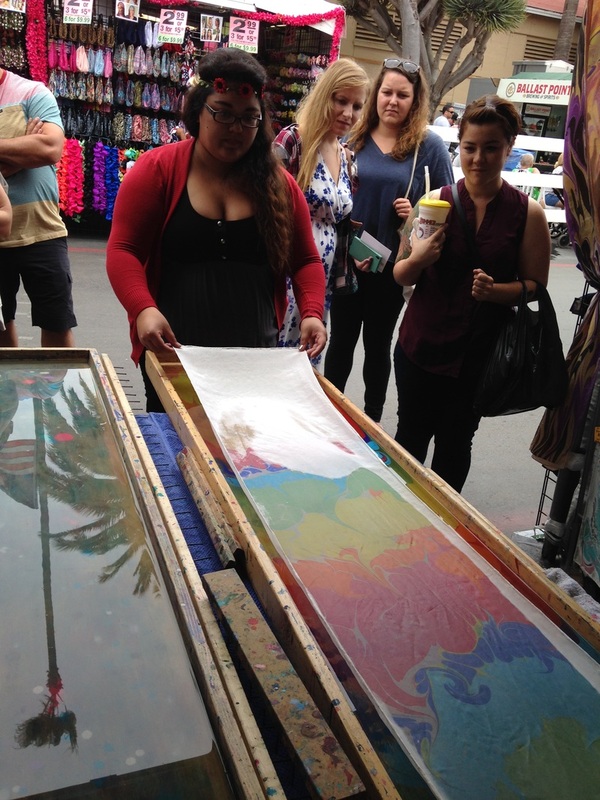 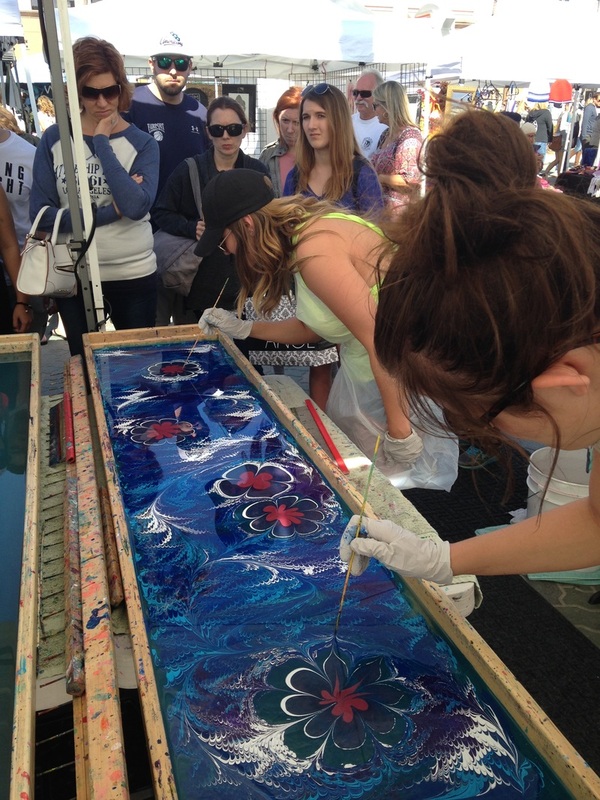 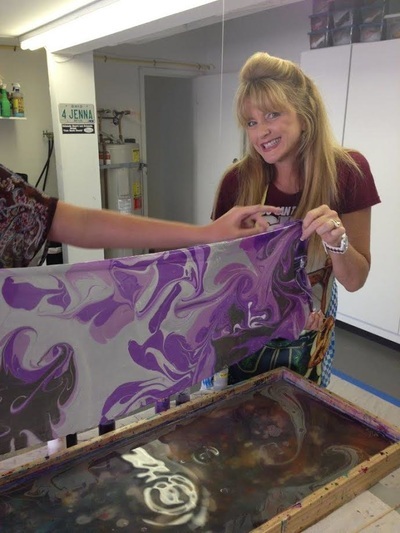 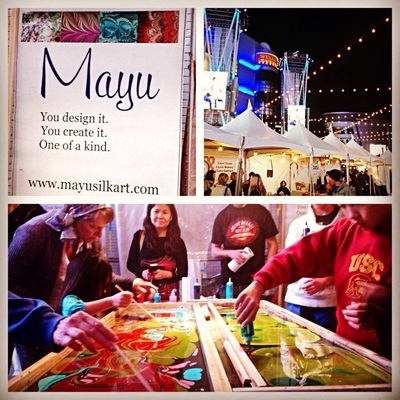 Ultimately, she selected Chapman University, and is now a member of the Mayu Silk Art team! 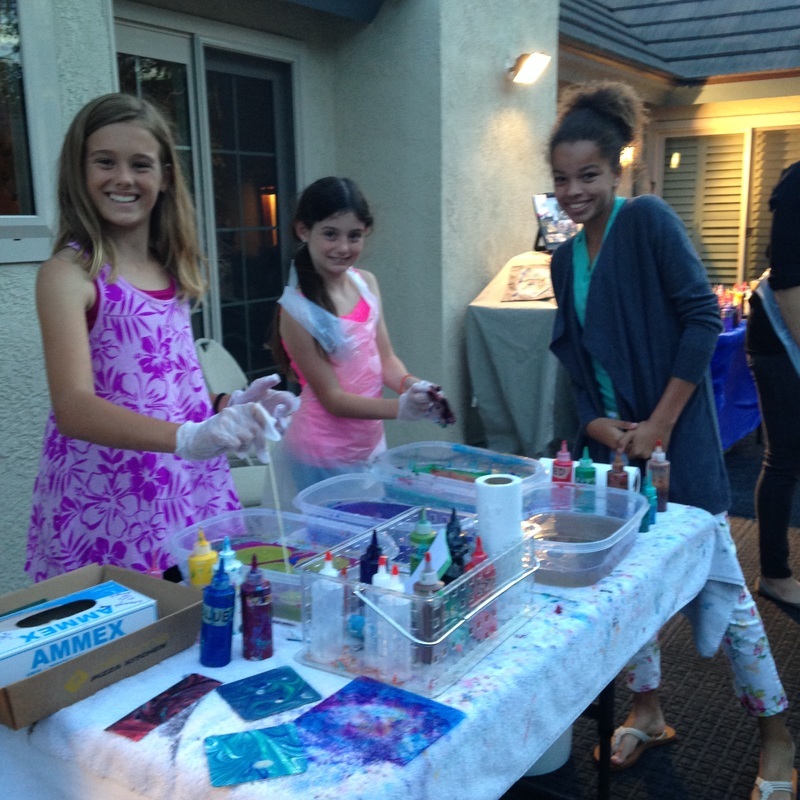 We are so proud of Kennedy and absolutely LOVE this fun Vlog. 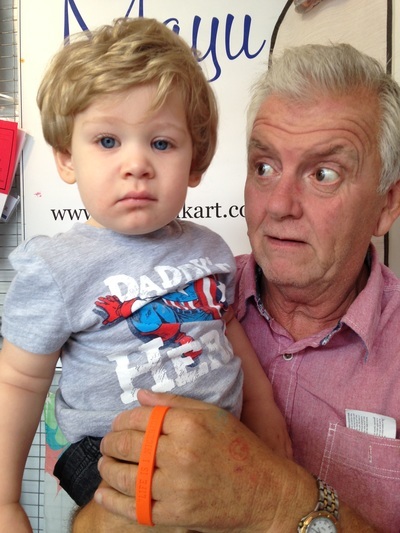 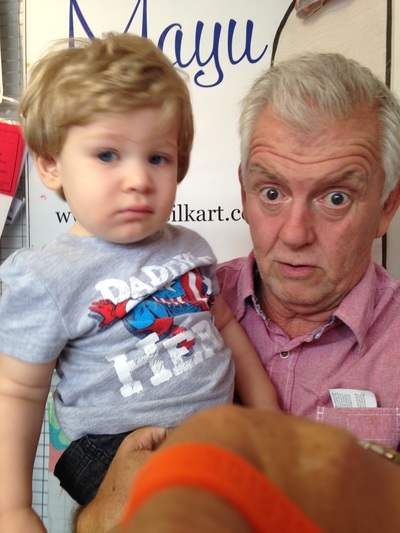 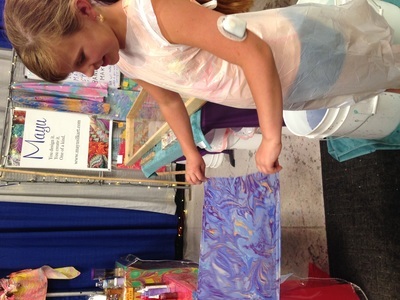 You can follow Kennedy on YouTube for more fun videos from this rising star. 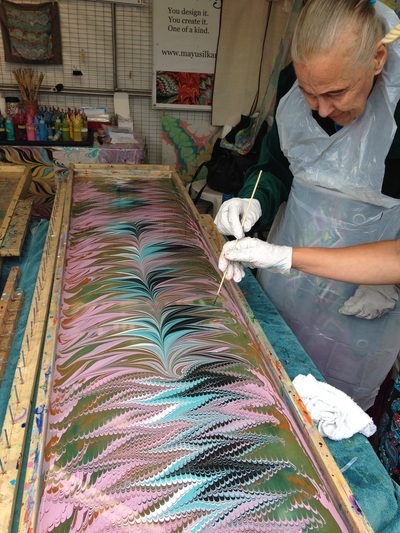 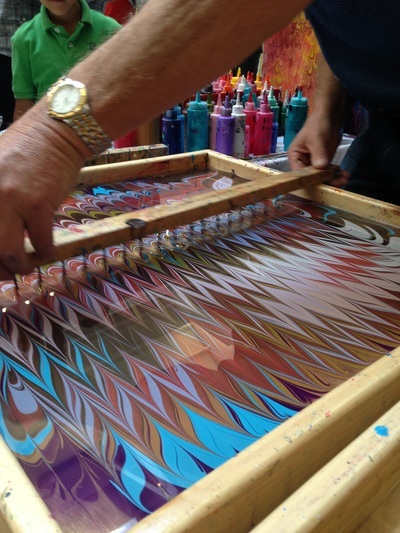 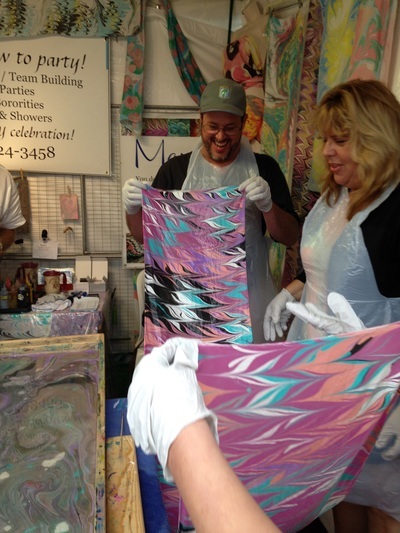 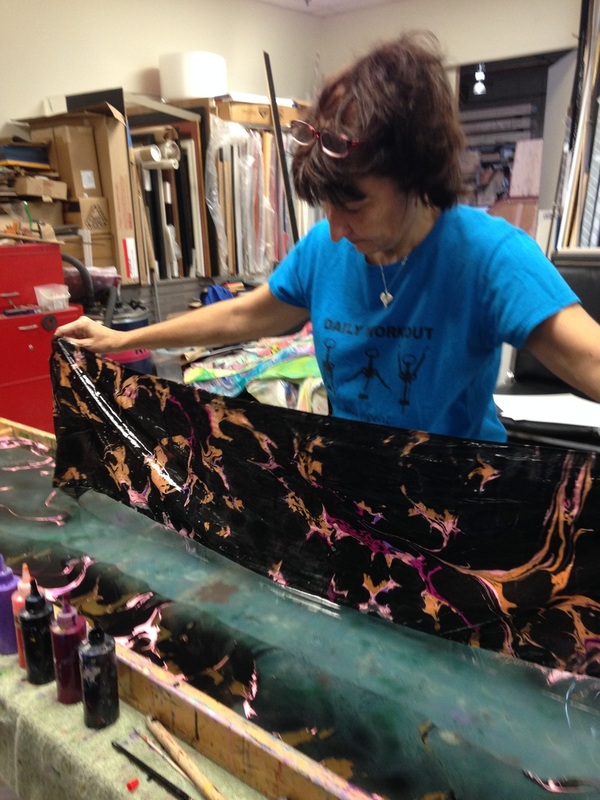 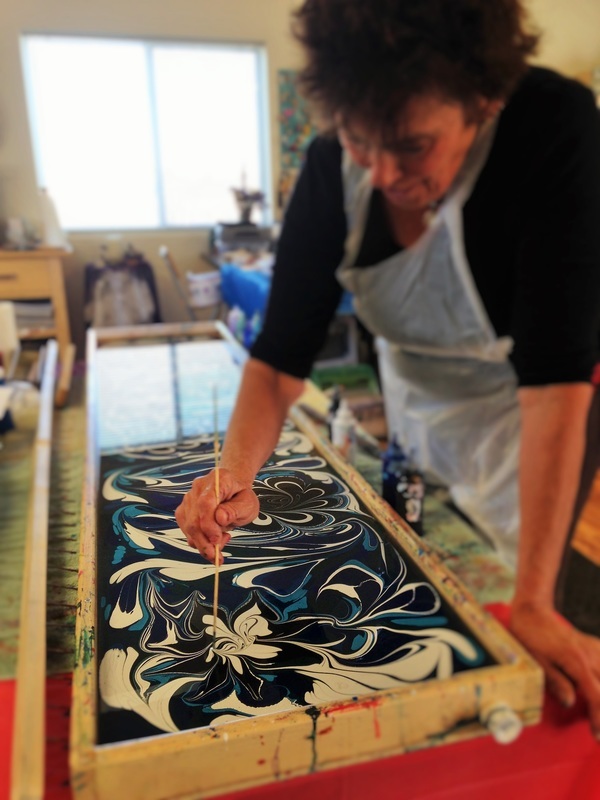 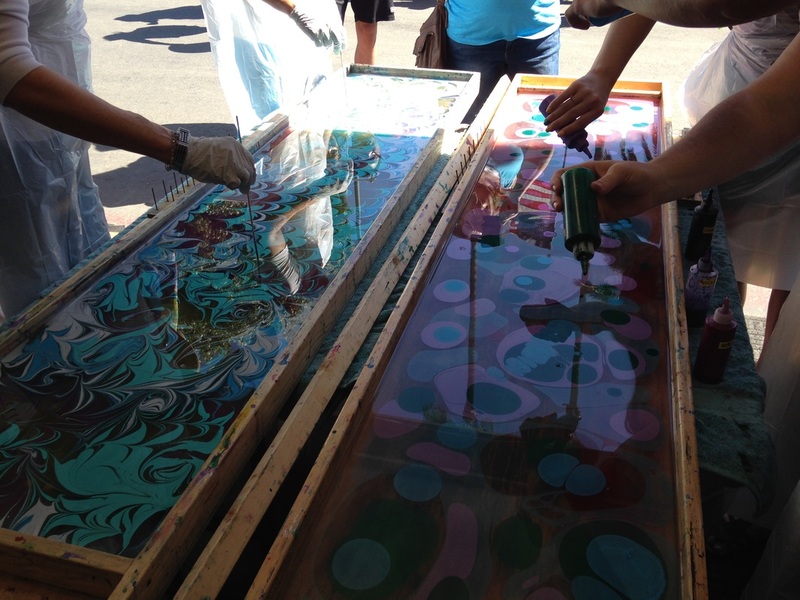 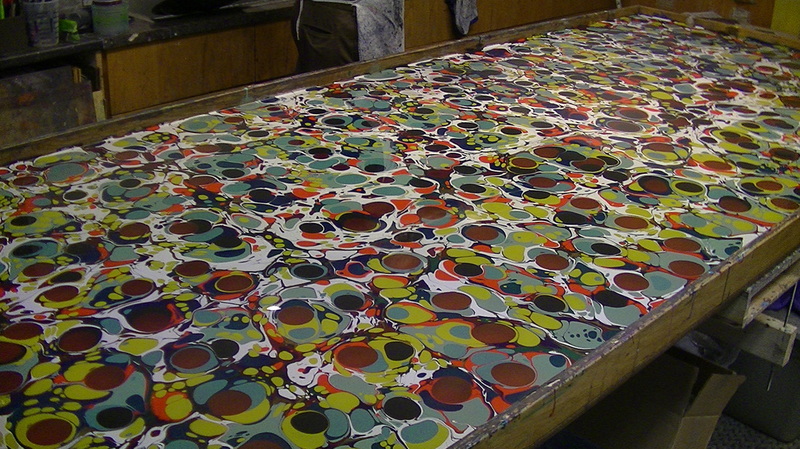 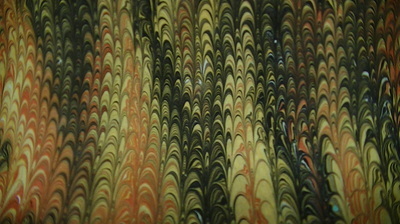 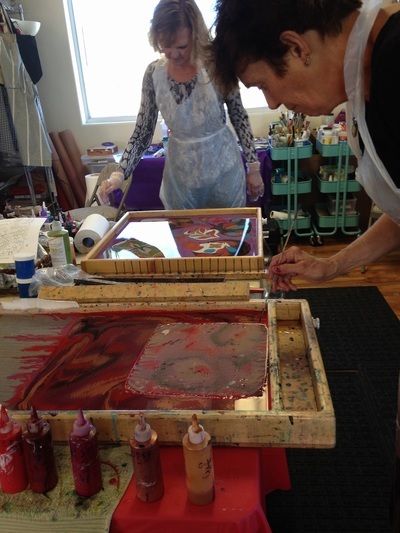 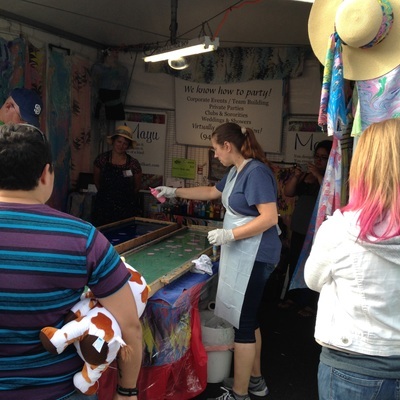 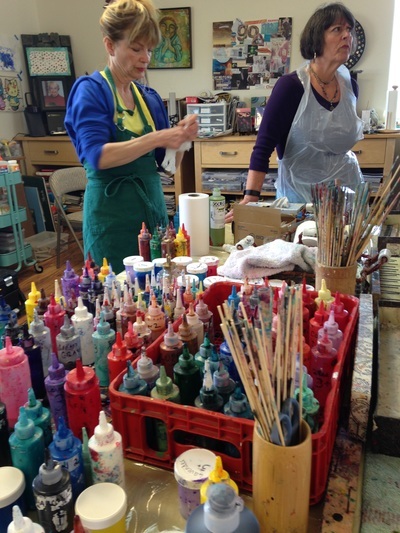 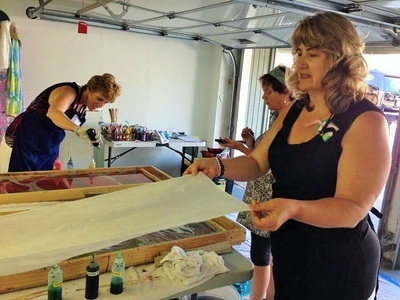 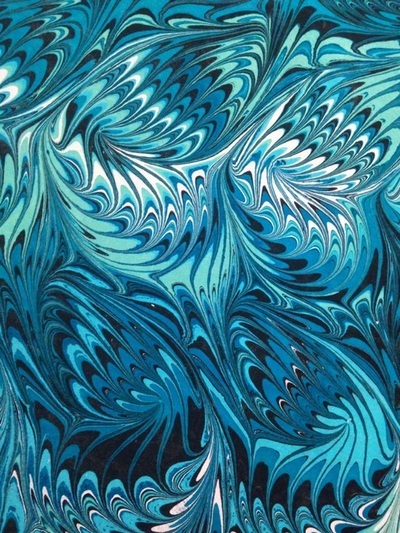 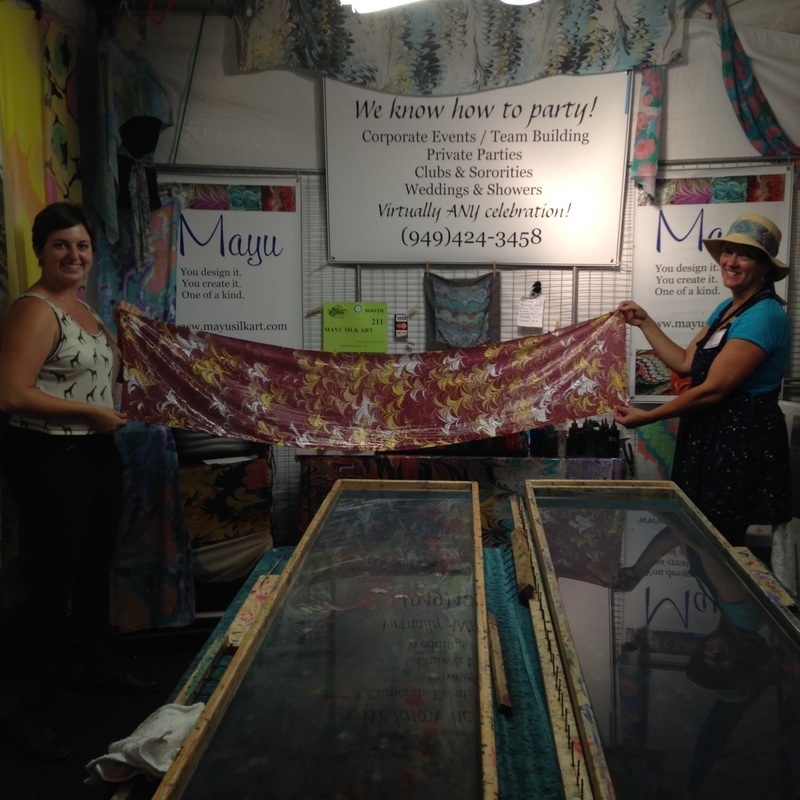 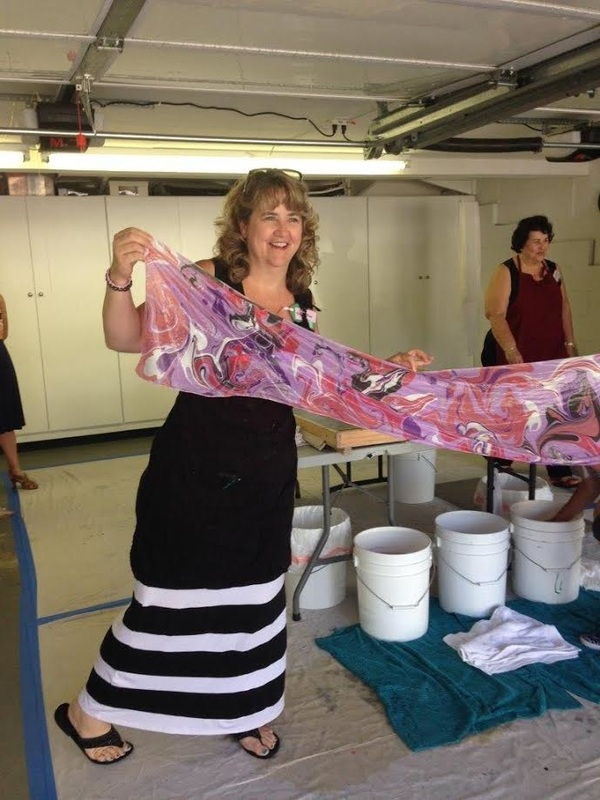 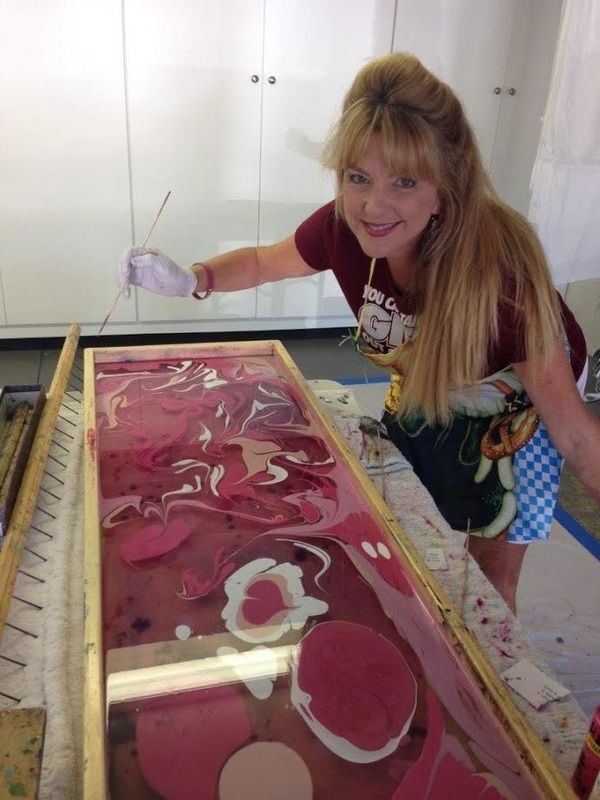 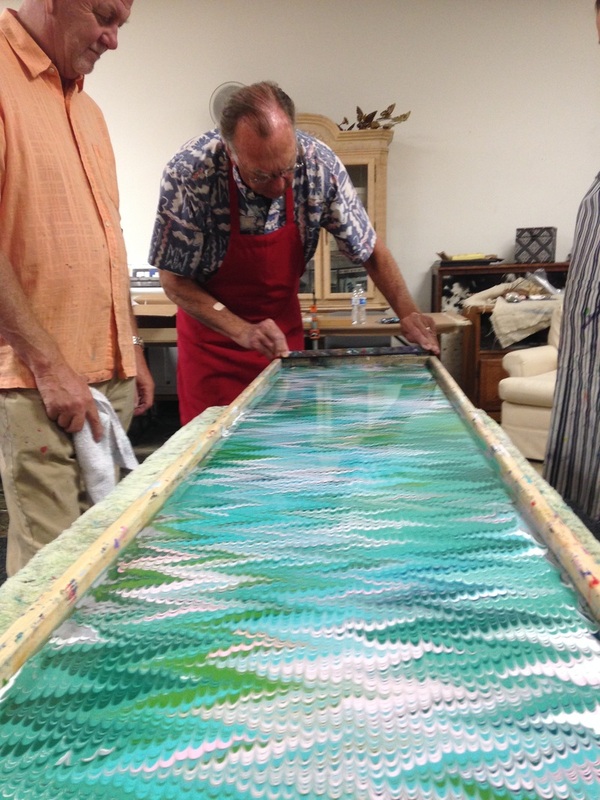 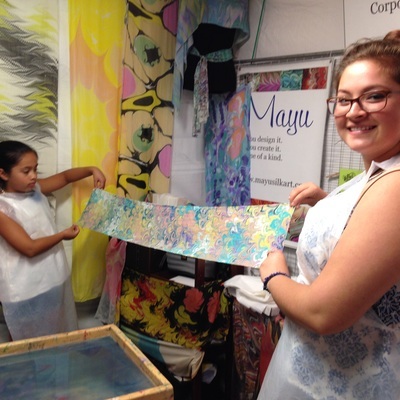 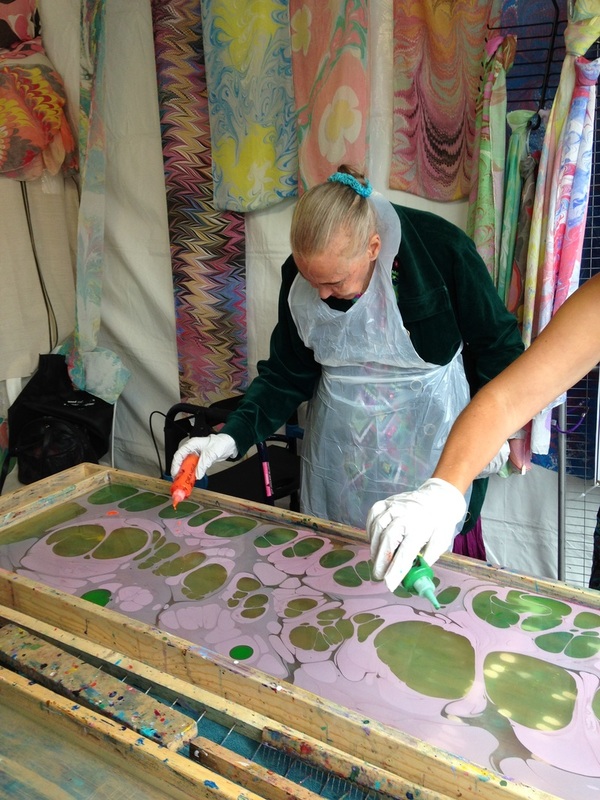 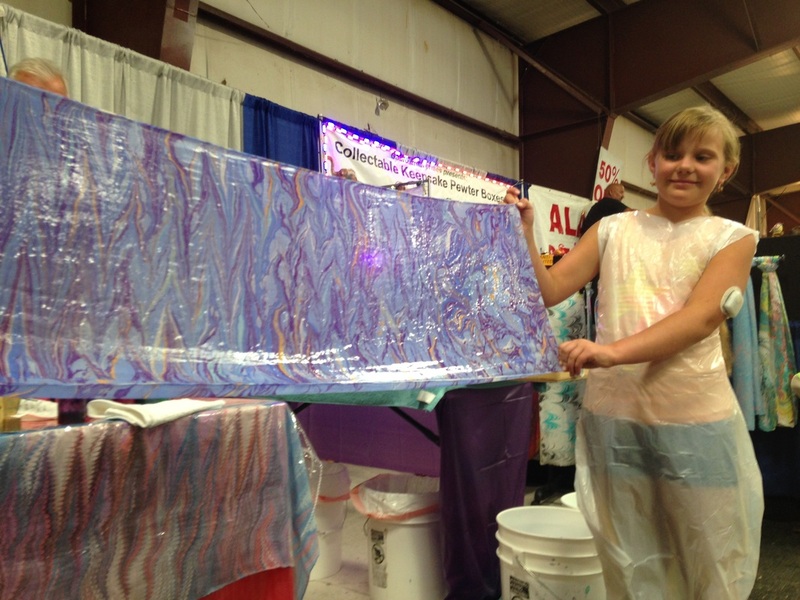 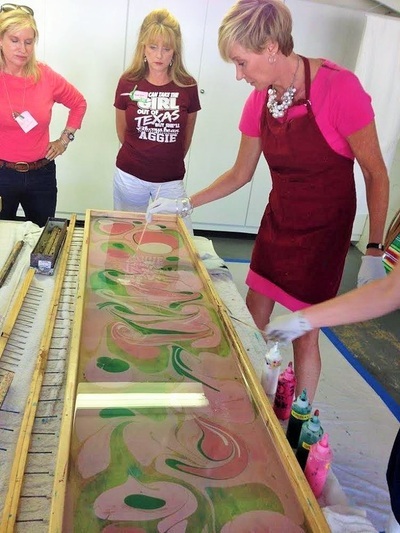 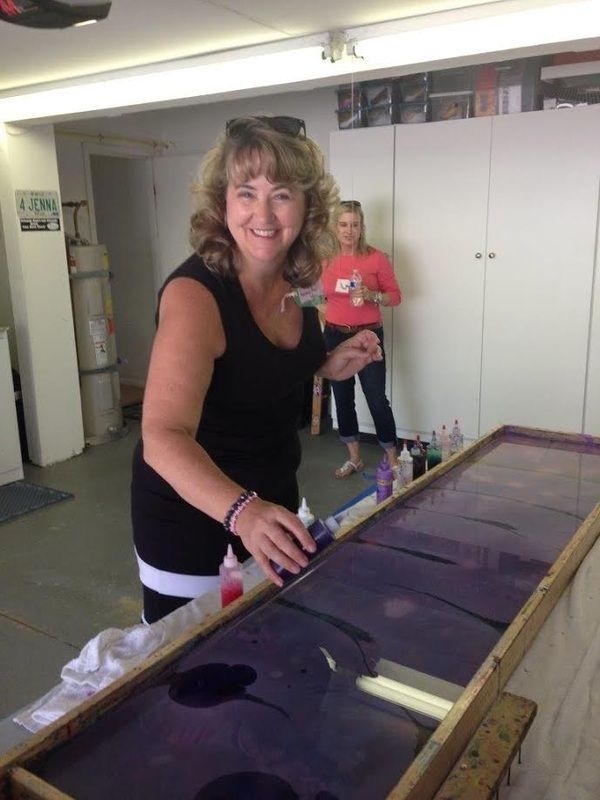 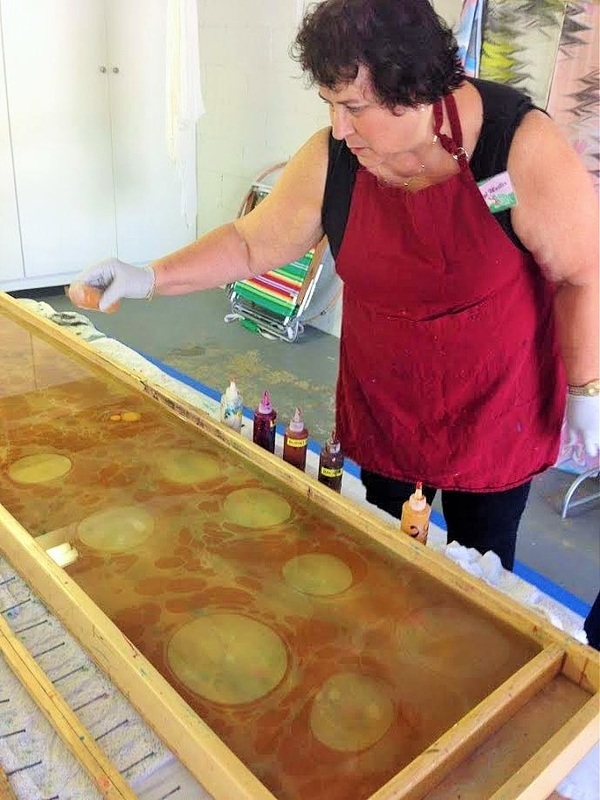 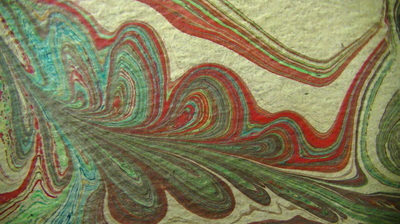 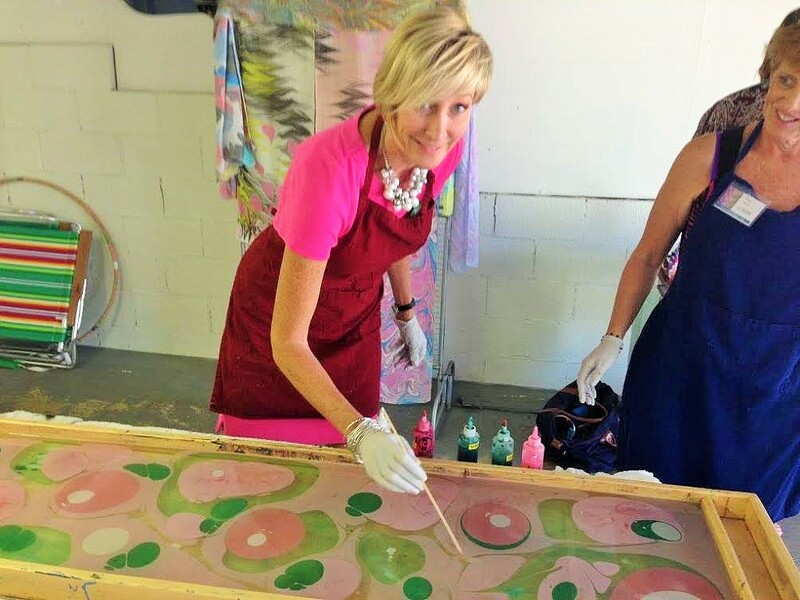 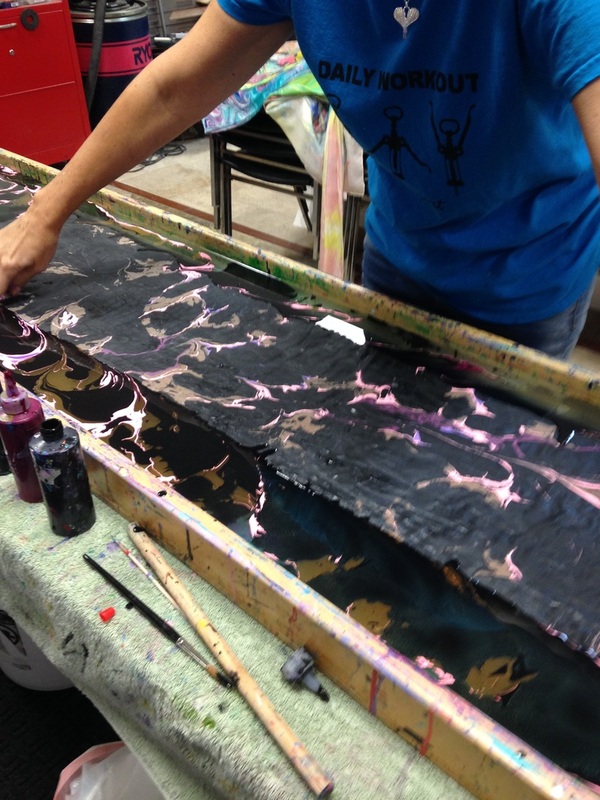 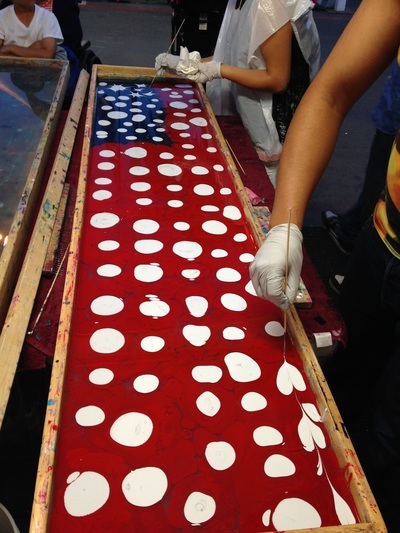 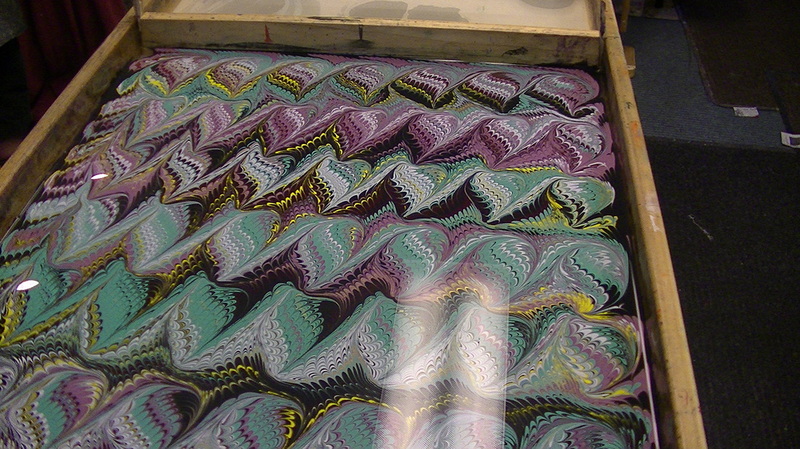 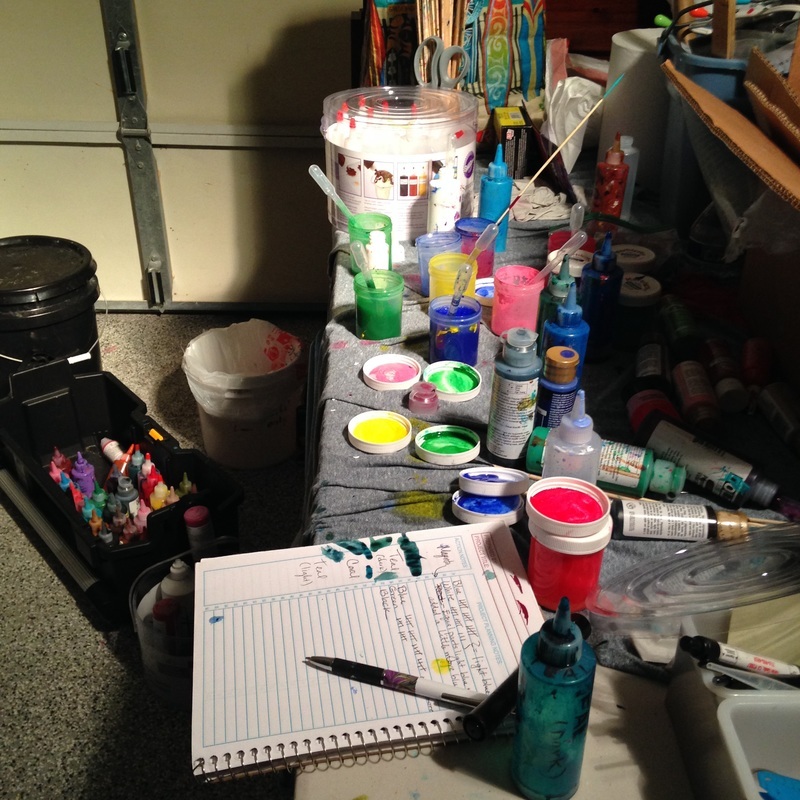 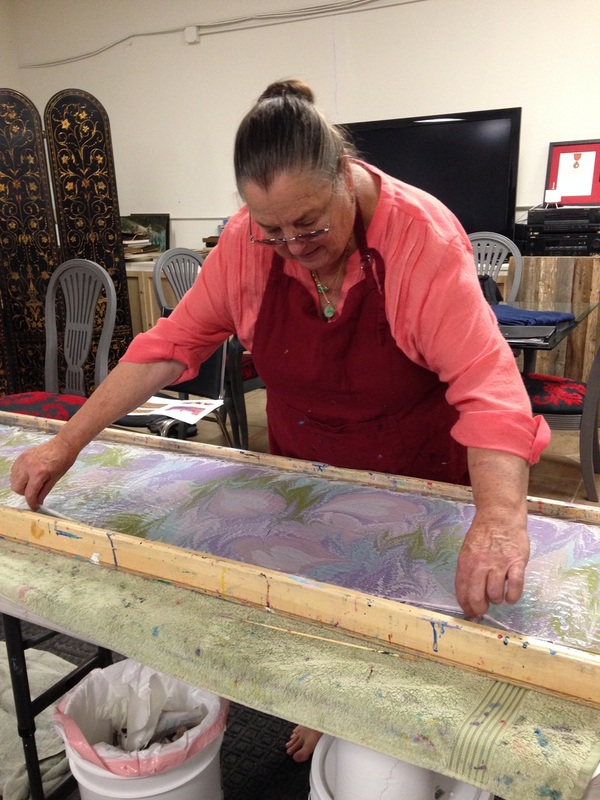 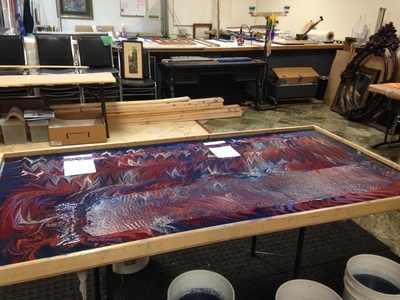 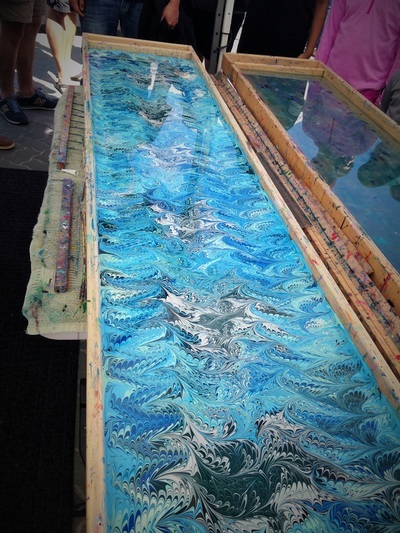 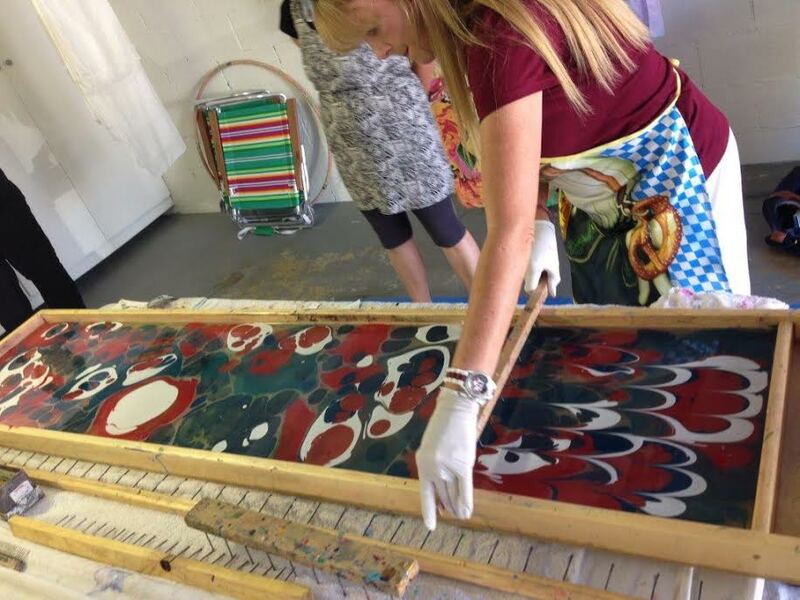 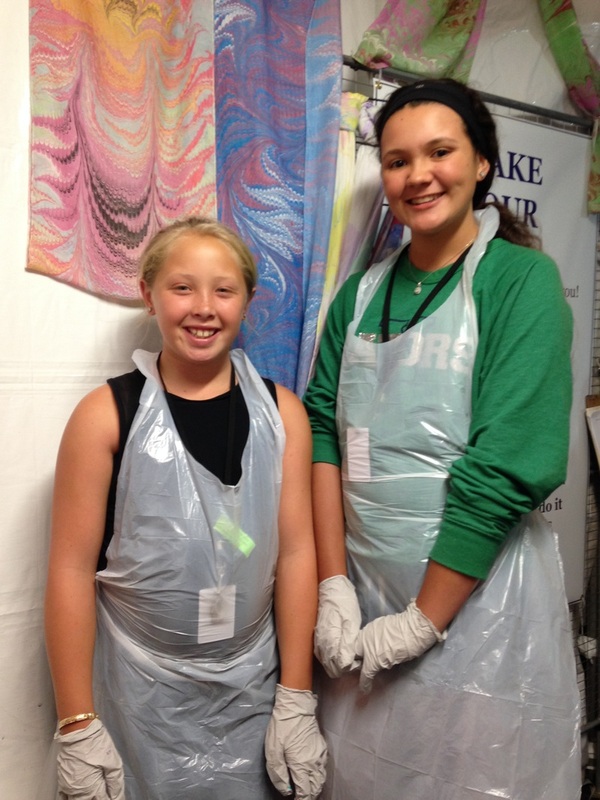 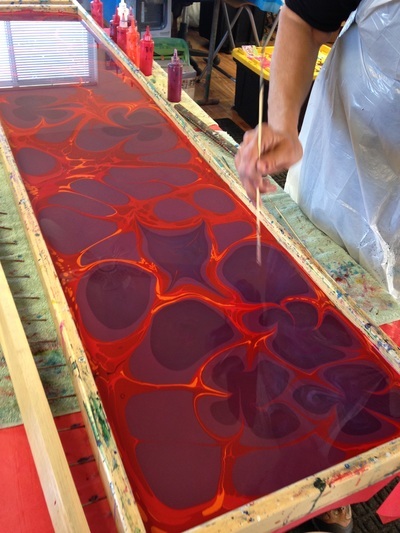 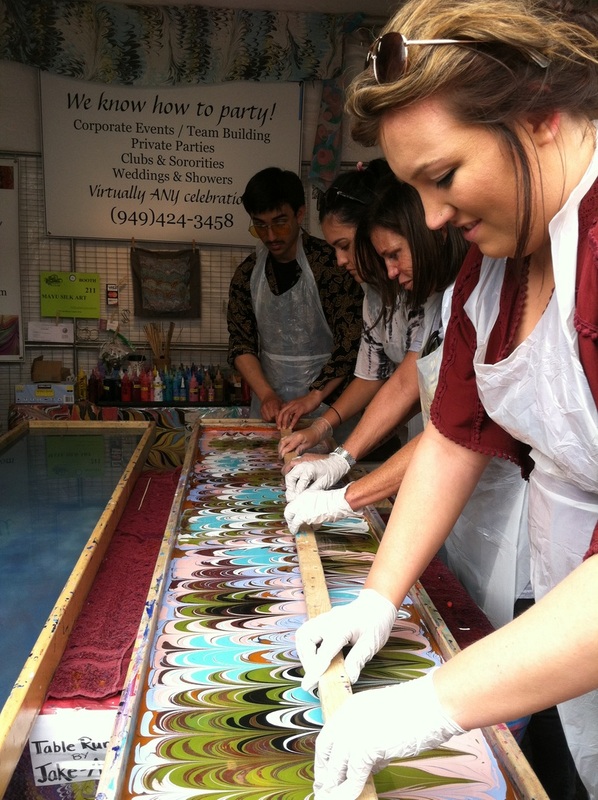 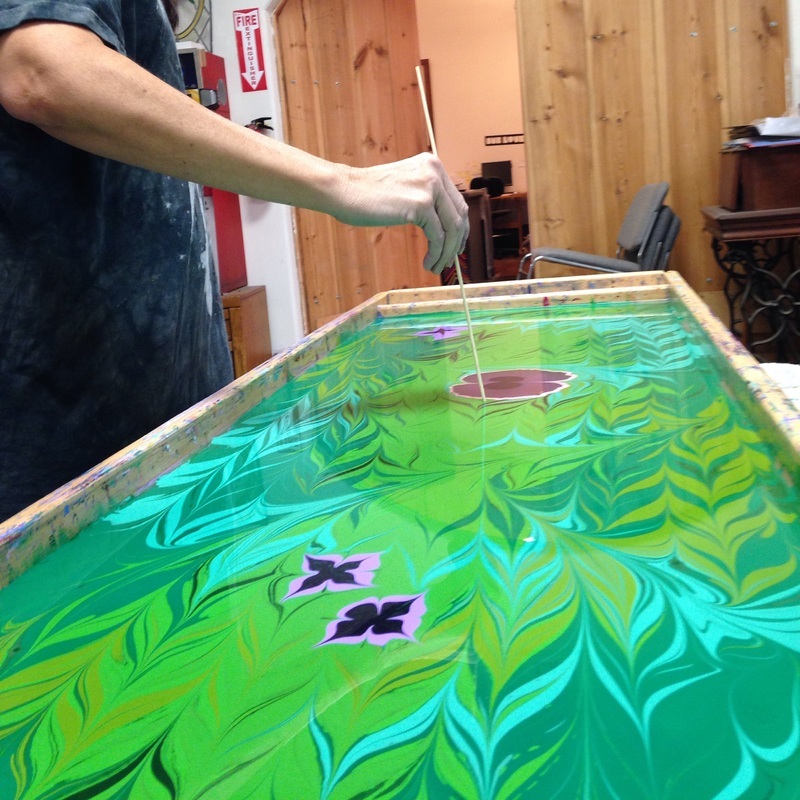 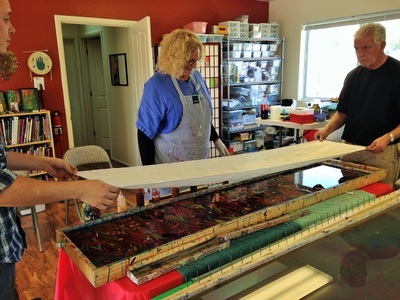 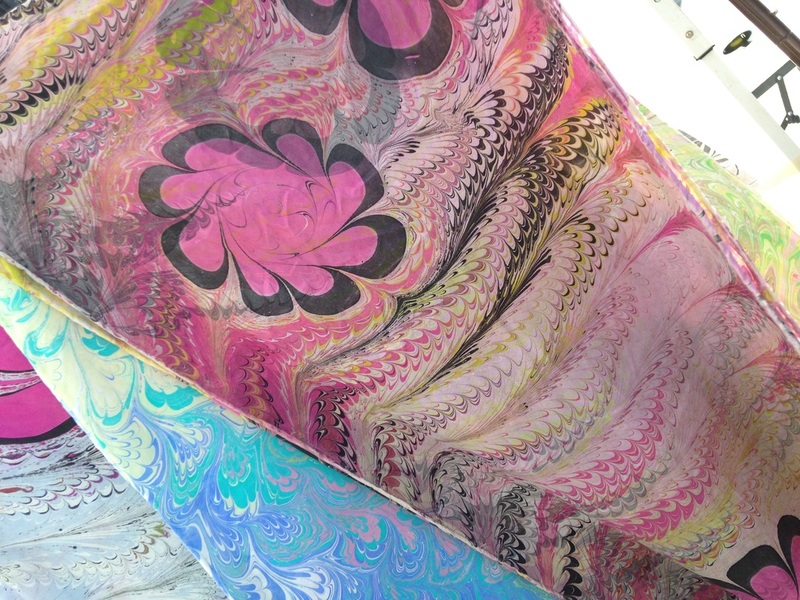 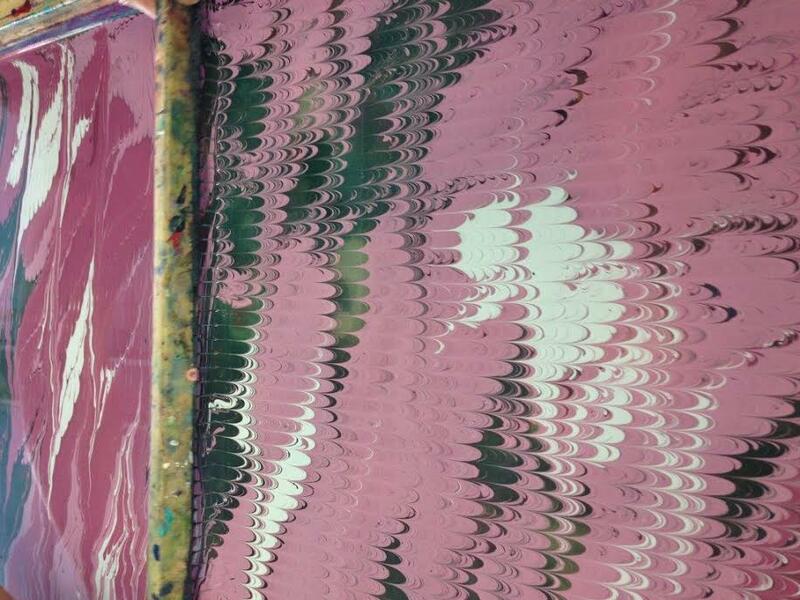 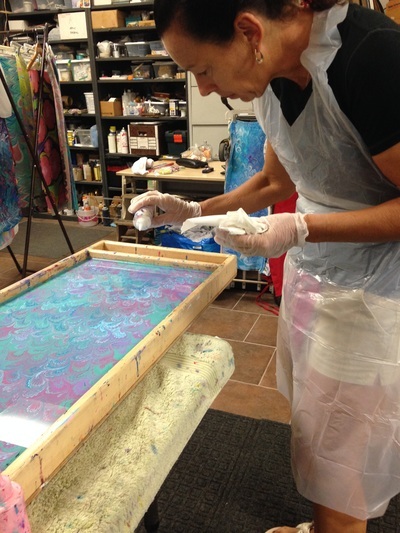 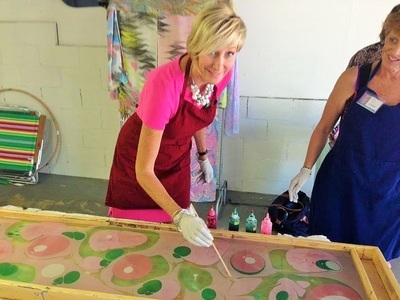 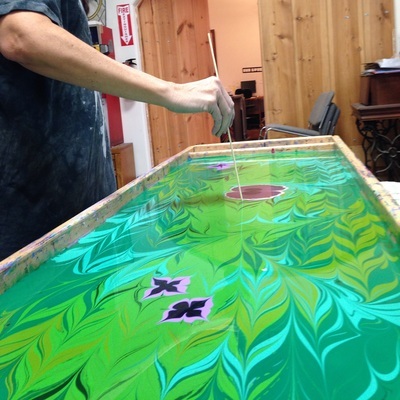 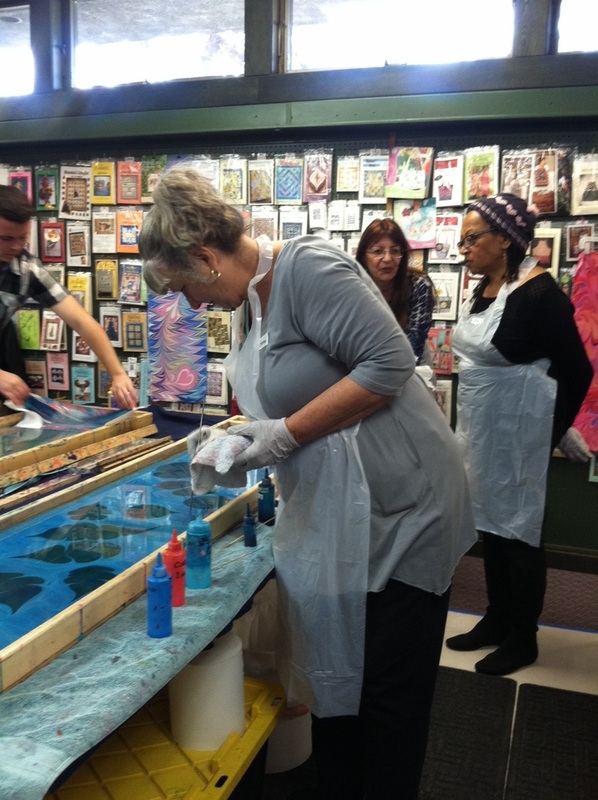 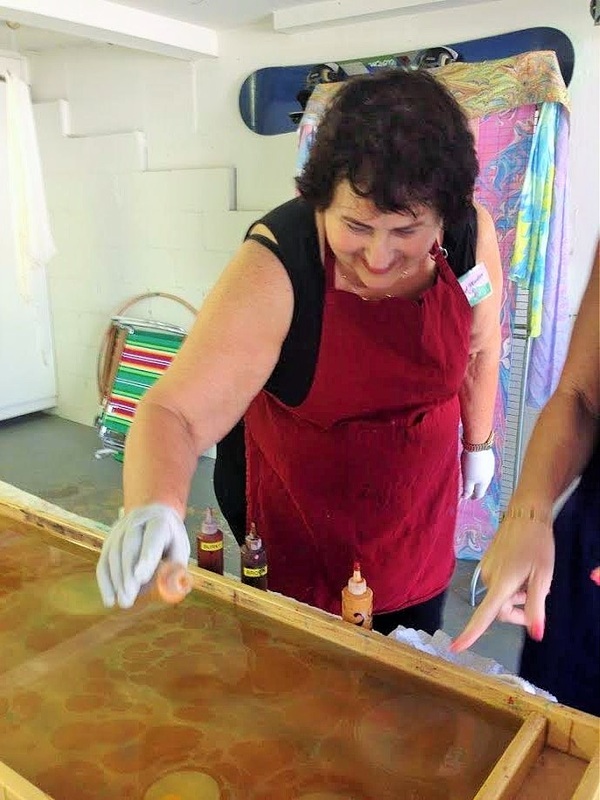 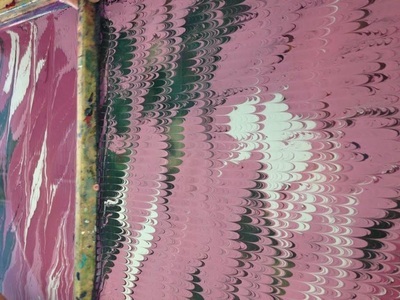 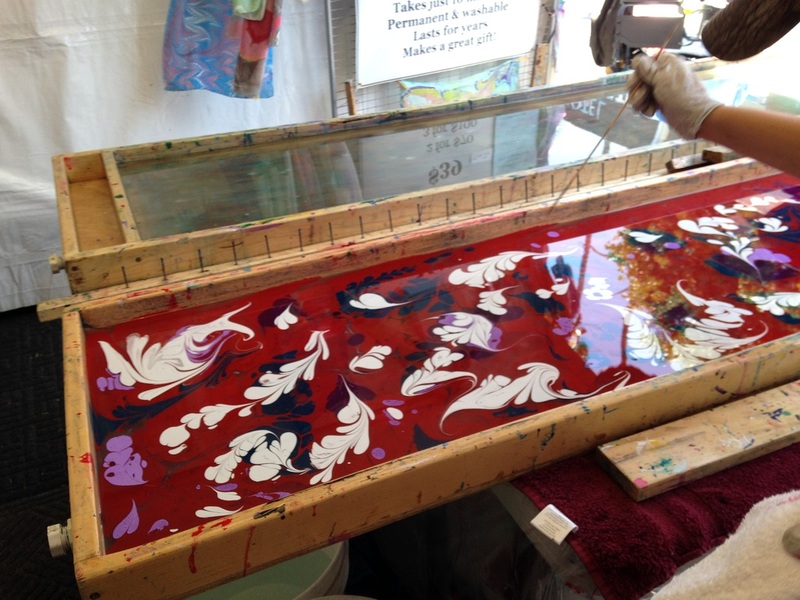 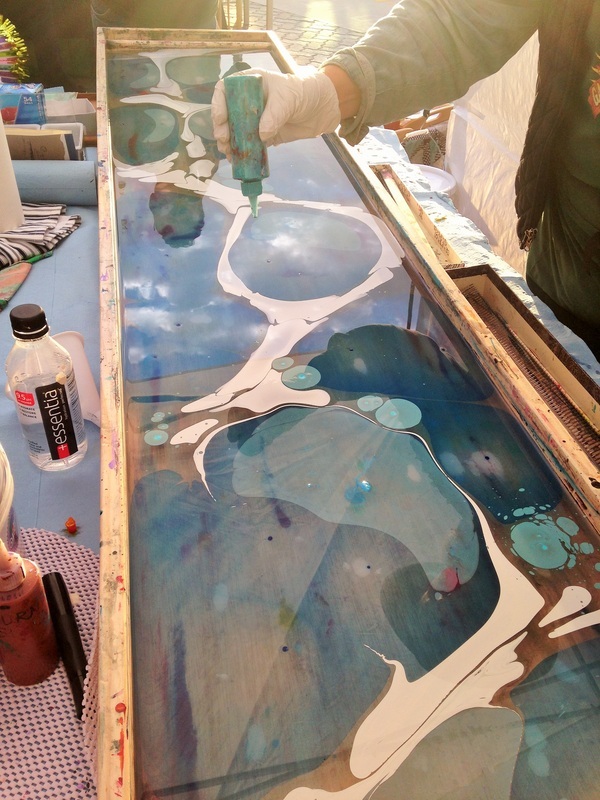 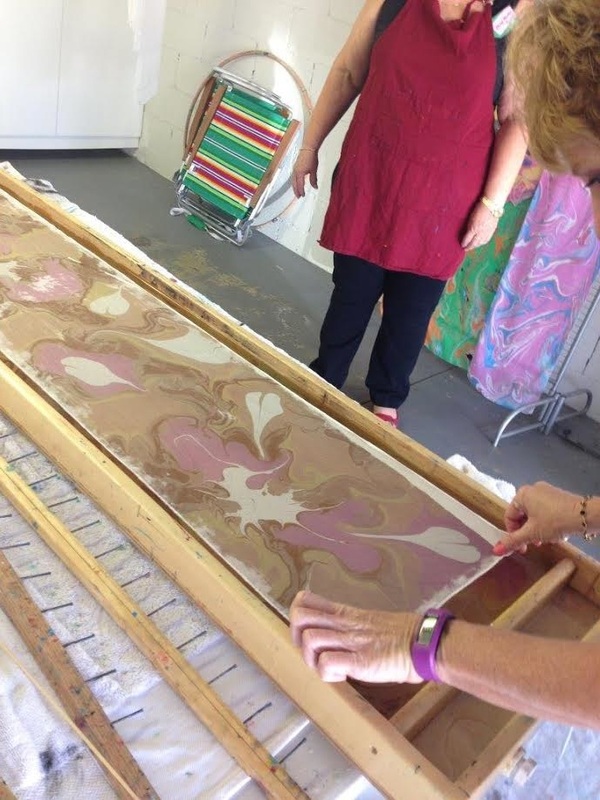 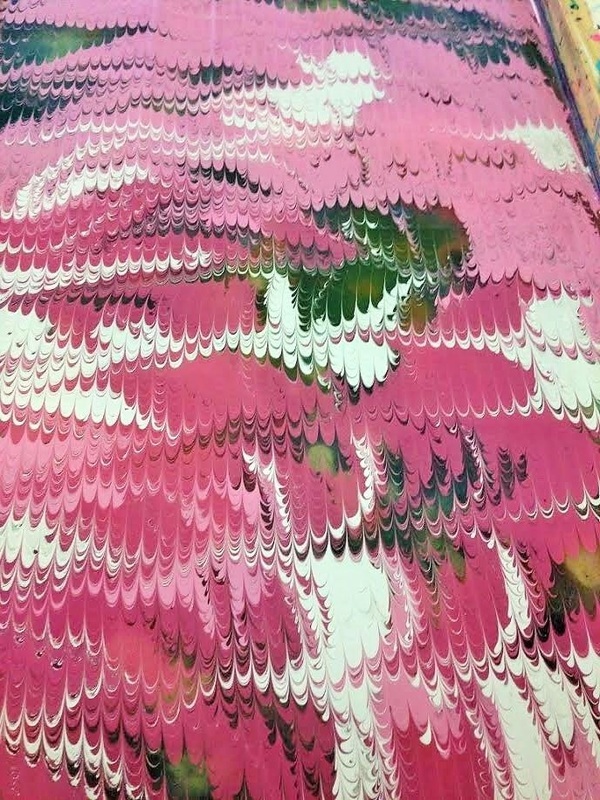 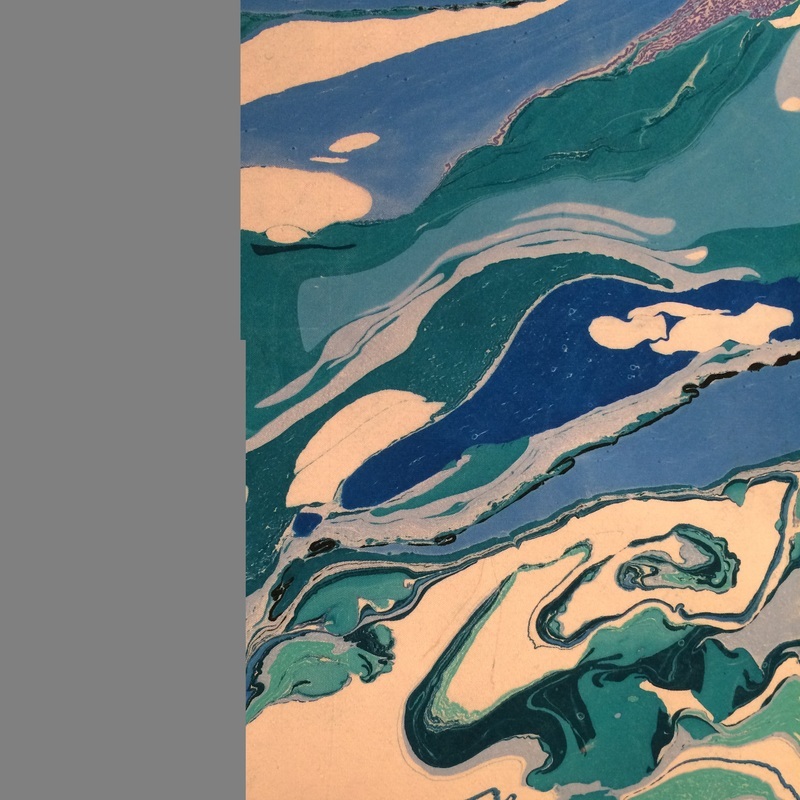 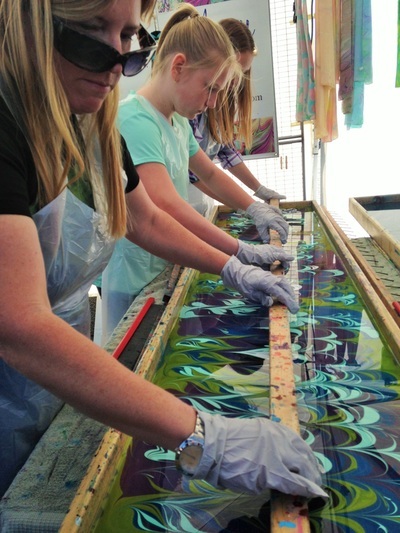 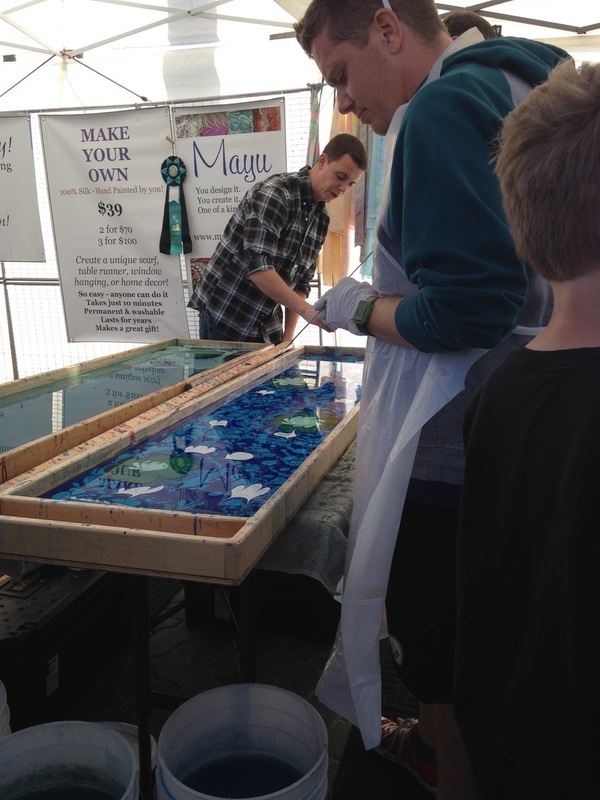 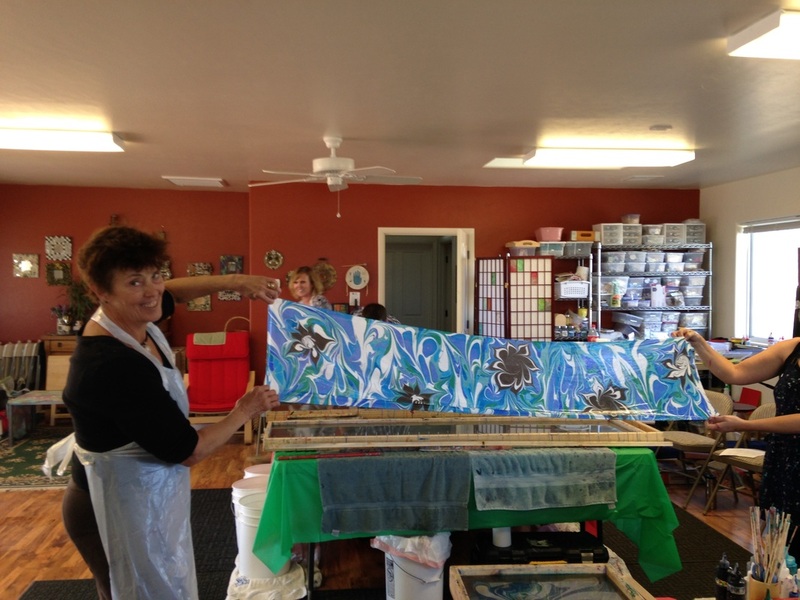 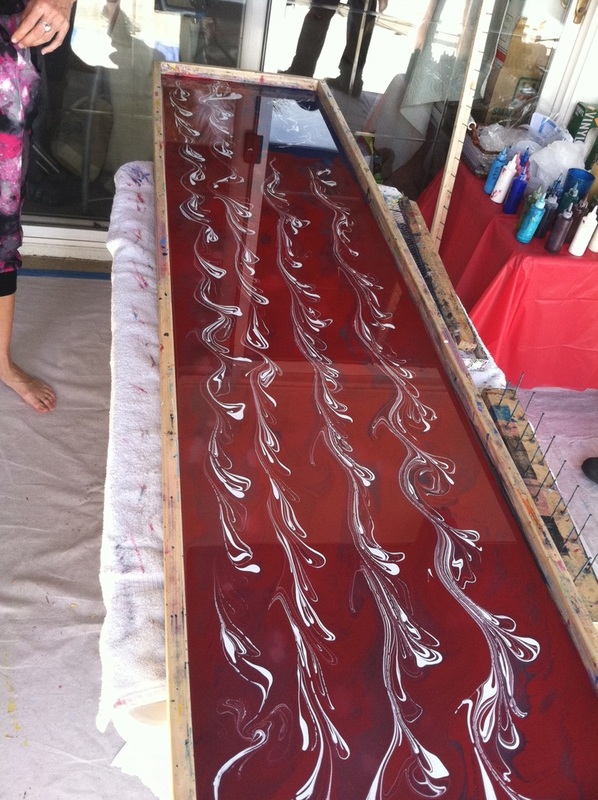 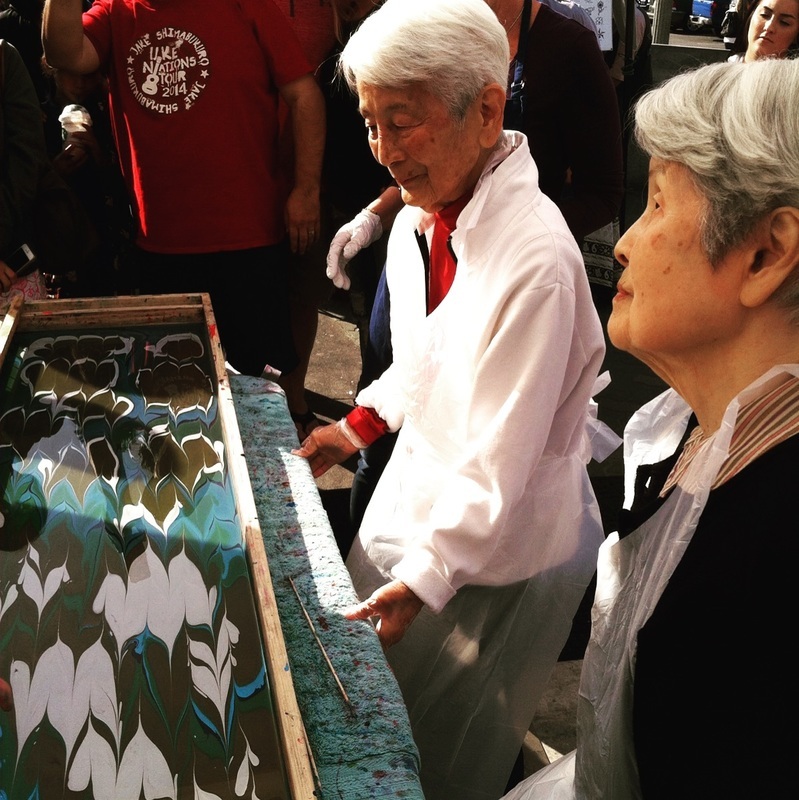 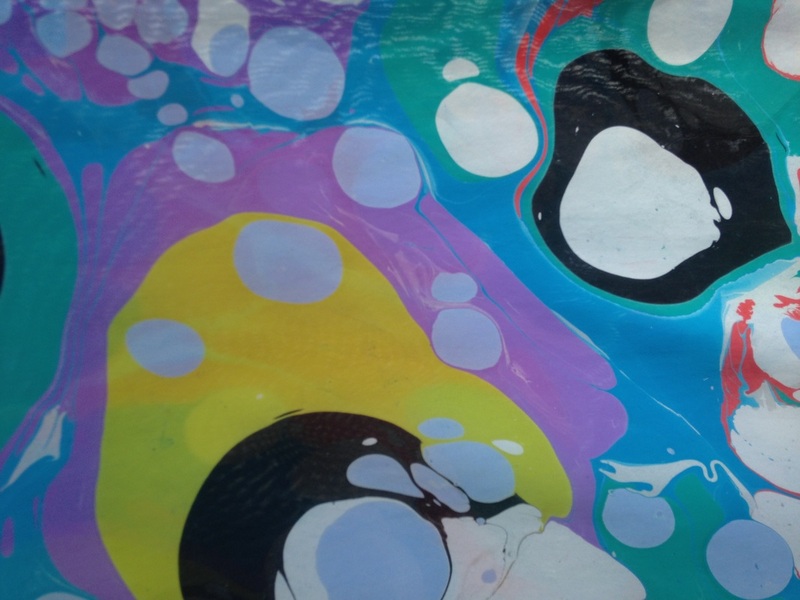 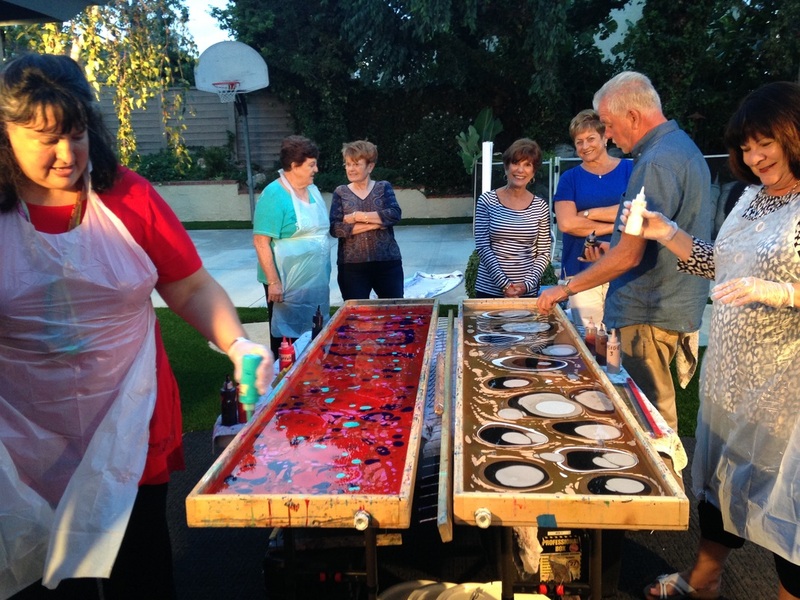 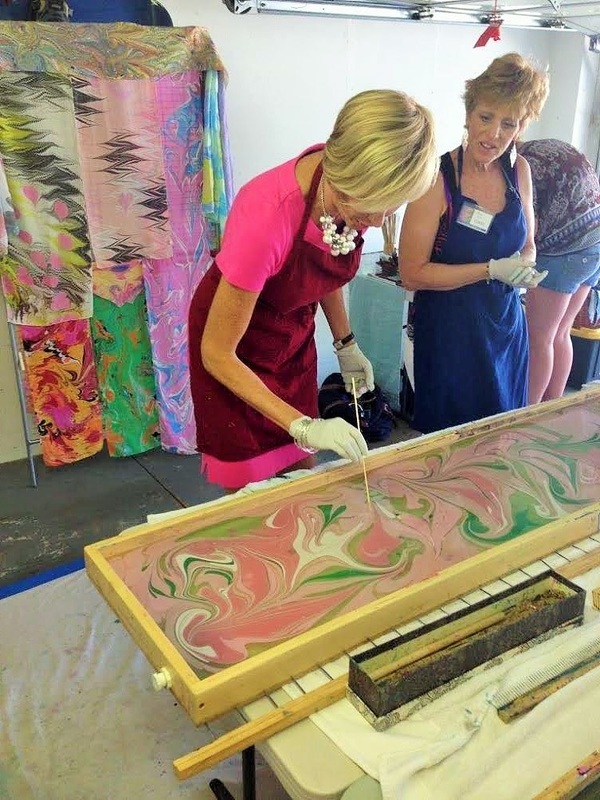 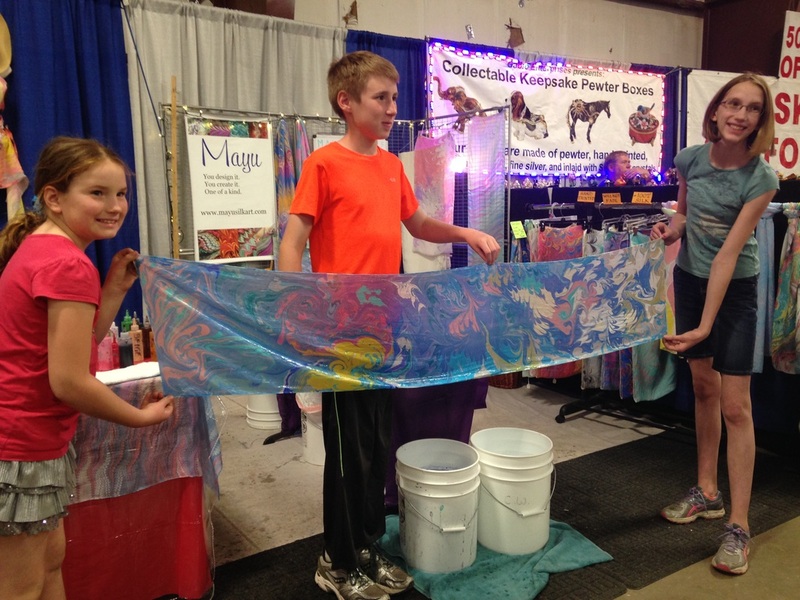 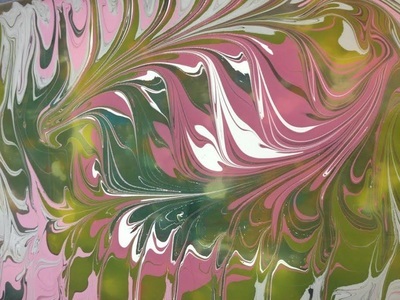 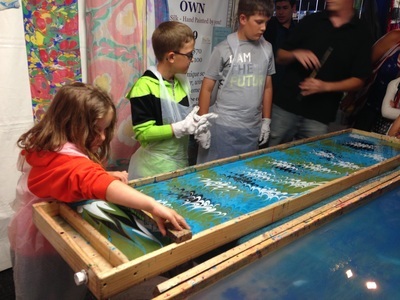 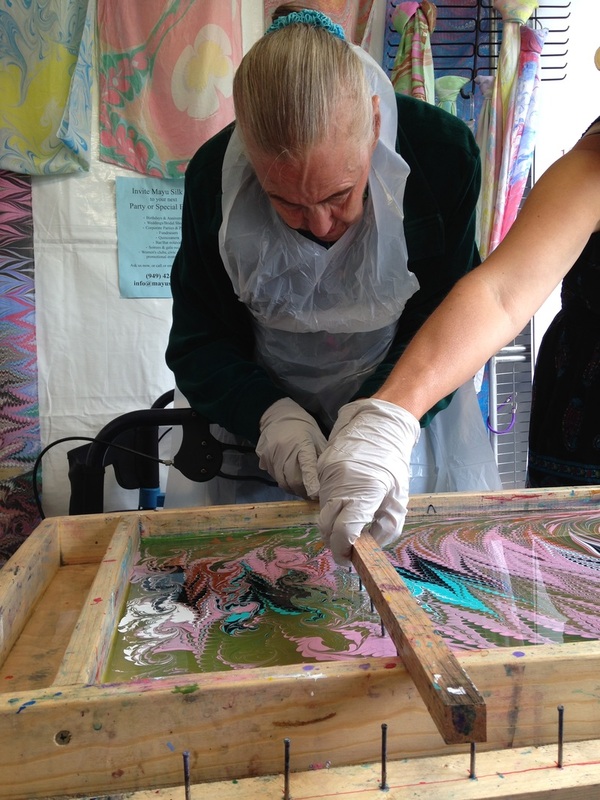 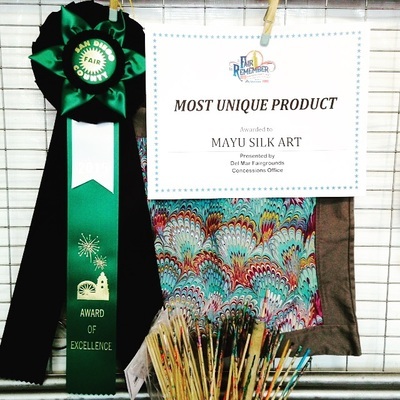 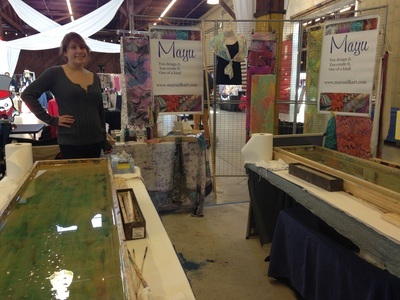 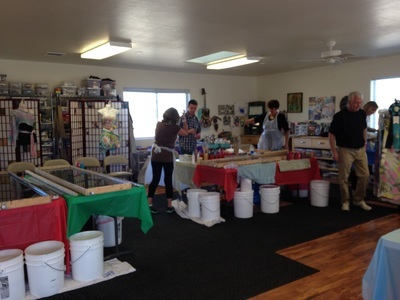 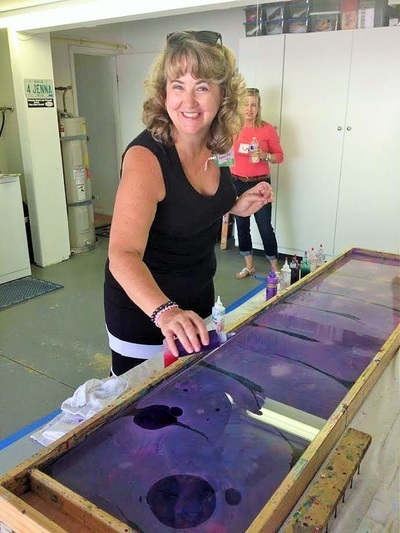 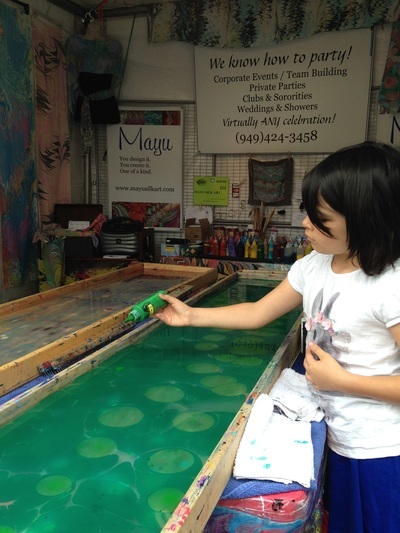 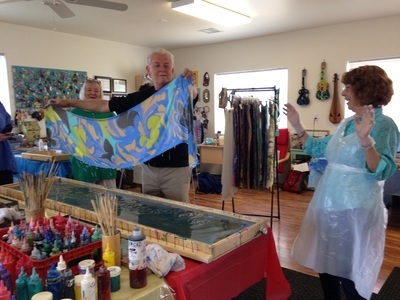 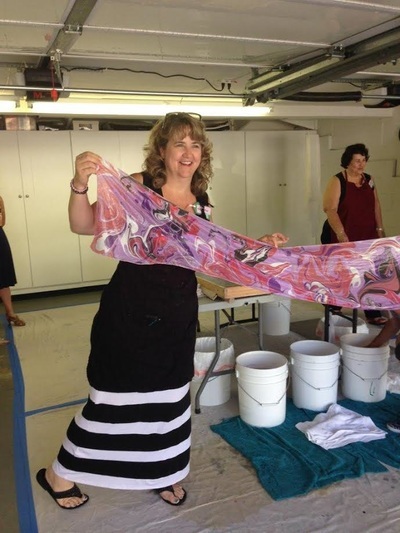 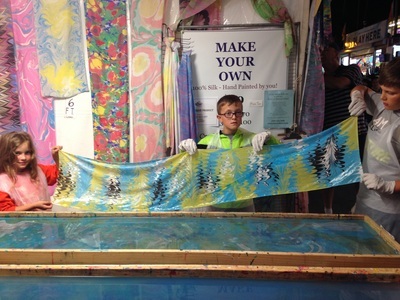 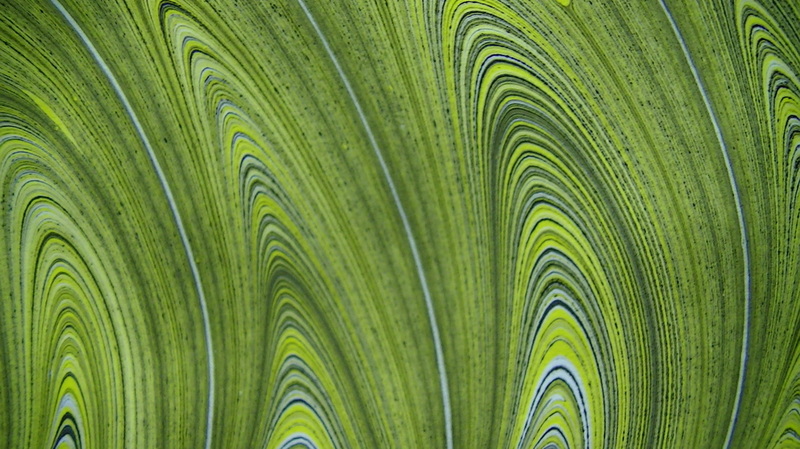 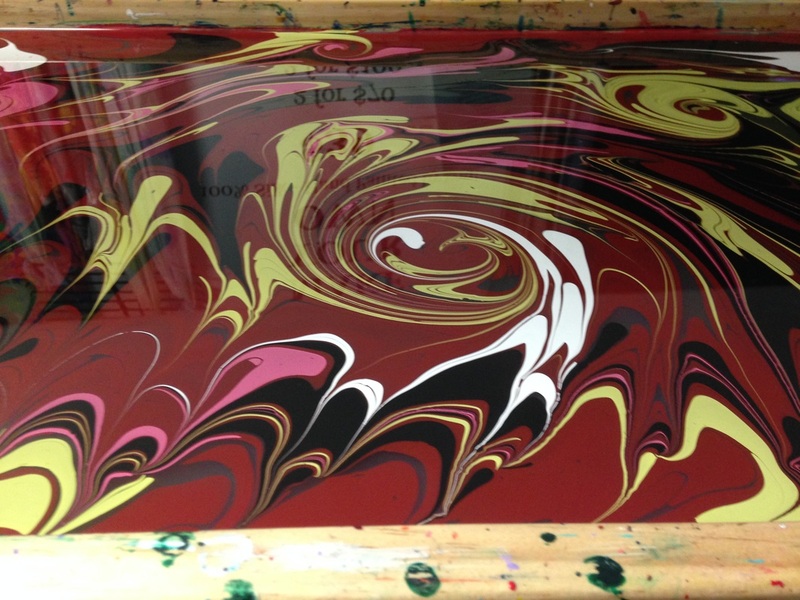 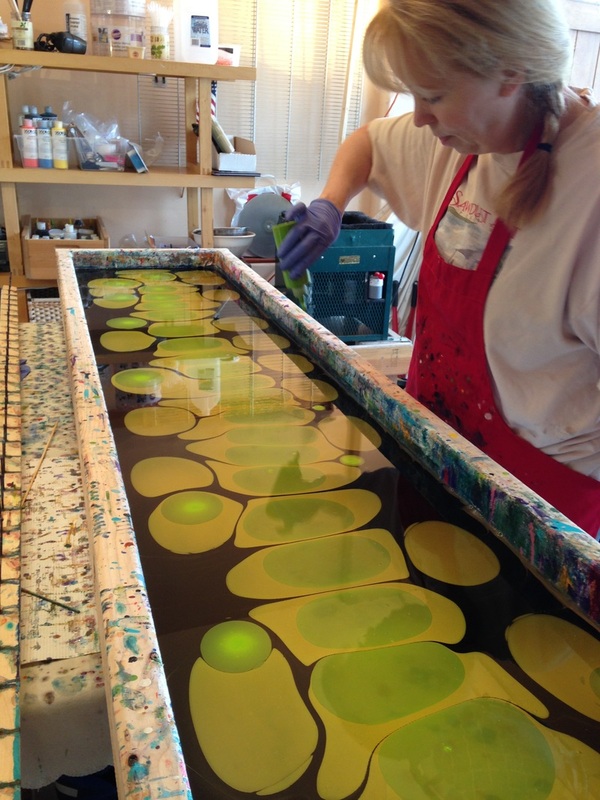 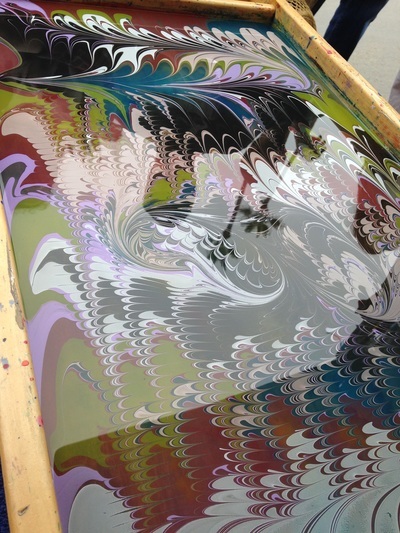 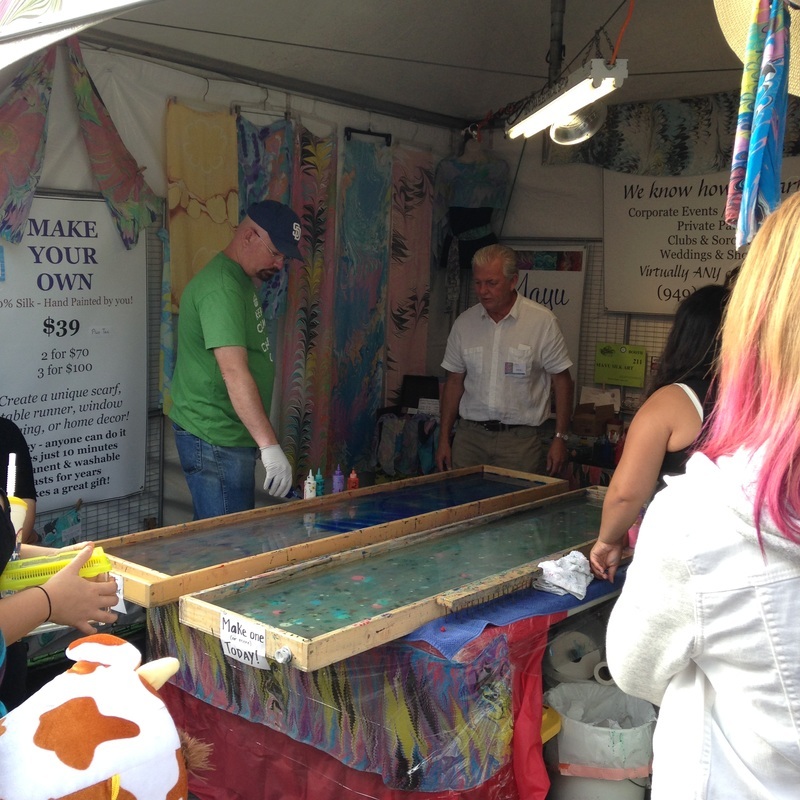 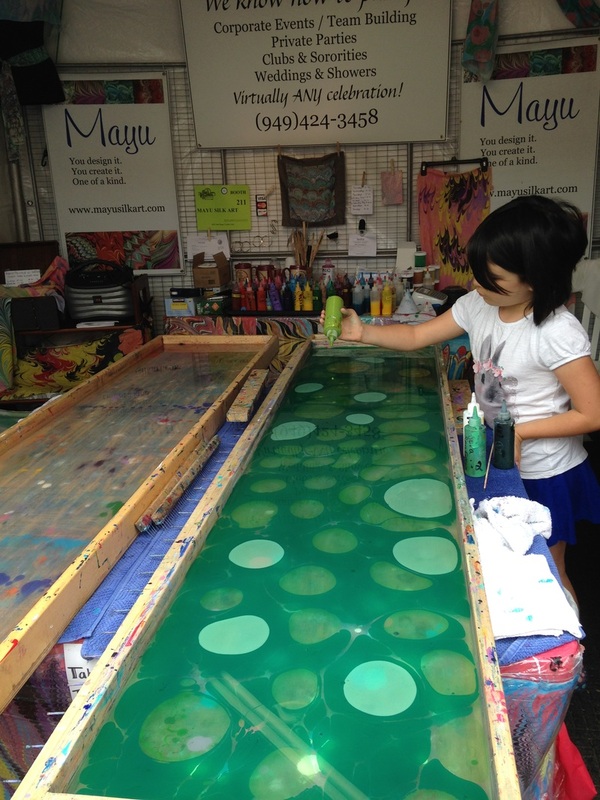 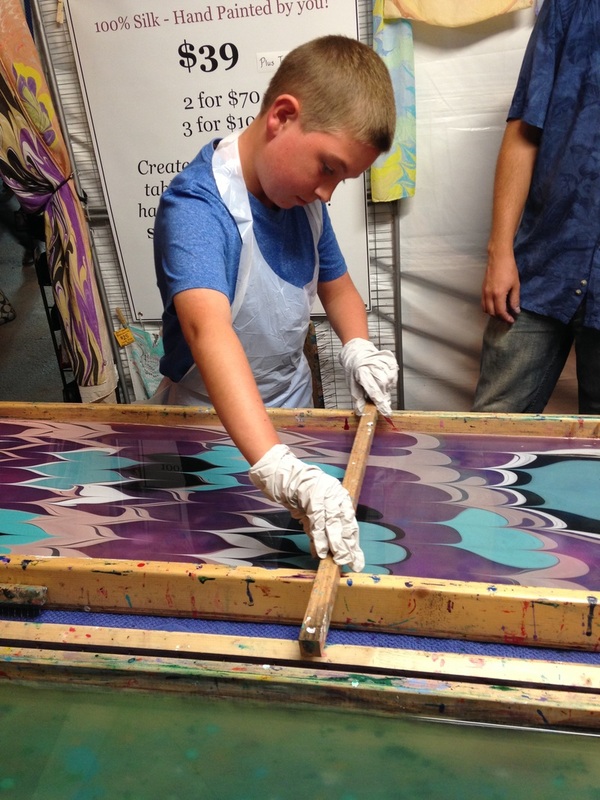 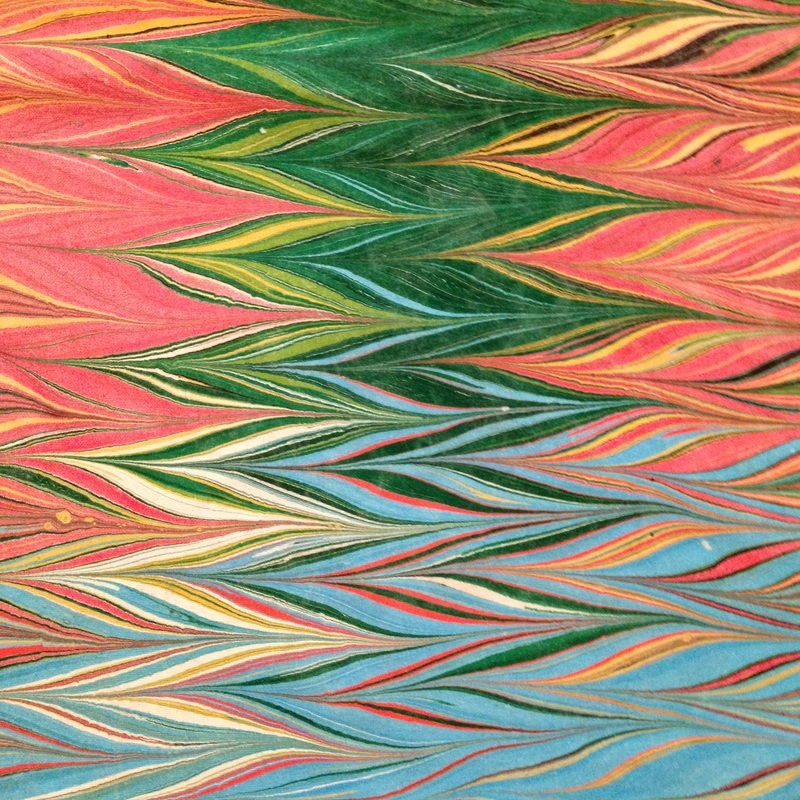 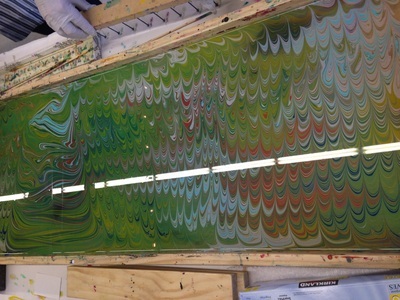 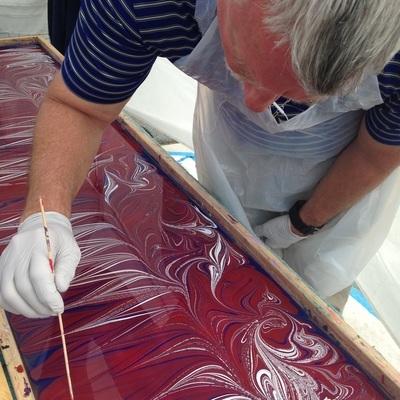 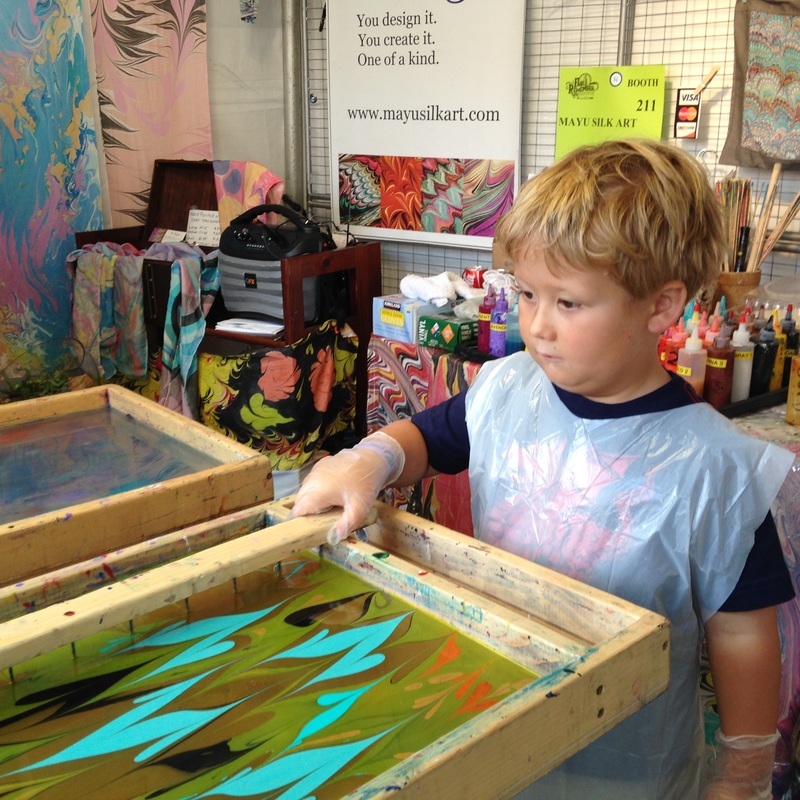 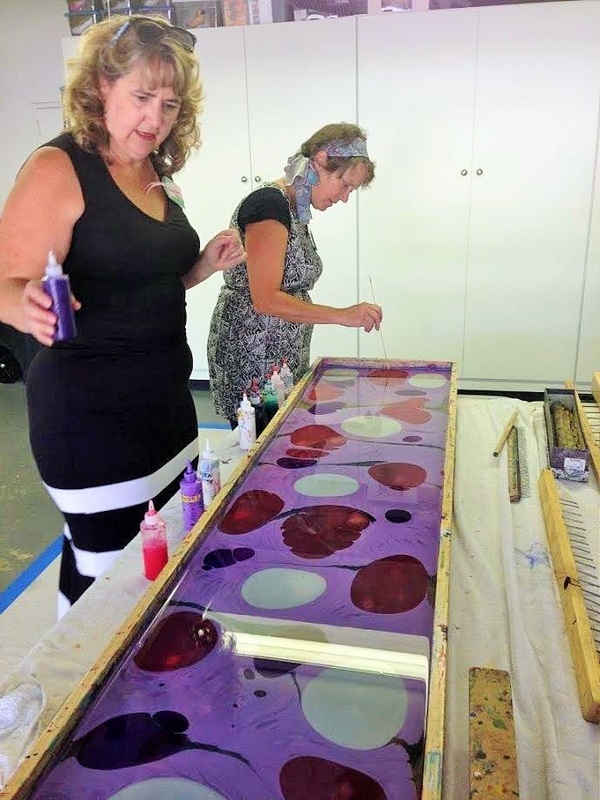 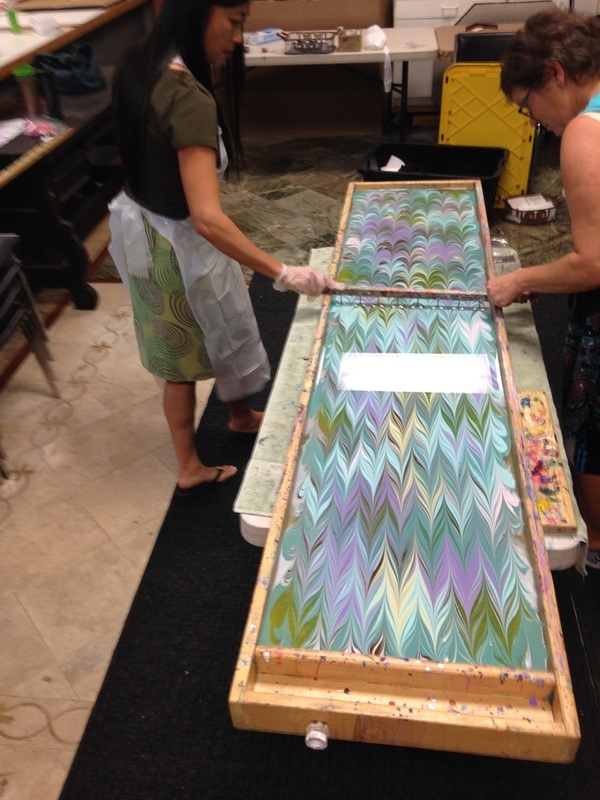 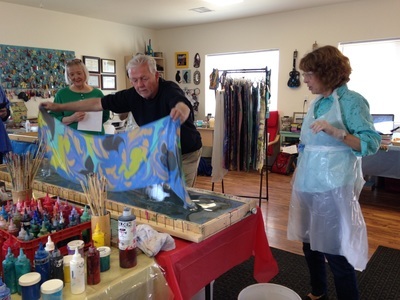 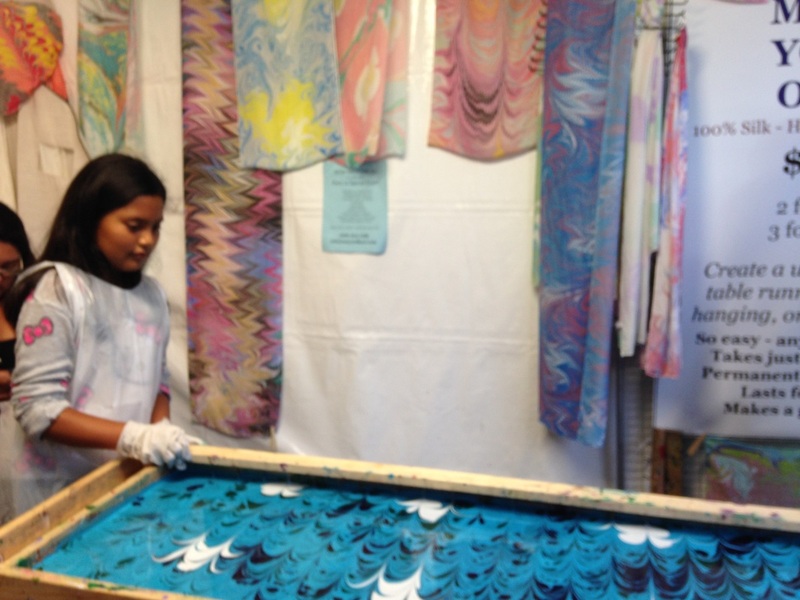 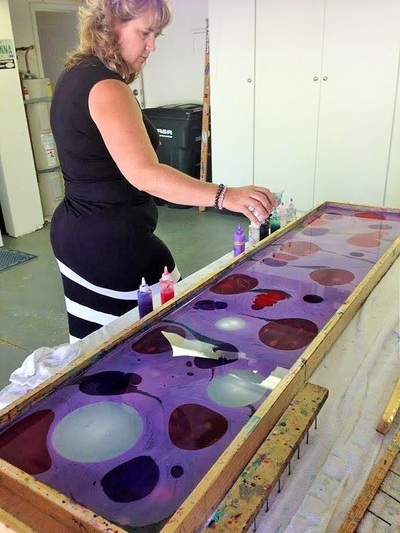 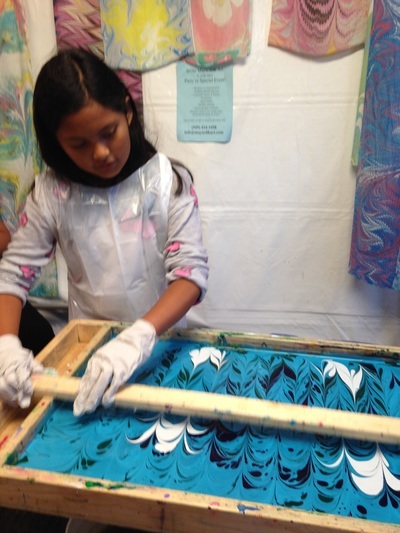 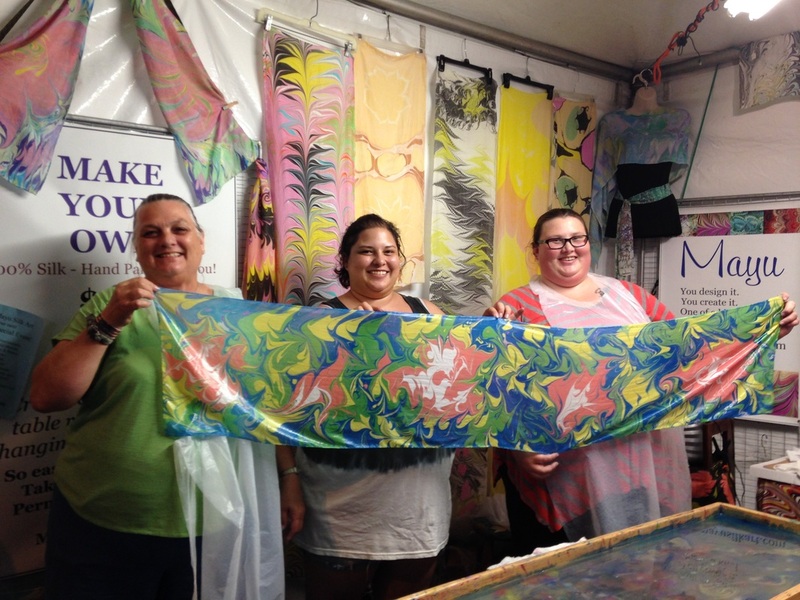 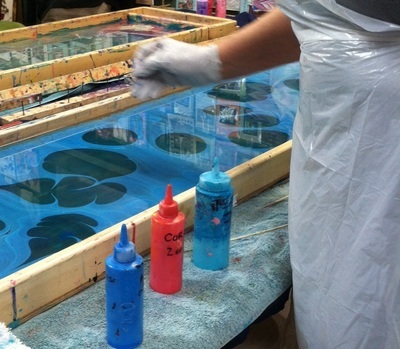 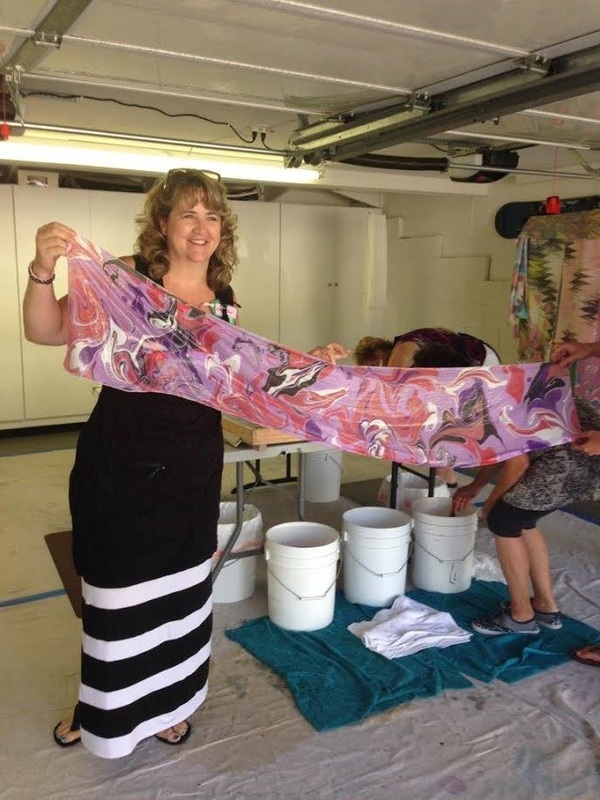 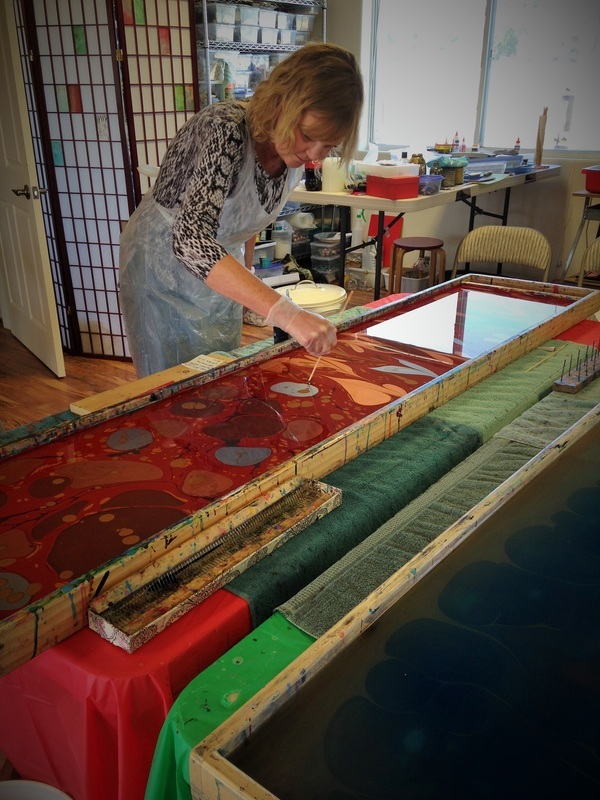 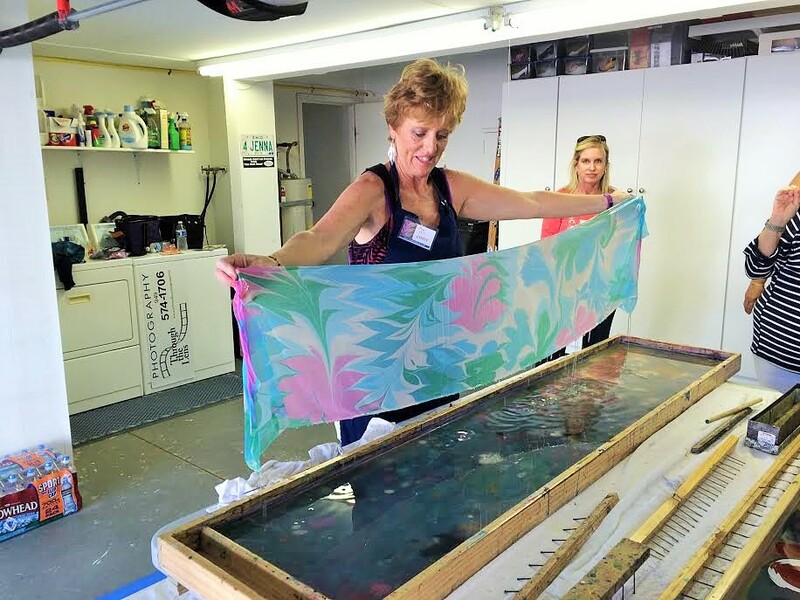 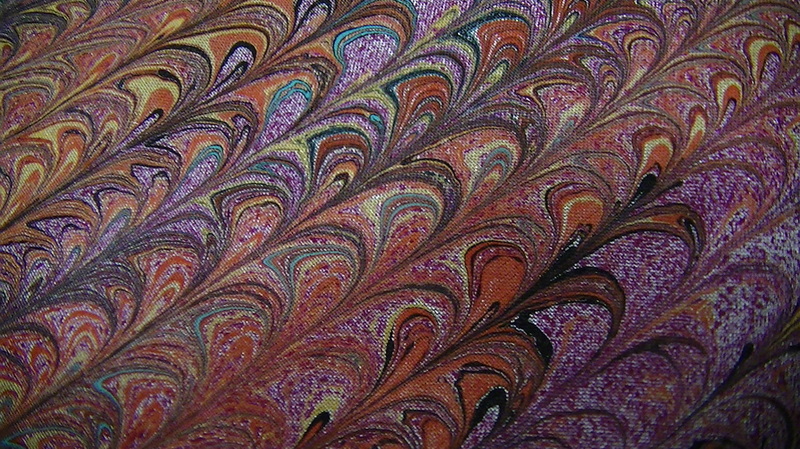 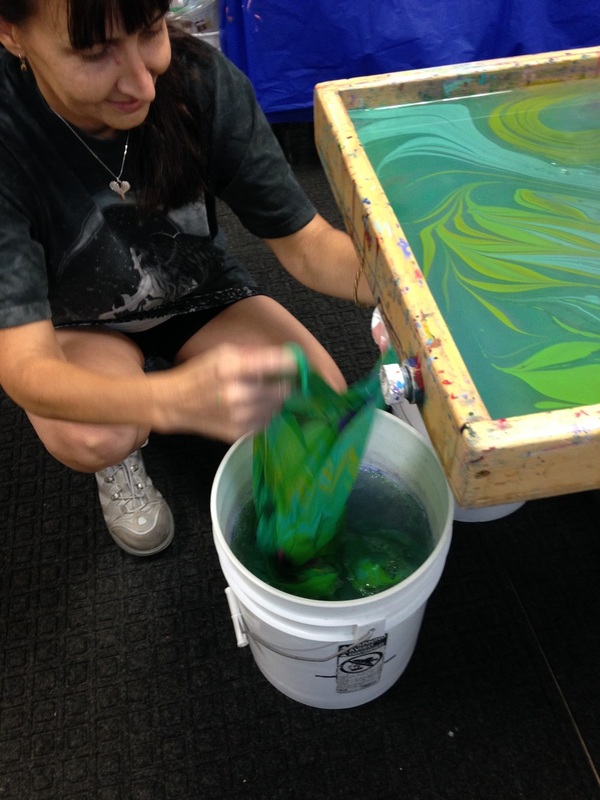 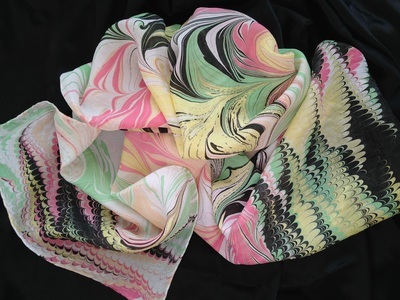 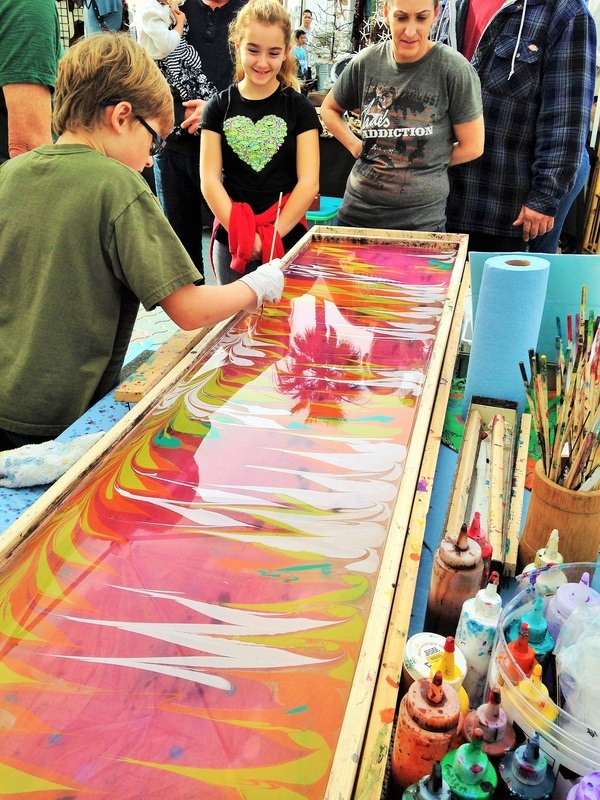 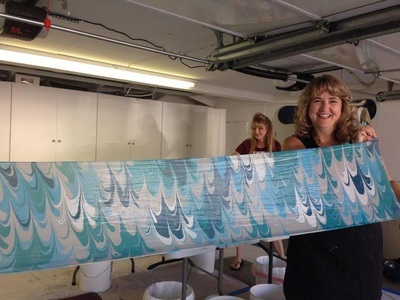 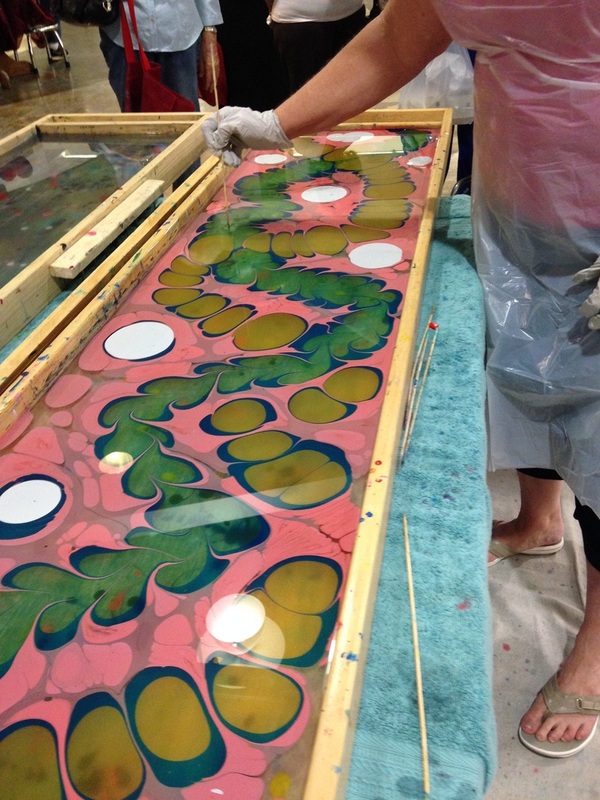 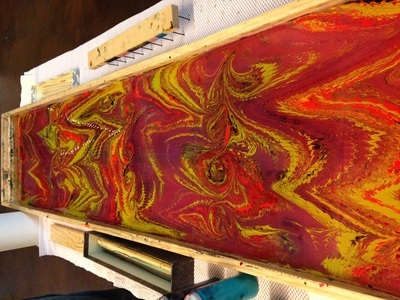 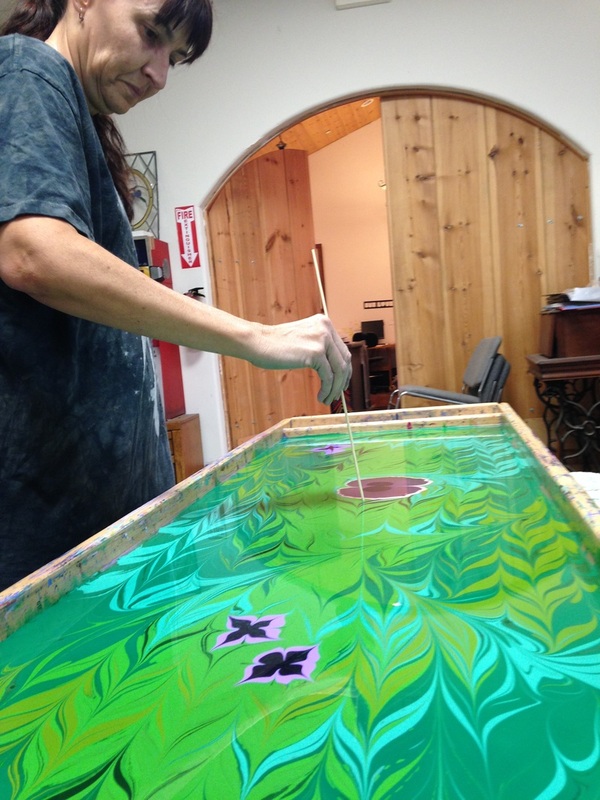 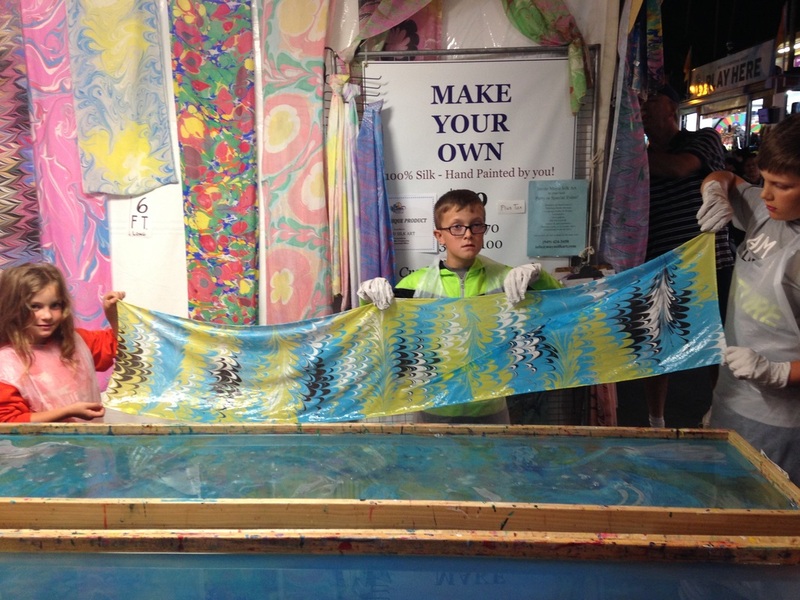 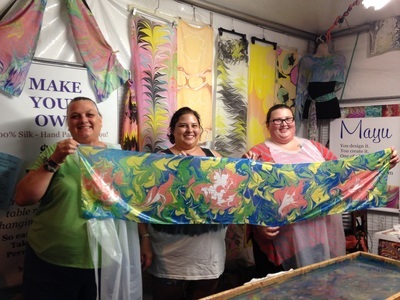 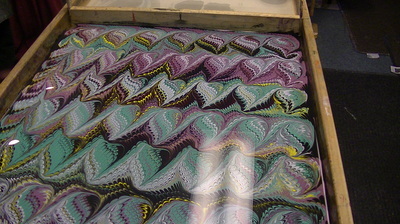 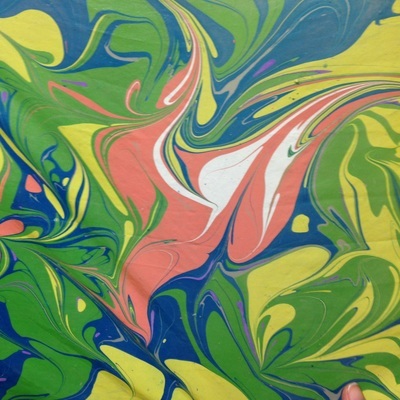 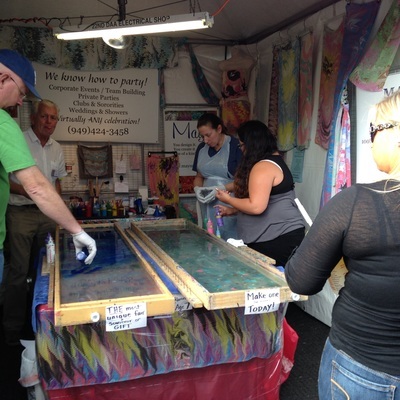 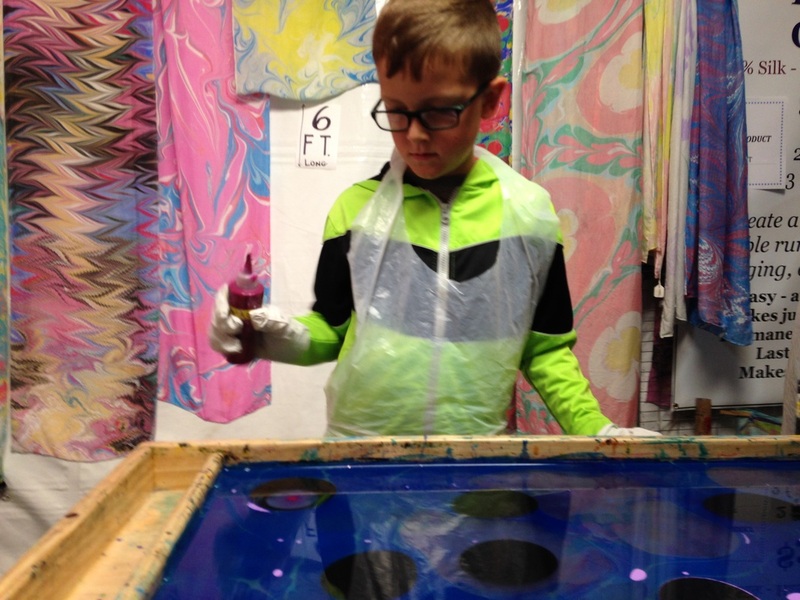 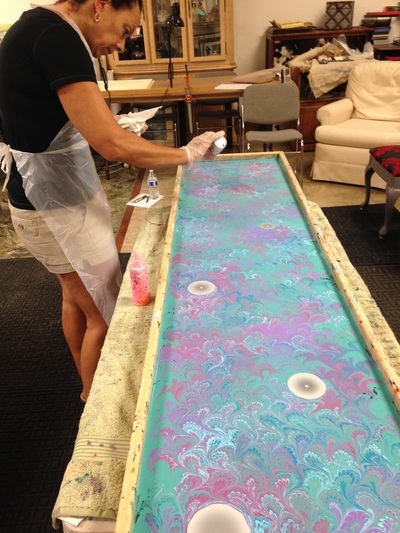 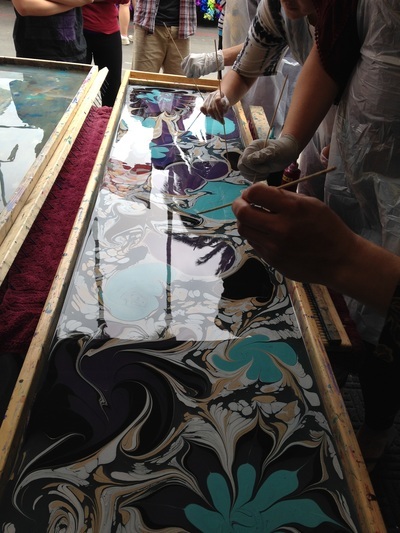 At Mayu Silk Art, we believe that our commitment to community must extend beyond the joyous environs of our paint boxes, marbling trays and rinse buckets to the world in which we all live. 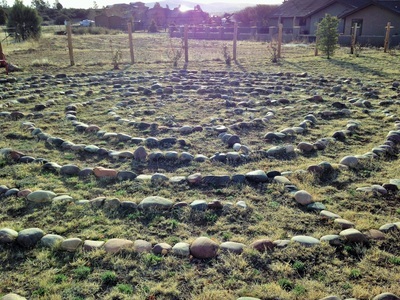 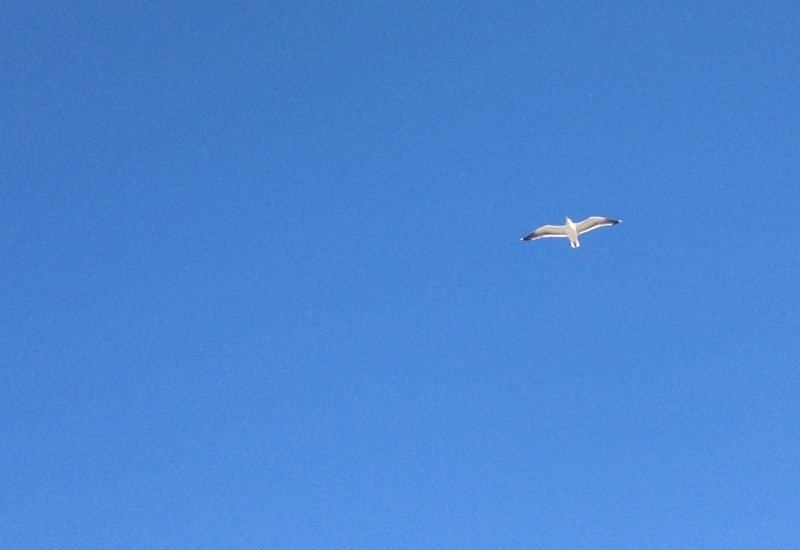 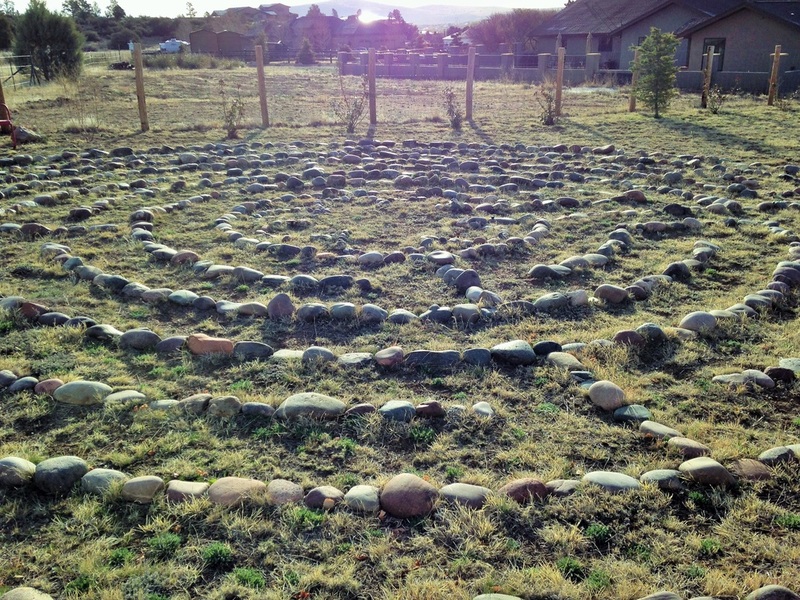 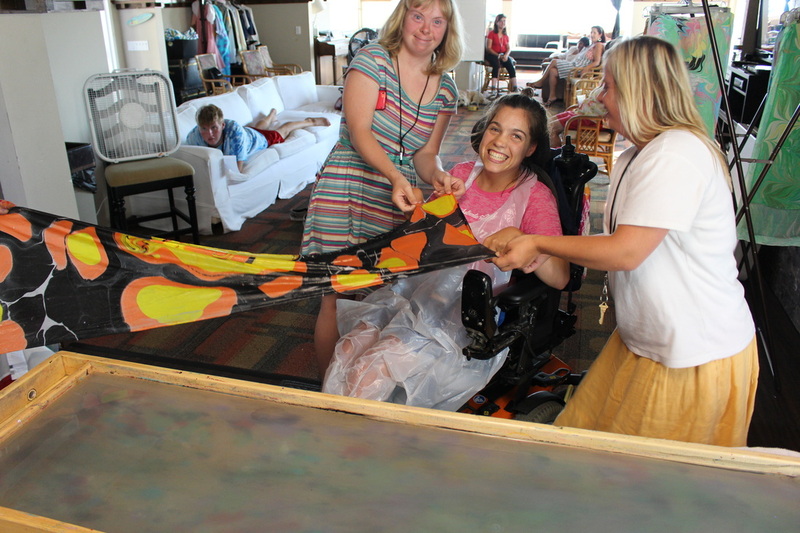 It is a beautiful world, with an abundant need for care and compassion, love, hope and healing. 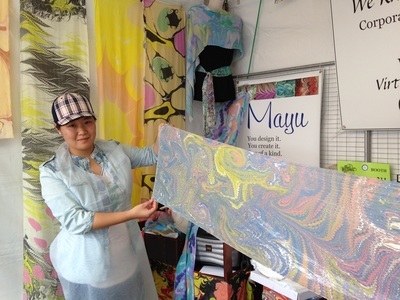 This shared Mayu Silk Art Experience is an opportunity for all of us to connect with and inspire others. 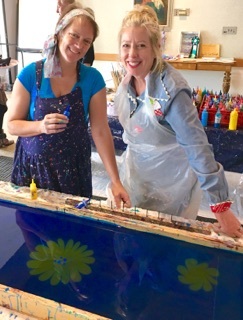 The example we set as a company of just a few is nothing compared to the impact we can have when we join hands the many others who cross our path every day to take action and to make a difference, together. 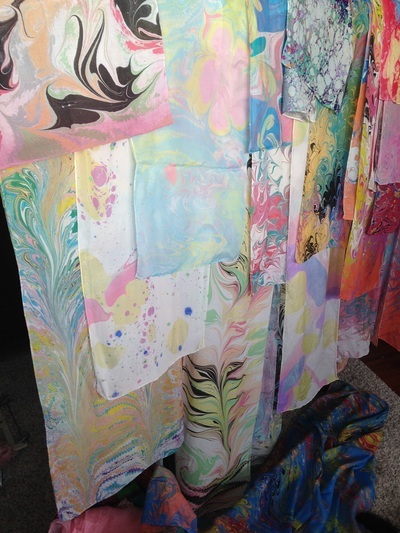 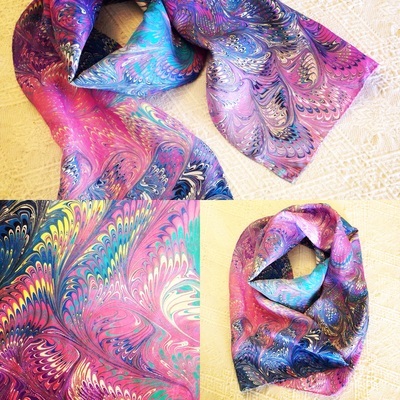 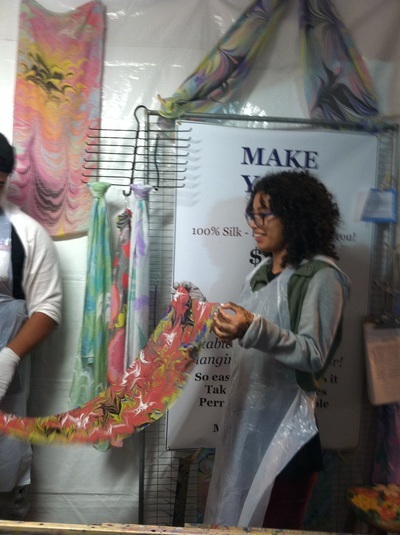 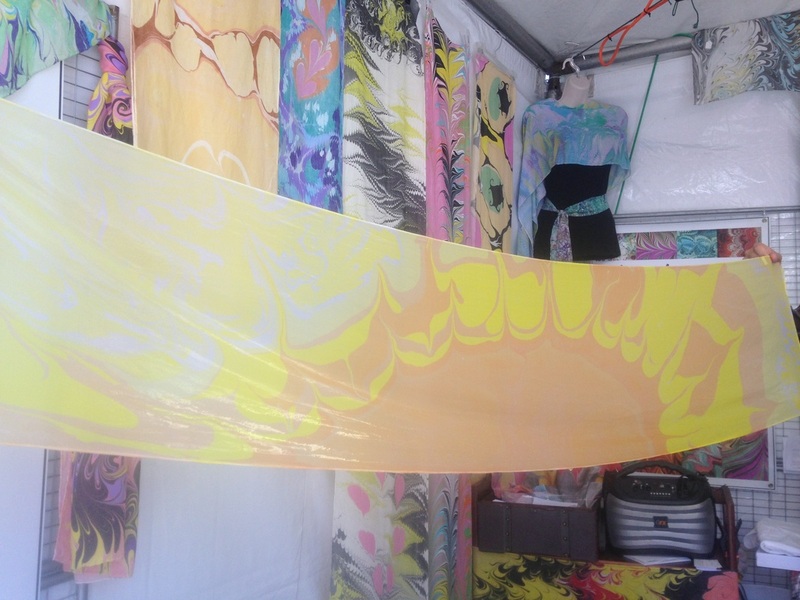 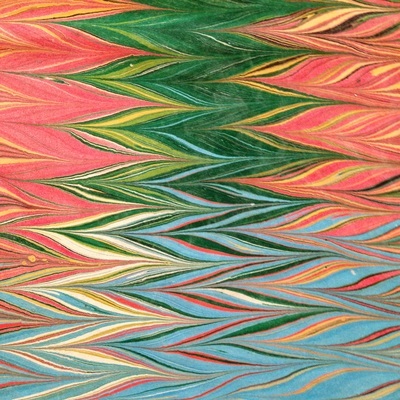 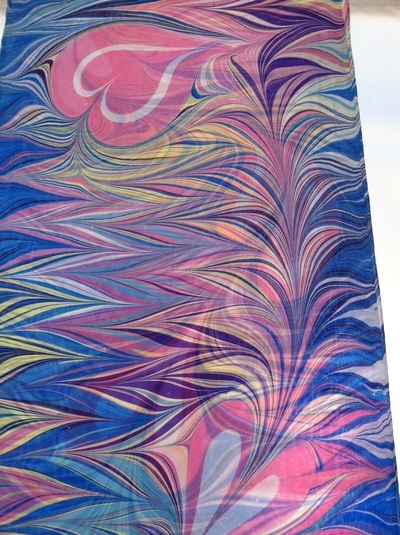 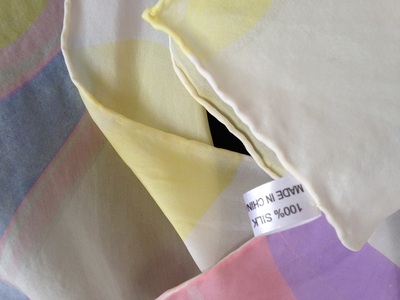 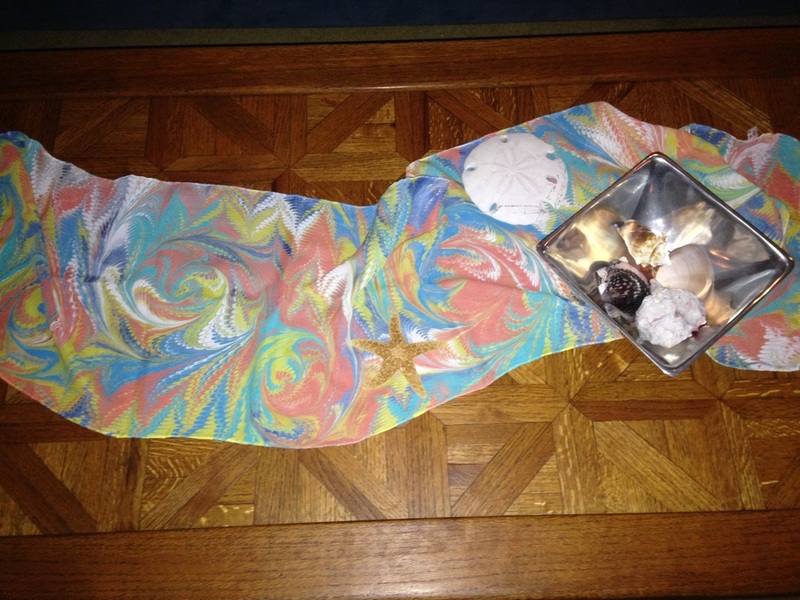 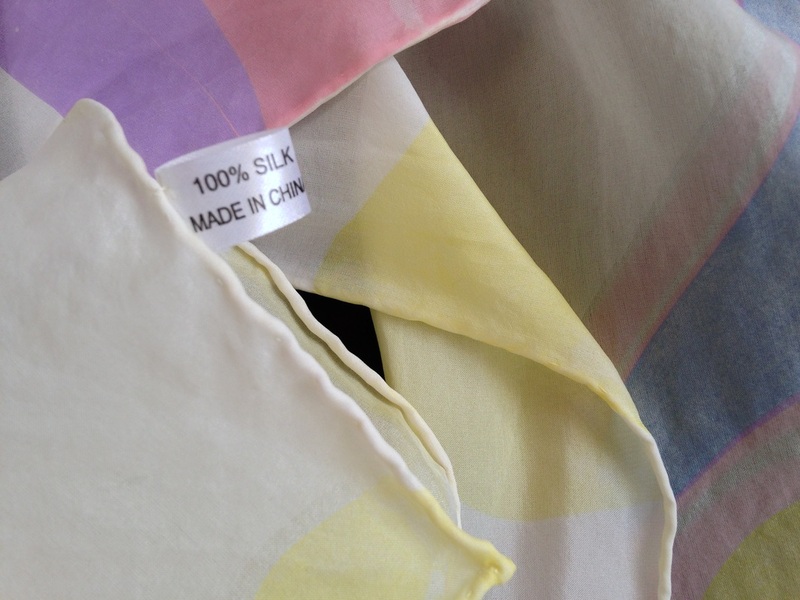 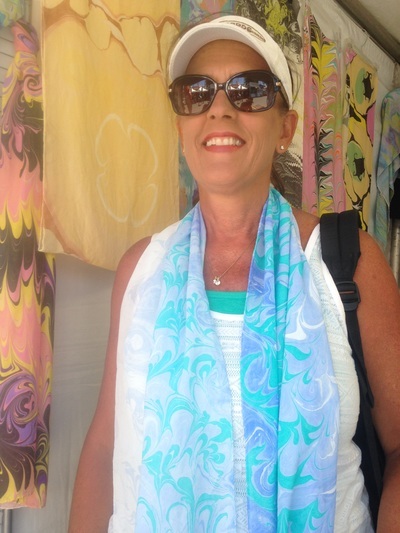 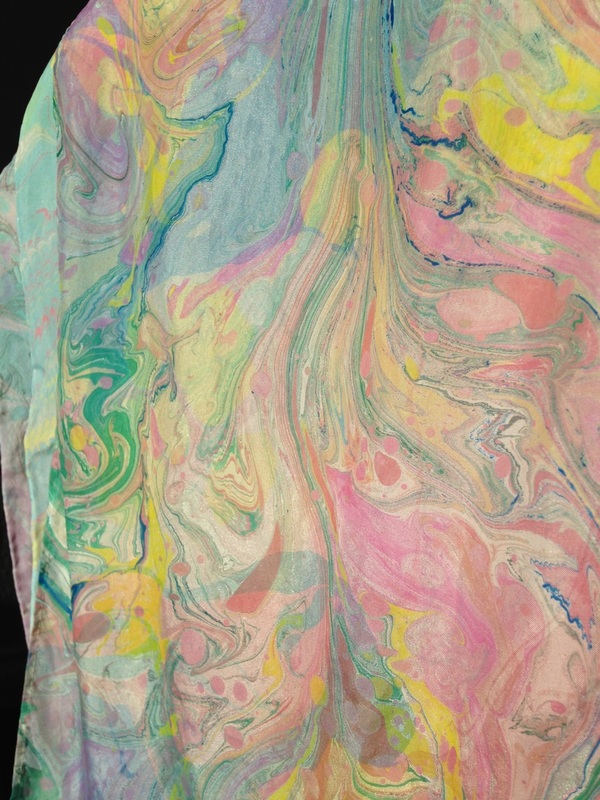 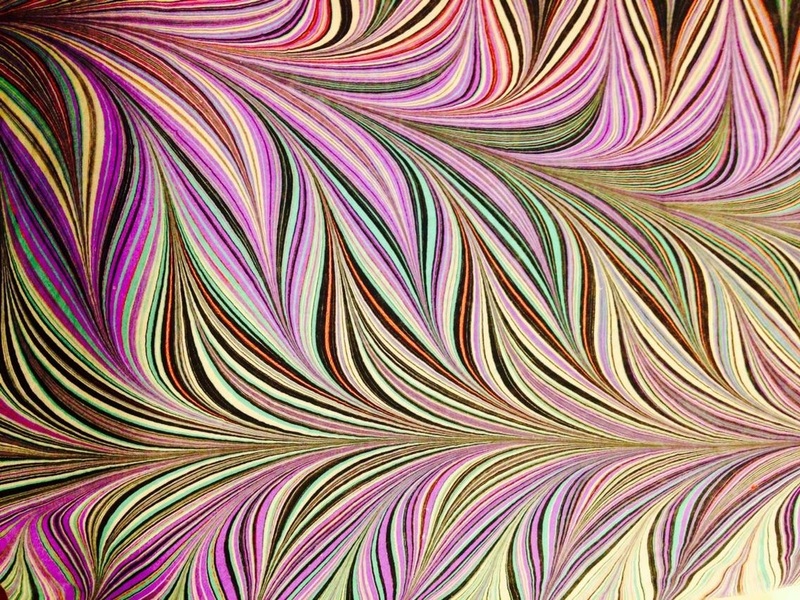 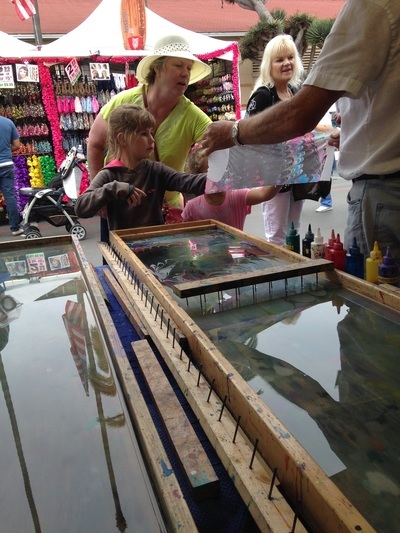 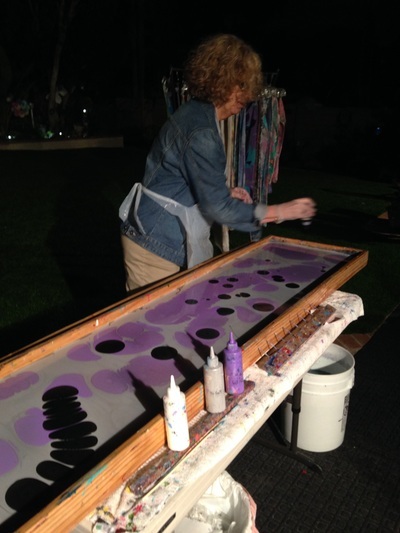 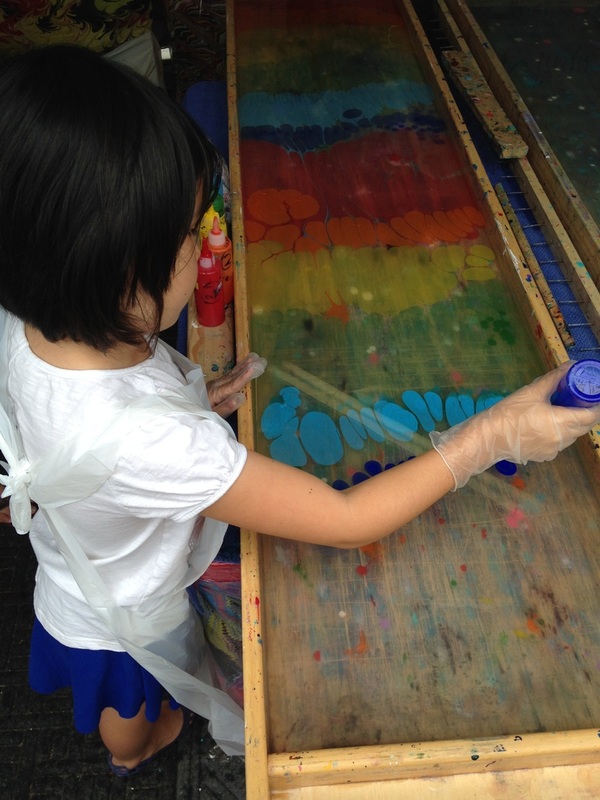 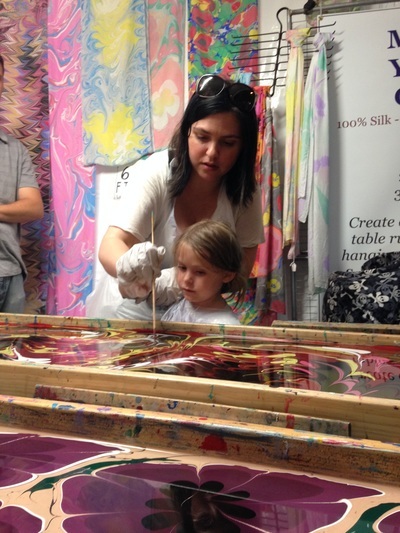 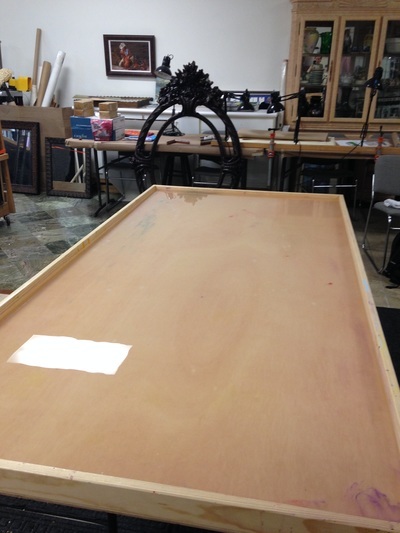 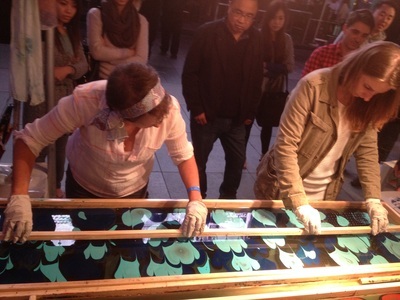 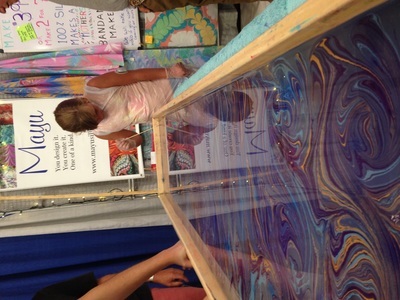 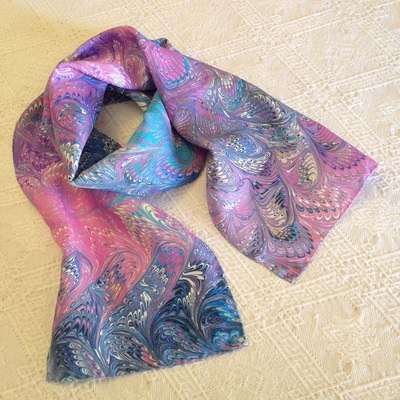 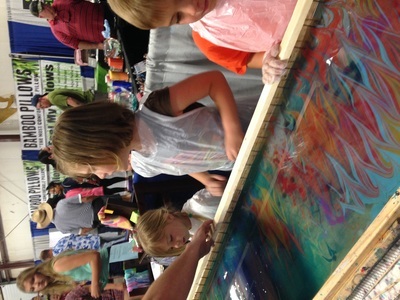 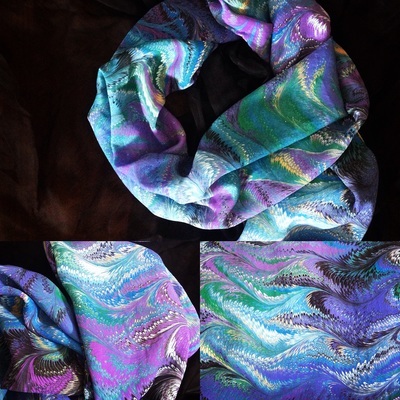 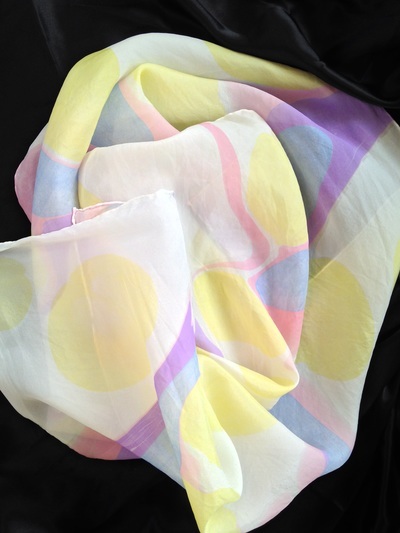 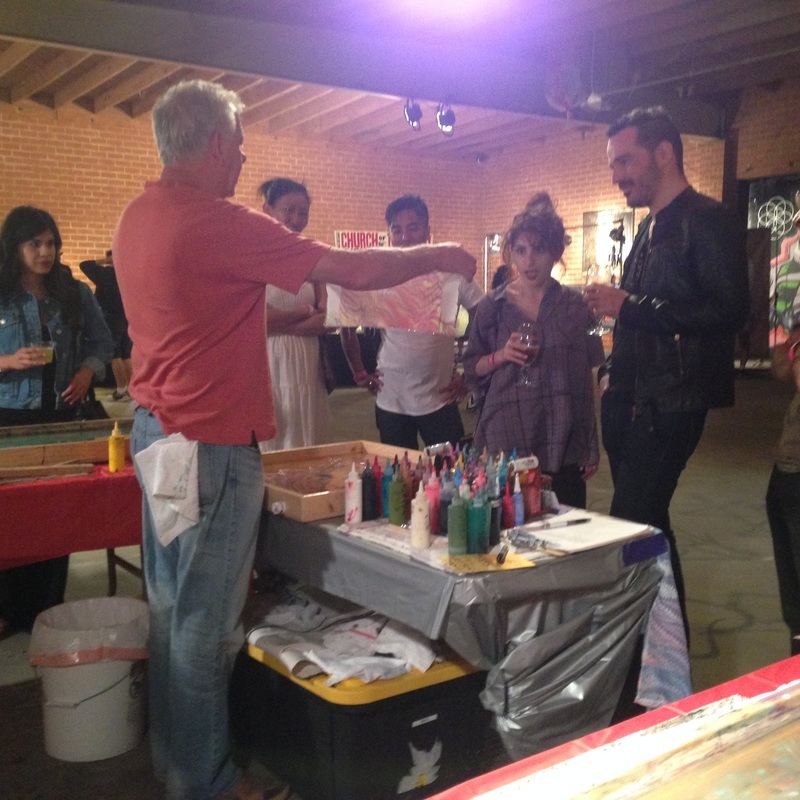 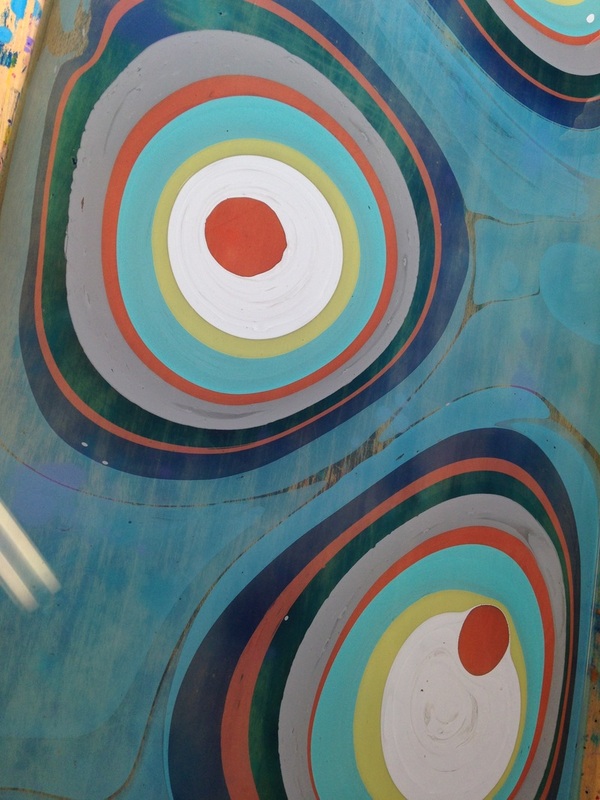 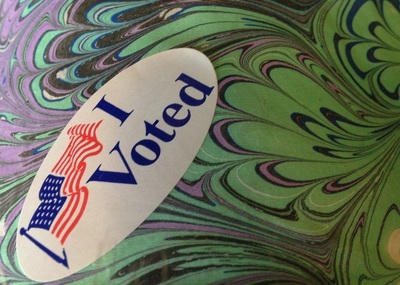 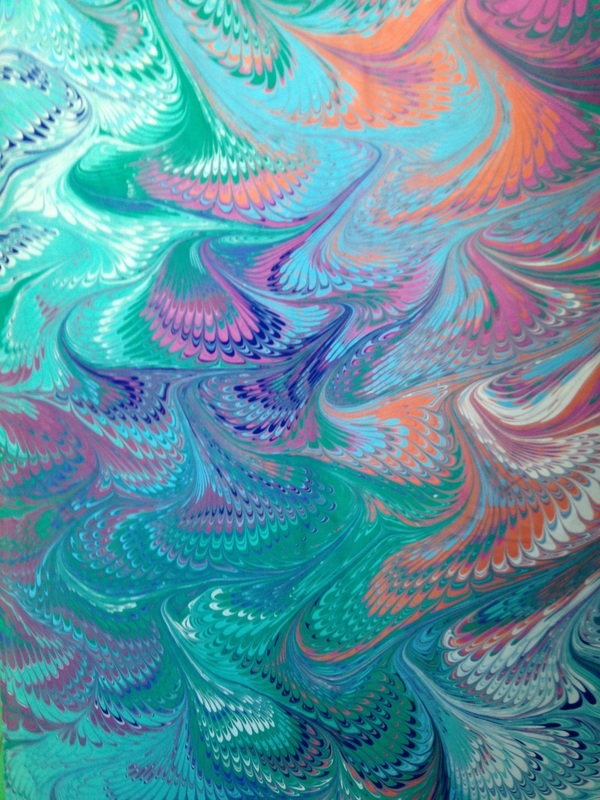 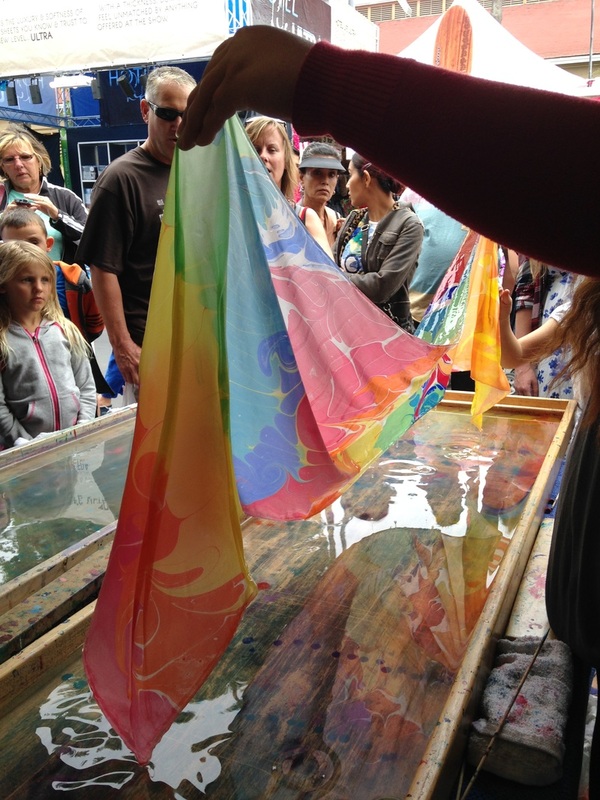 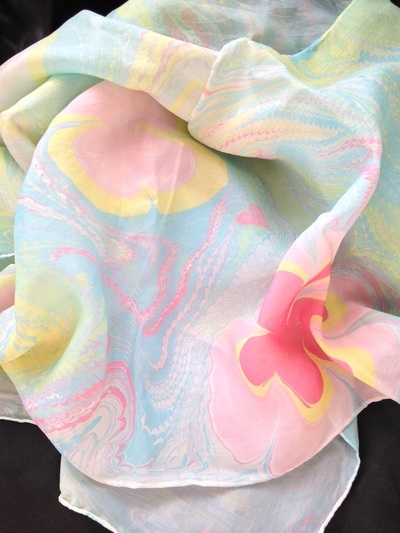 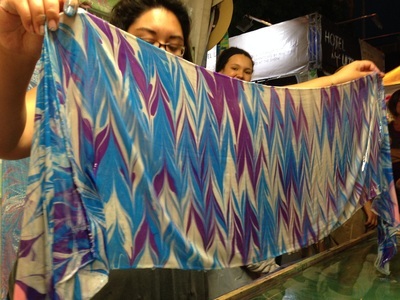 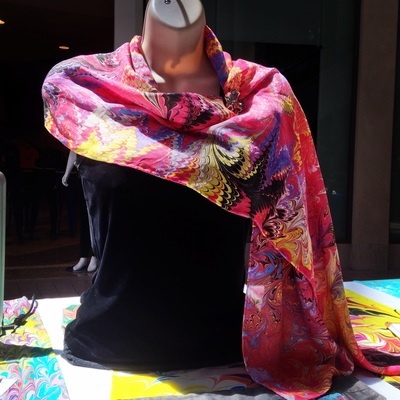 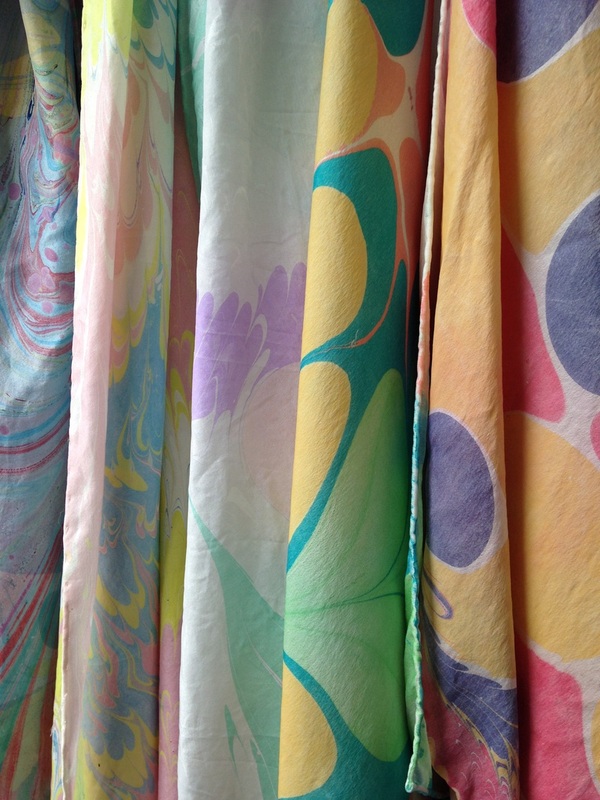 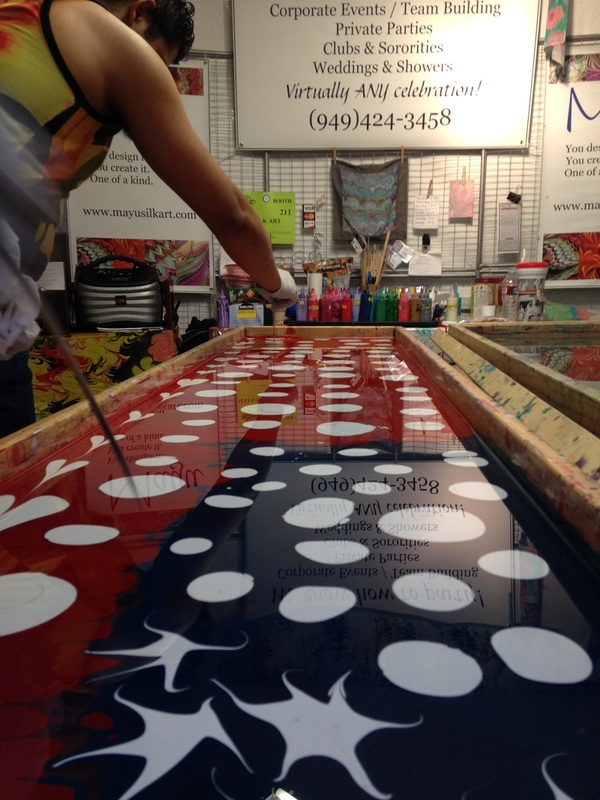 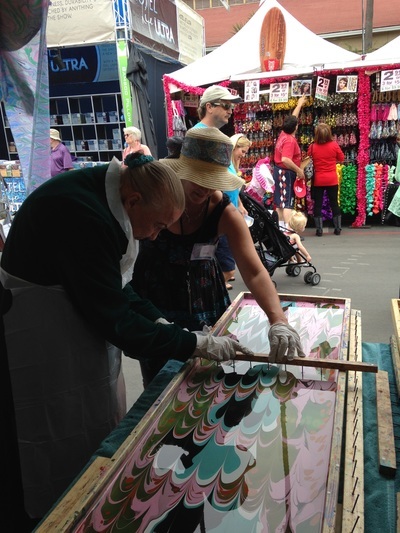 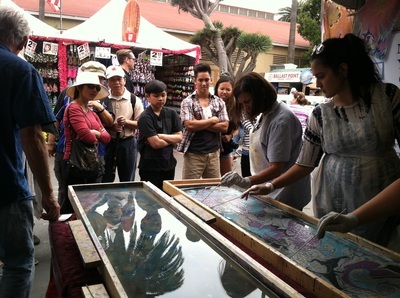 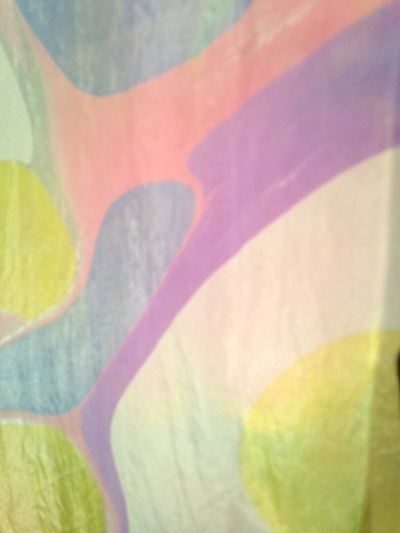 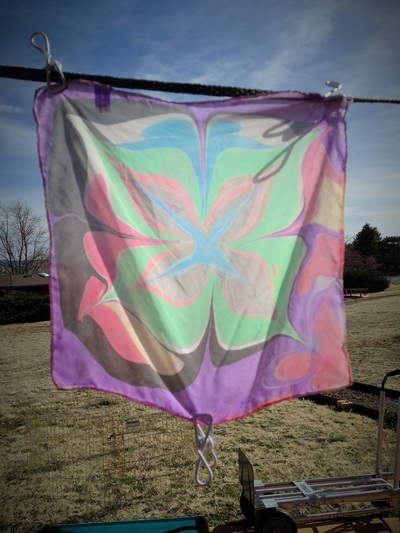 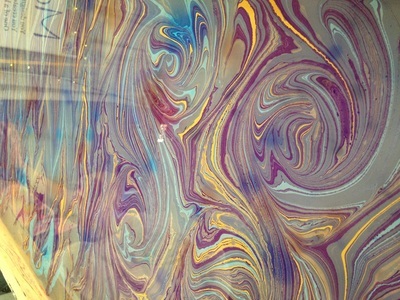 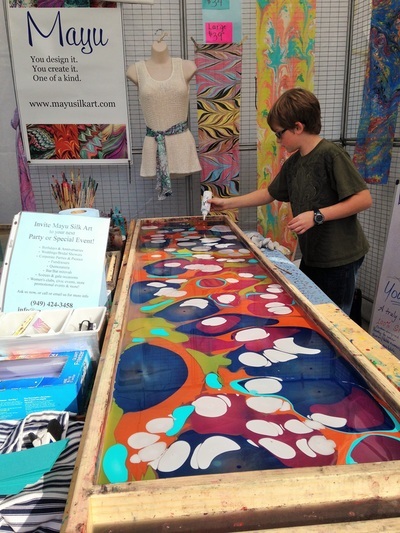 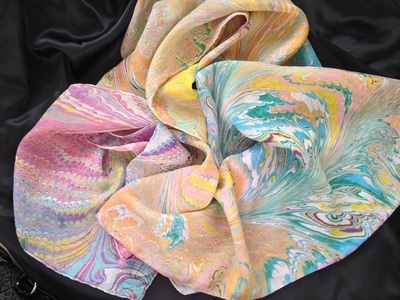 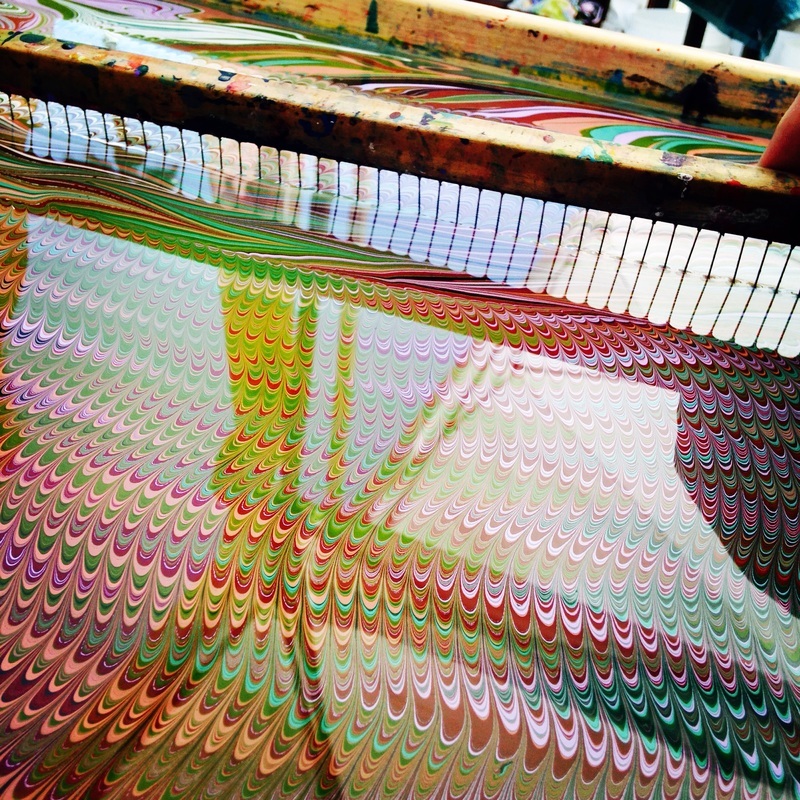 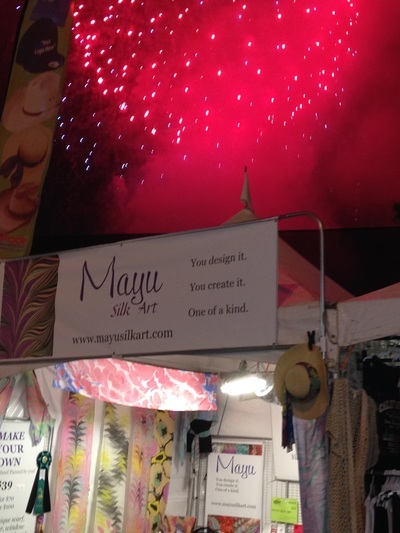 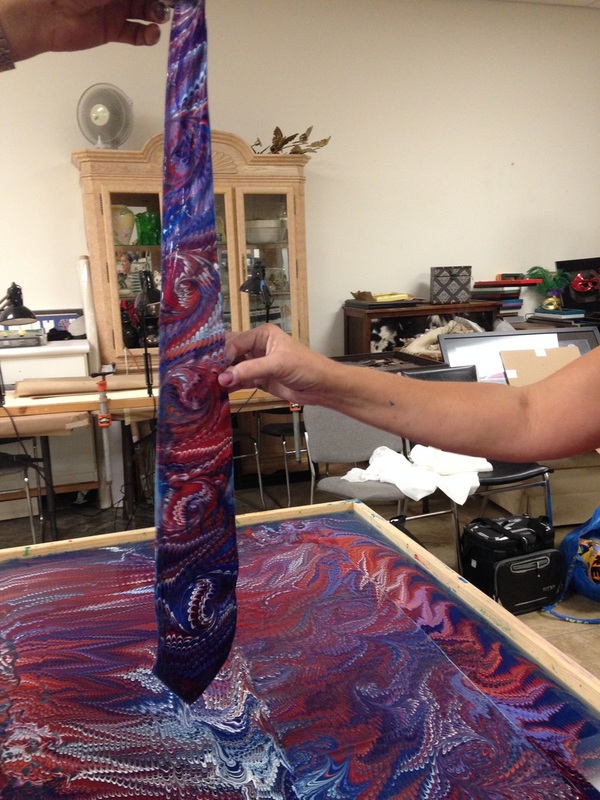 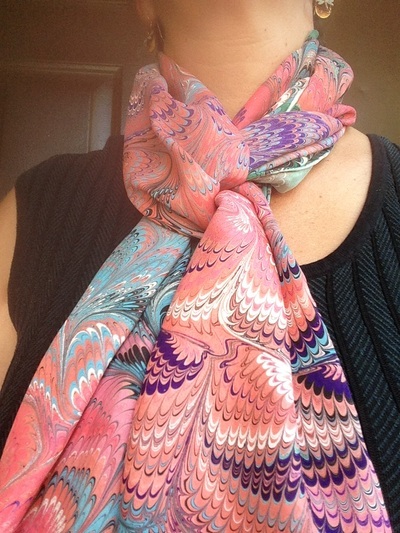 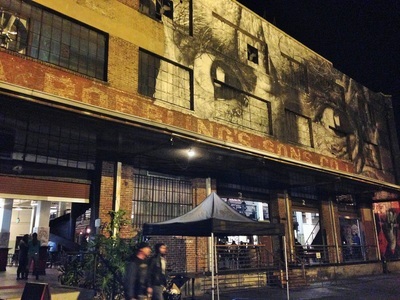 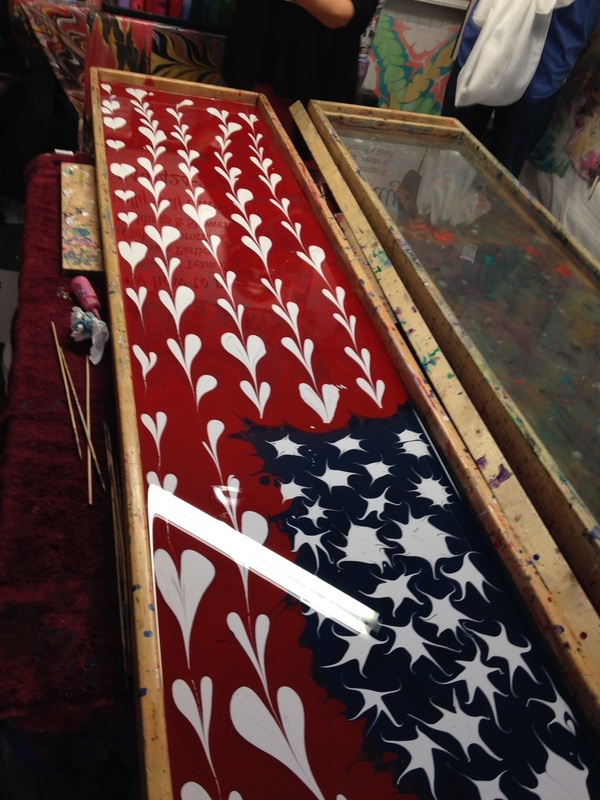 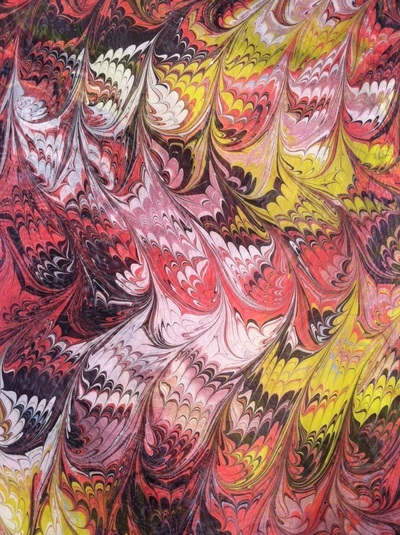 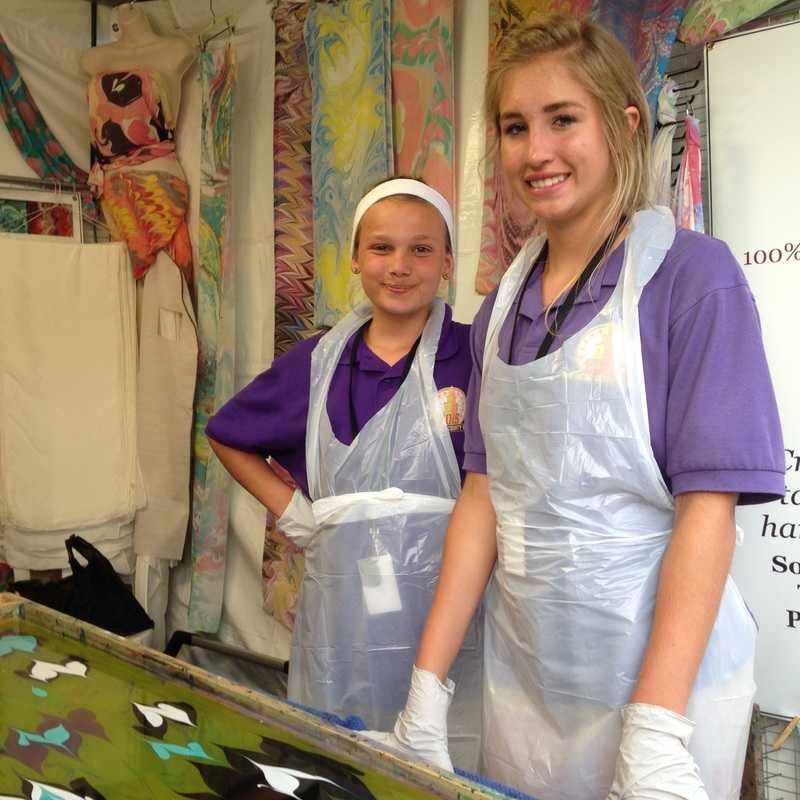 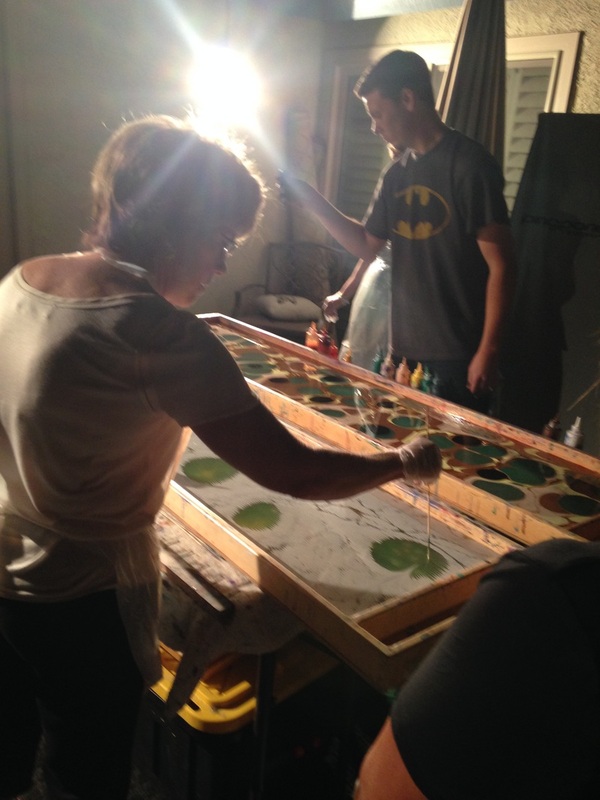 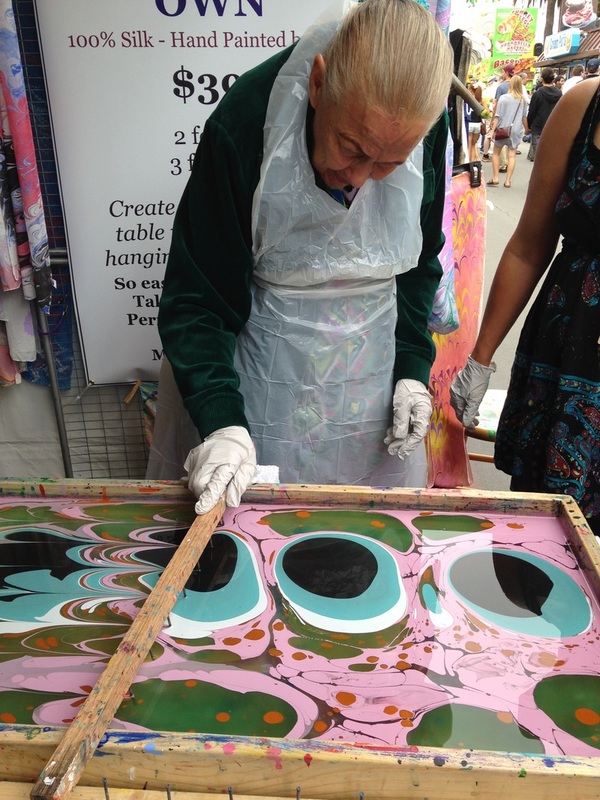 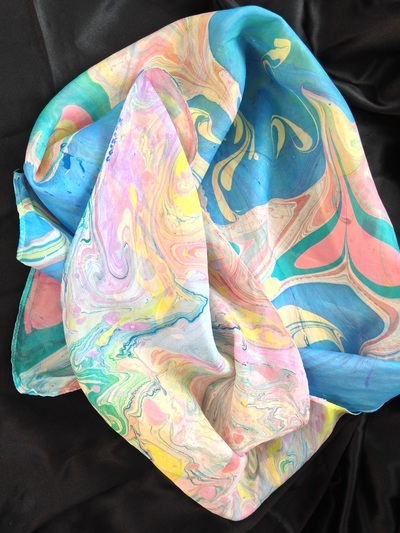 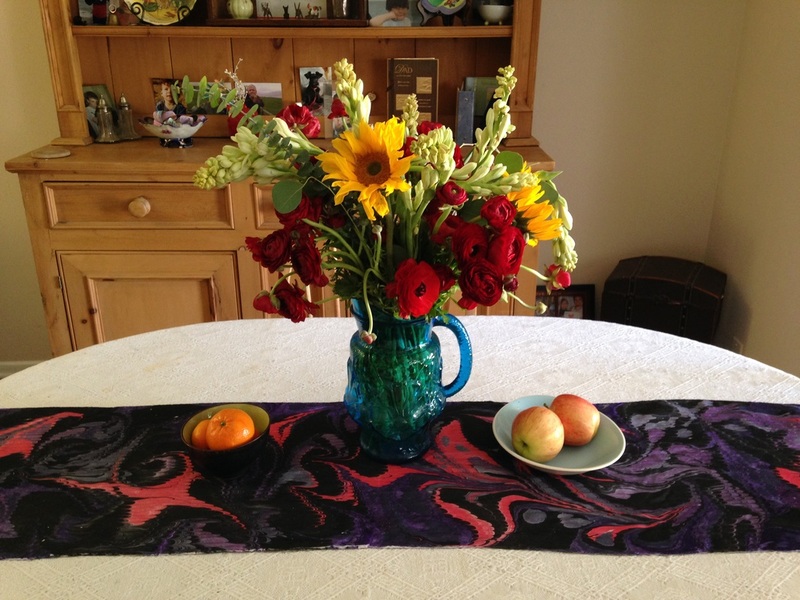 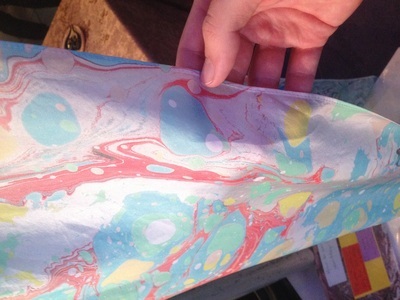 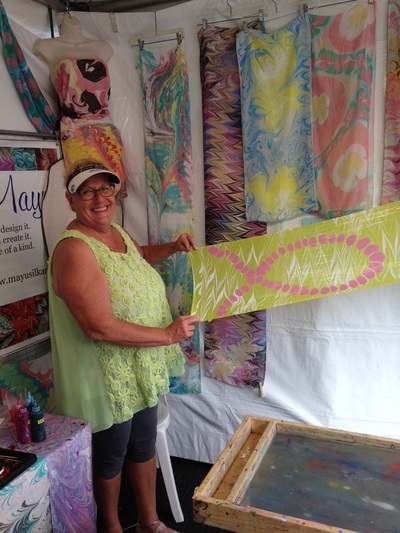 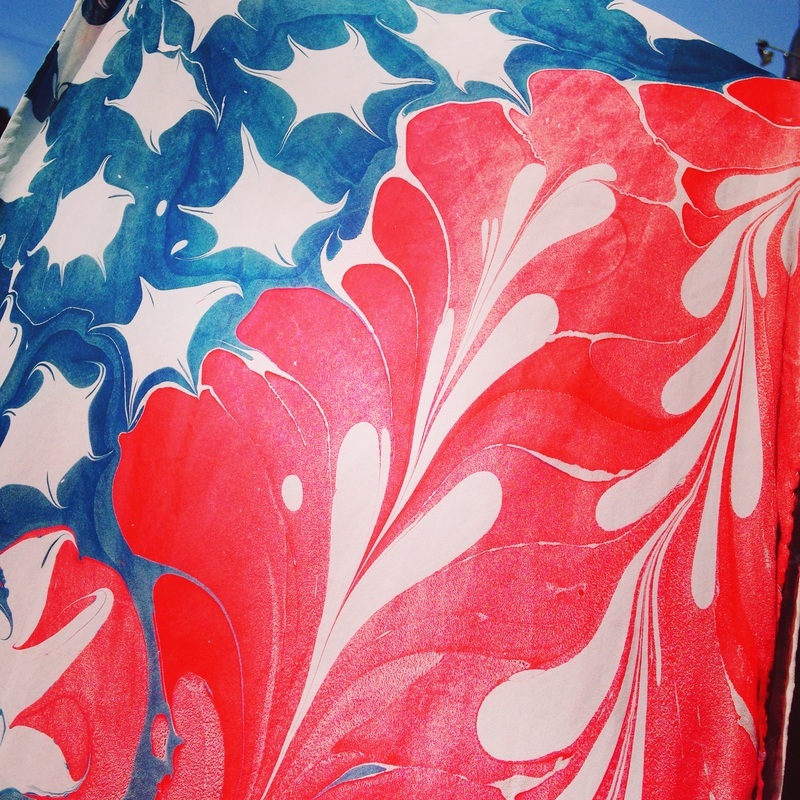 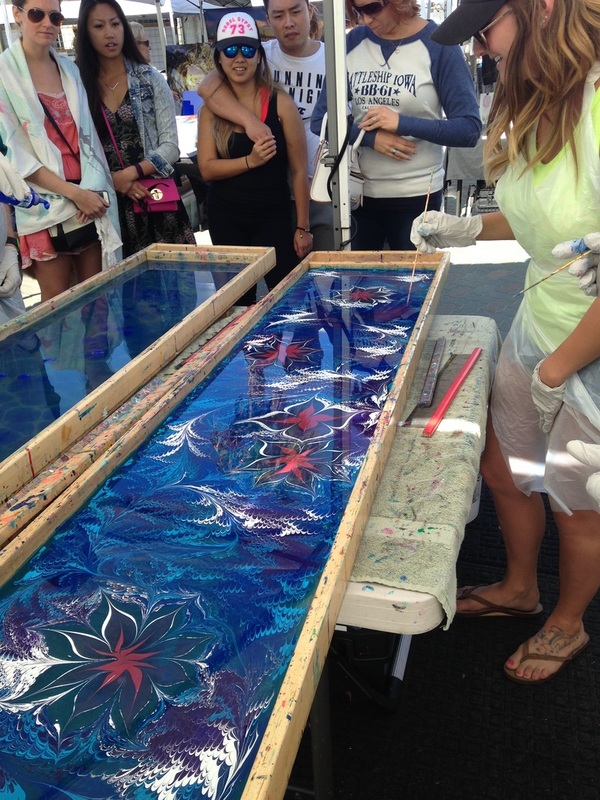 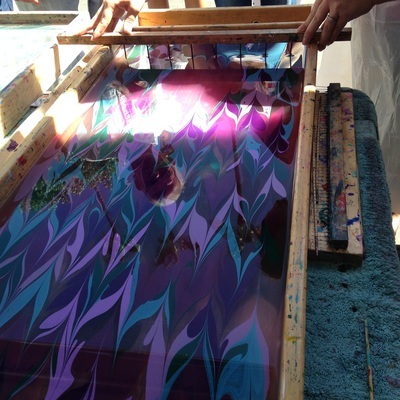 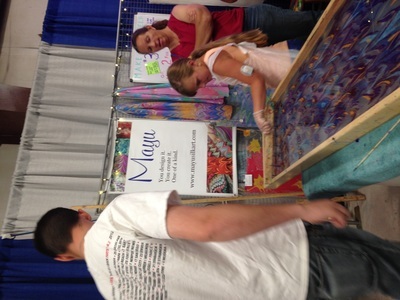 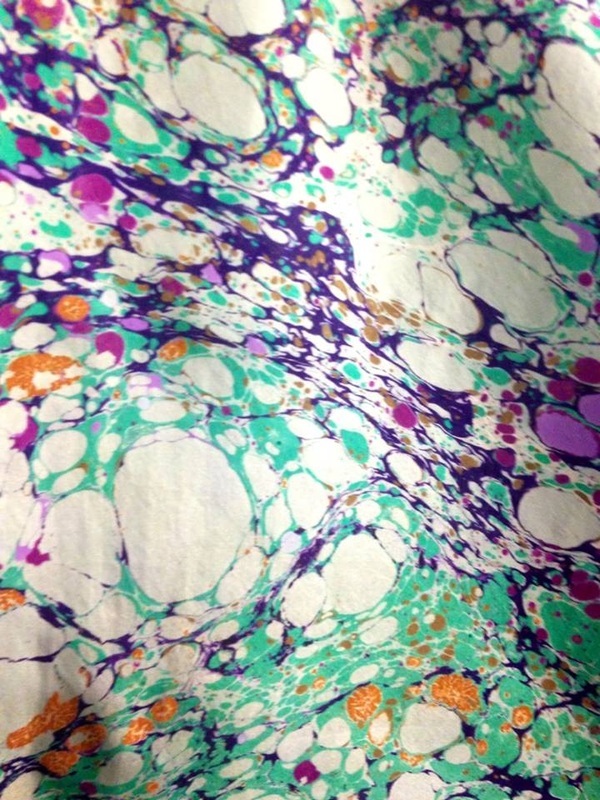 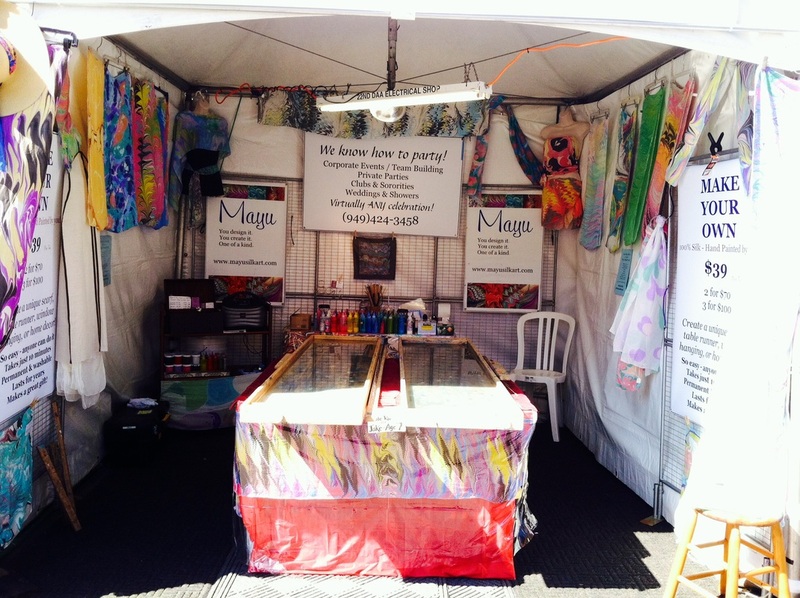 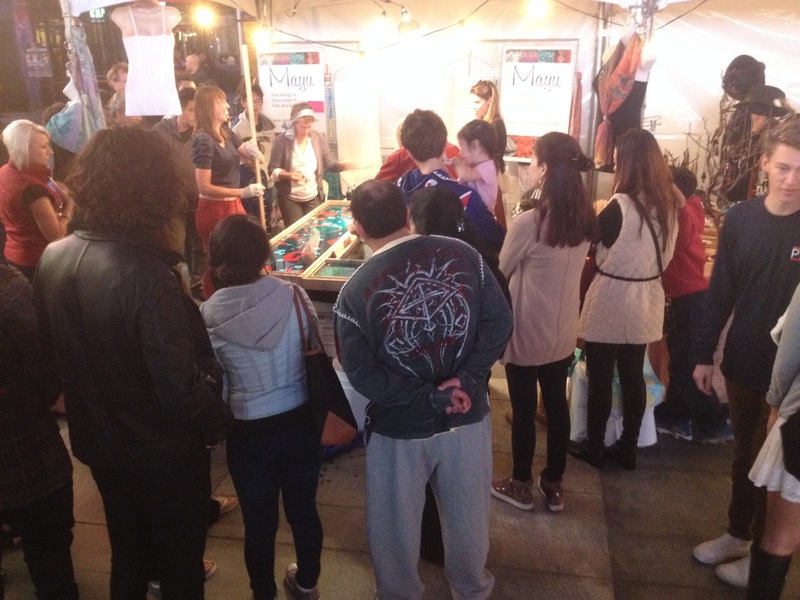 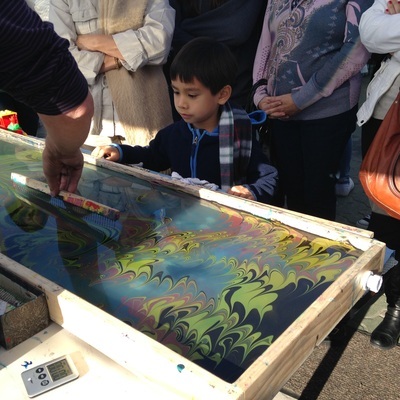 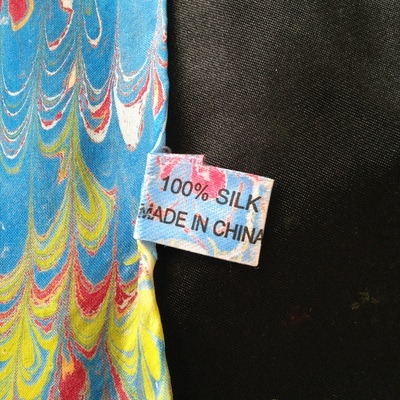 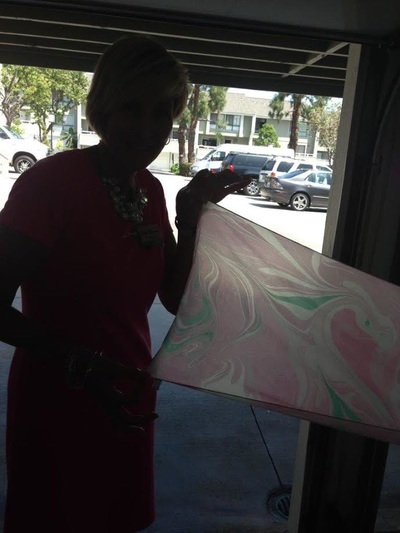 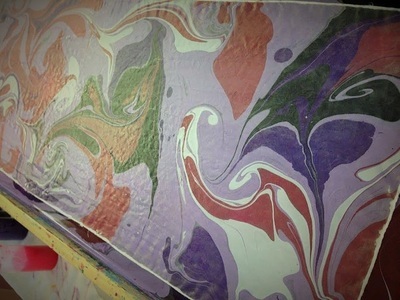 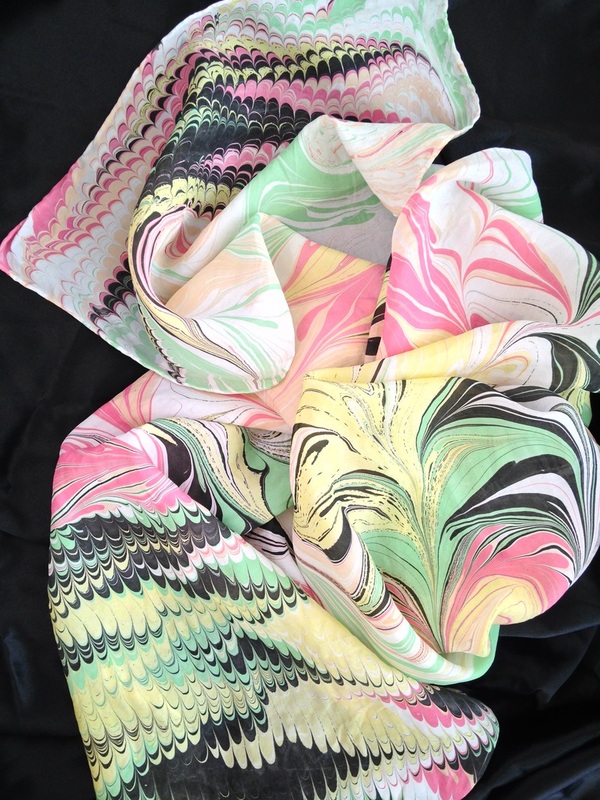 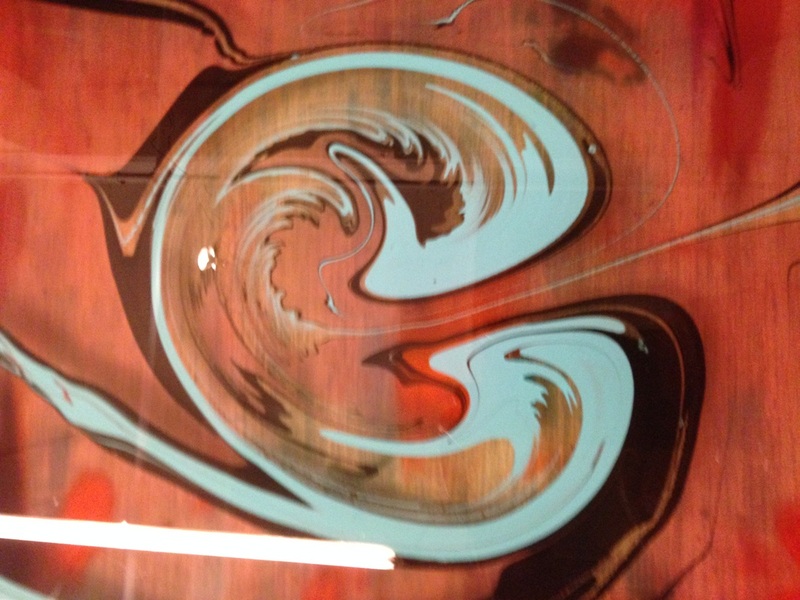 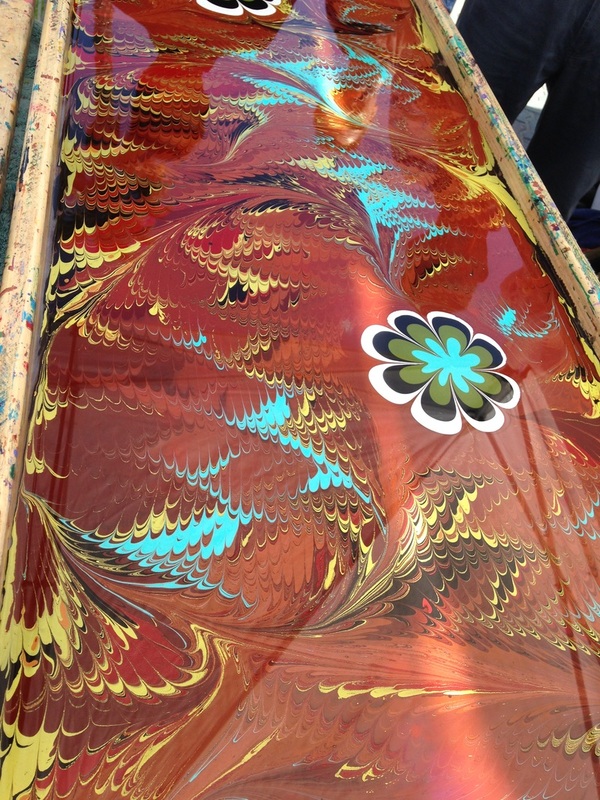 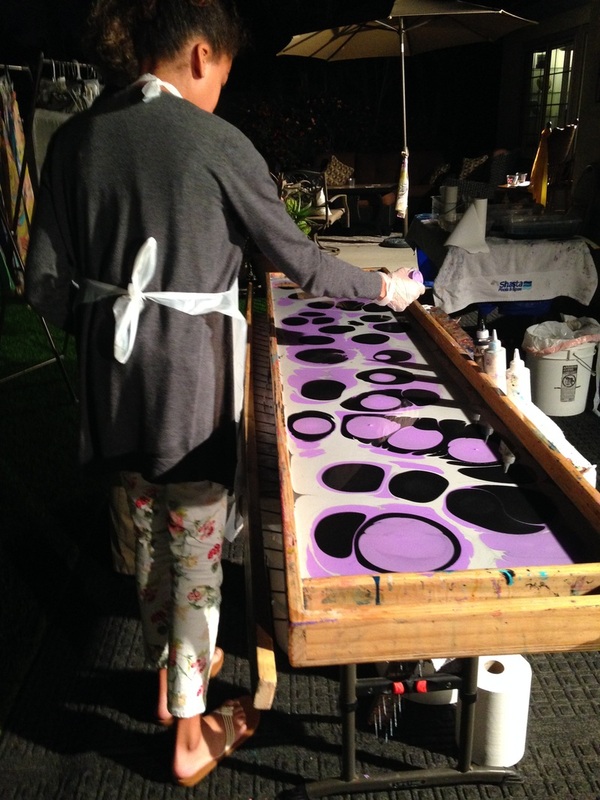 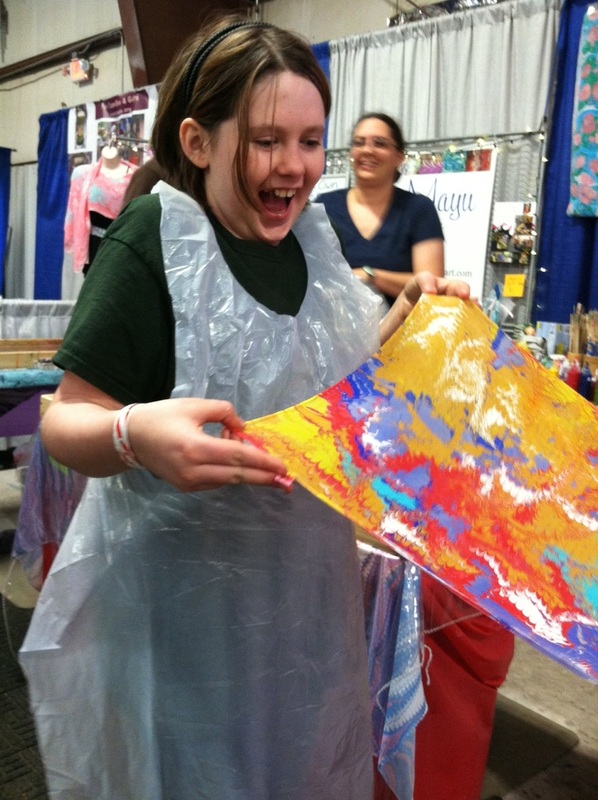 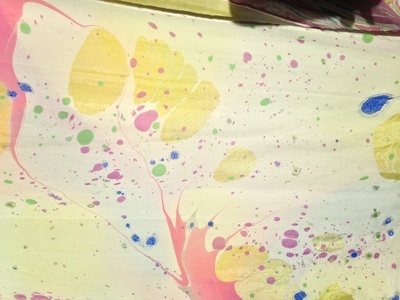 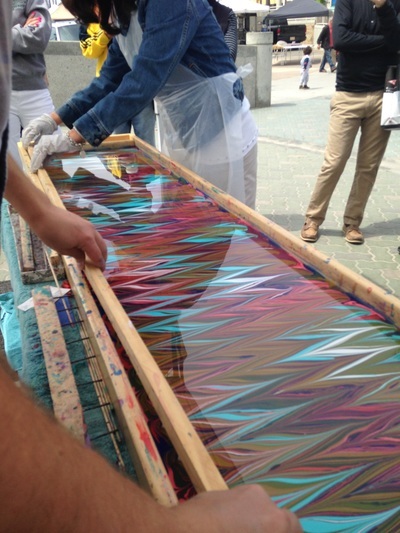 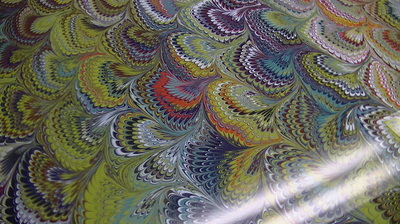 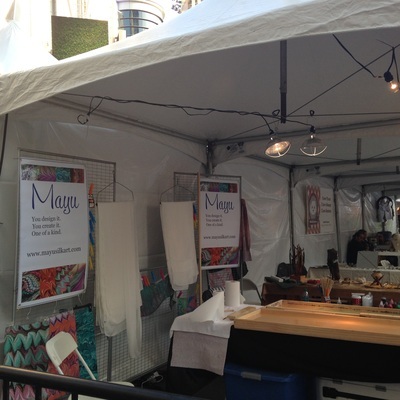 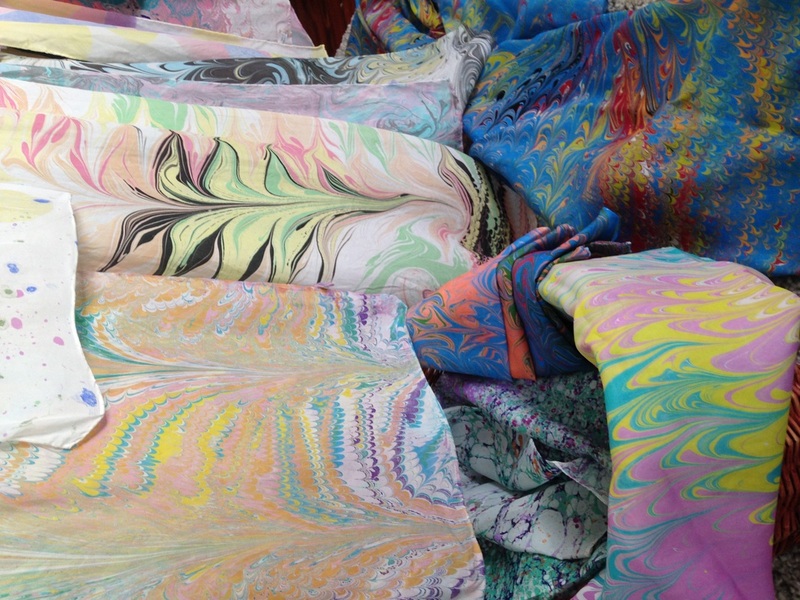 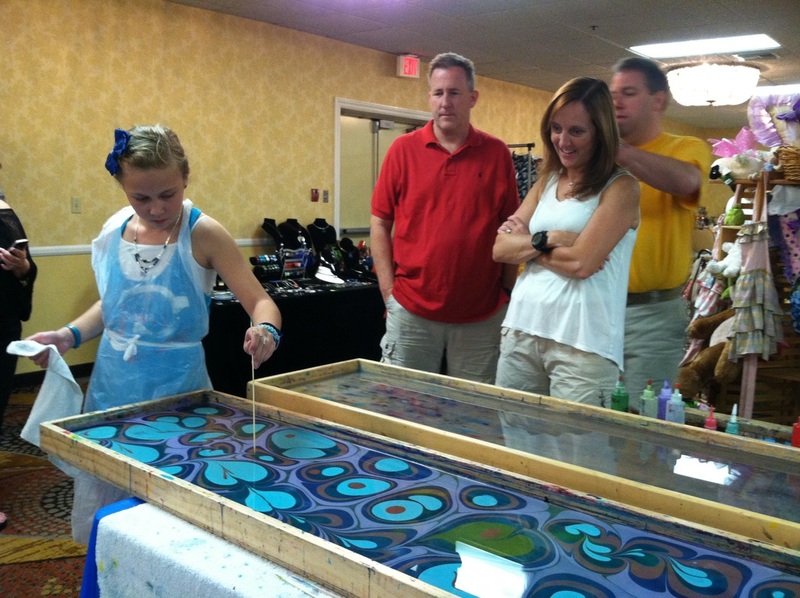 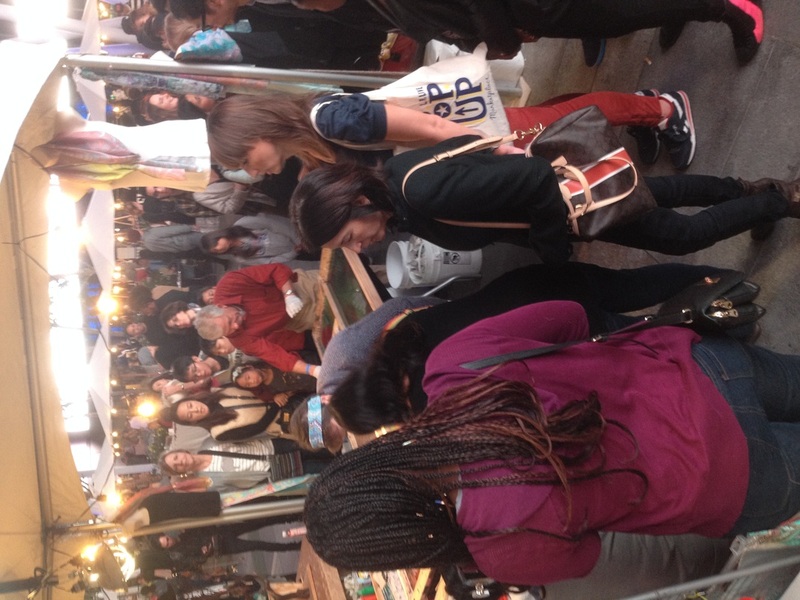 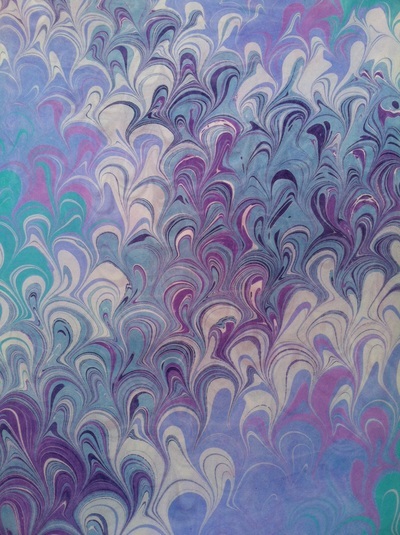 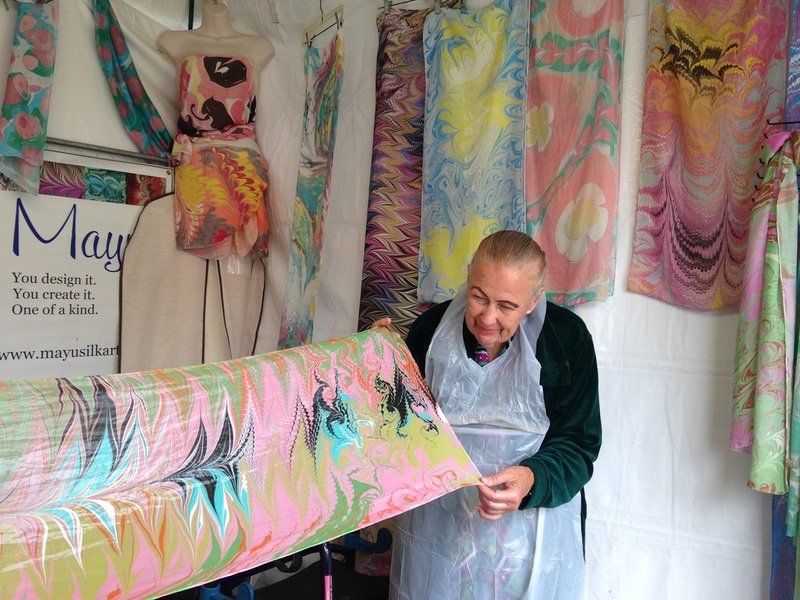 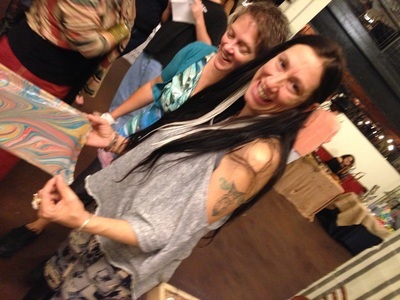 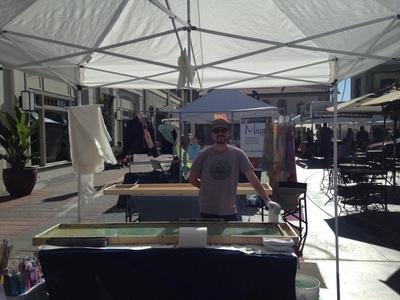 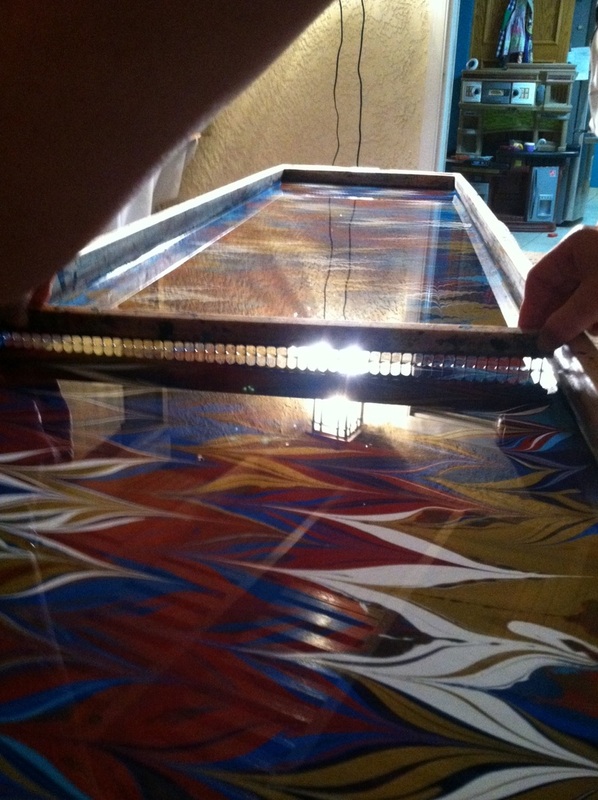 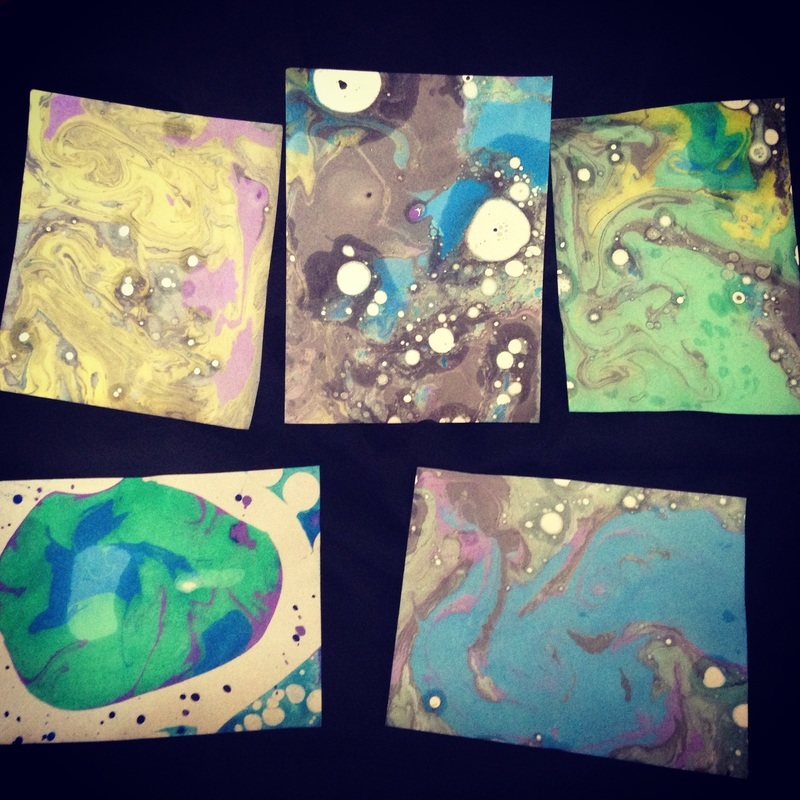 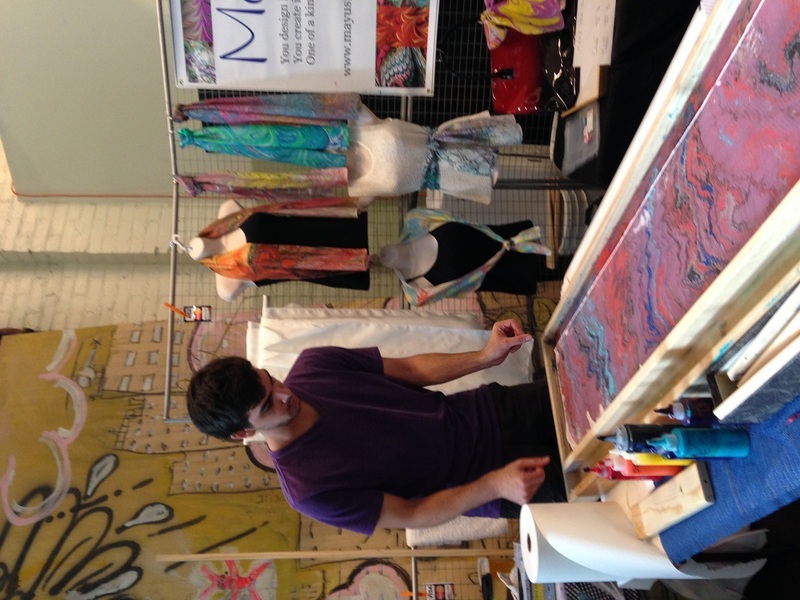 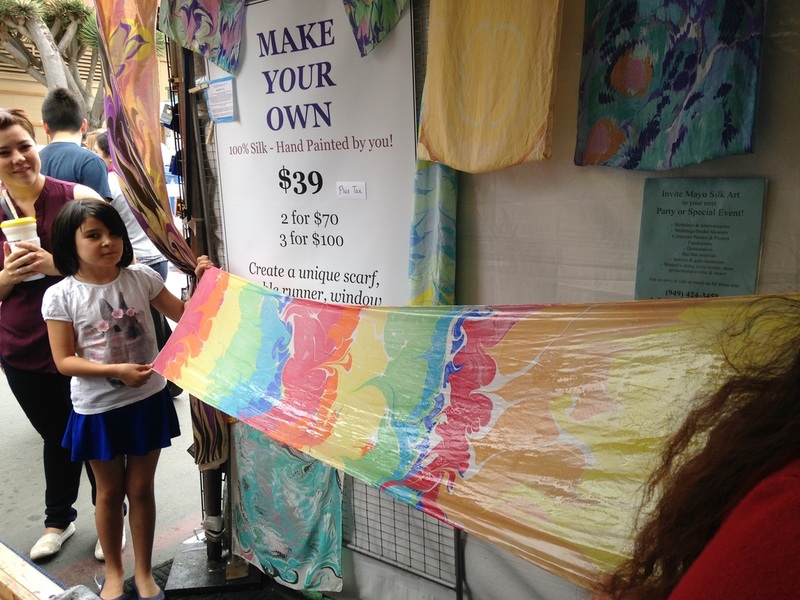 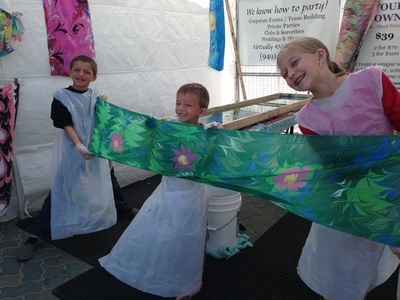 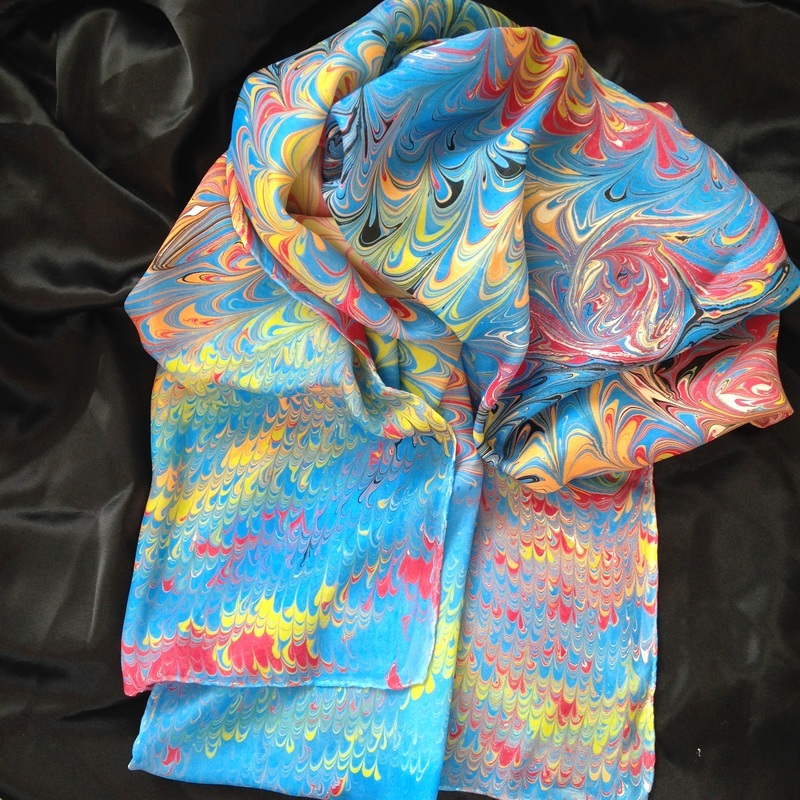 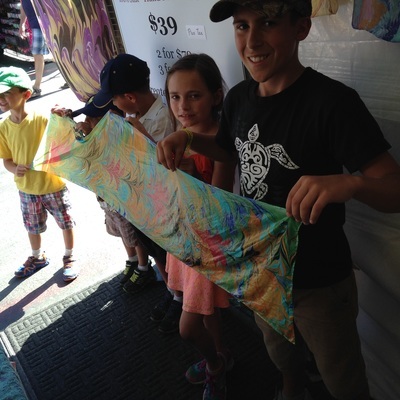 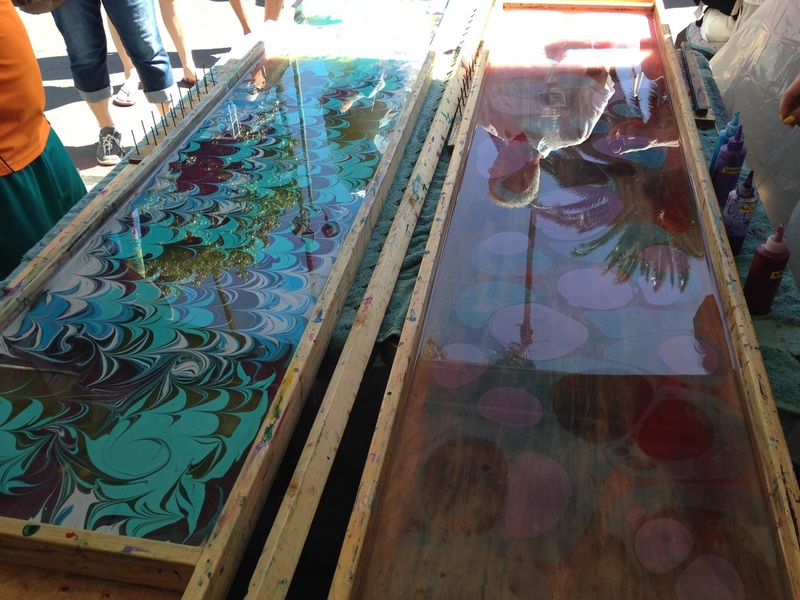 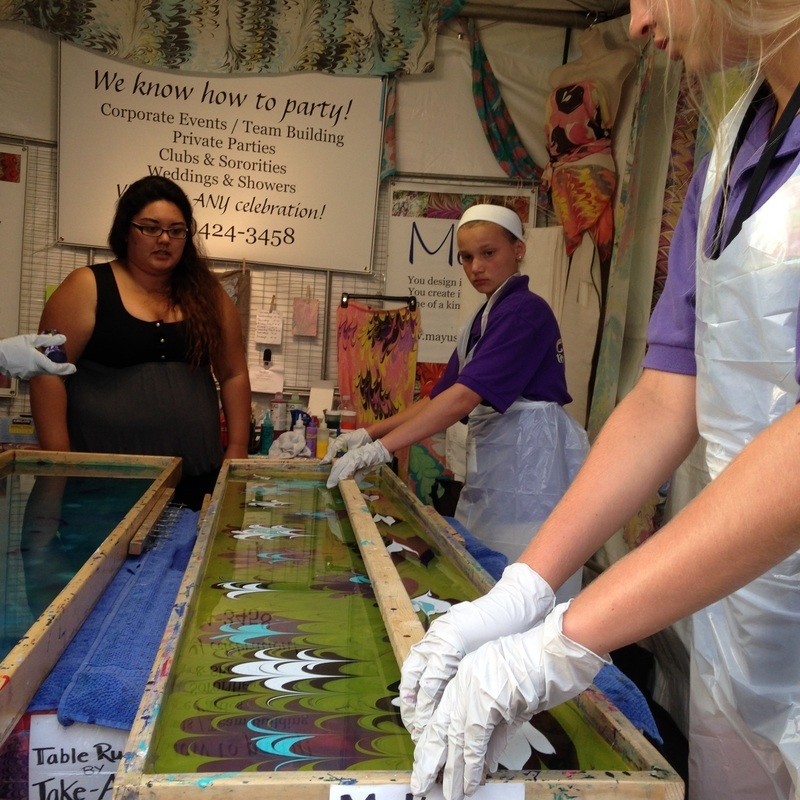 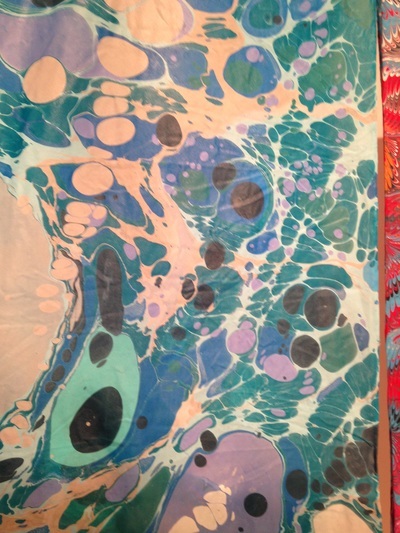 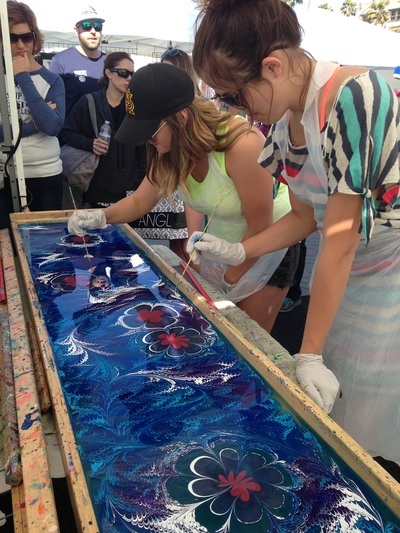 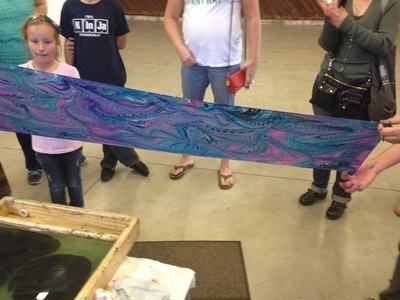 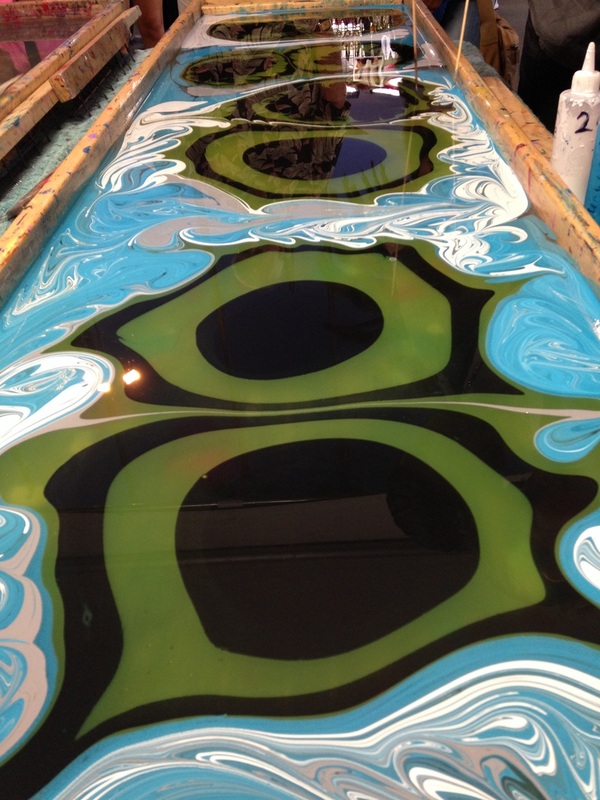 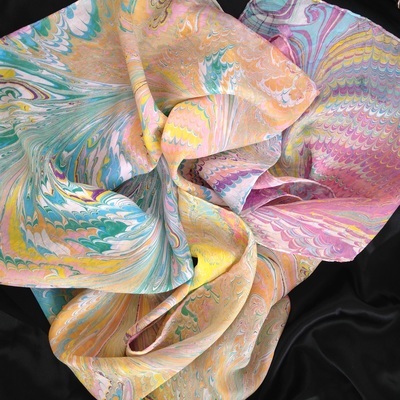 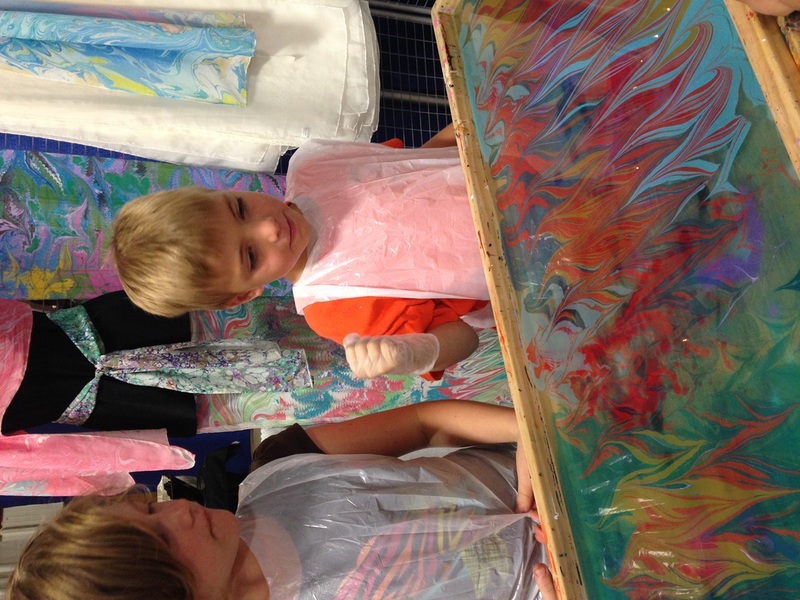 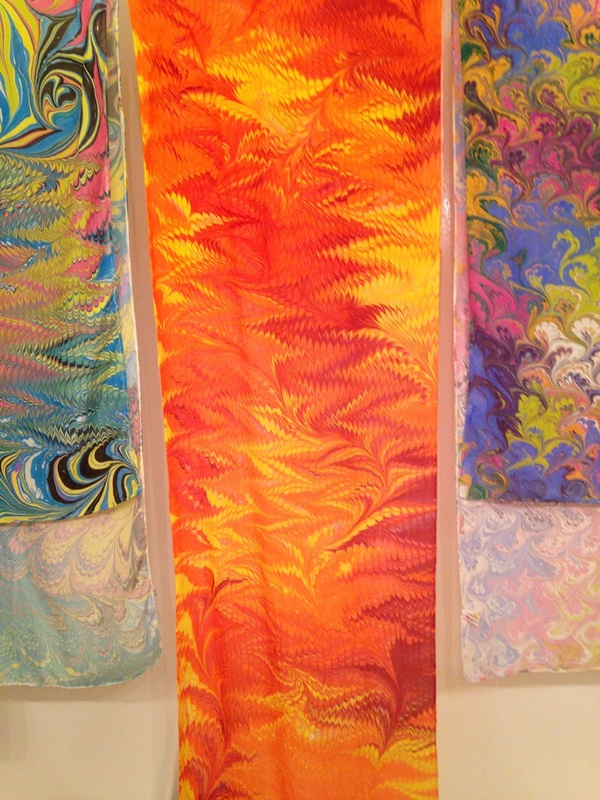 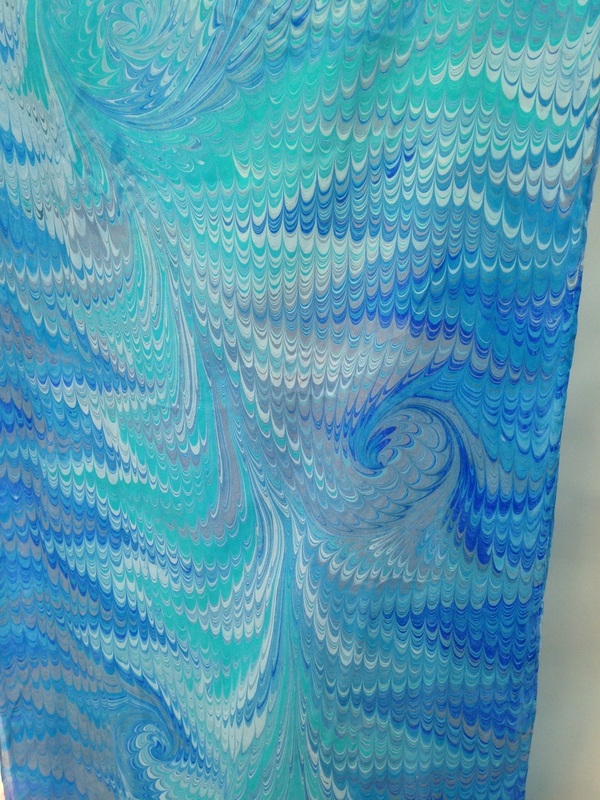 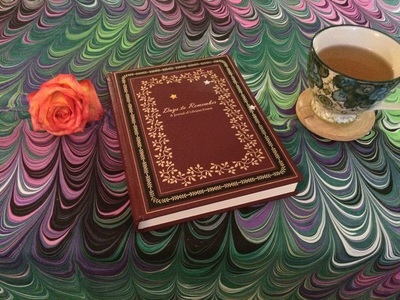 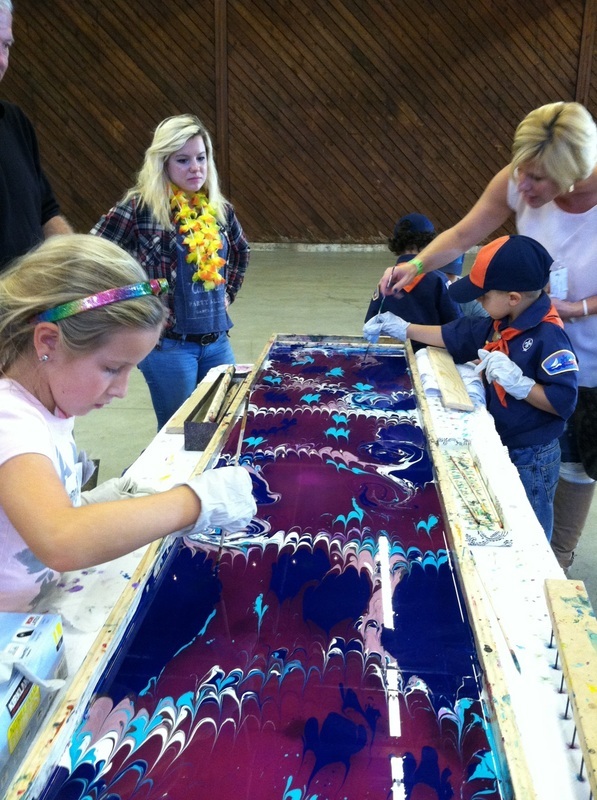 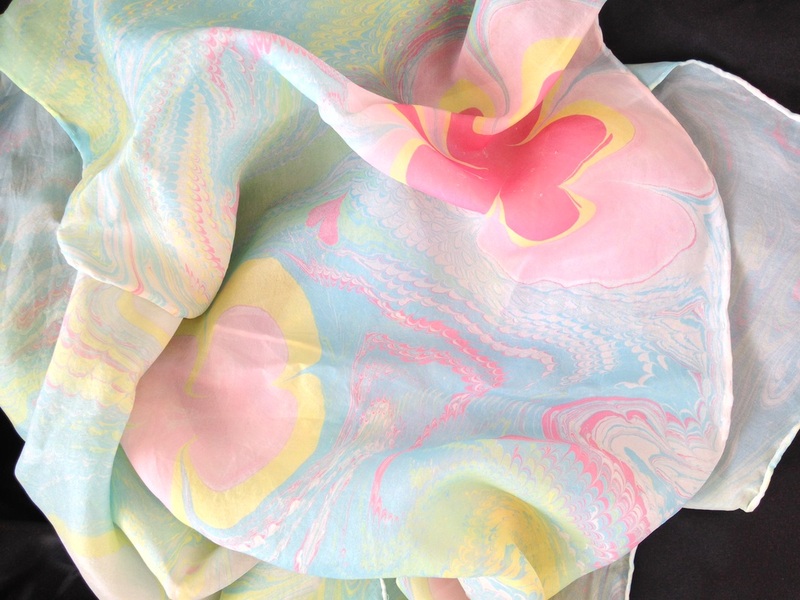 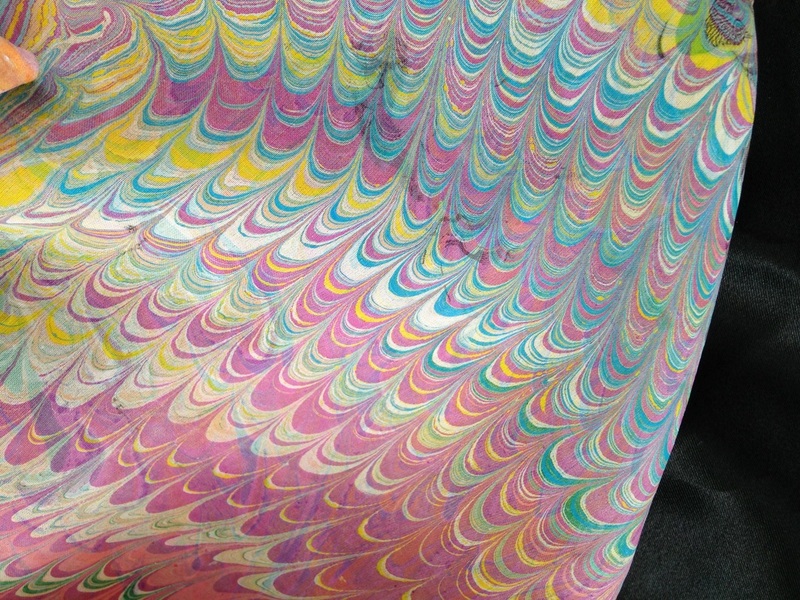 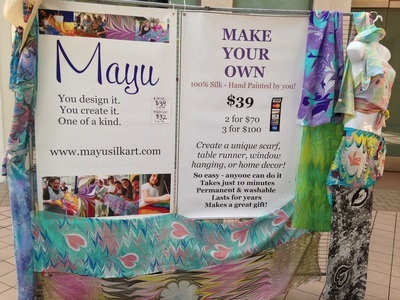 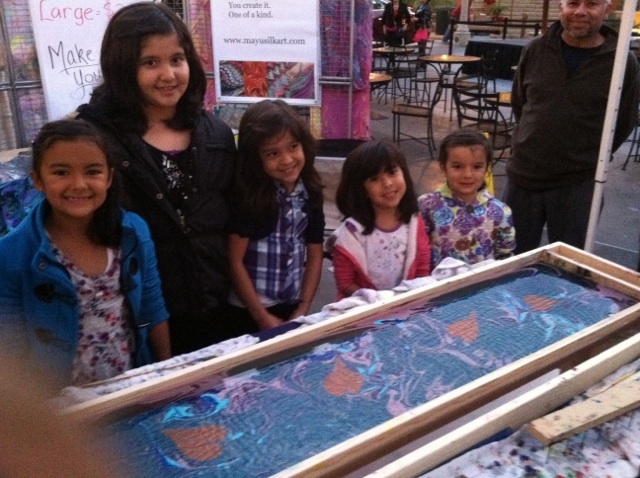 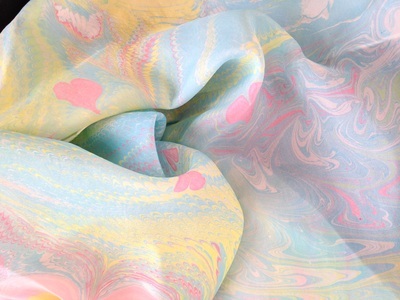 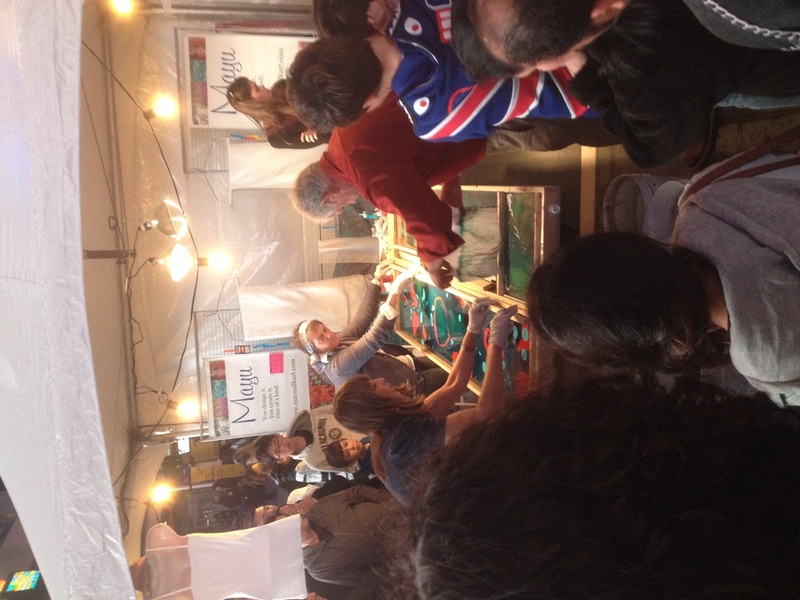 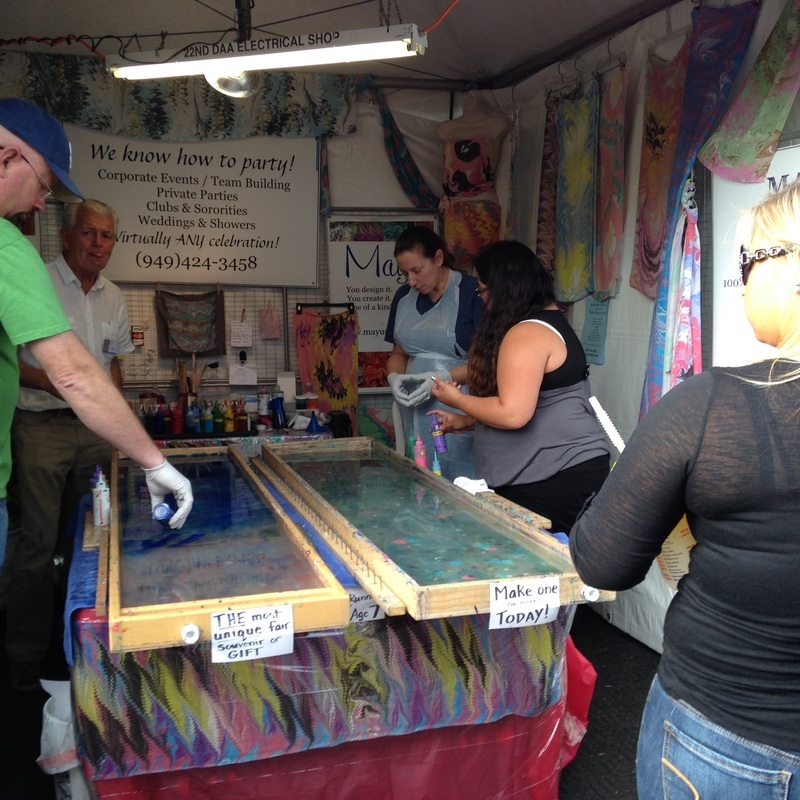 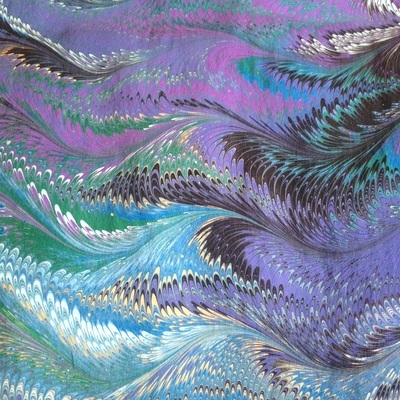 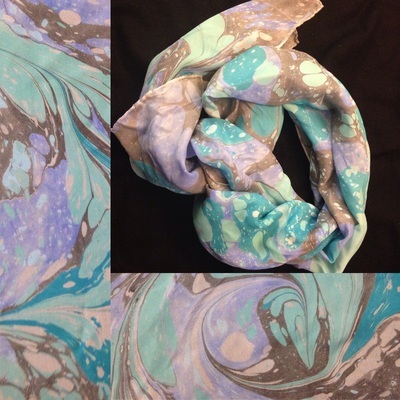 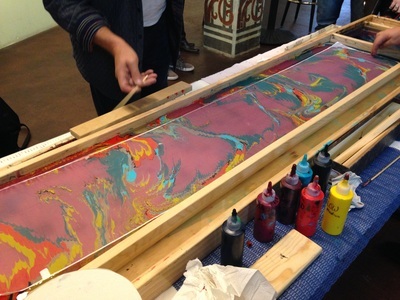 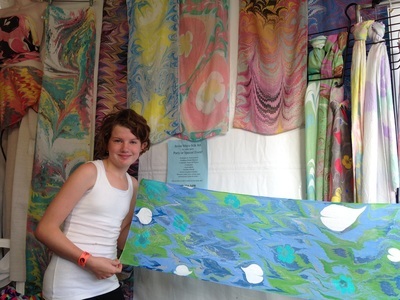 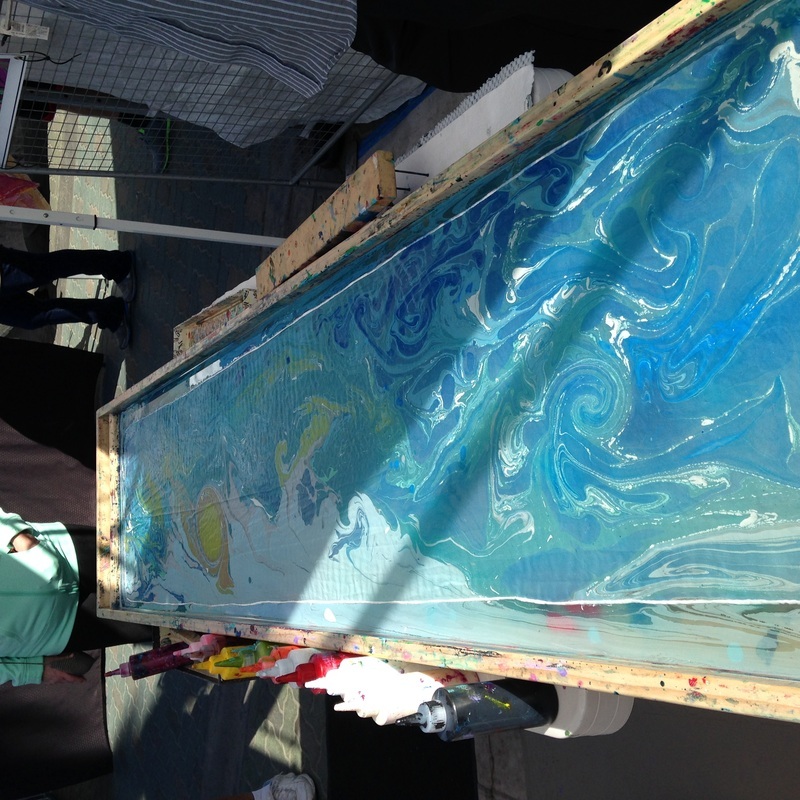 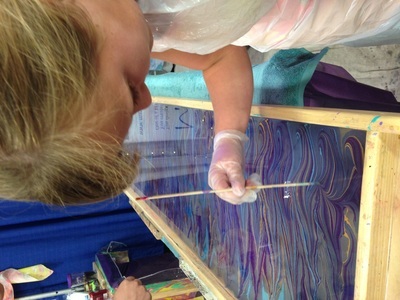 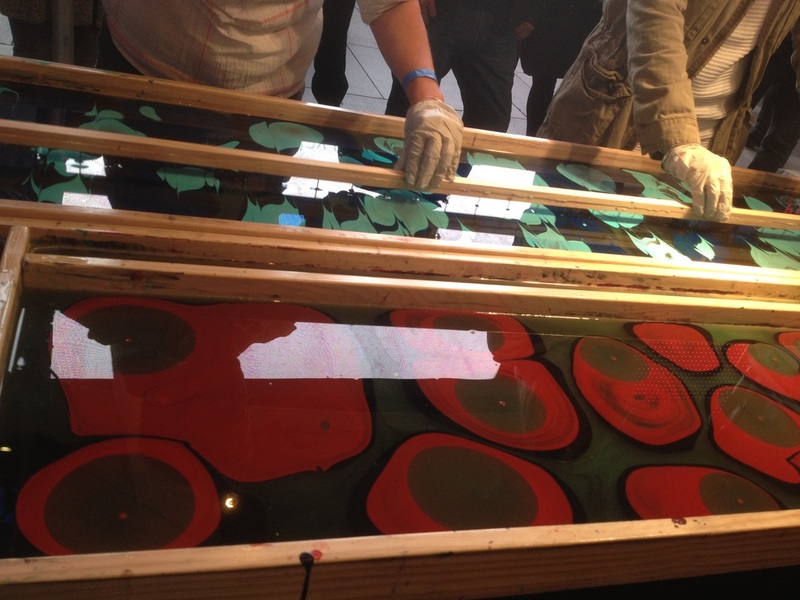 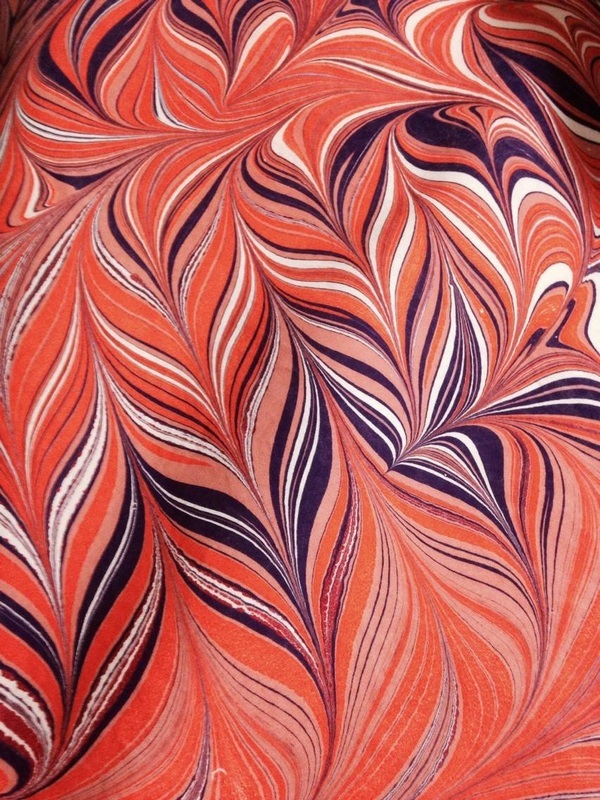 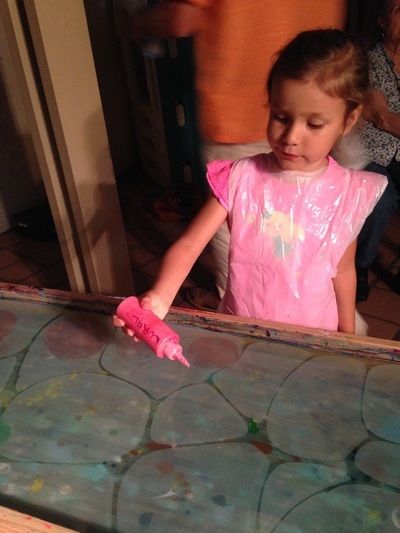 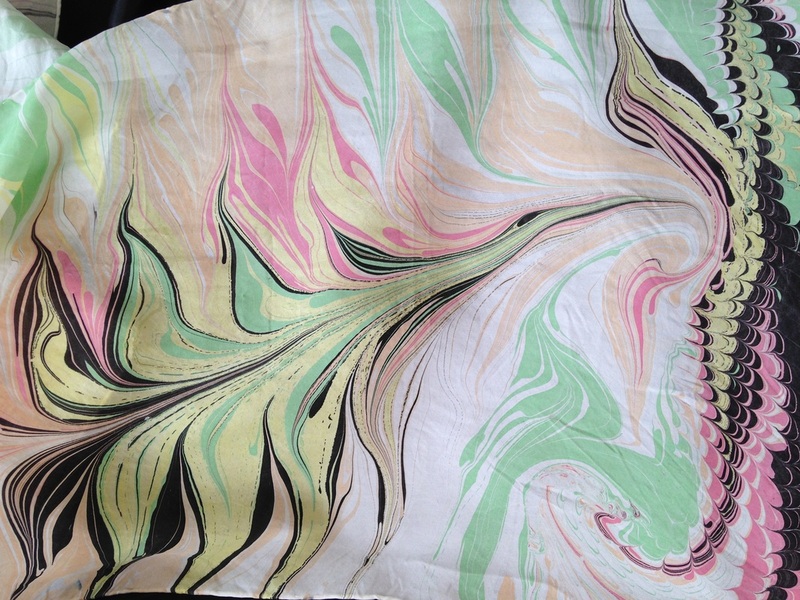 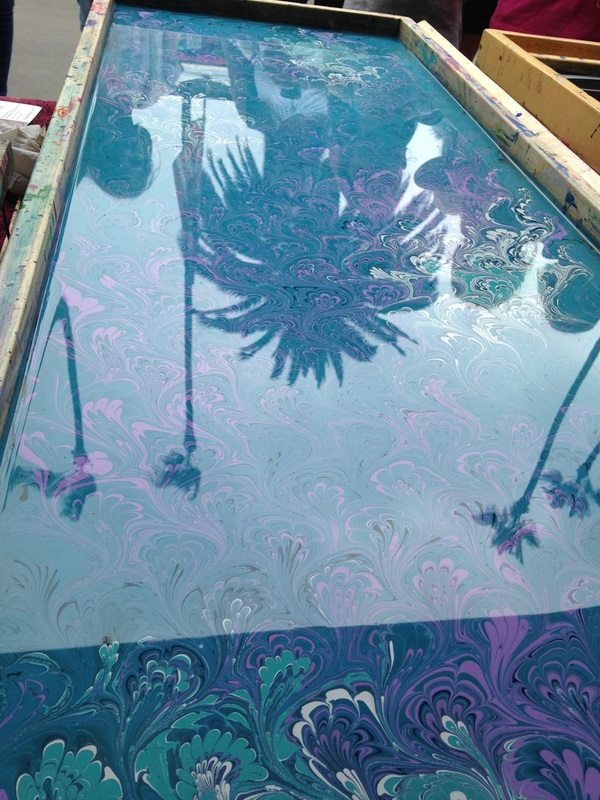 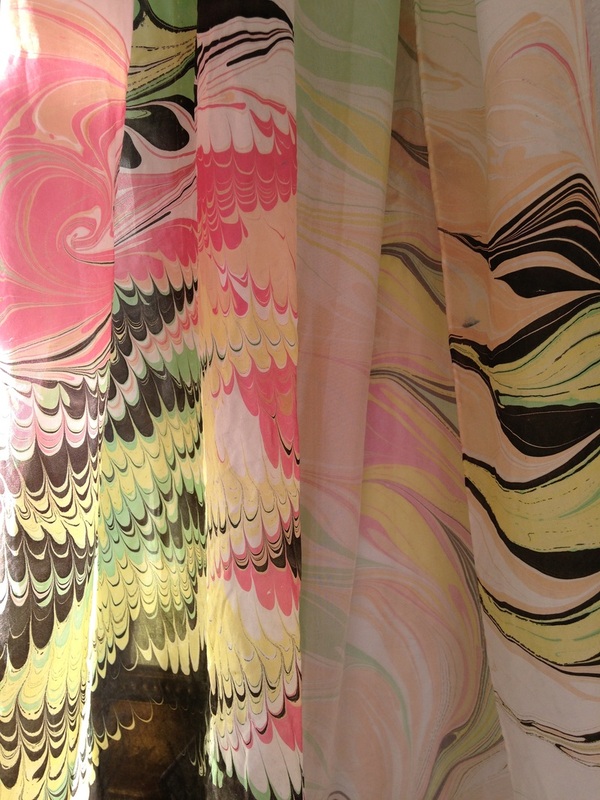 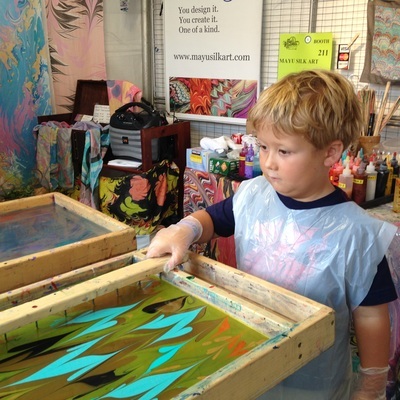 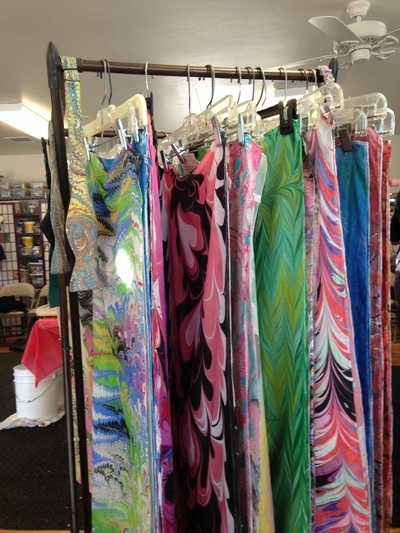 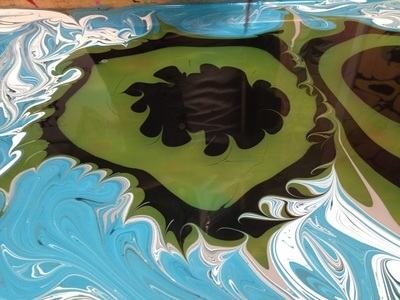 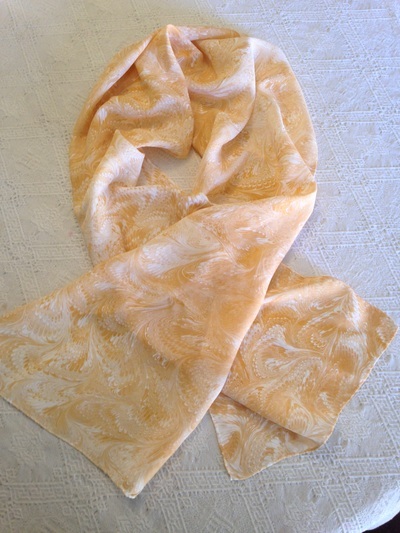 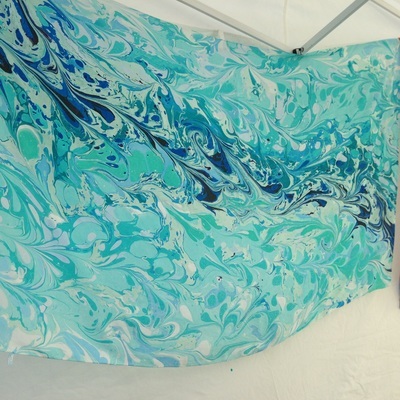 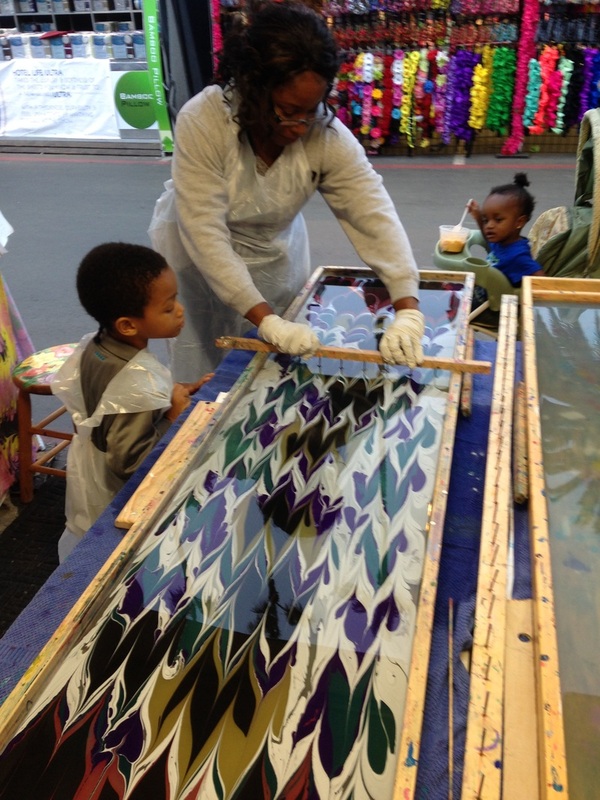 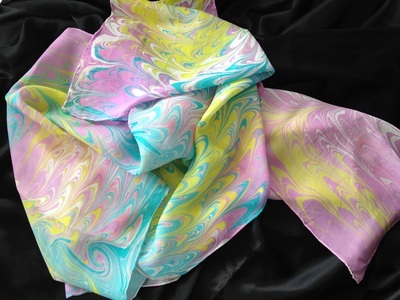 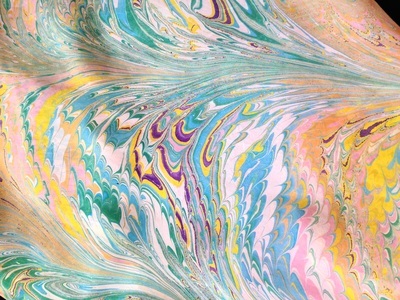 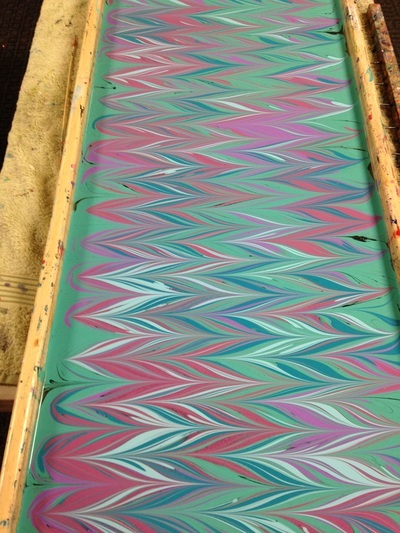 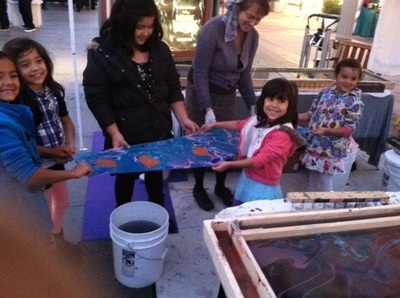 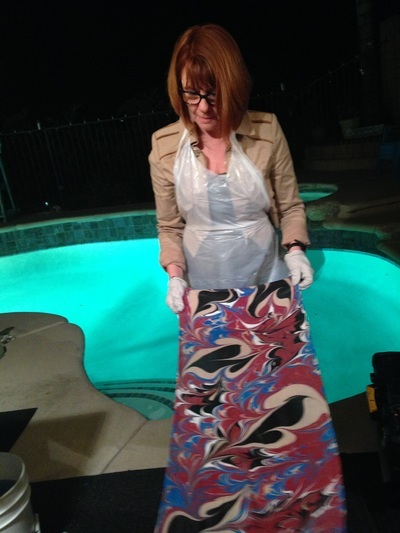 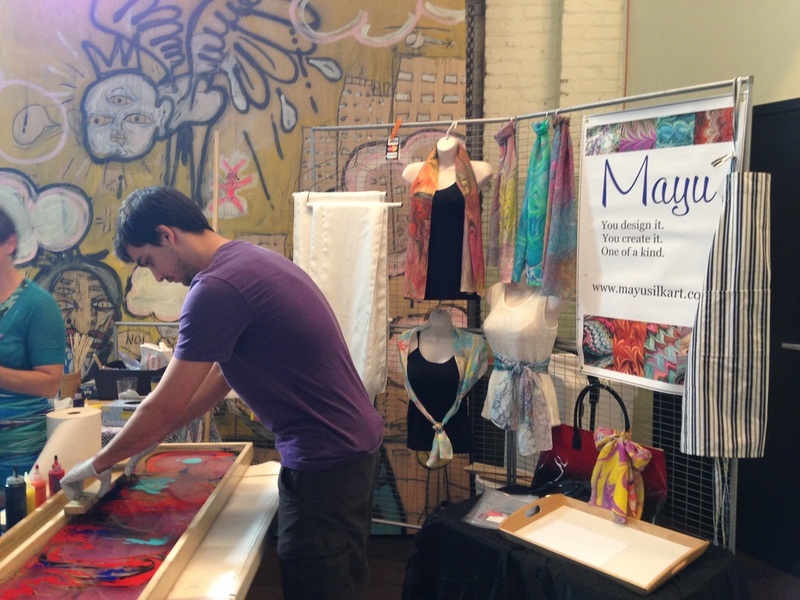 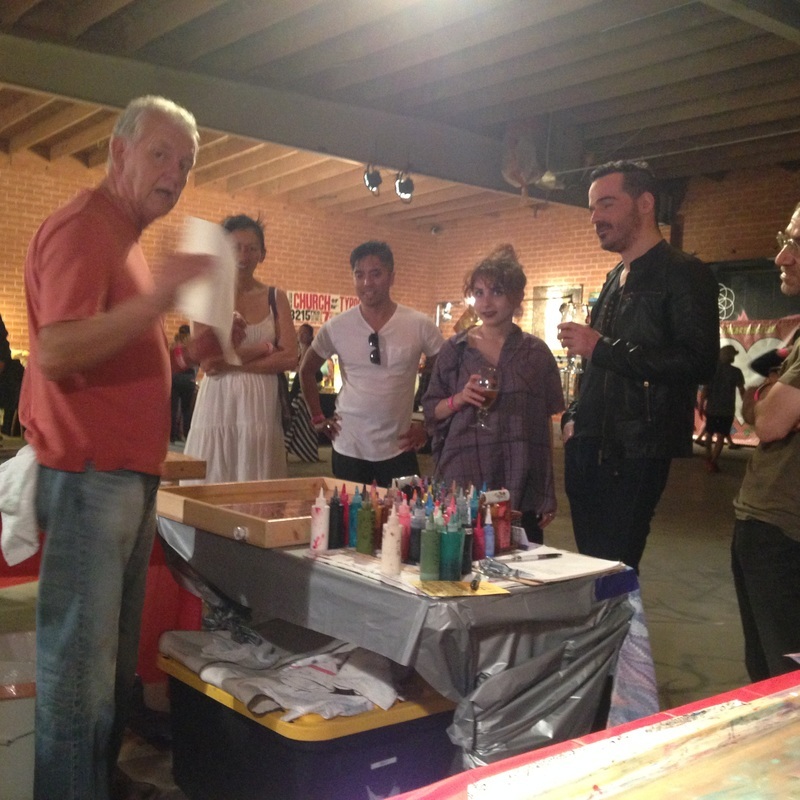 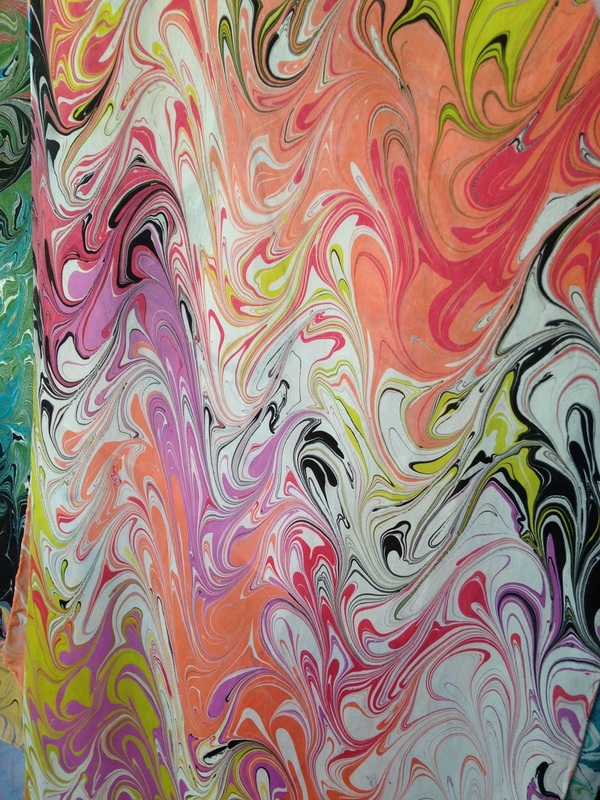 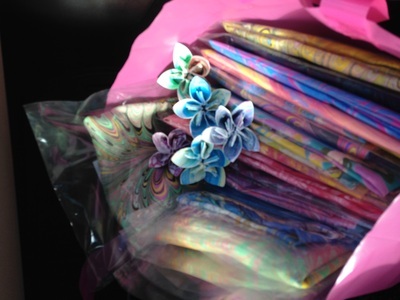 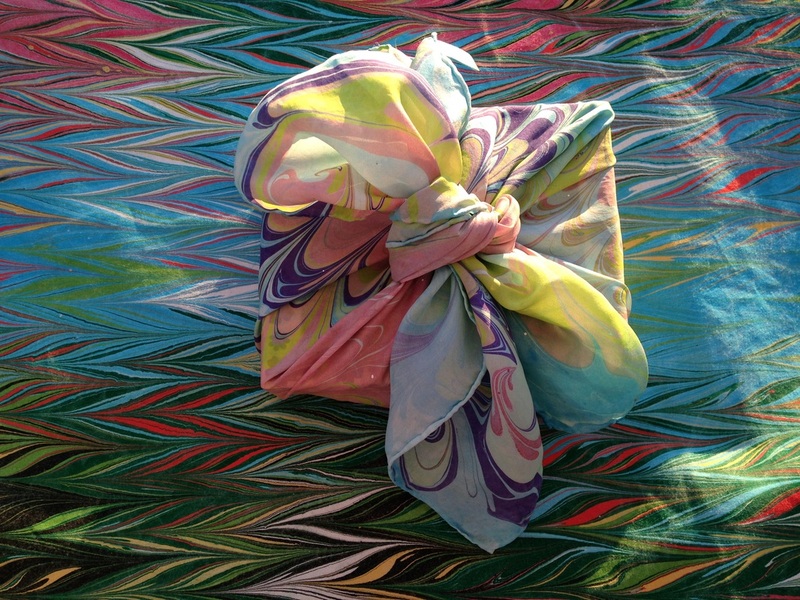 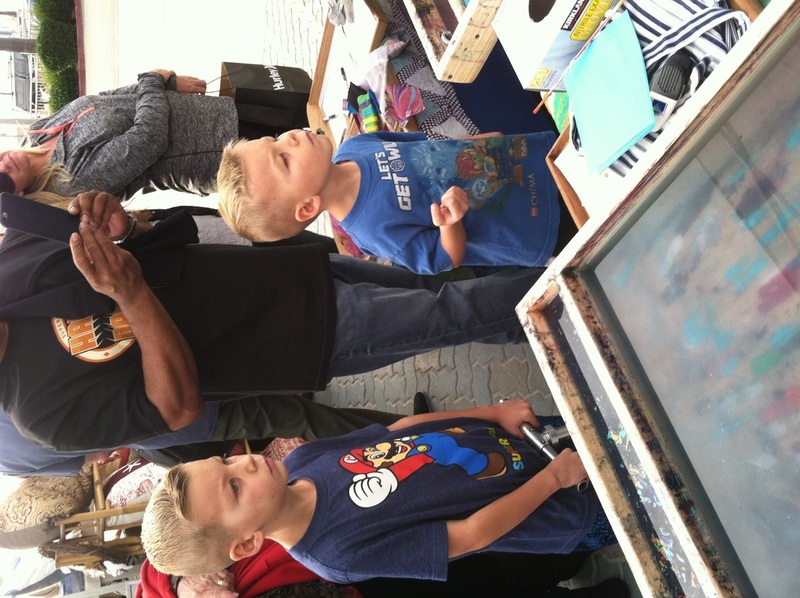 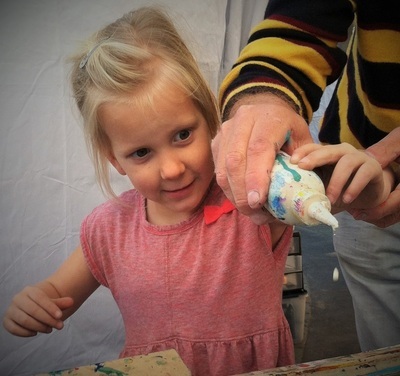 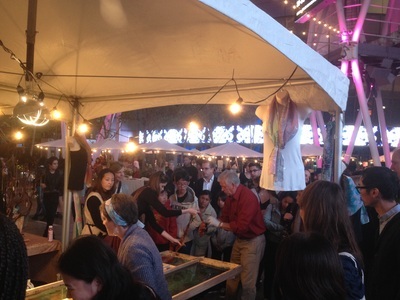 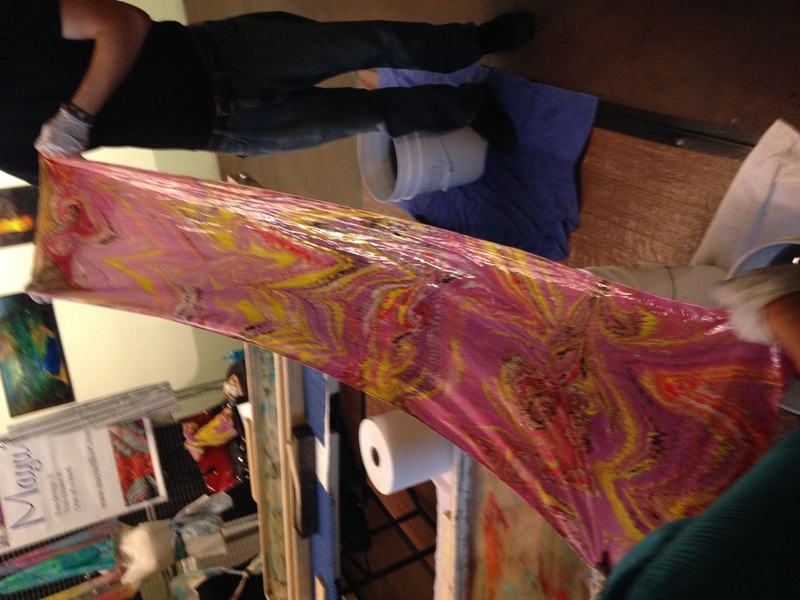 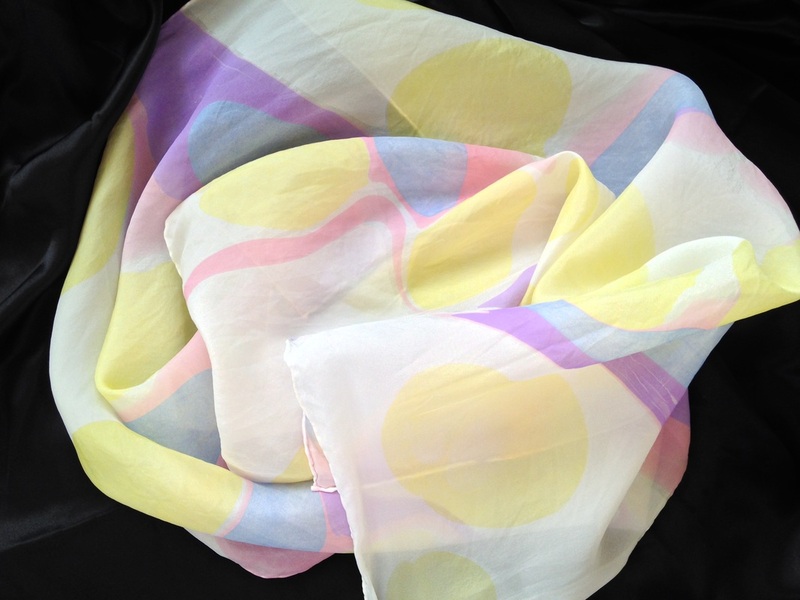 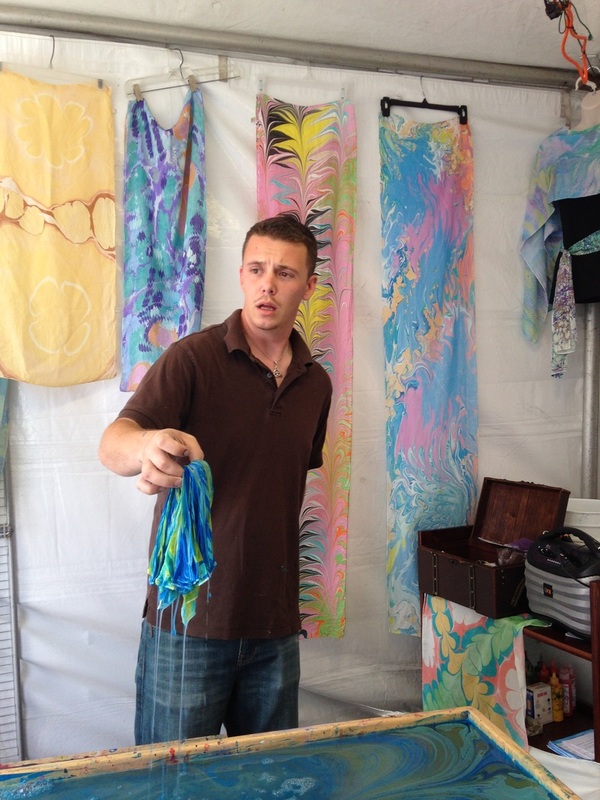 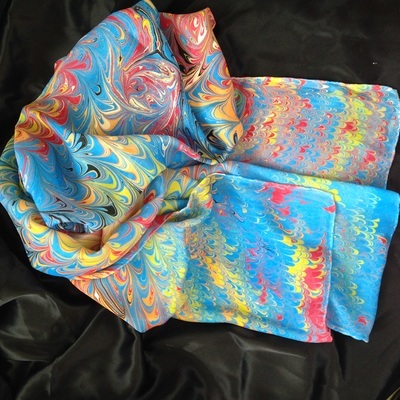 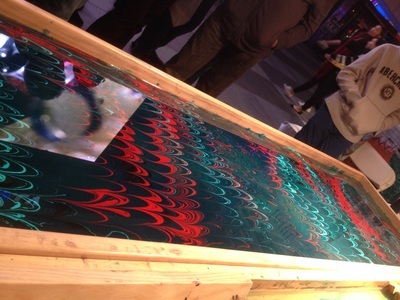 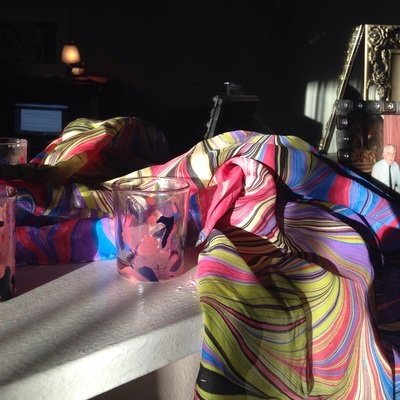 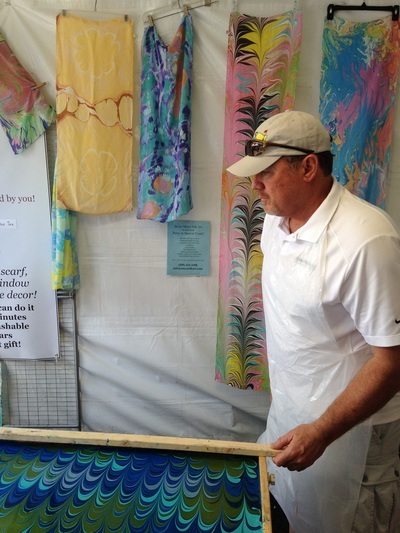 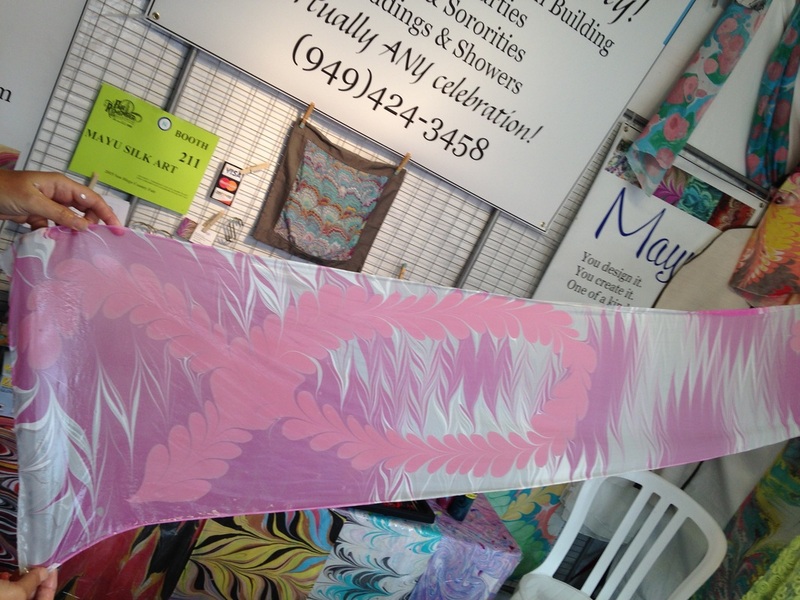 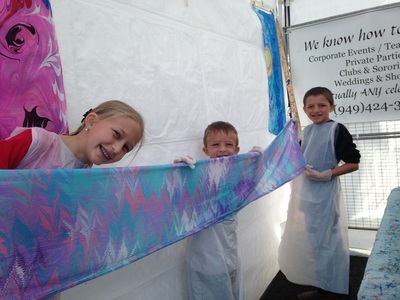 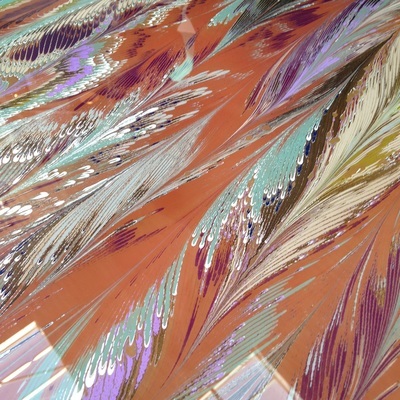 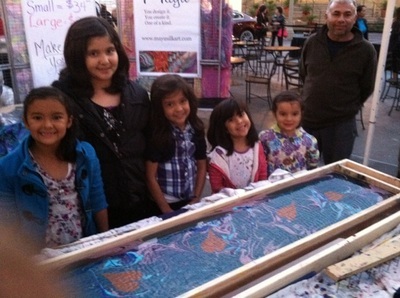 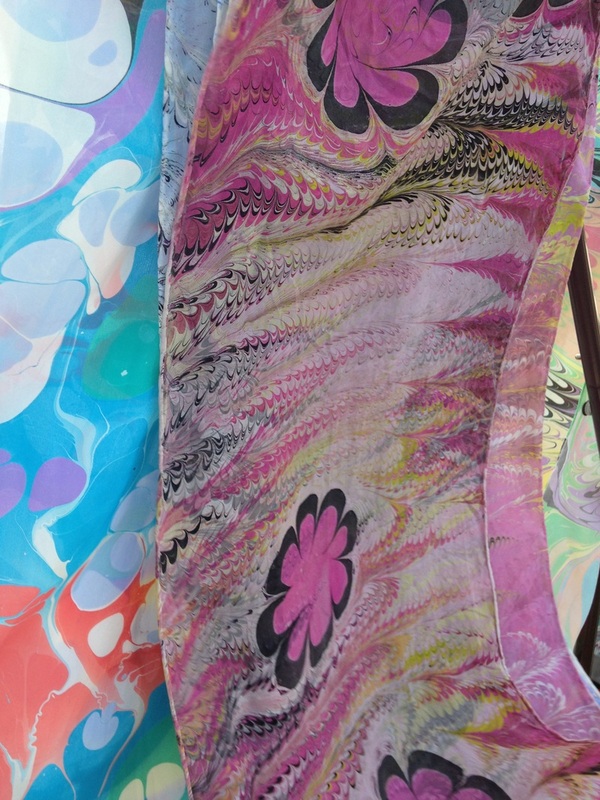 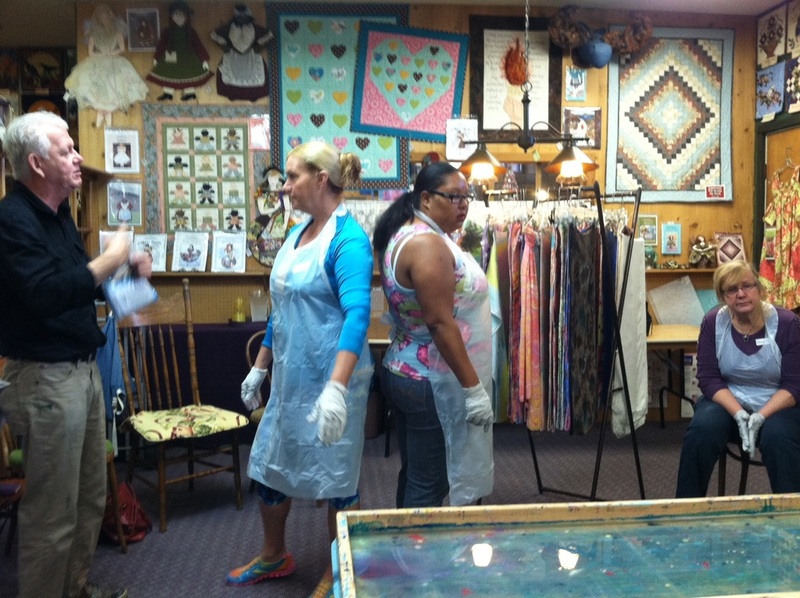 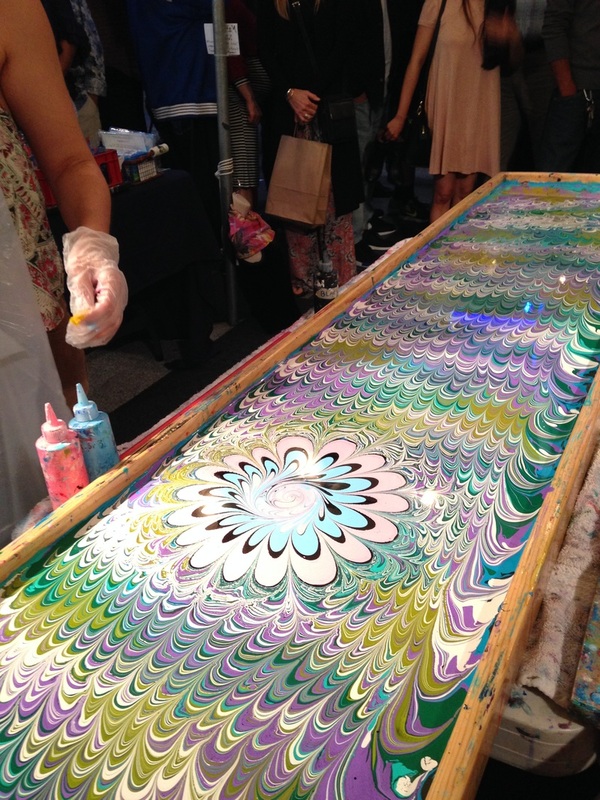 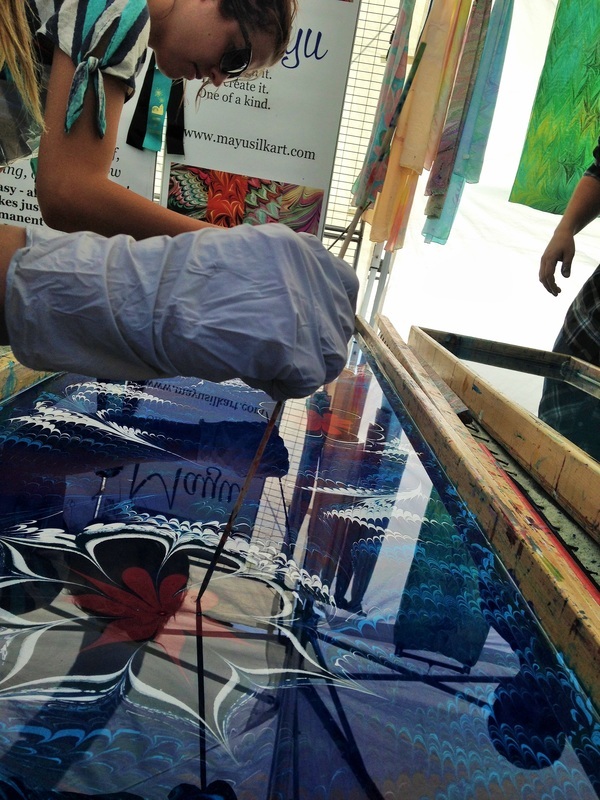 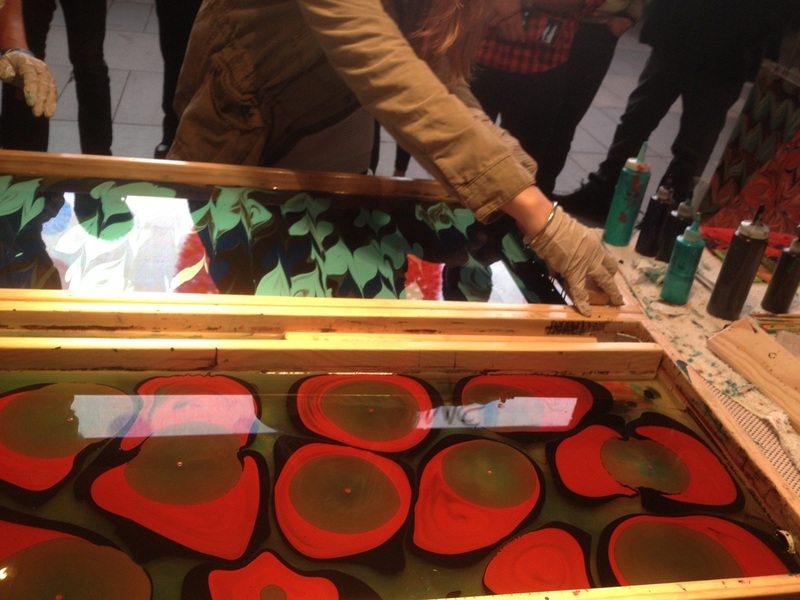 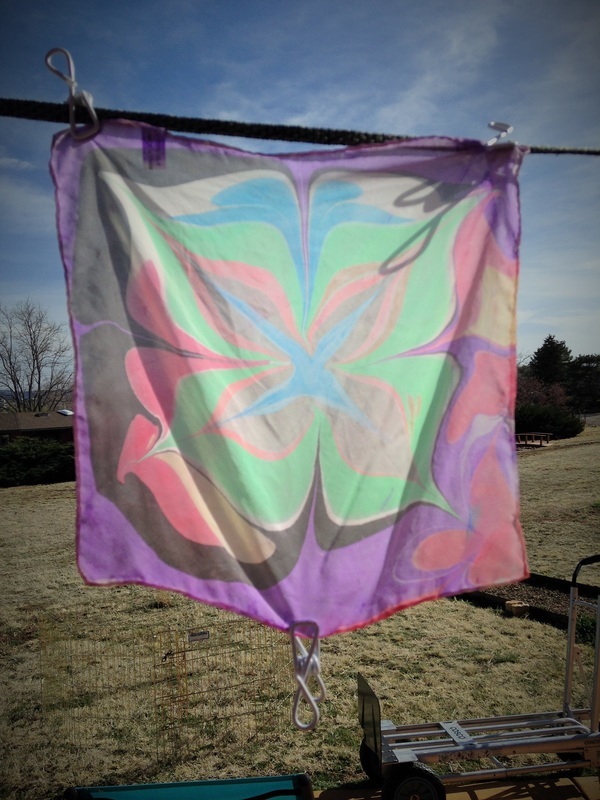 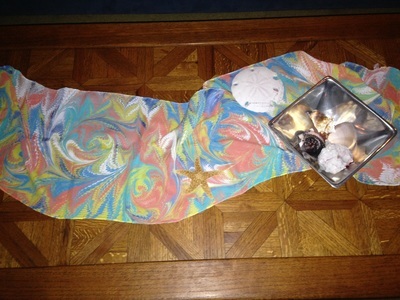 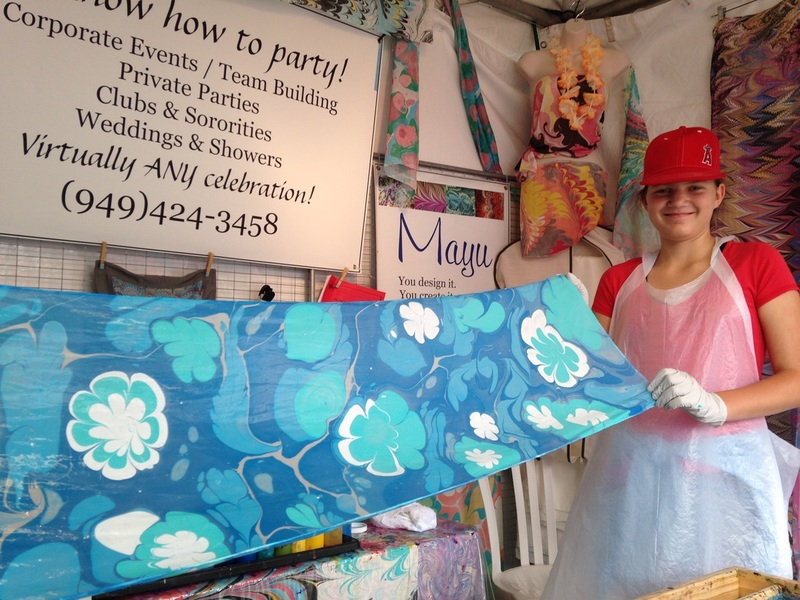 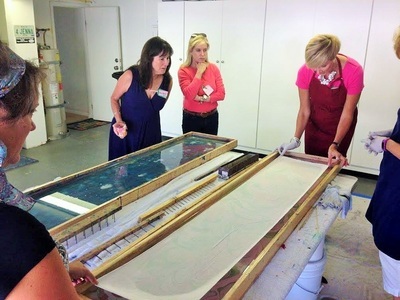 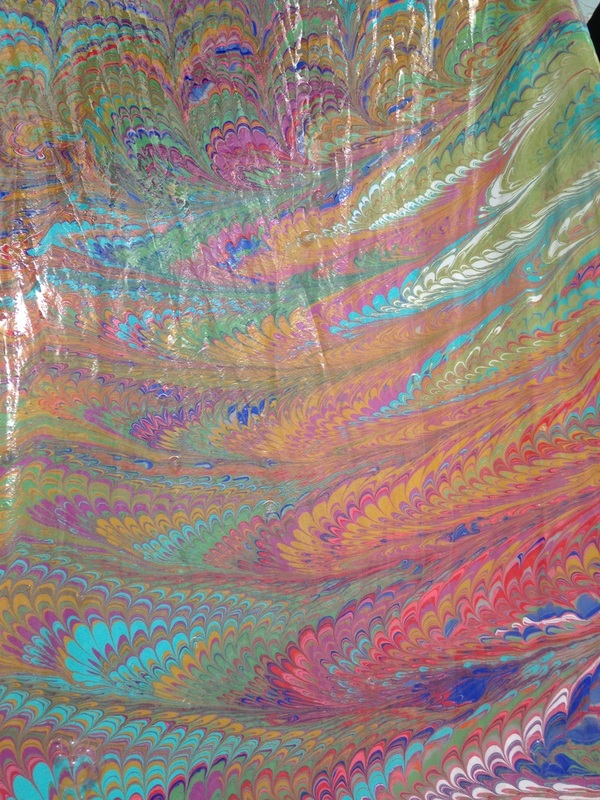 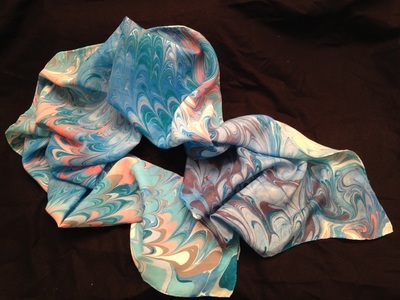 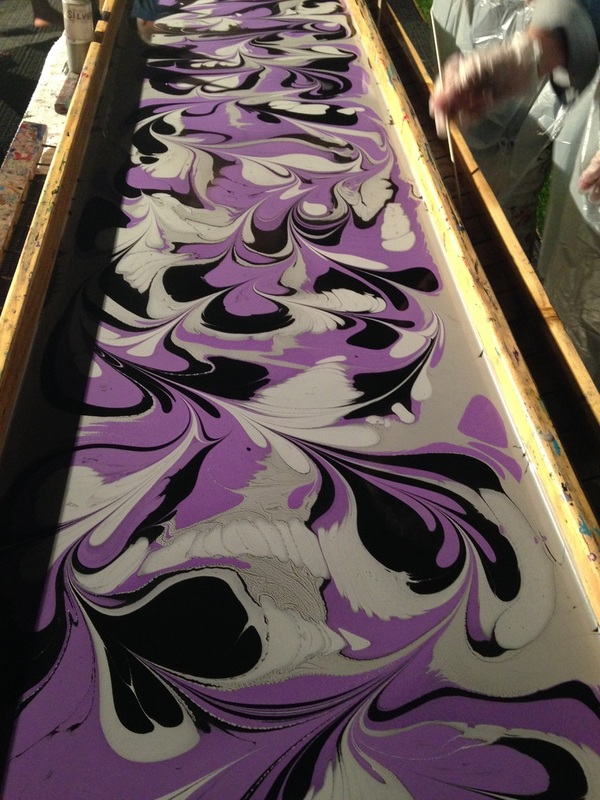 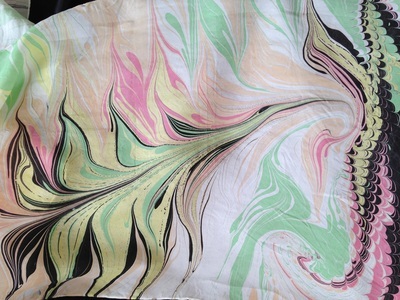 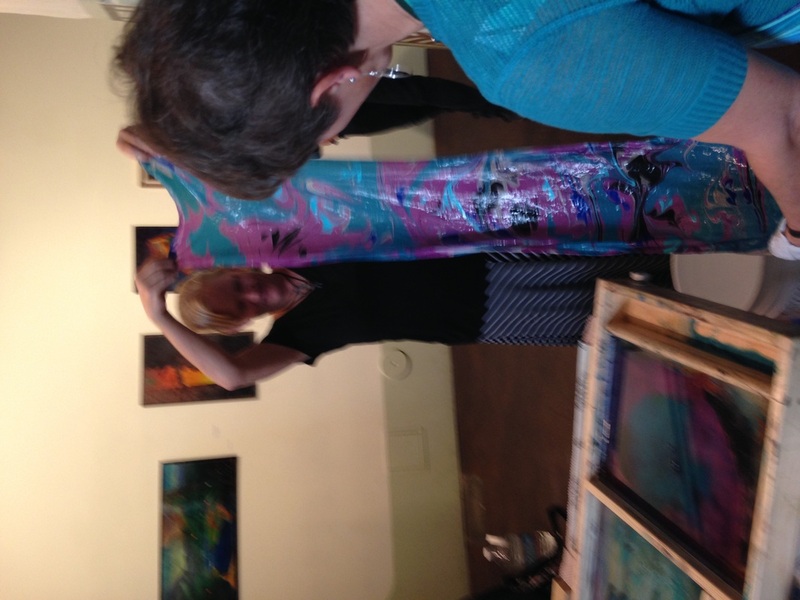 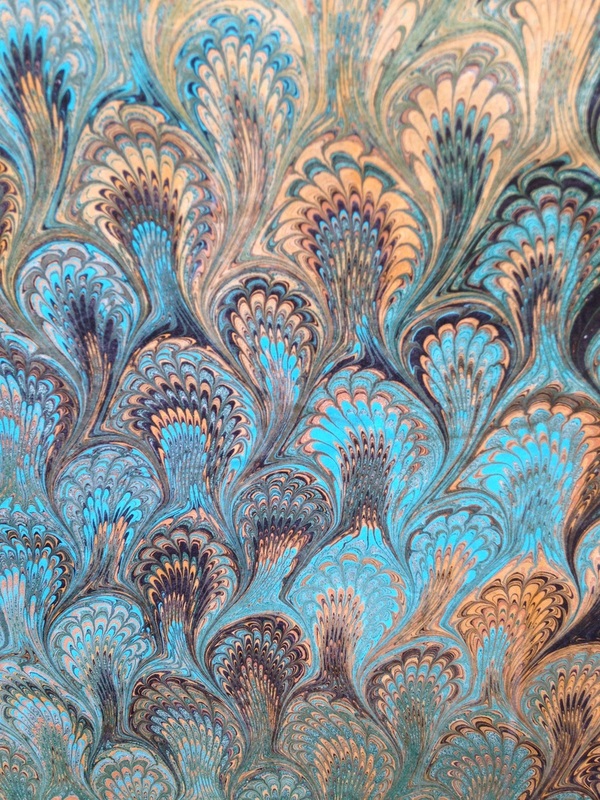 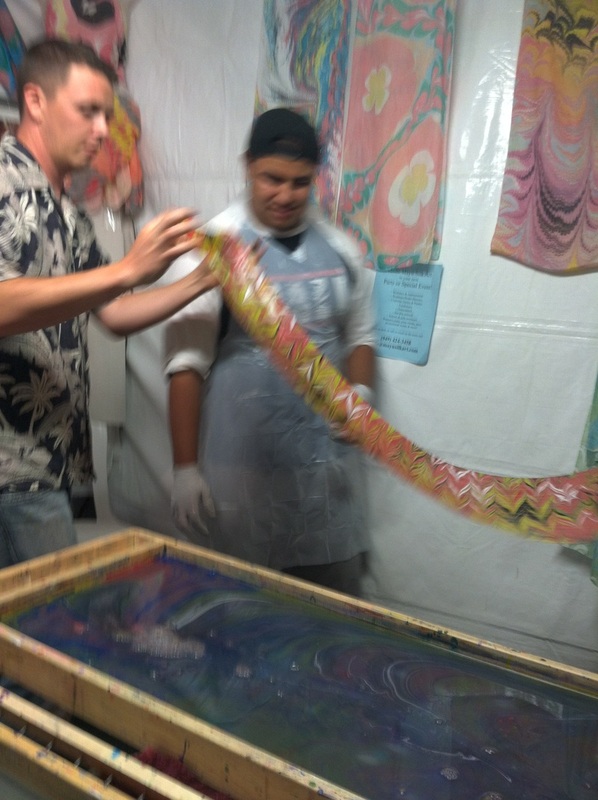 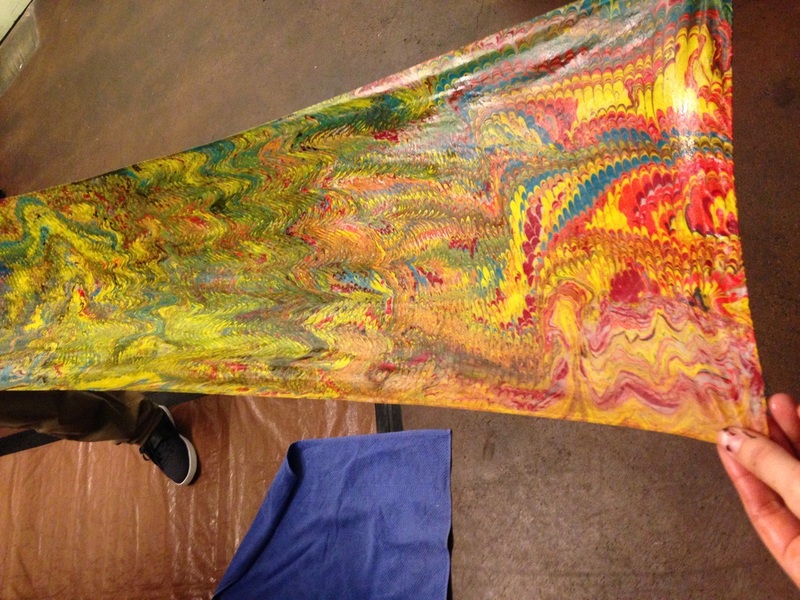 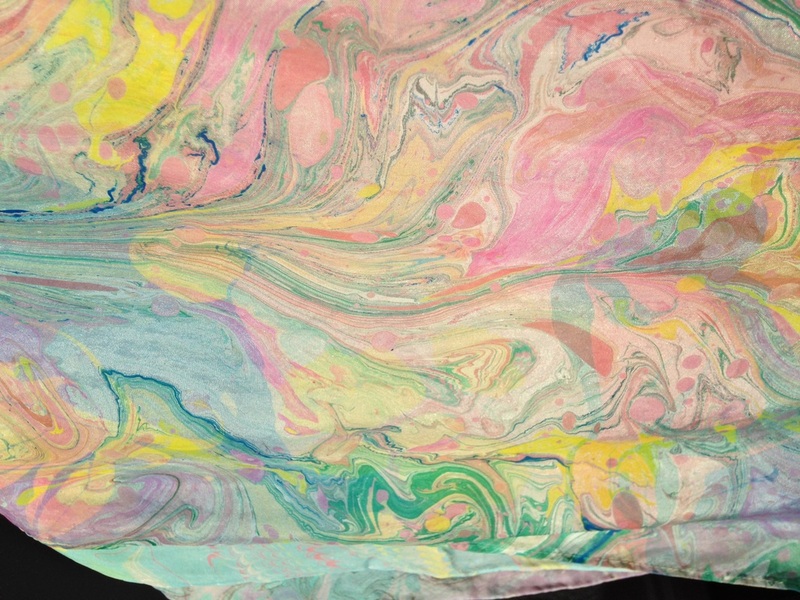 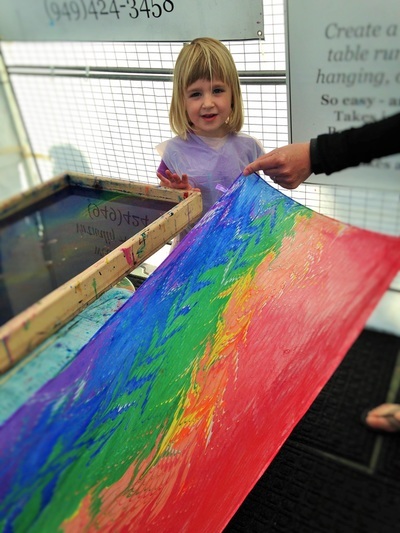 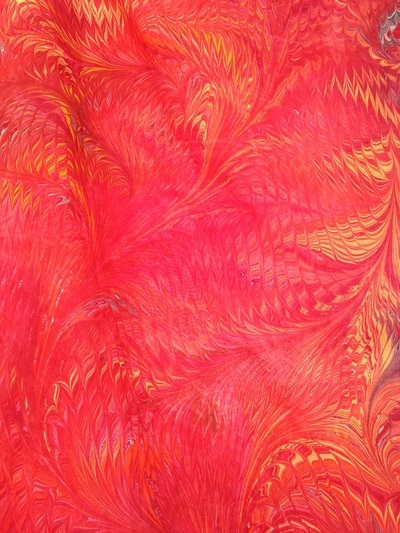 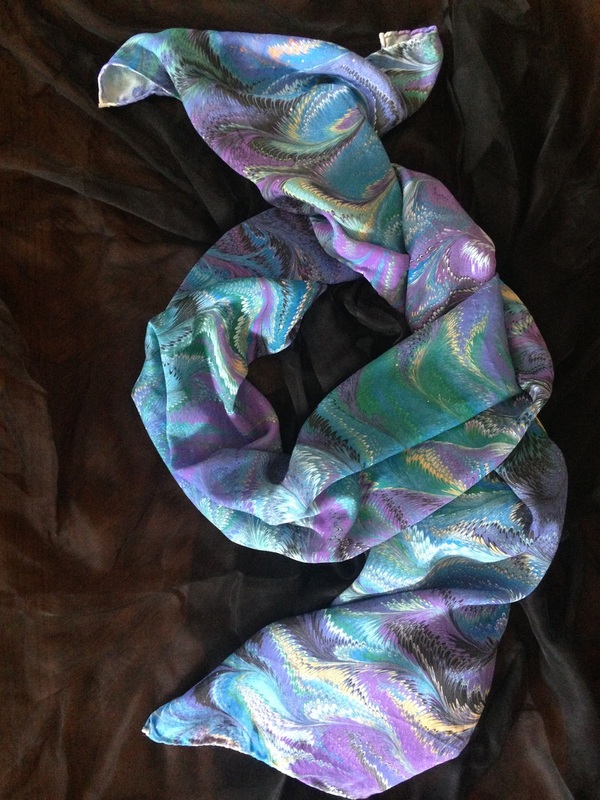 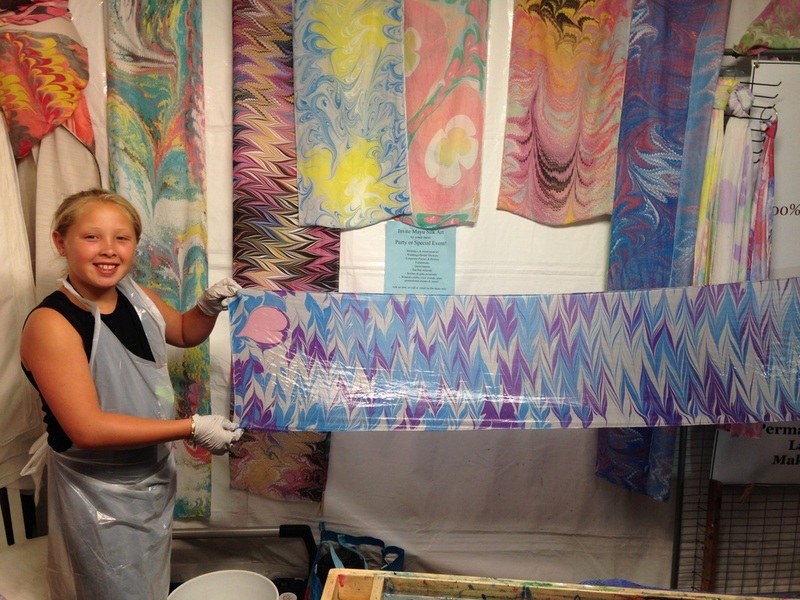 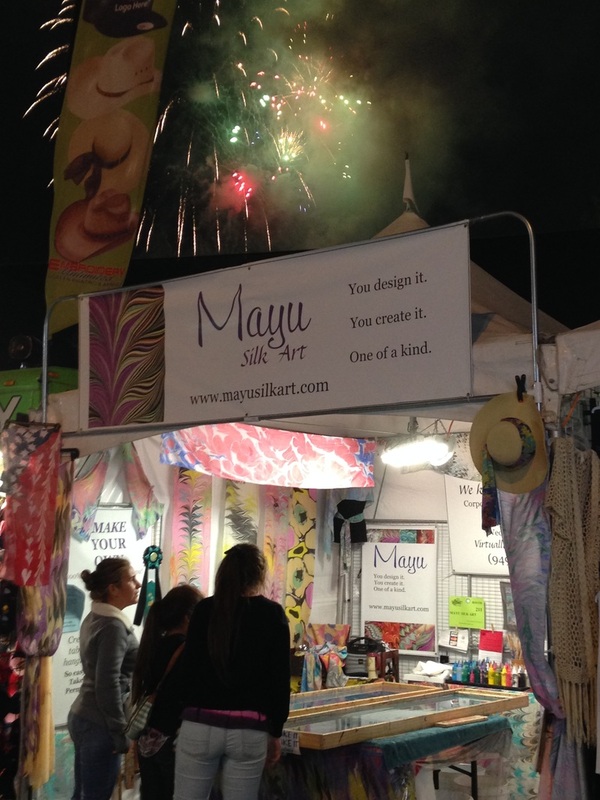 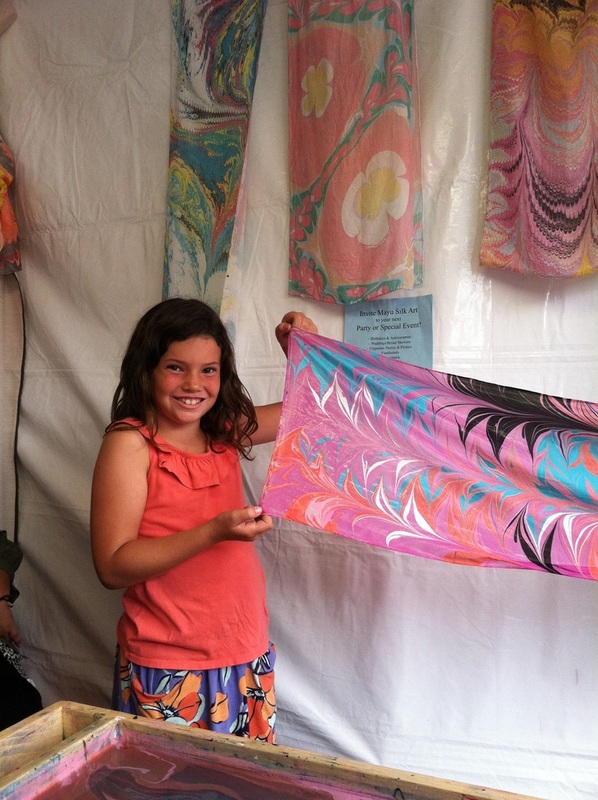 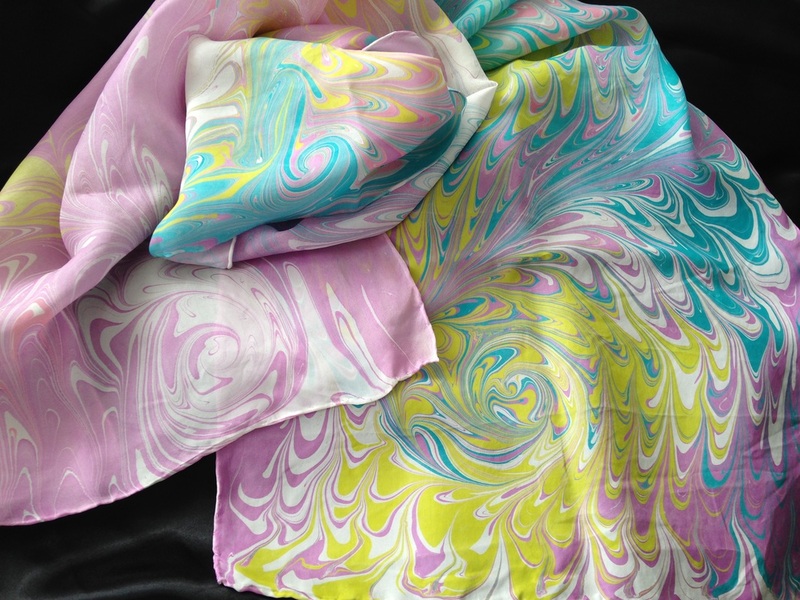 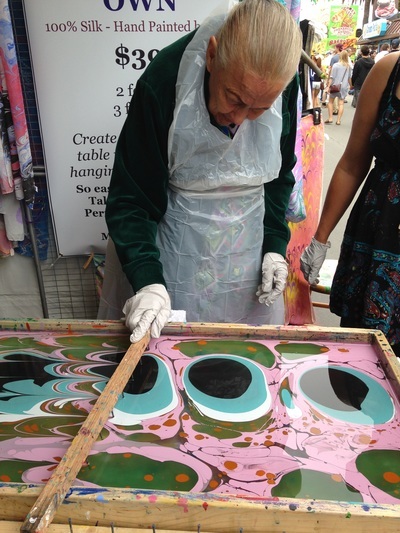 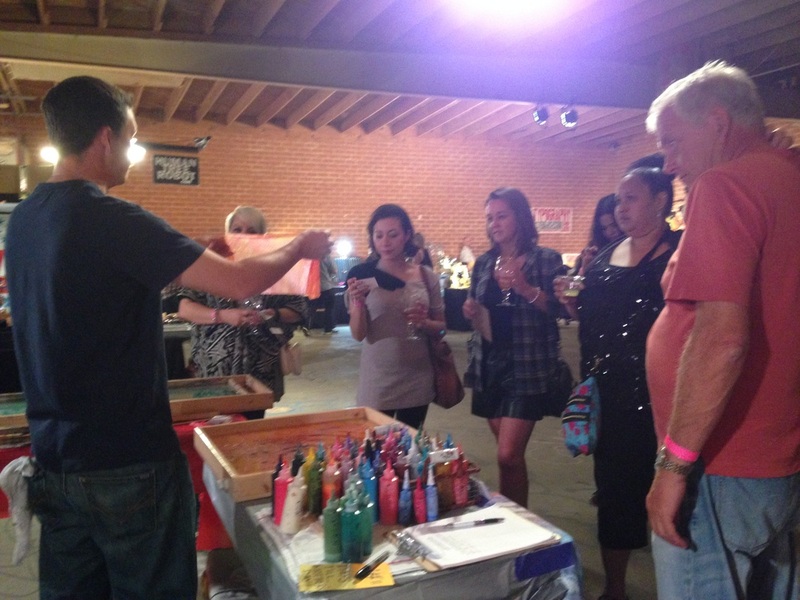 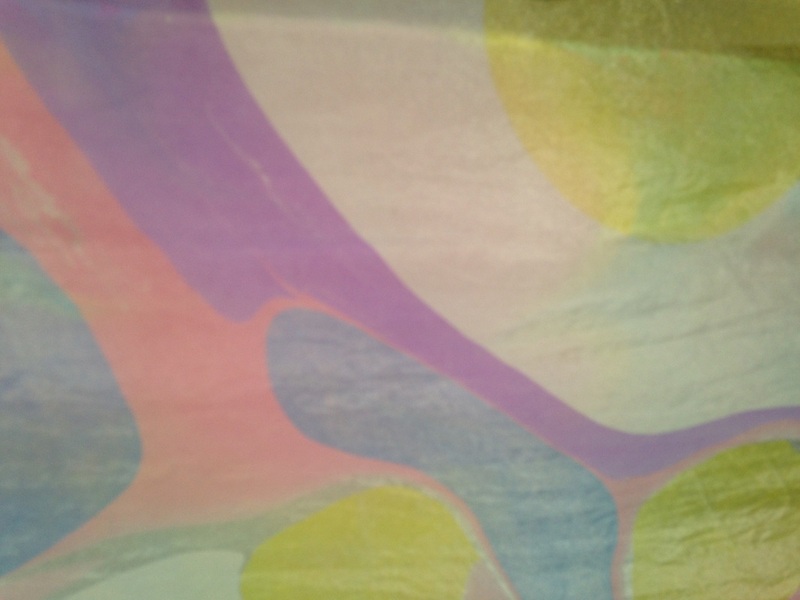 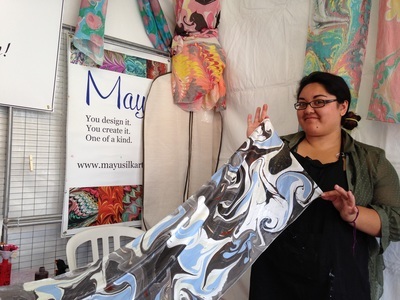 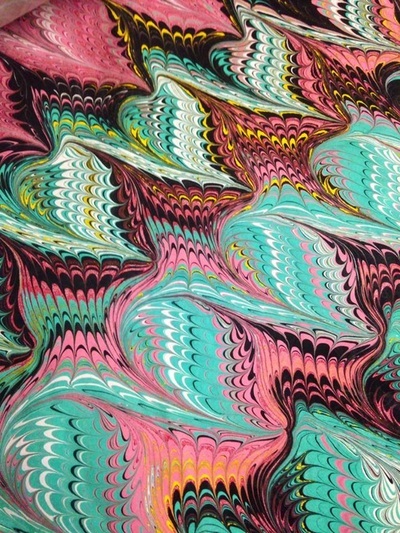 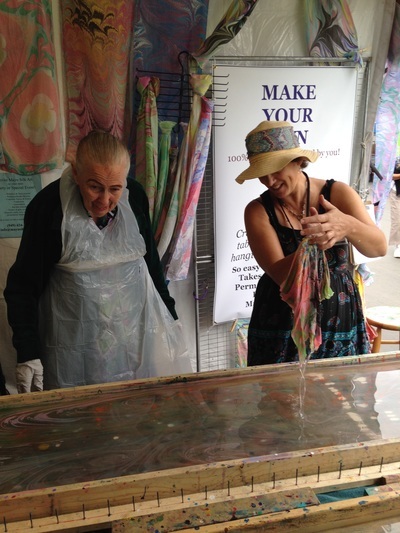 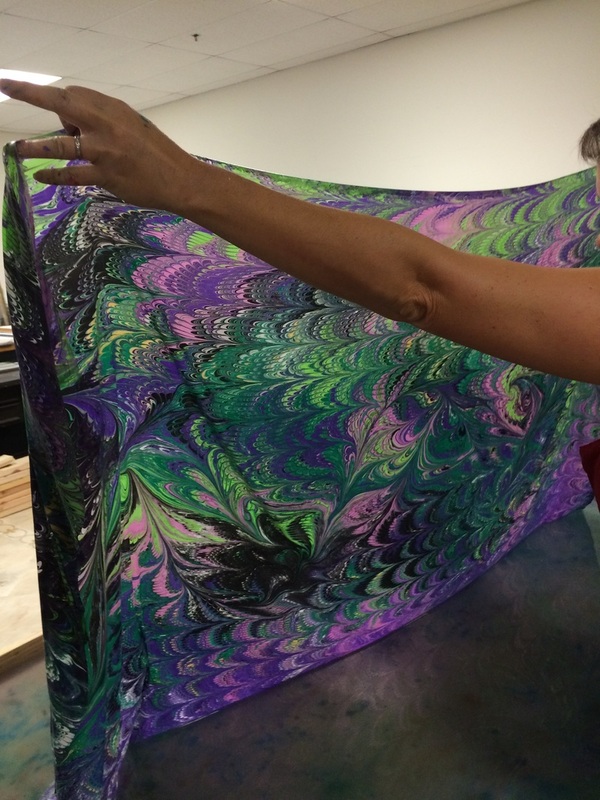 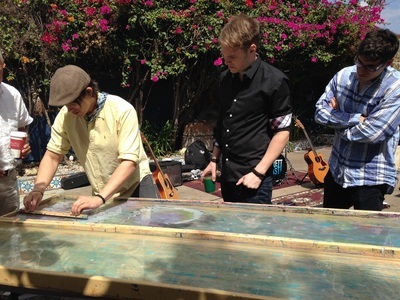 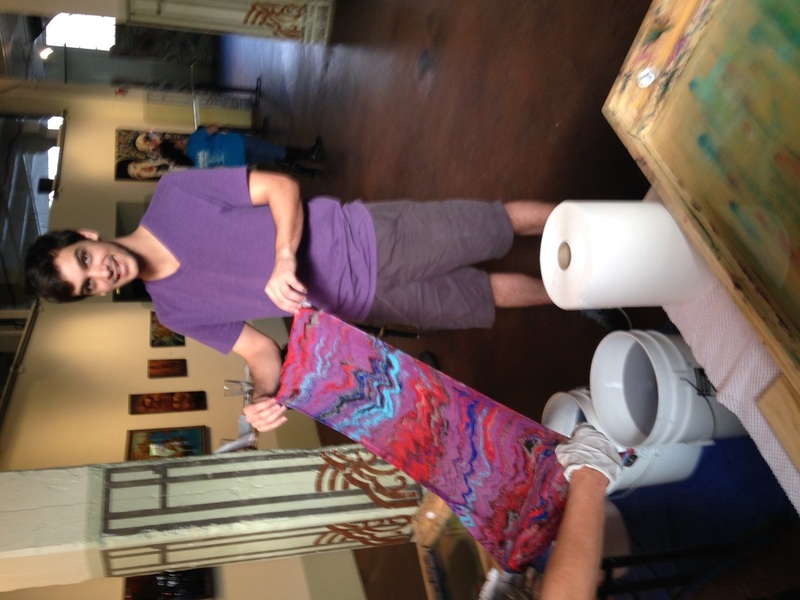 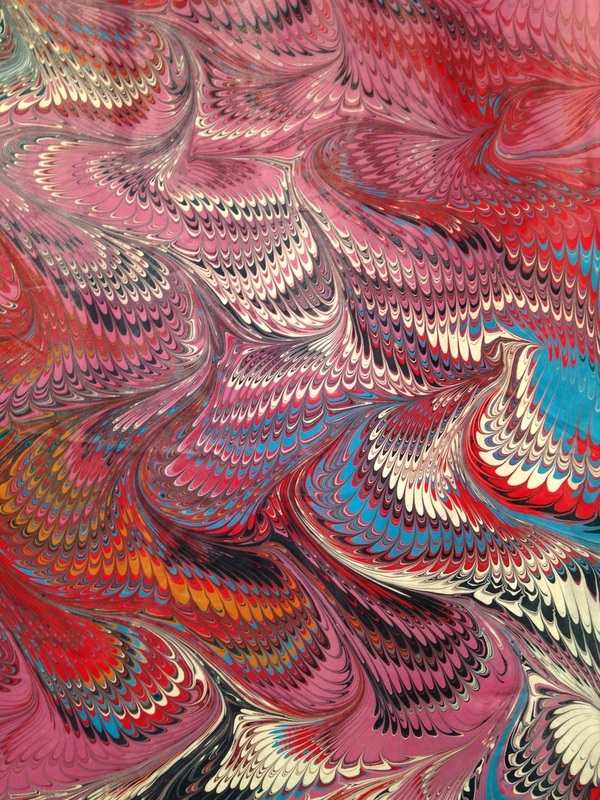 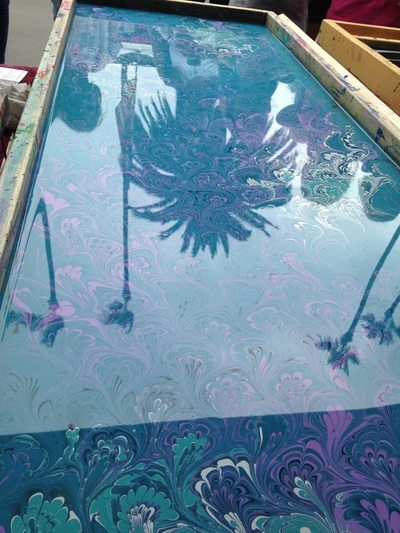 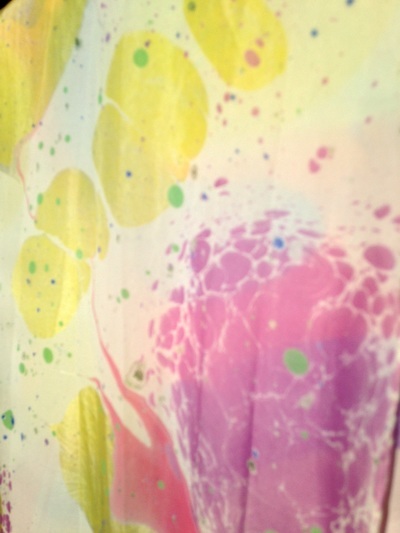 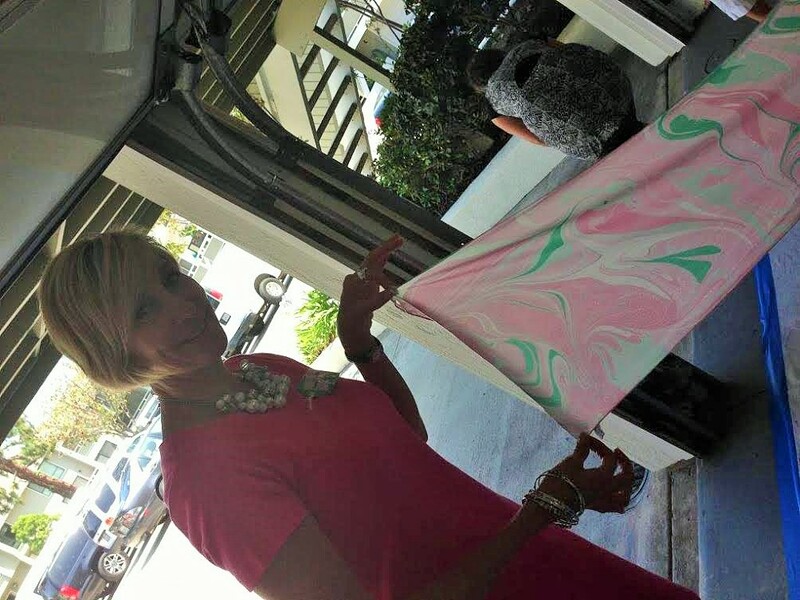 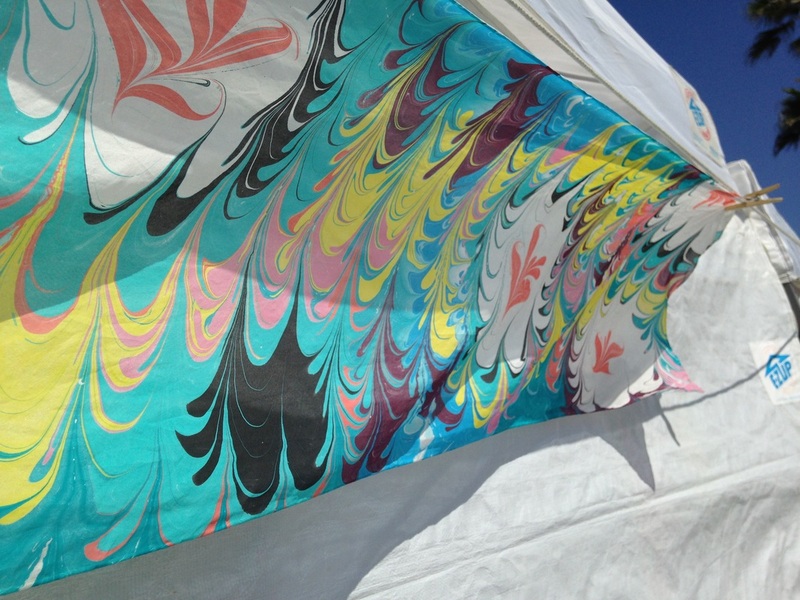 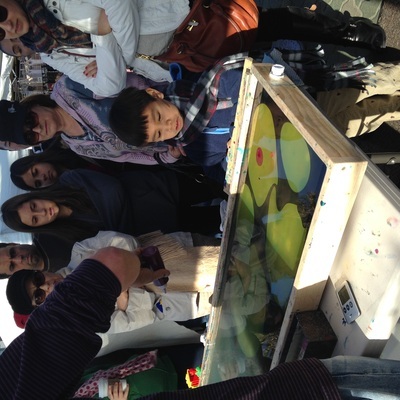 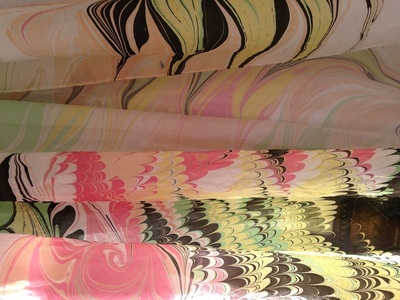 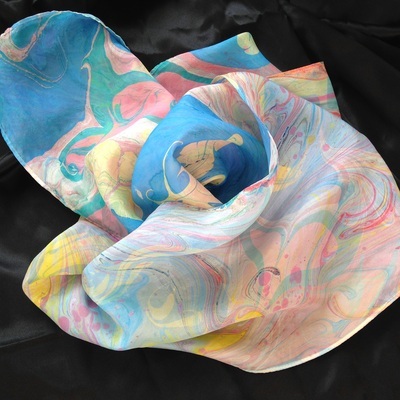 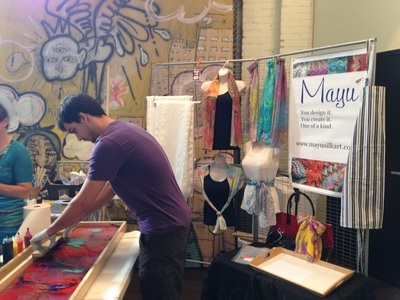 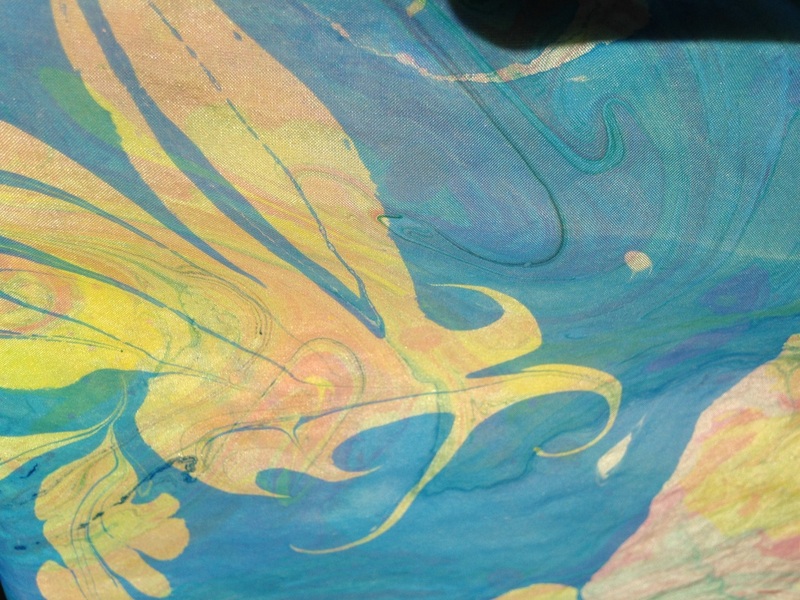 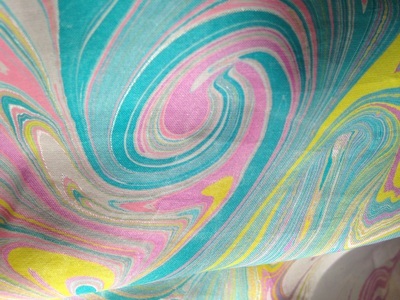 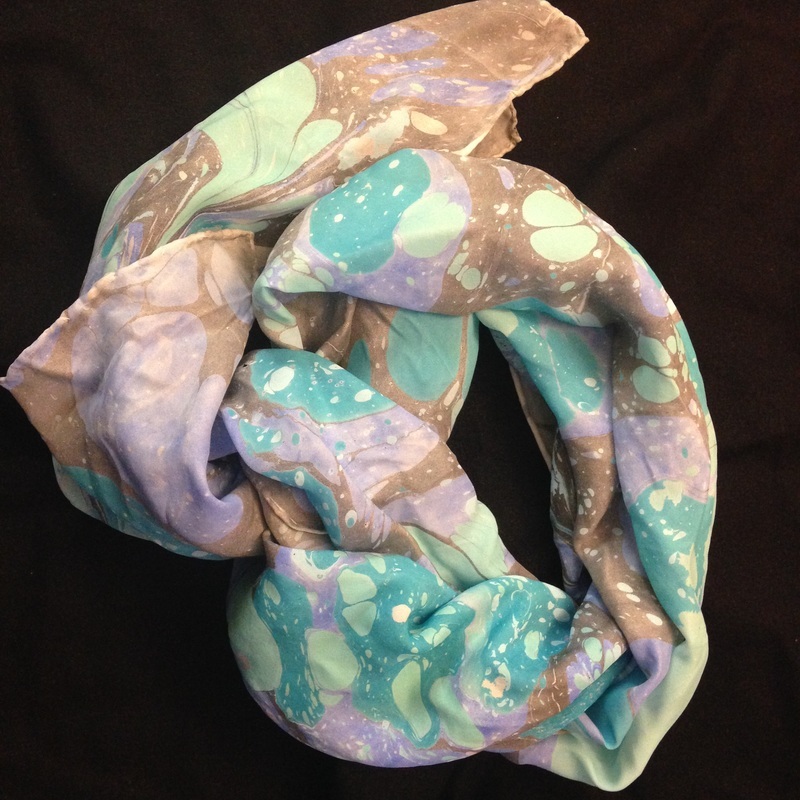 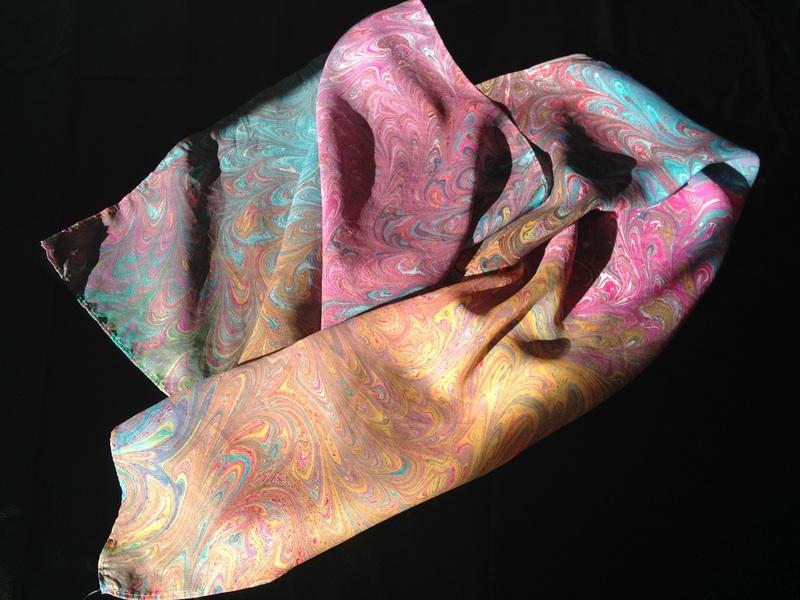 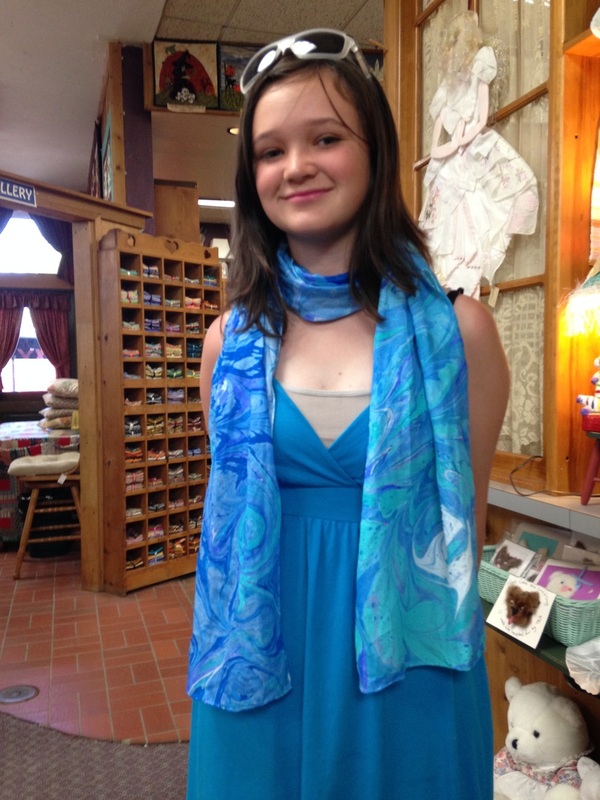 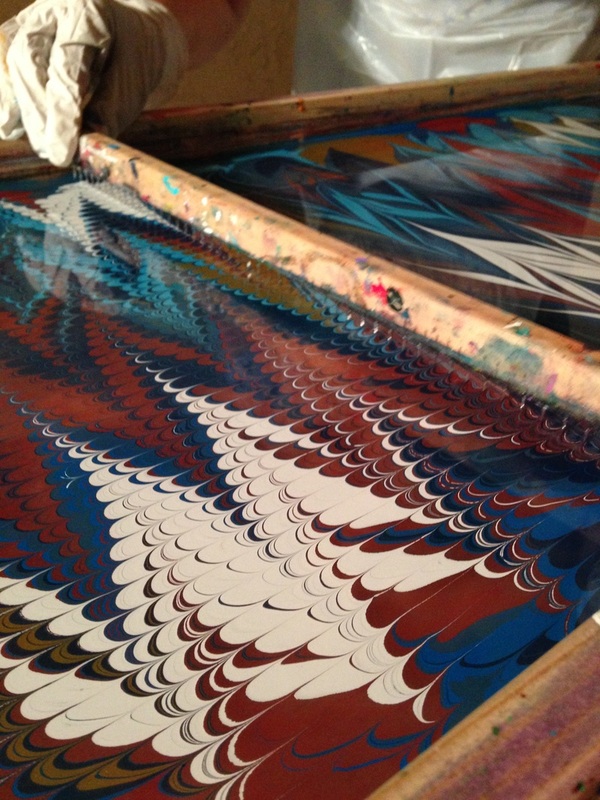 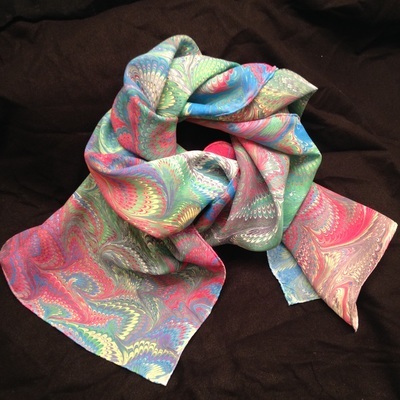 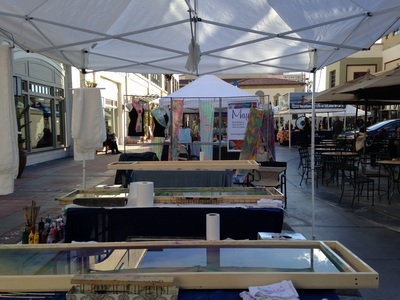 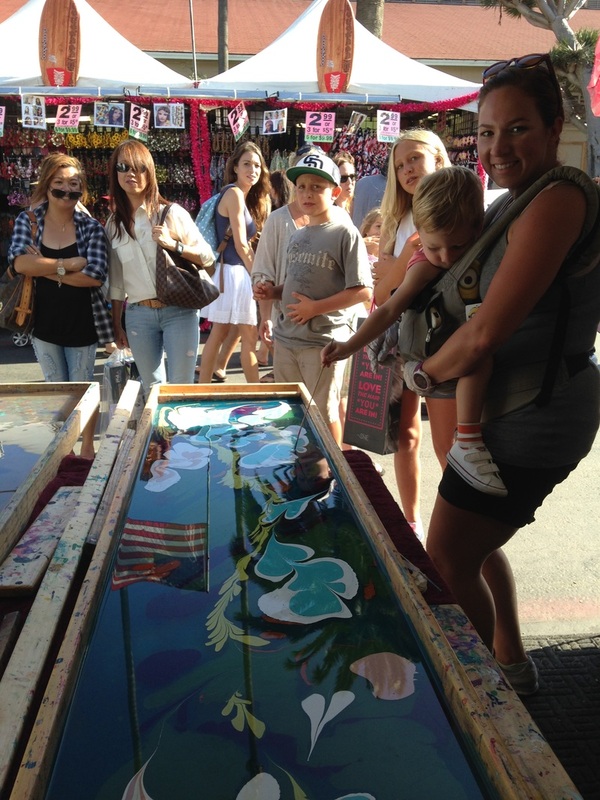 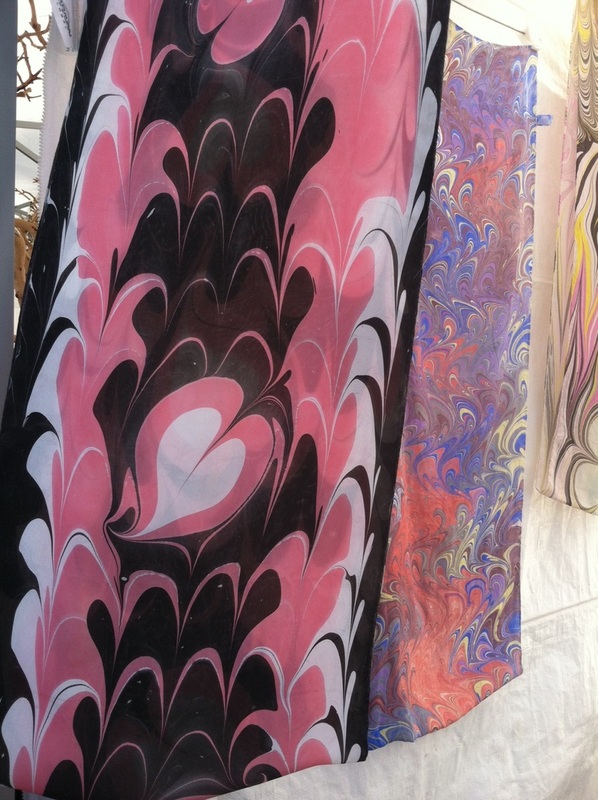 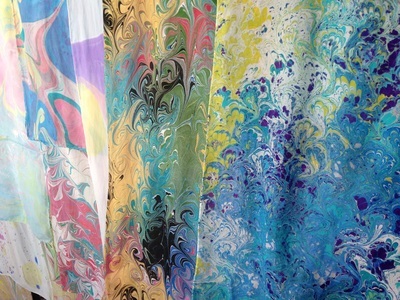 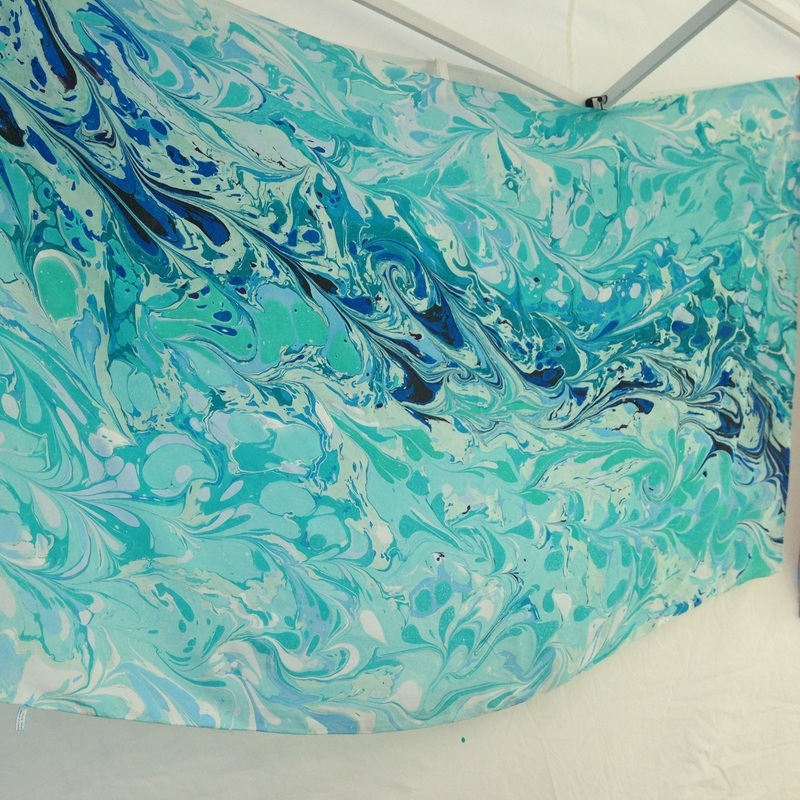 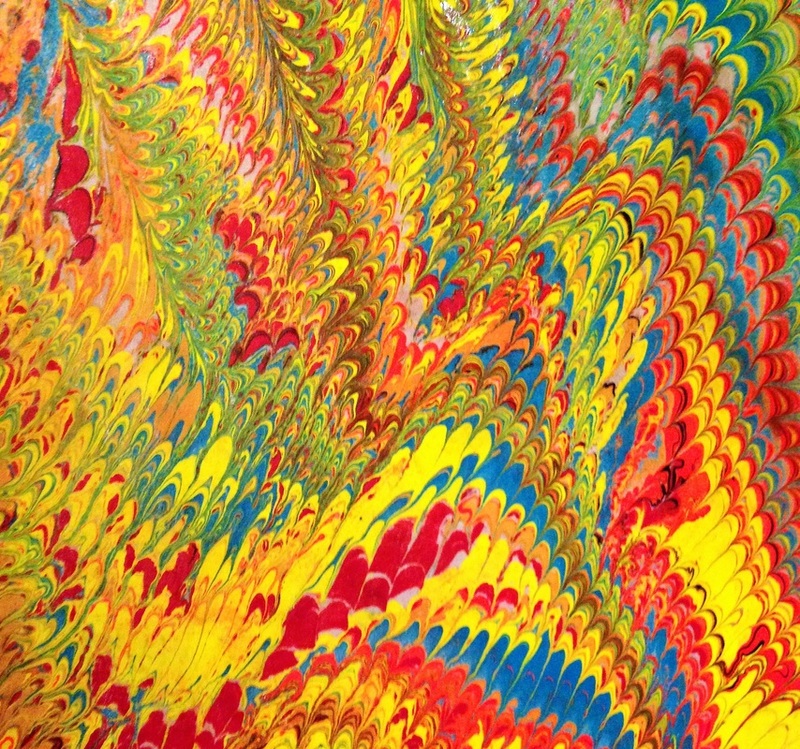 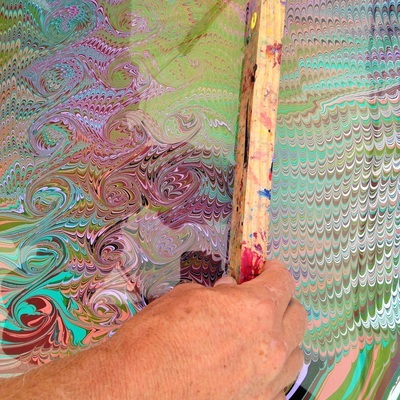 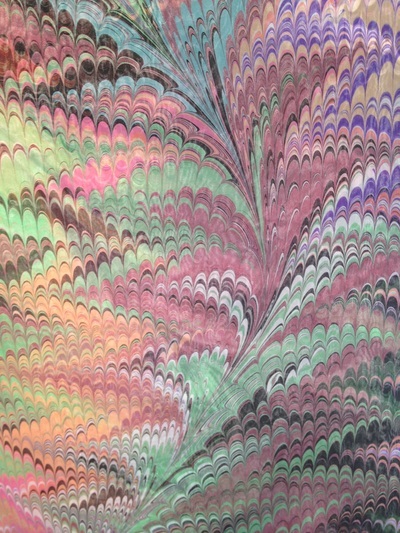 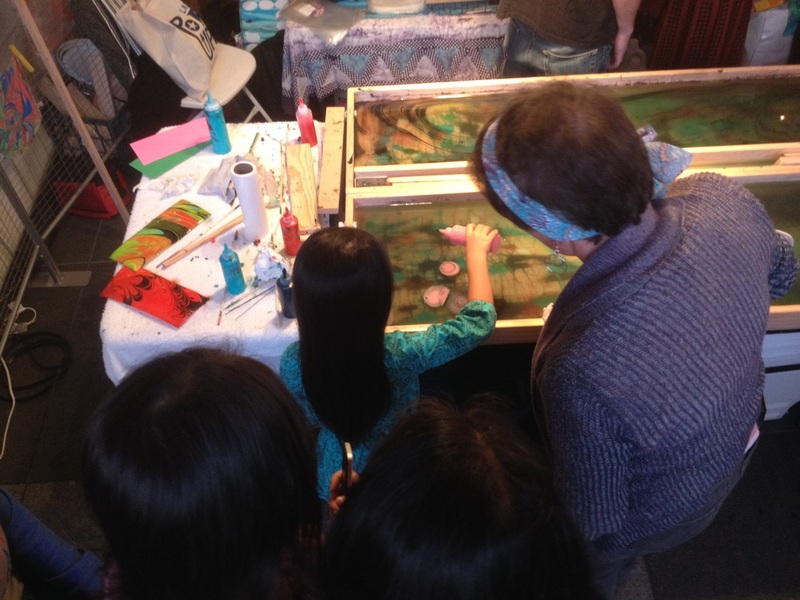 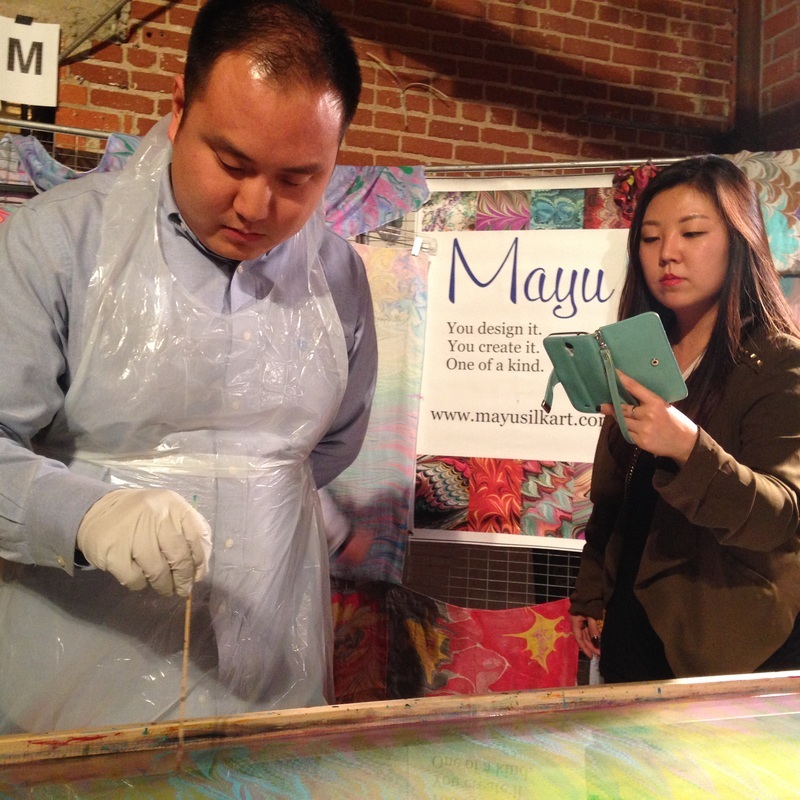 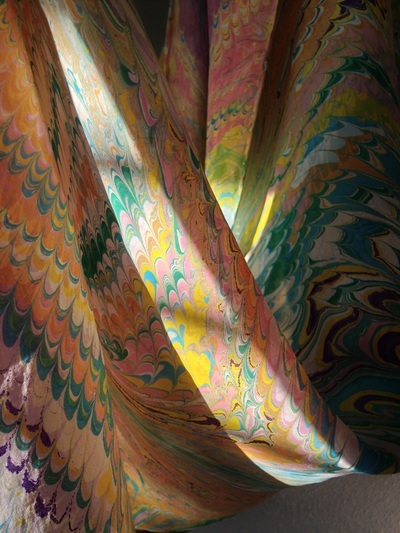 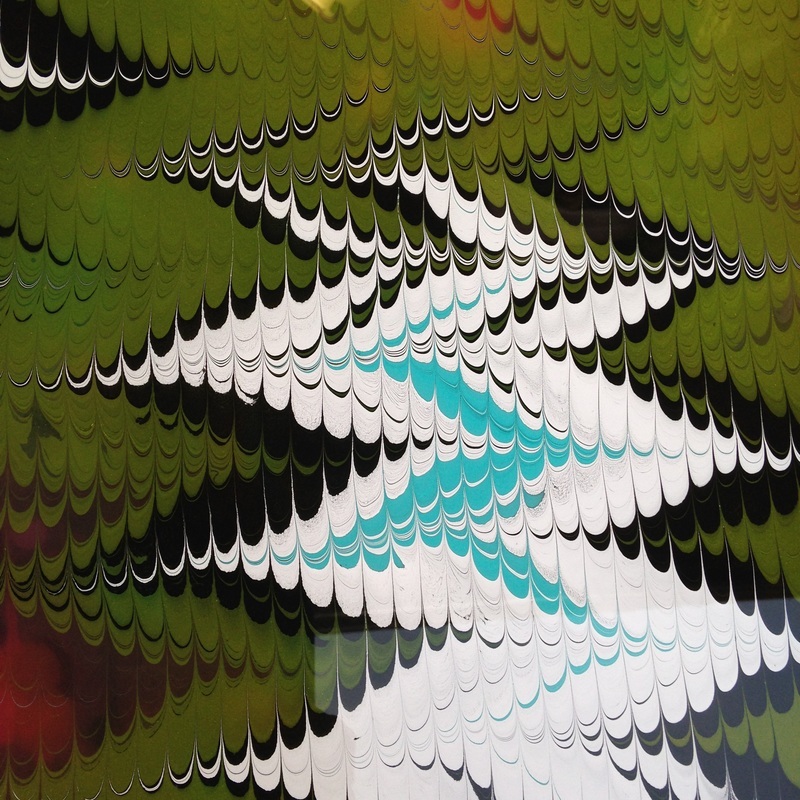 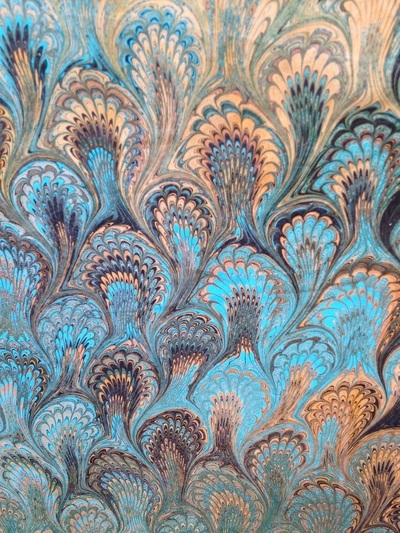 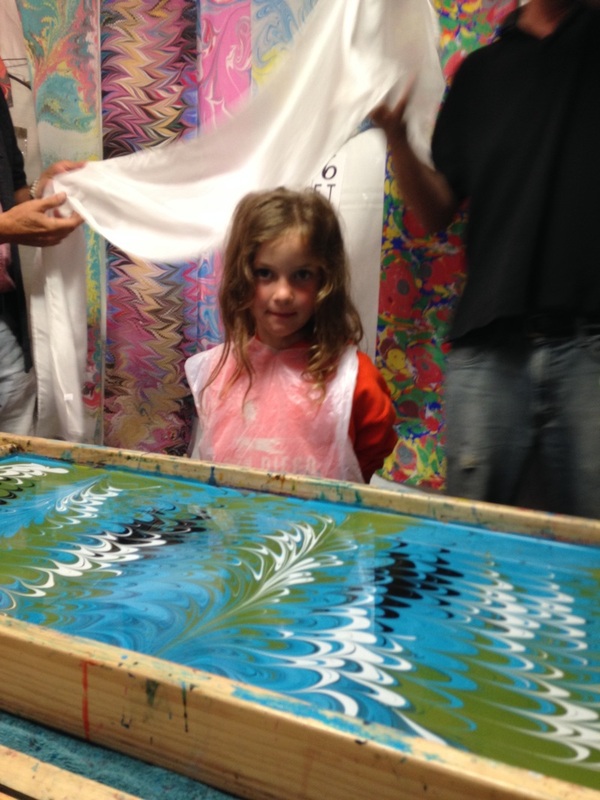 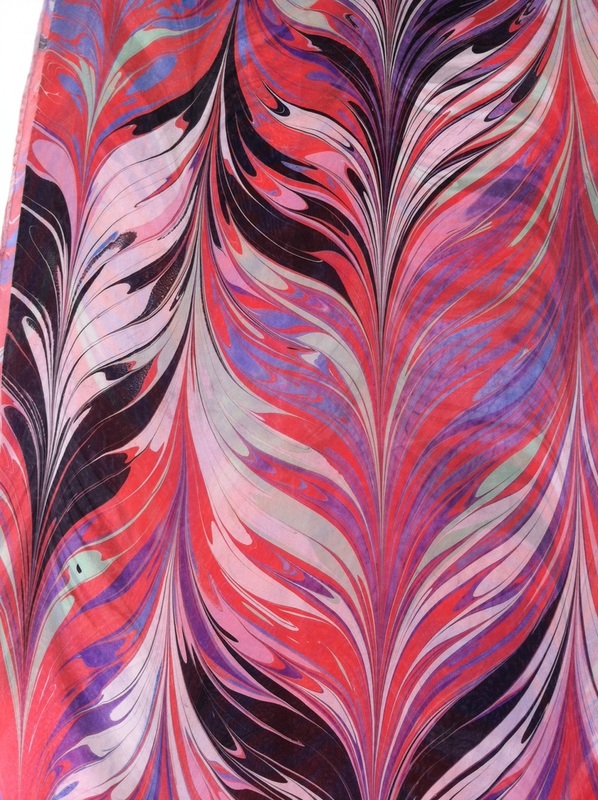 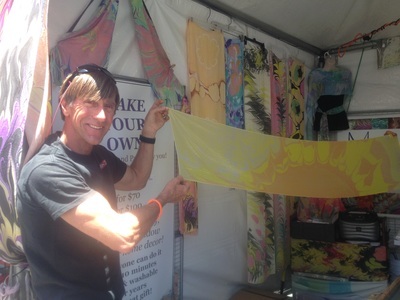 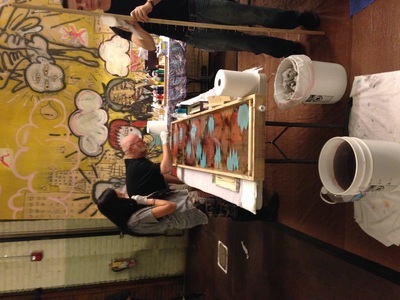 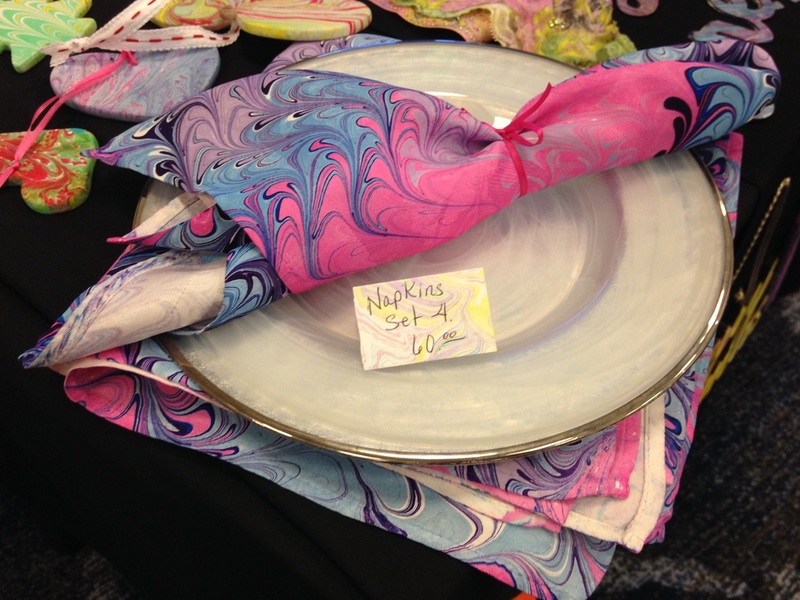 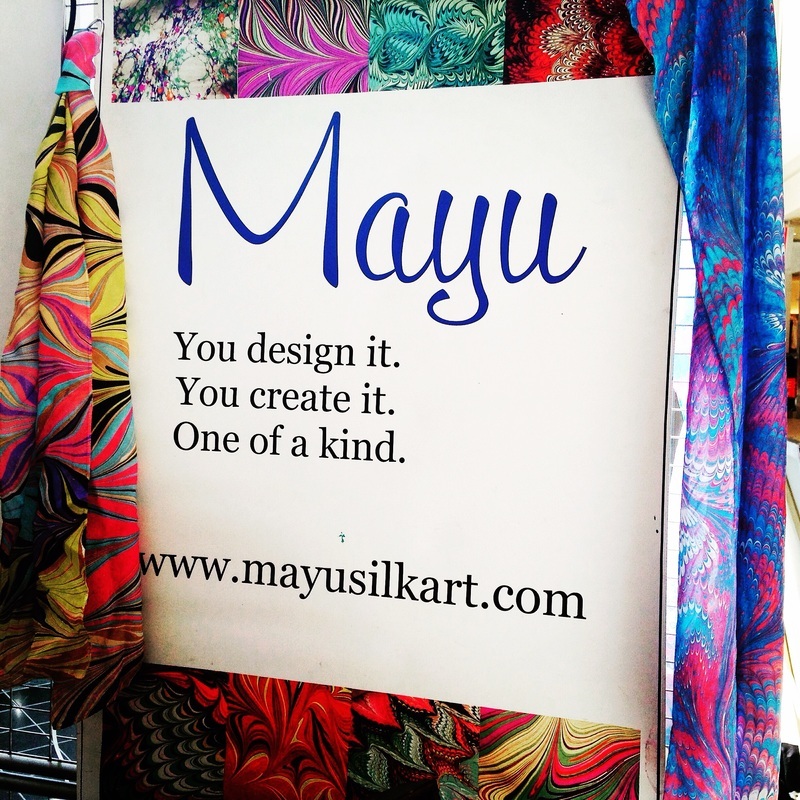 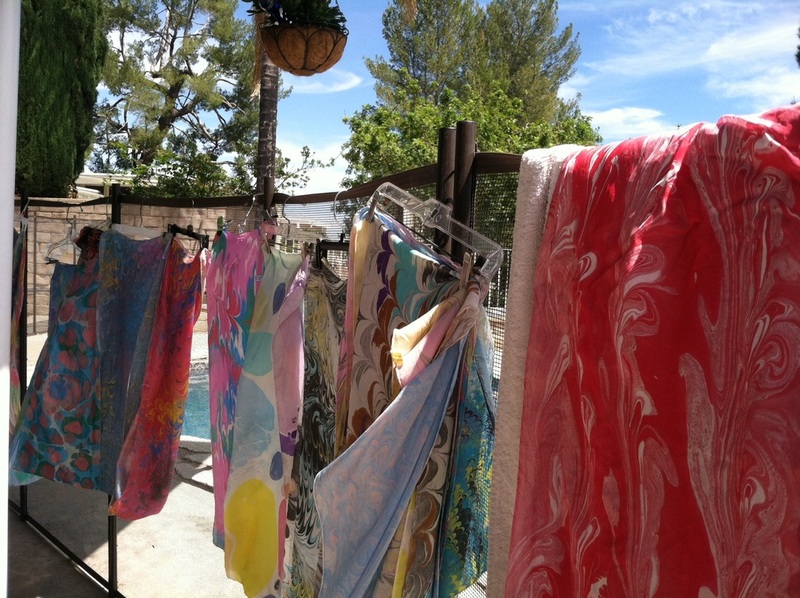 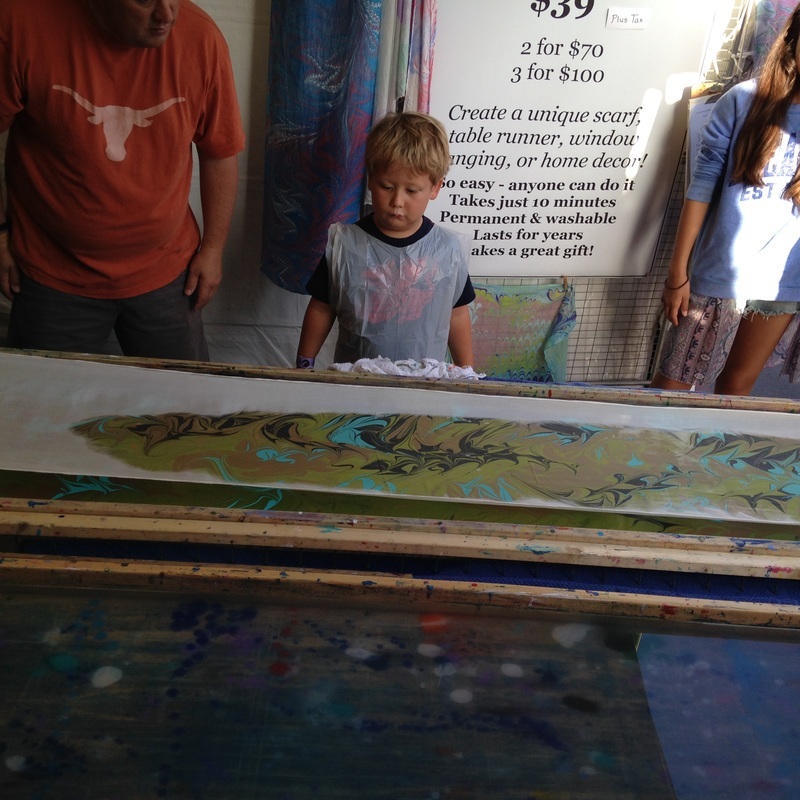 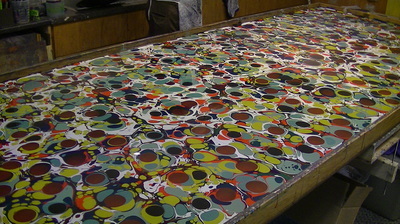 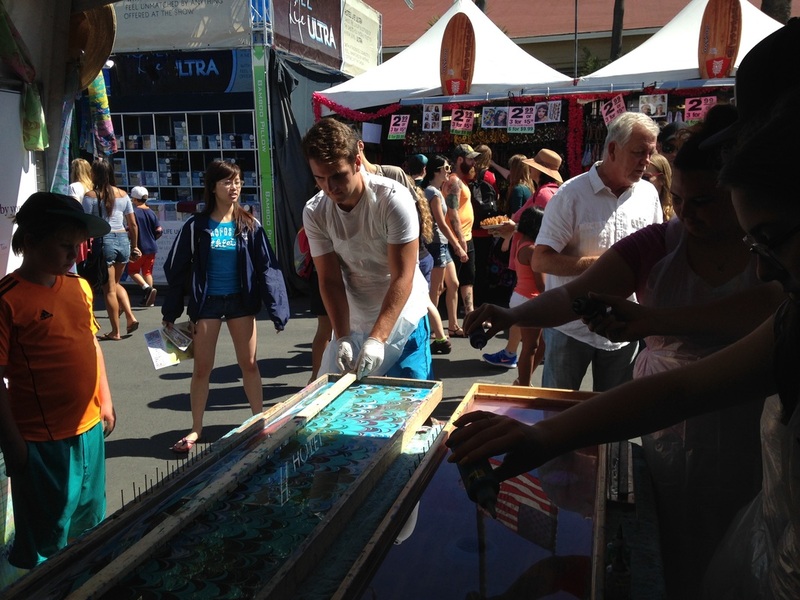 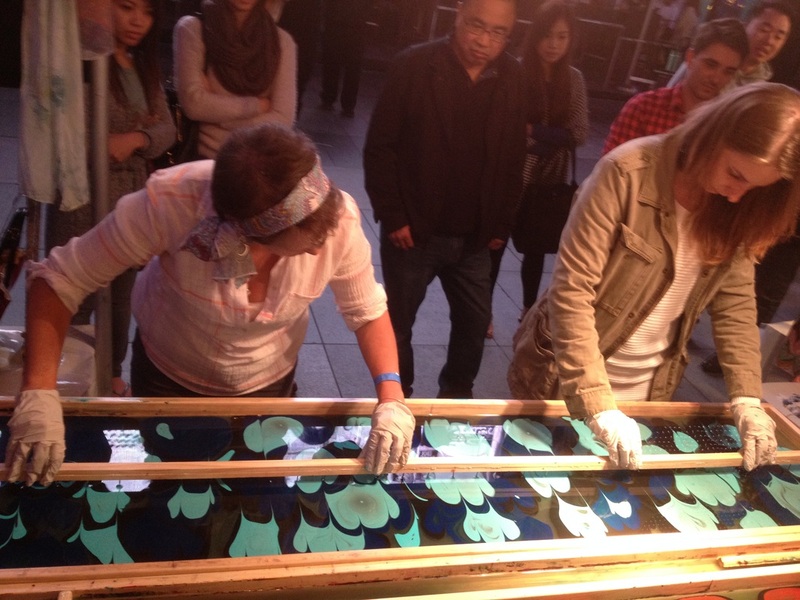 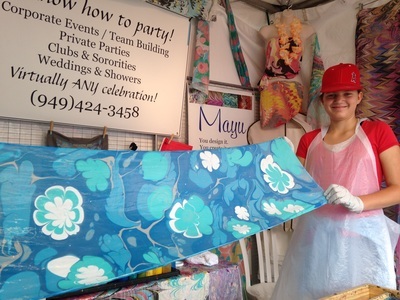 ﻿If you have pictures from your own Mayu Silk Art experience, we'd love to see them! 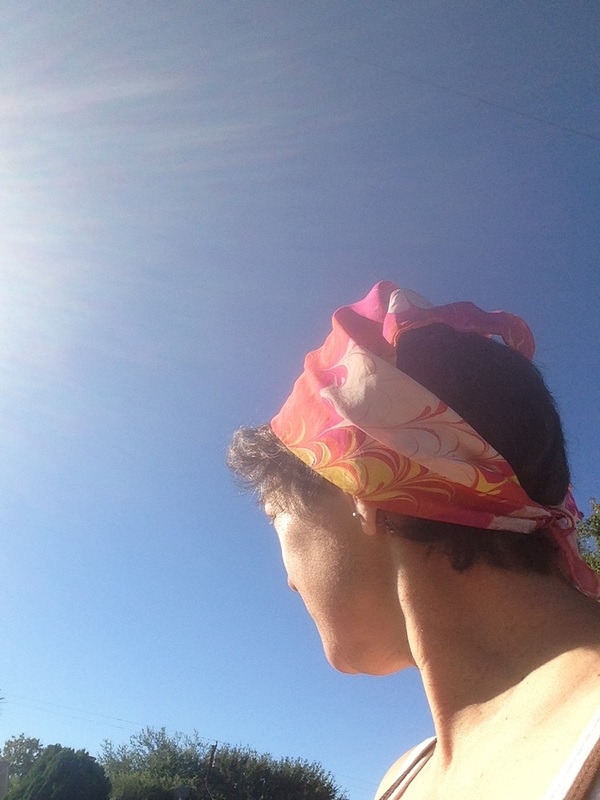 All photos and content are copyright protected. 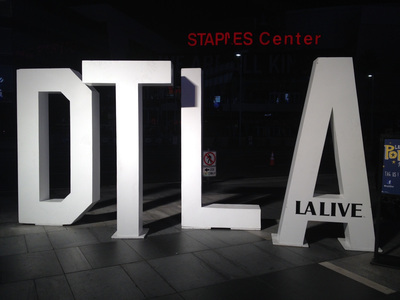 Please do not use our photos without prior written permission. 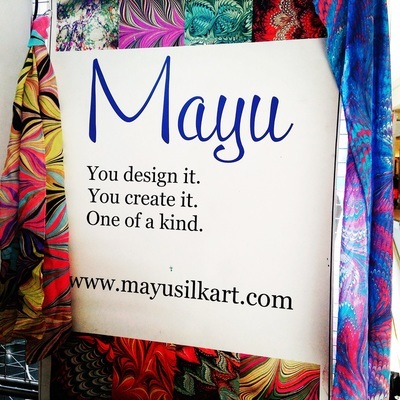 If you wish to republish any of our written content, please use quote marks (" ...") or rewrite the text in your own unique words AND link back to http://www.MayuSilkArt.com or the page from which you have pulled the content. Thank you! 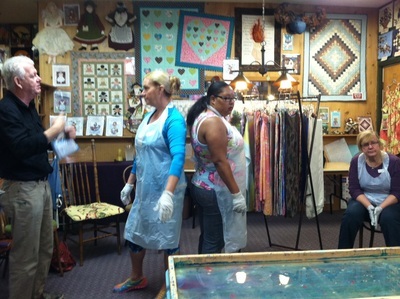 ﻿We have limited opportunities for volunteering. 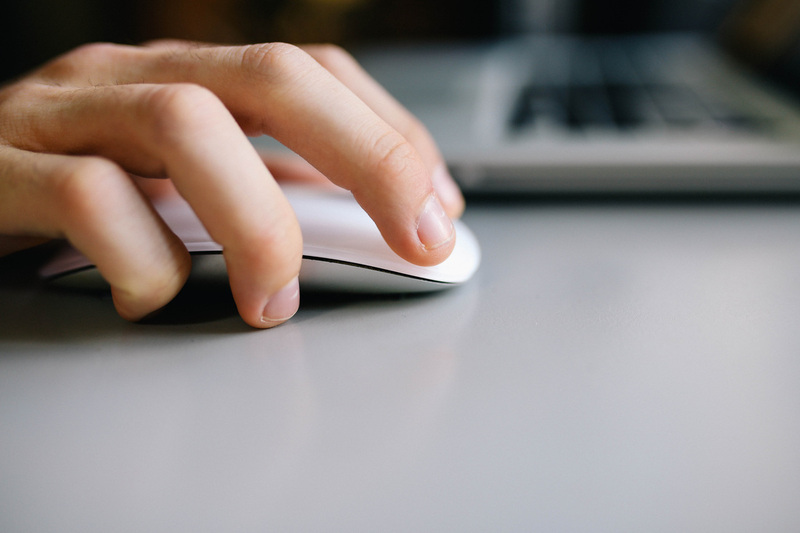 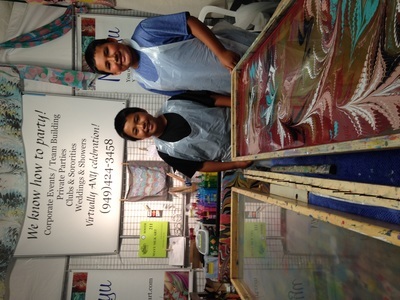 Please click the button below to send us an email letting us know you are interested. 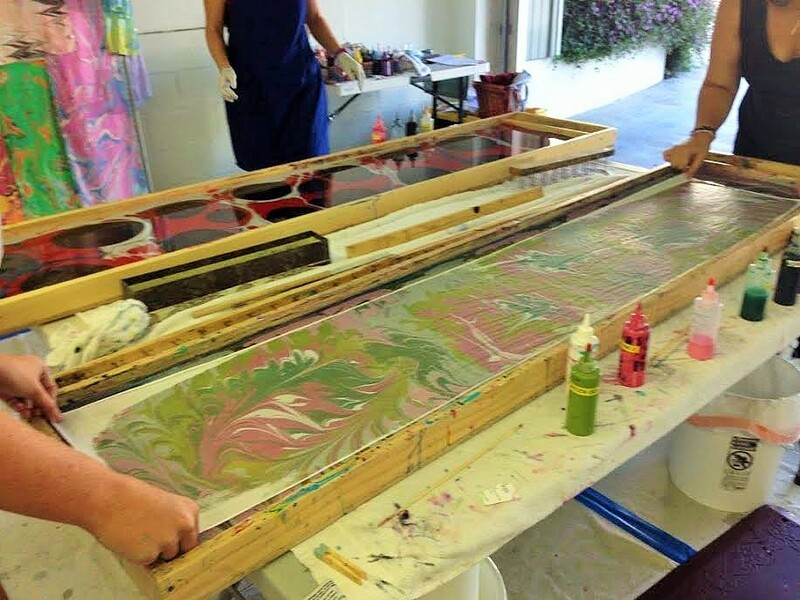 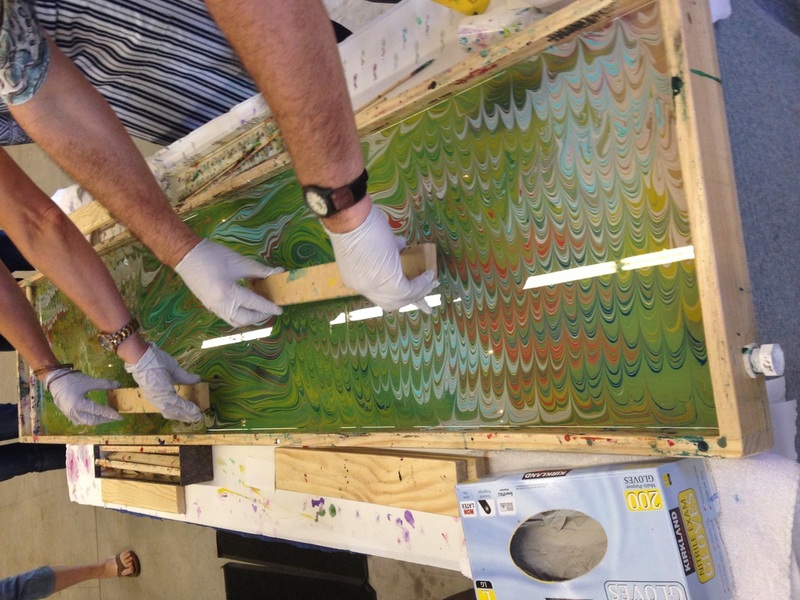 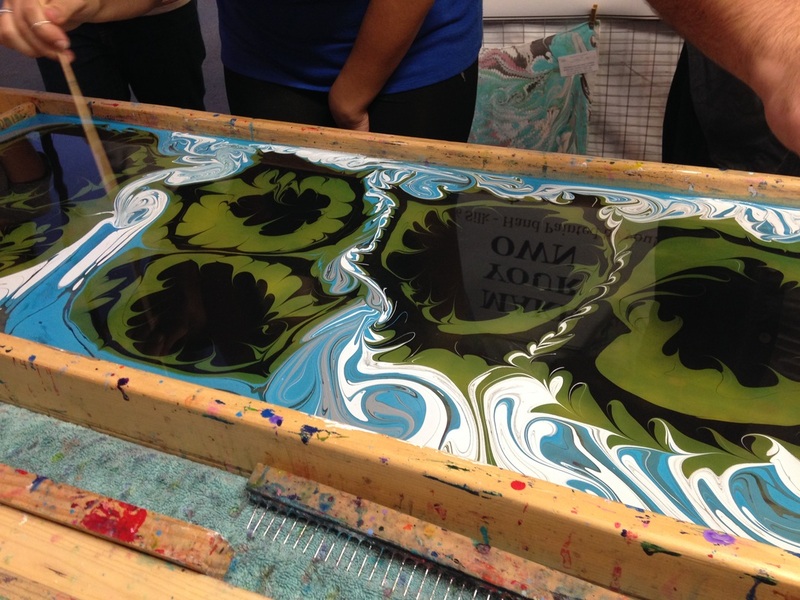 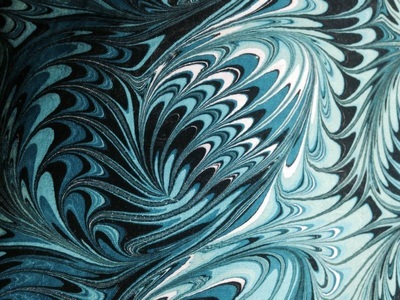 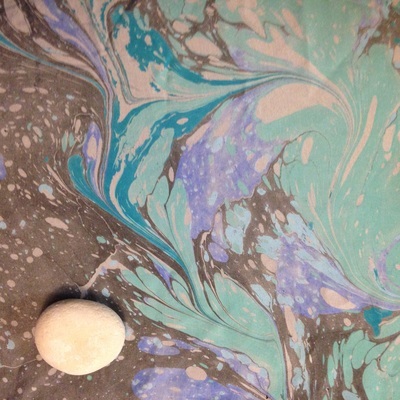 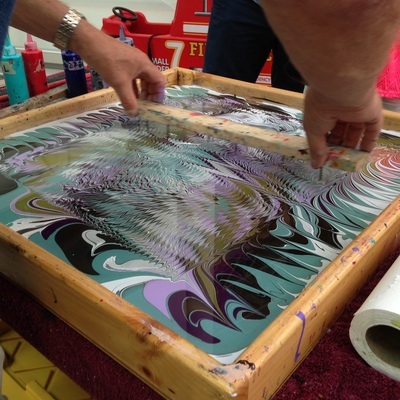 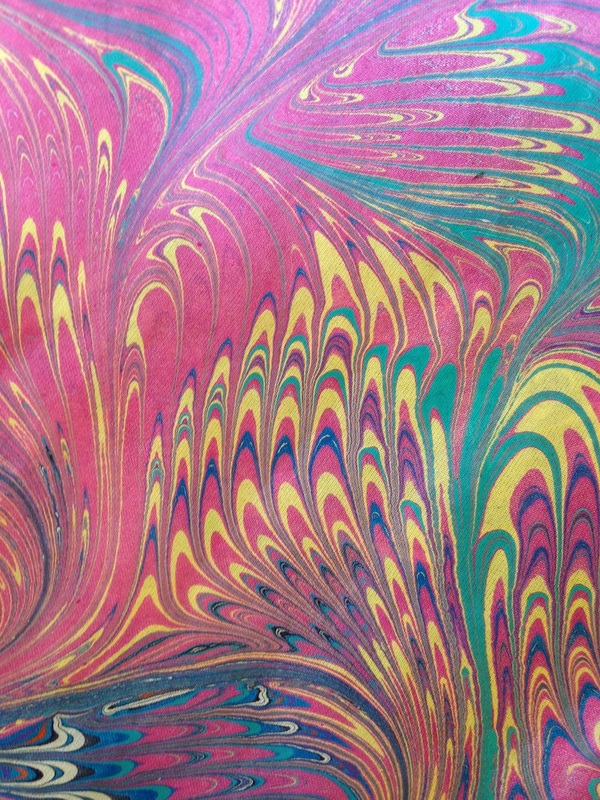 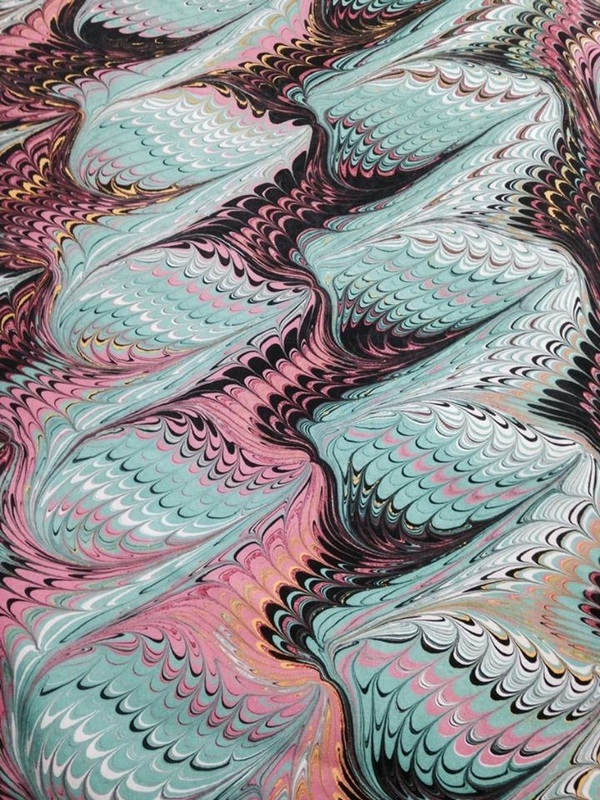 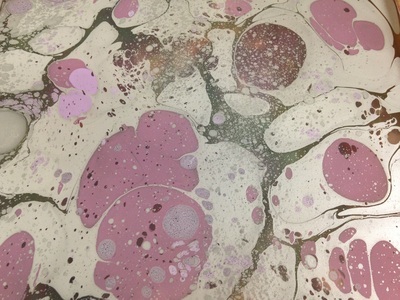 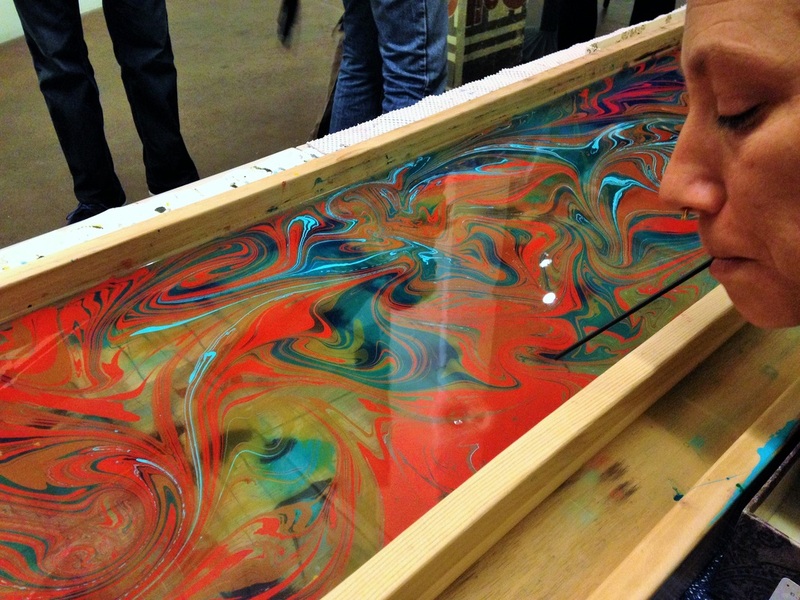 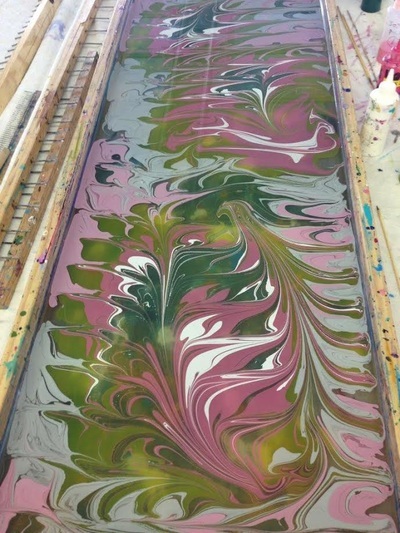 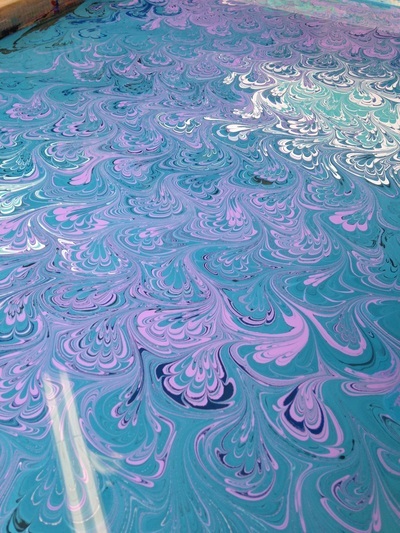 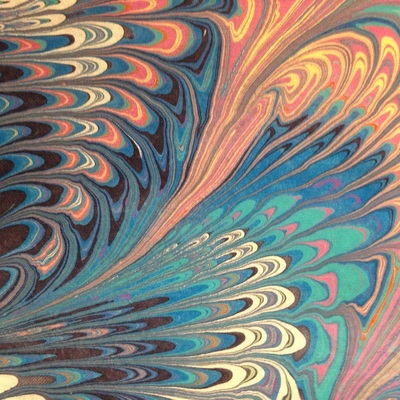 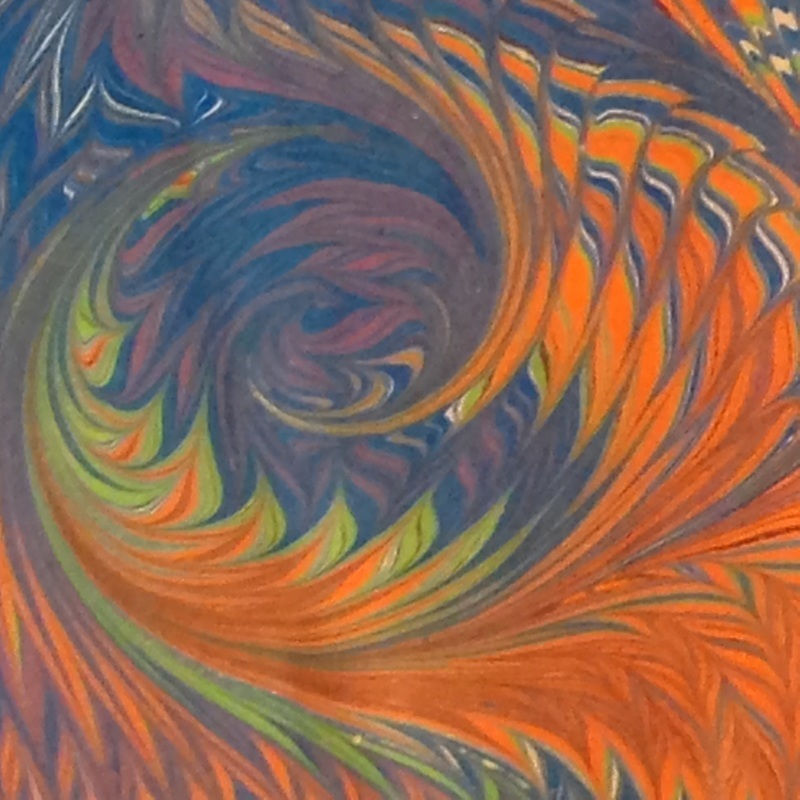 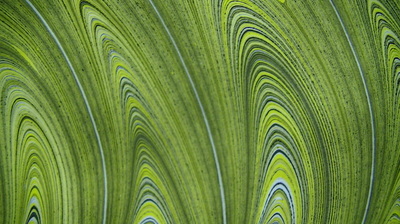 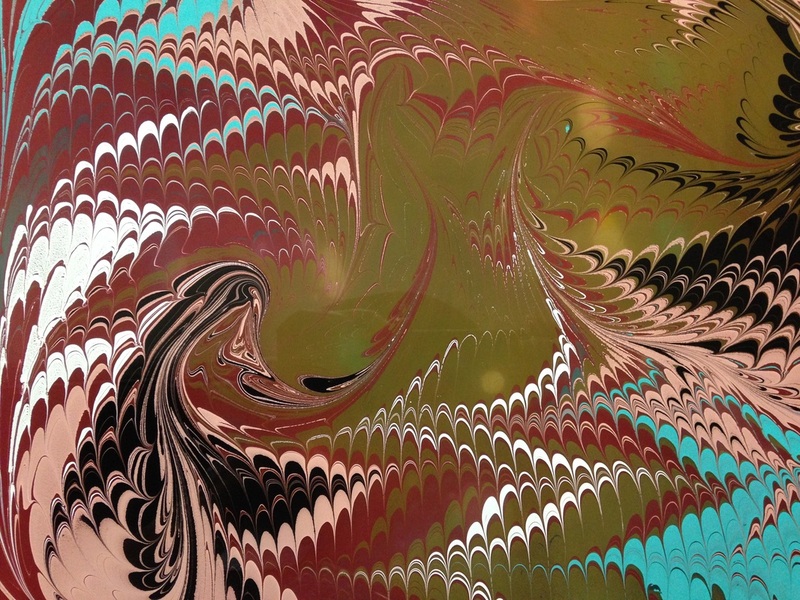 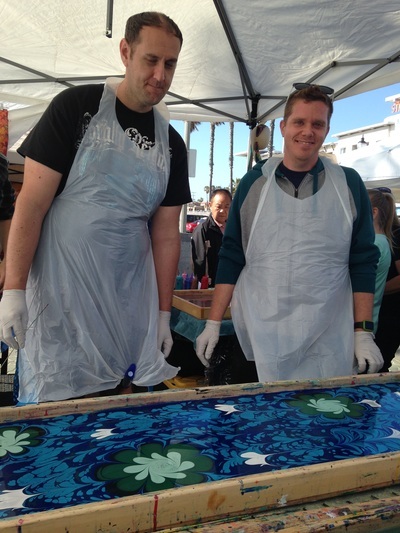 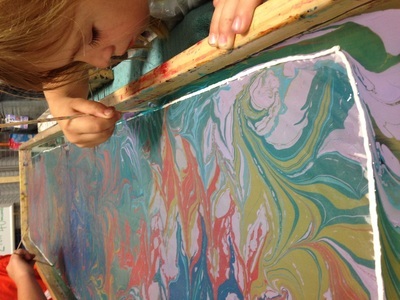 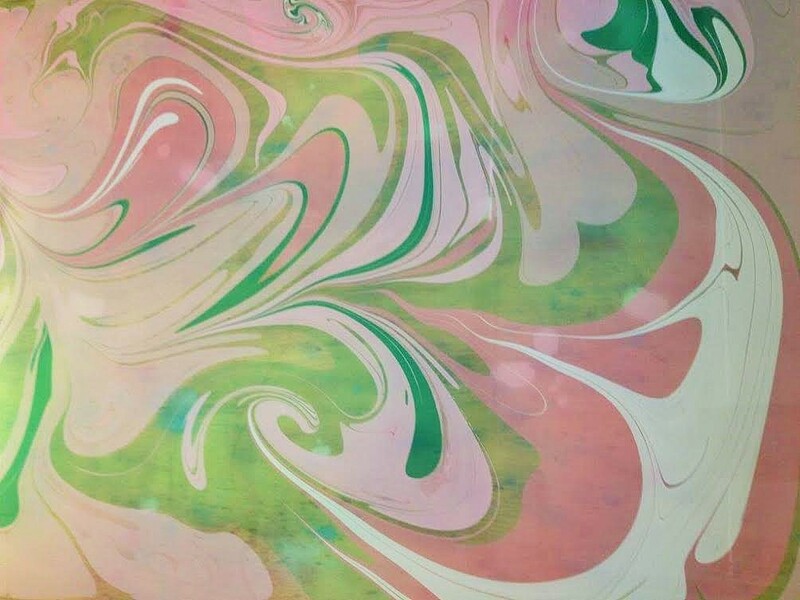 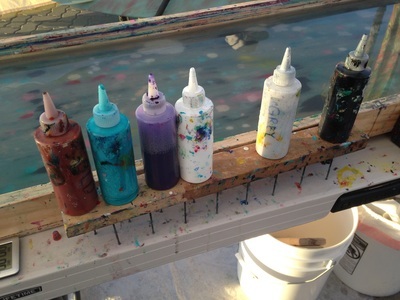 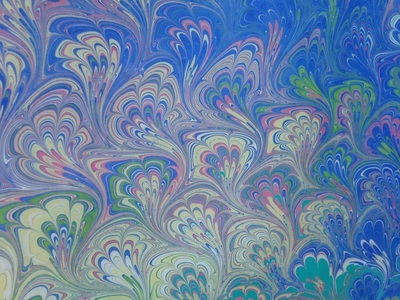 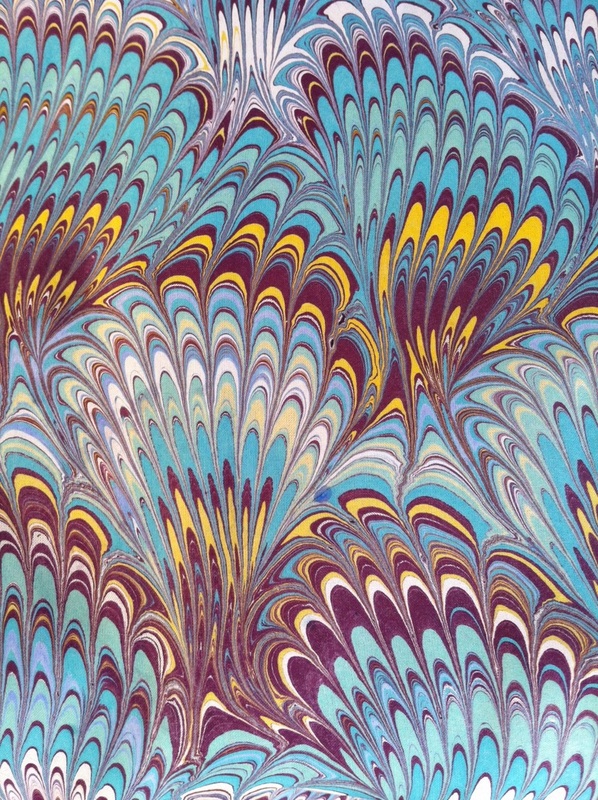 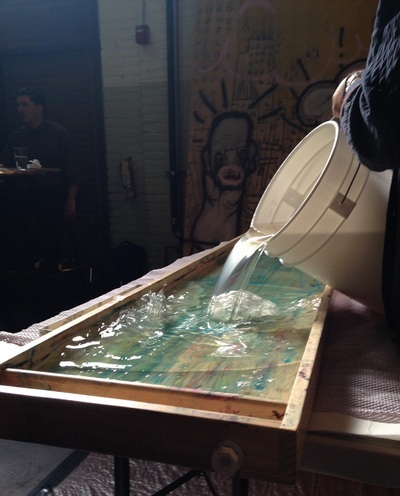 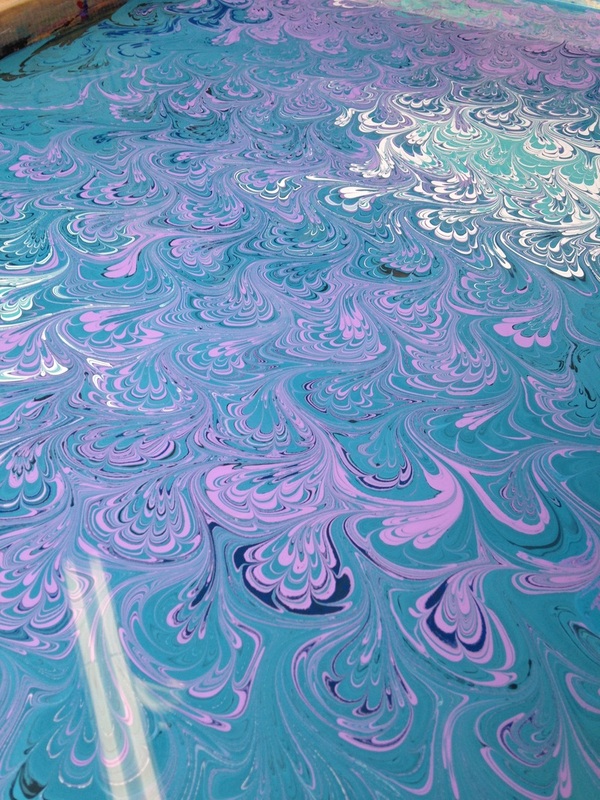 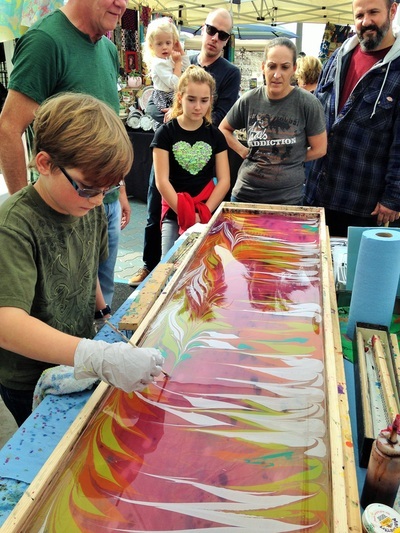 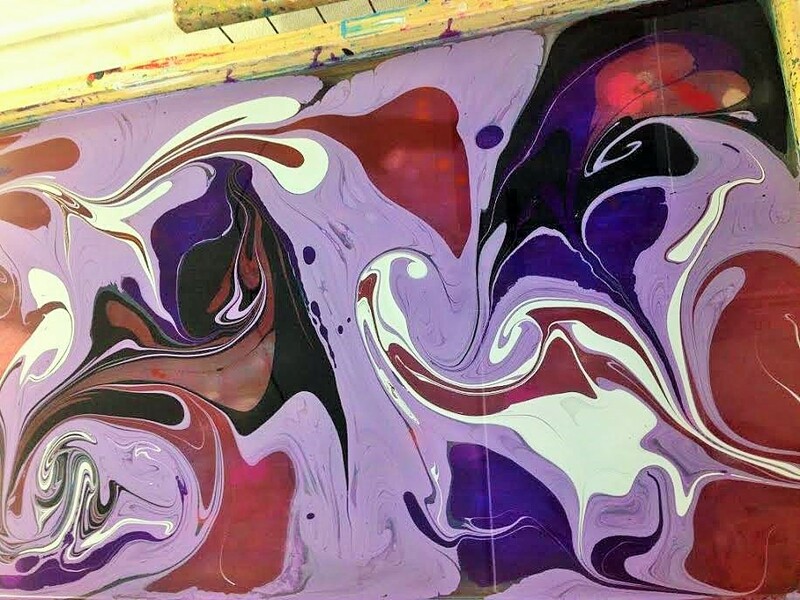 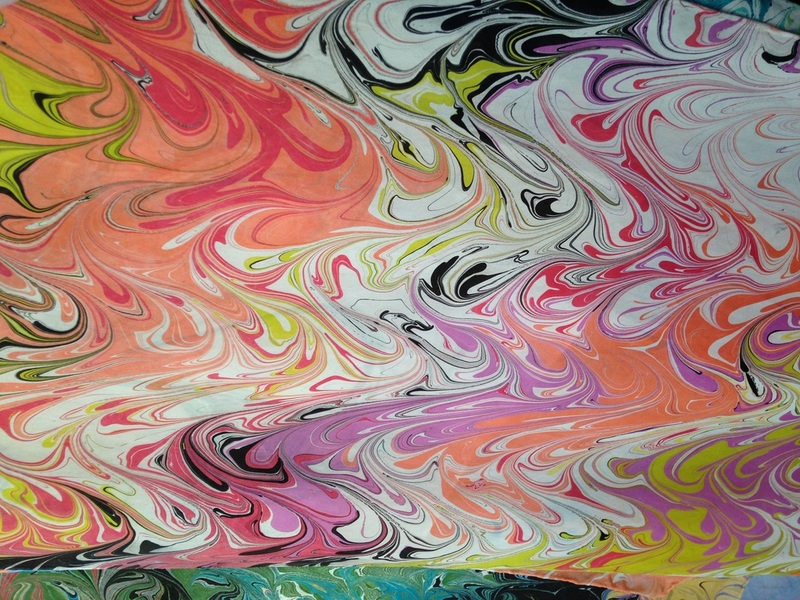 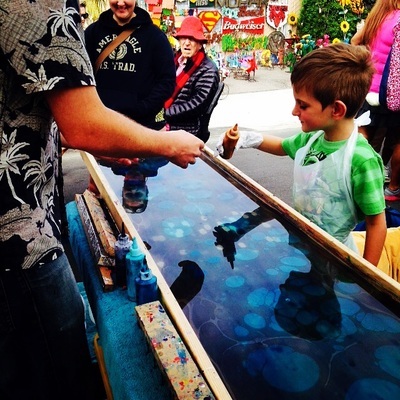 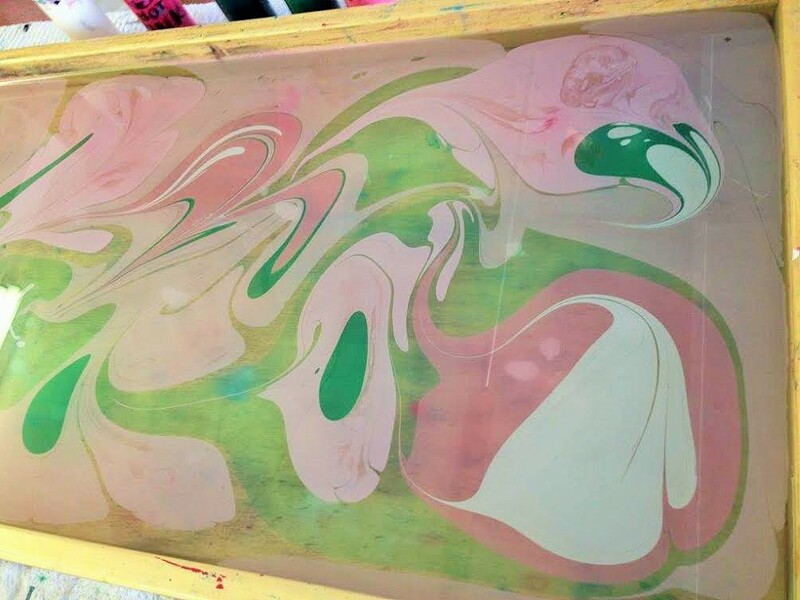 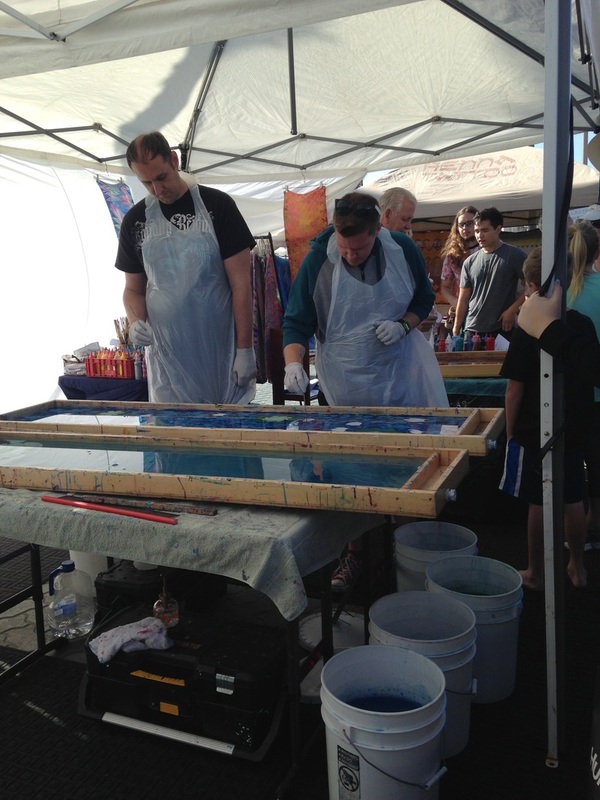 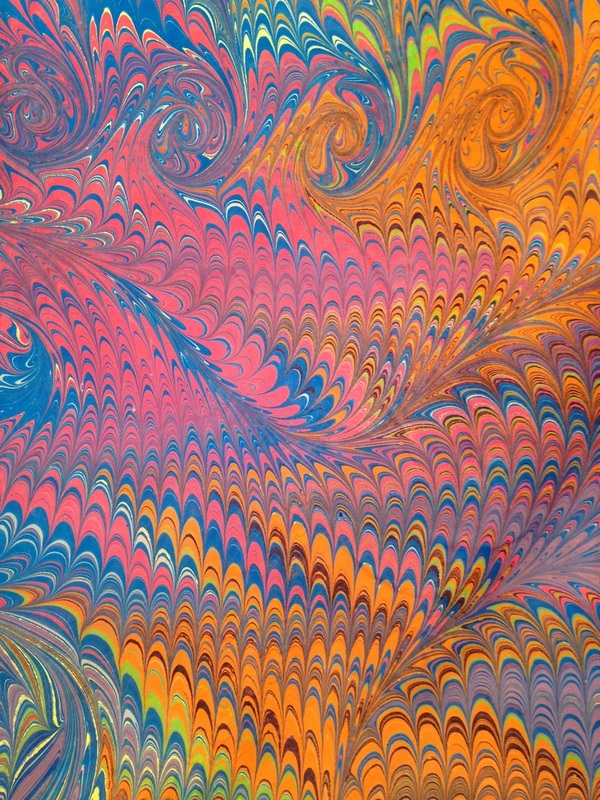 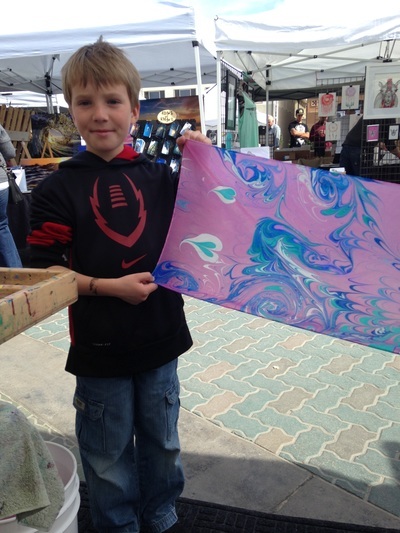 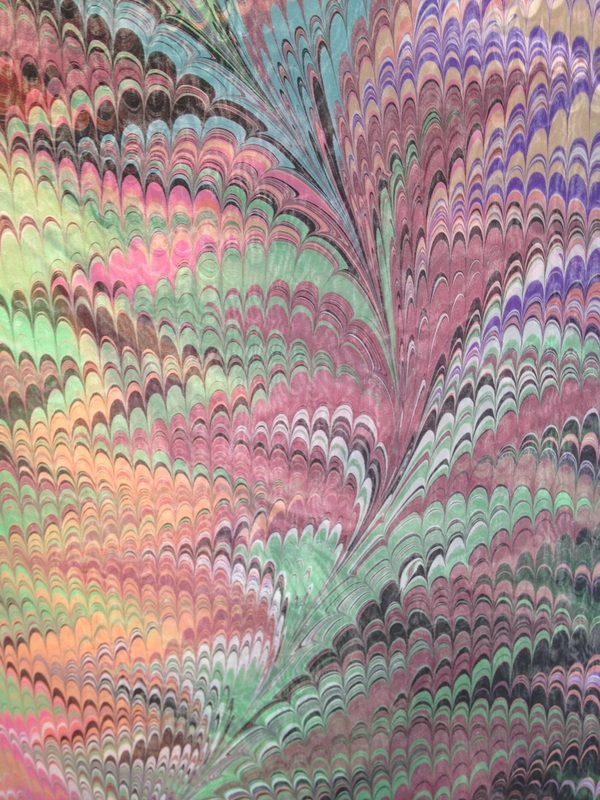 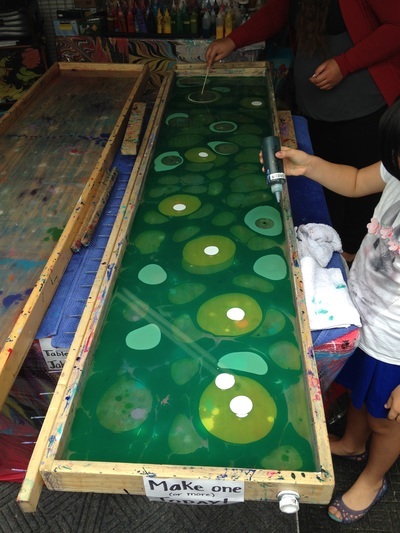 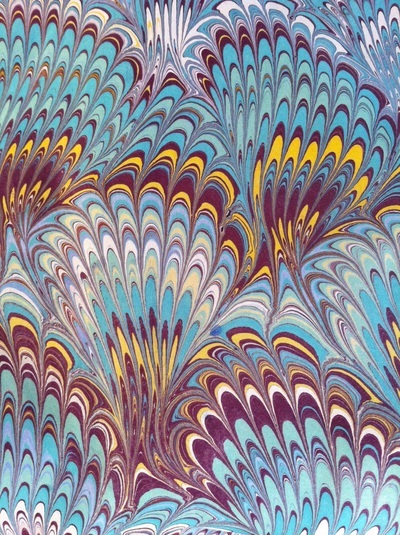 We'll send you any current or upcoming opportunities, and add your email address to our list of potential volunteers..
Make a donation in any amount, and your contribution will go directly to helping others experience the joy of water marbling. 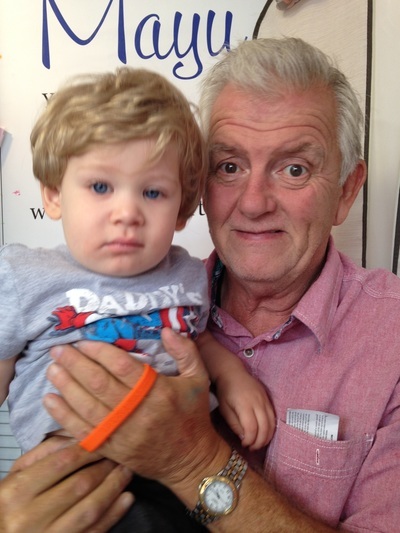 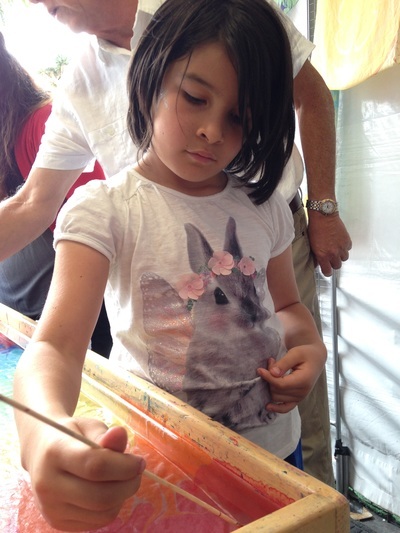 For donations of $39 or more, we can provide a donation-in-kind form for a receipt from Children't Hospital of Los Angeles, a 501(c)3 corporation. 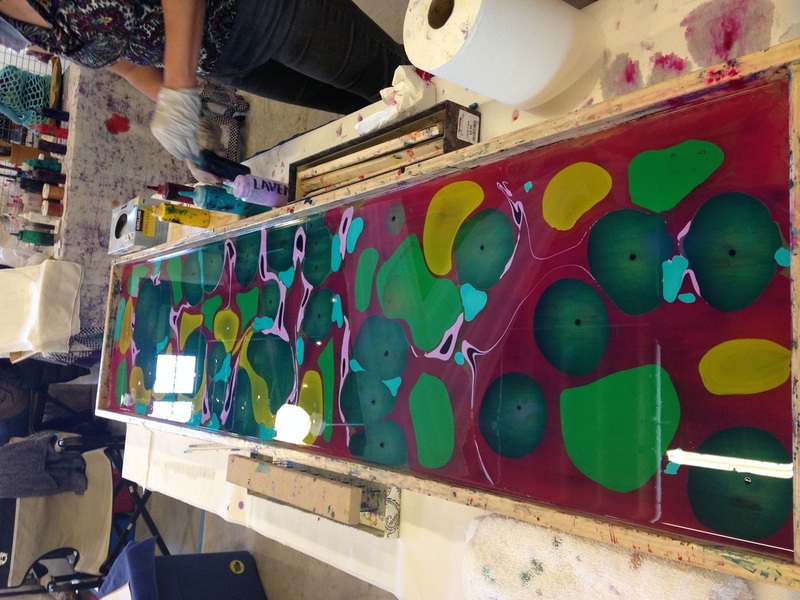 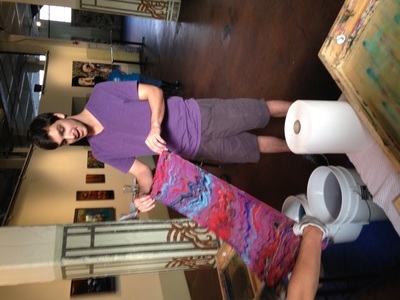 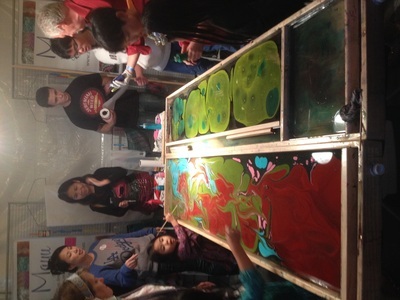 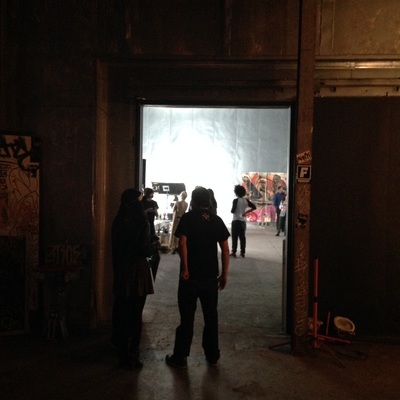 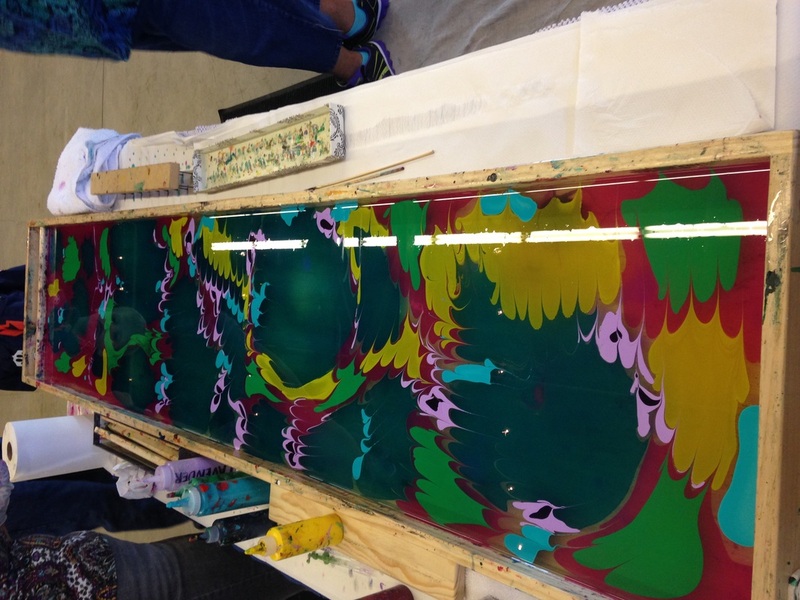 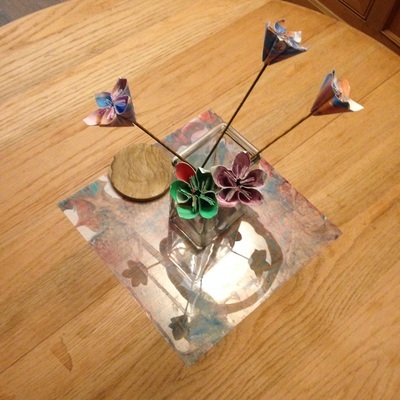 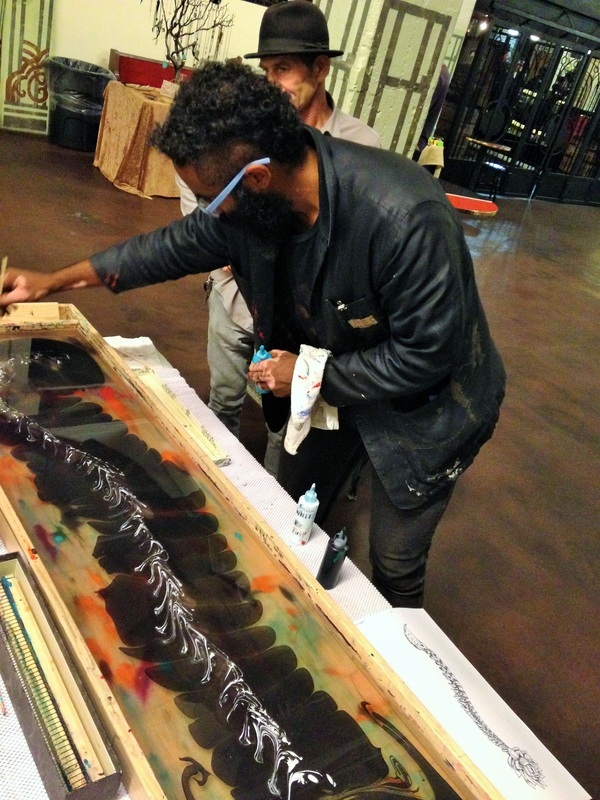 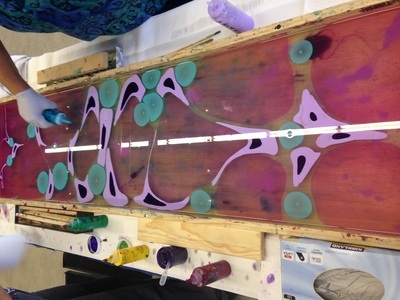 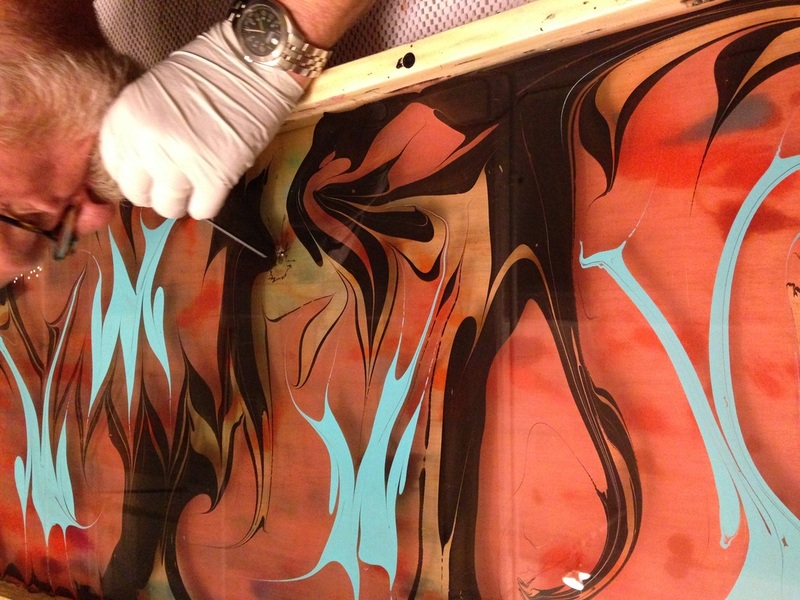 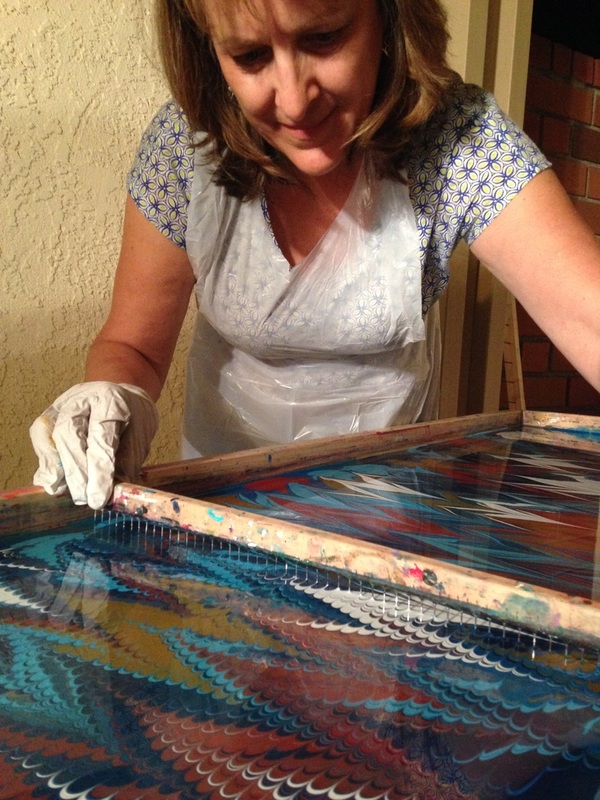 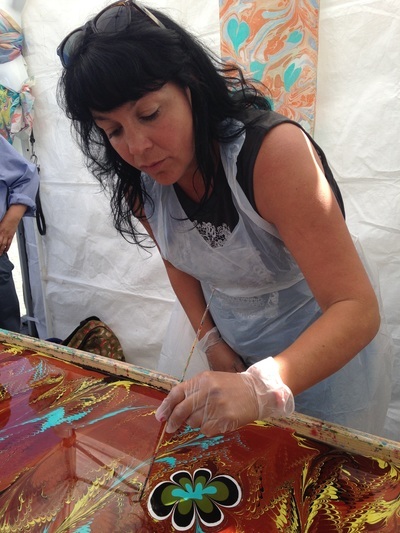 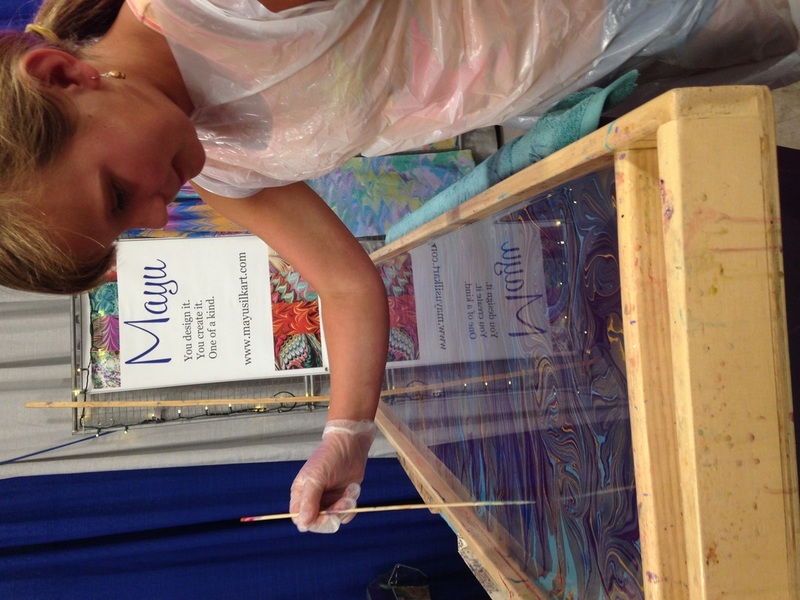 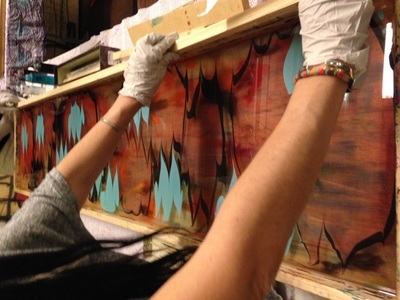 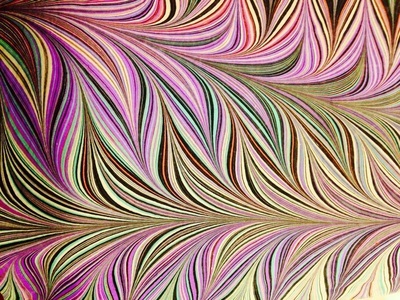 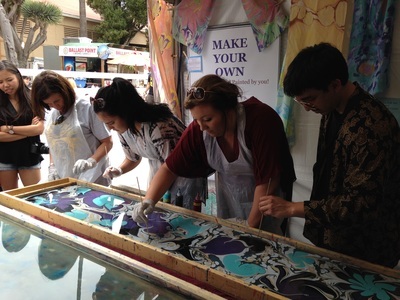 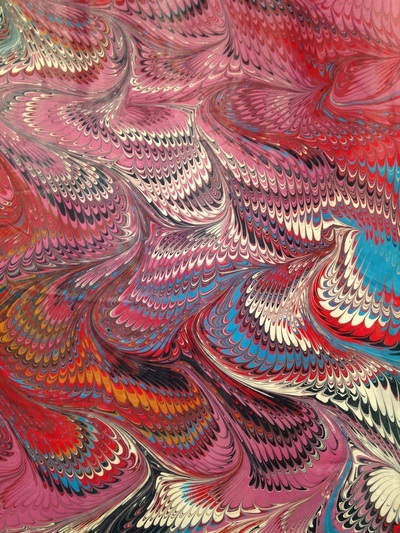 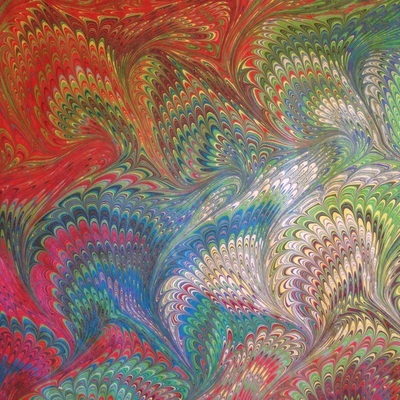 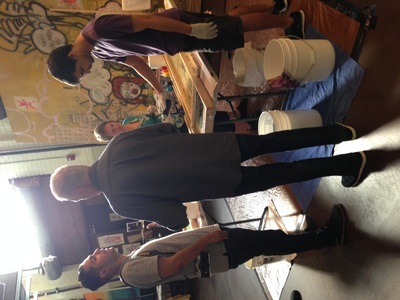 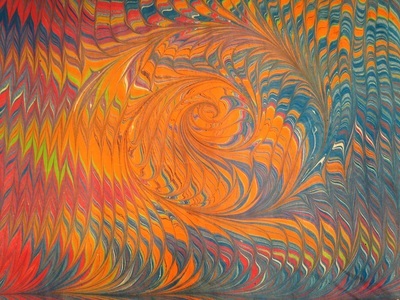 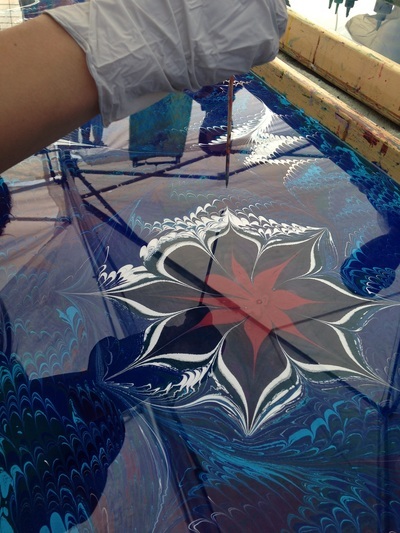 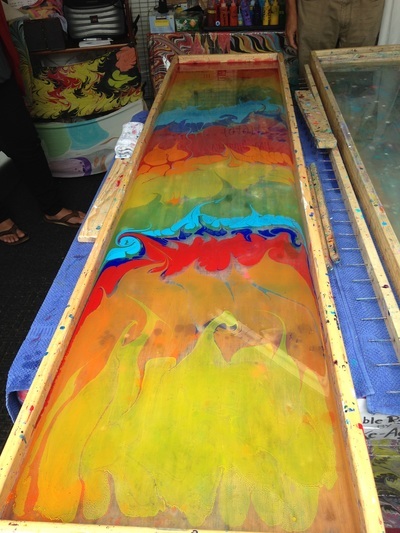 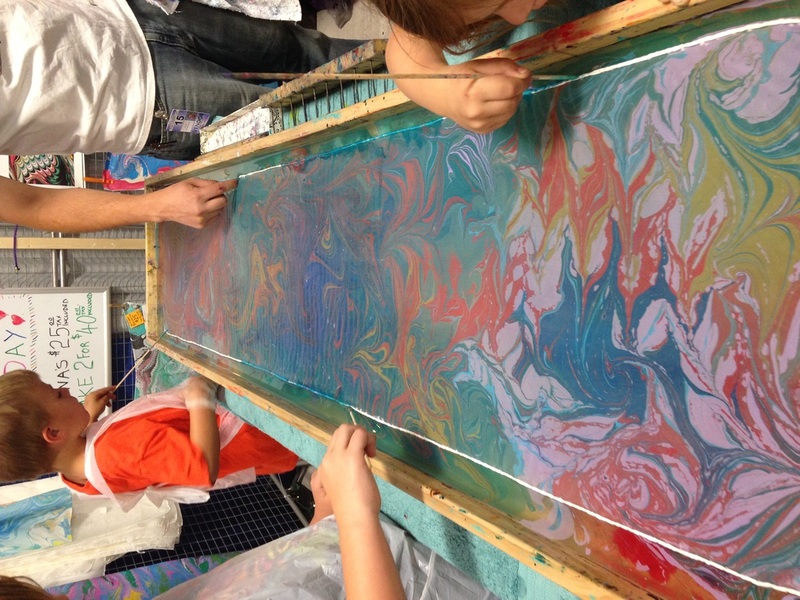 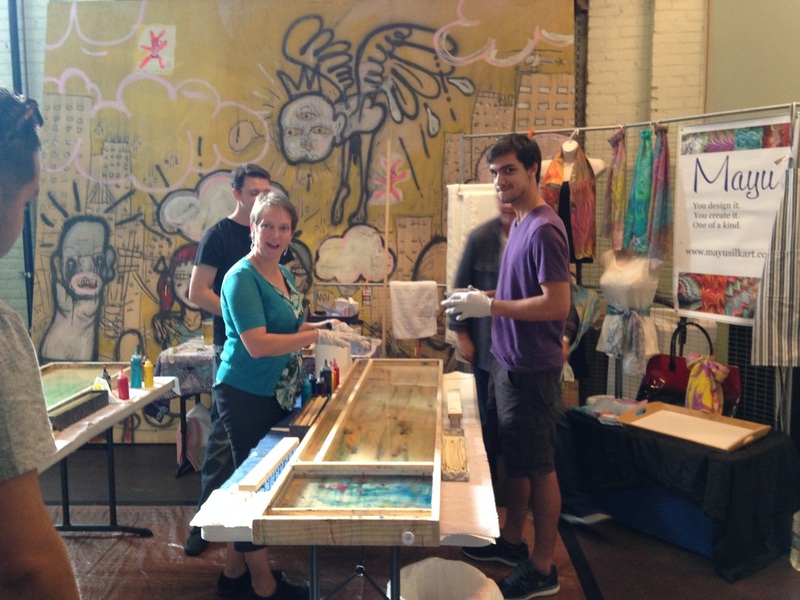 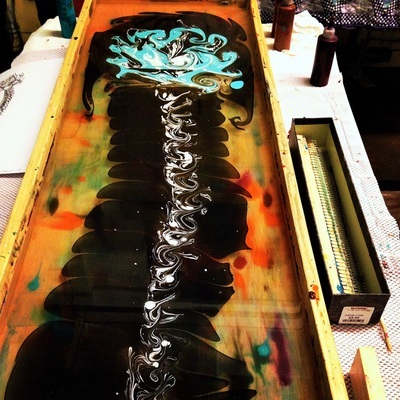 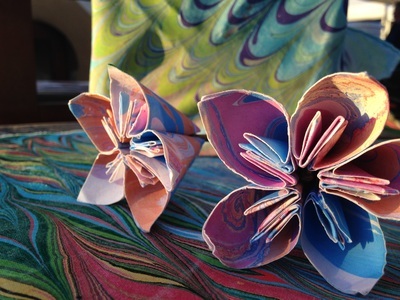 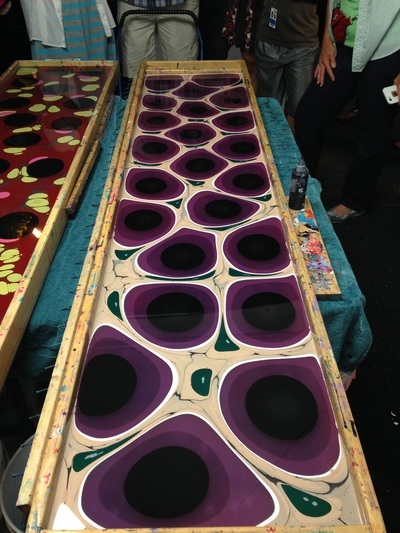 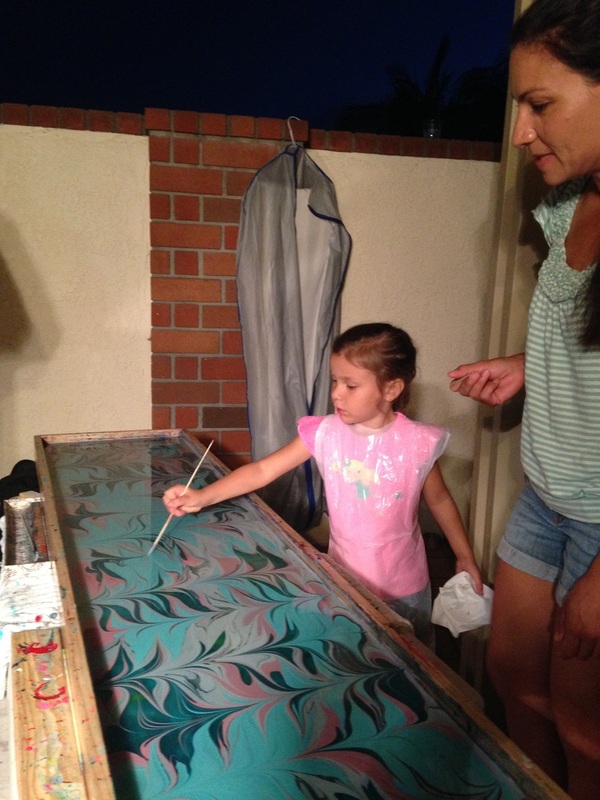 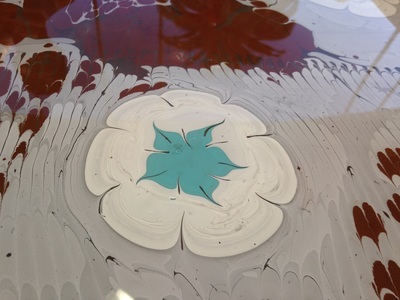 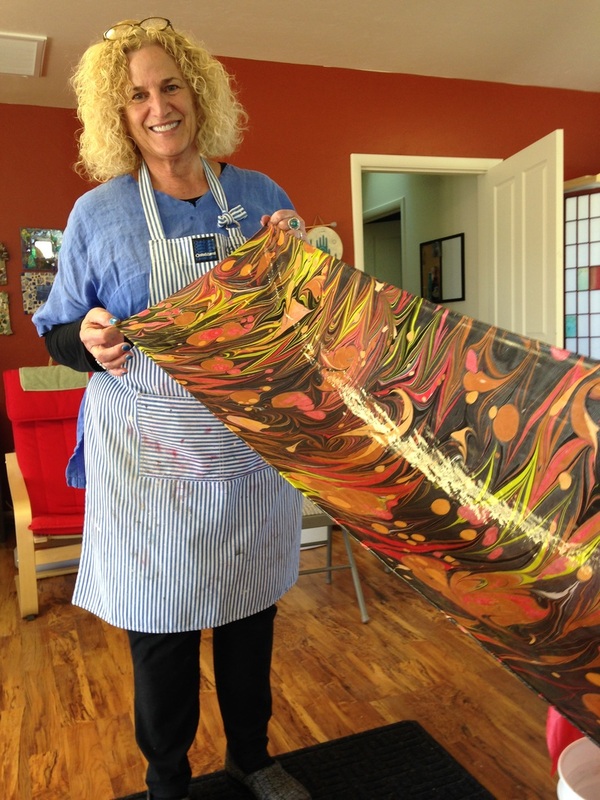 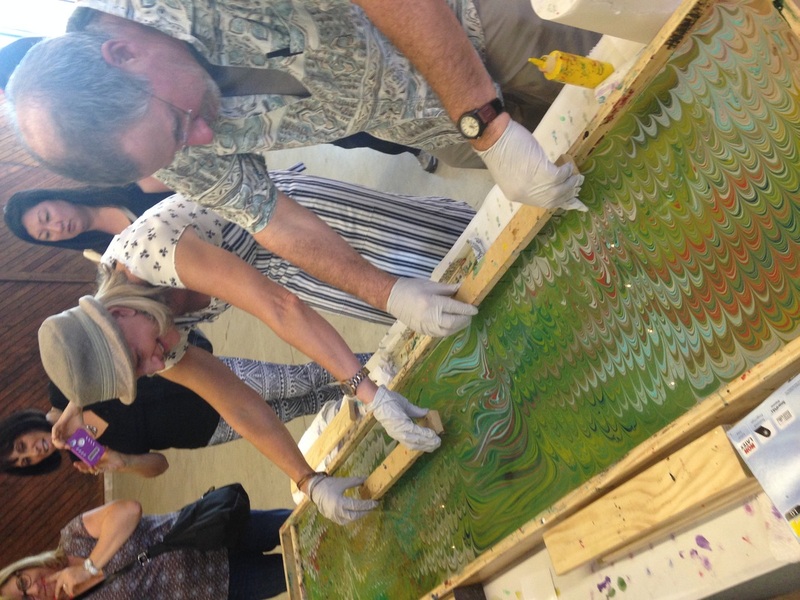 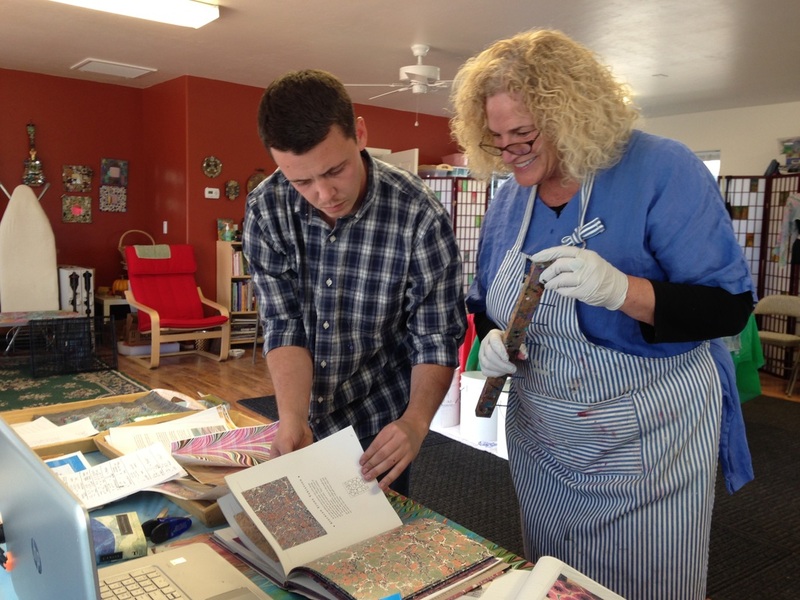 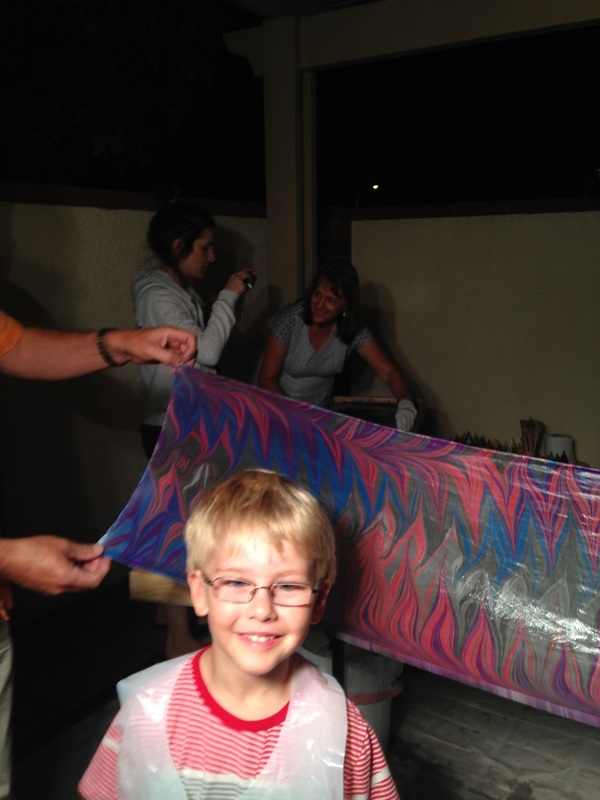 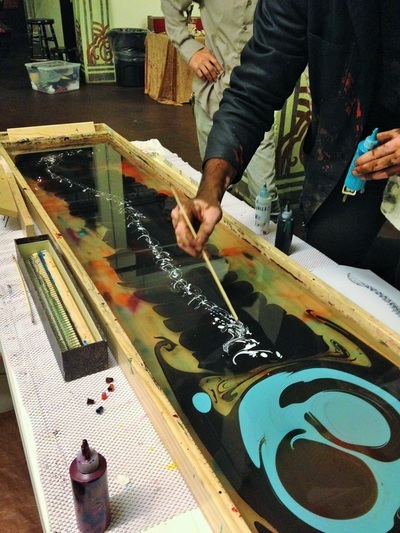 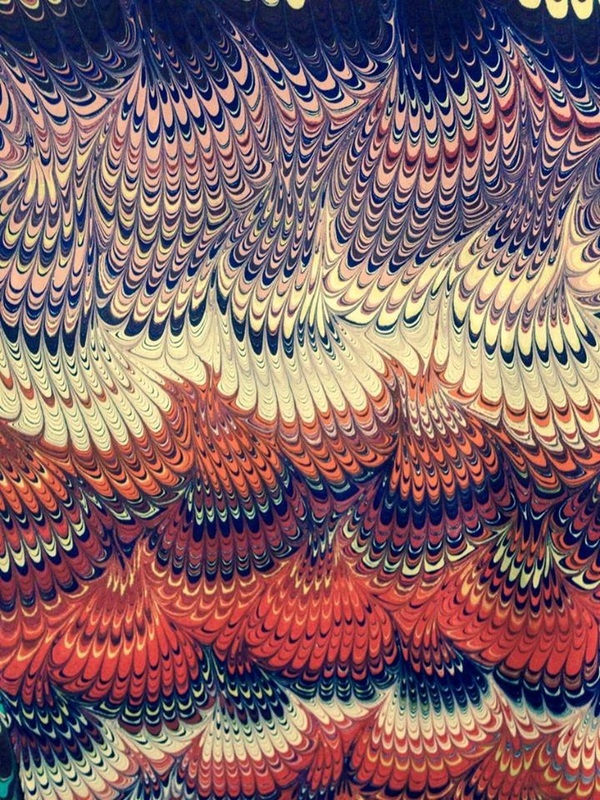 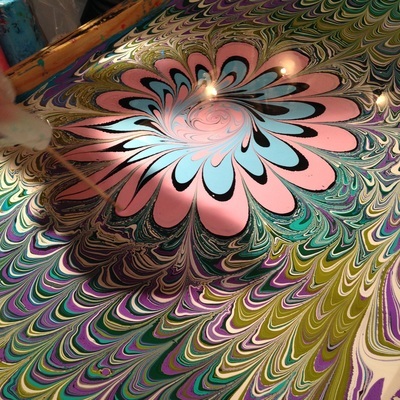 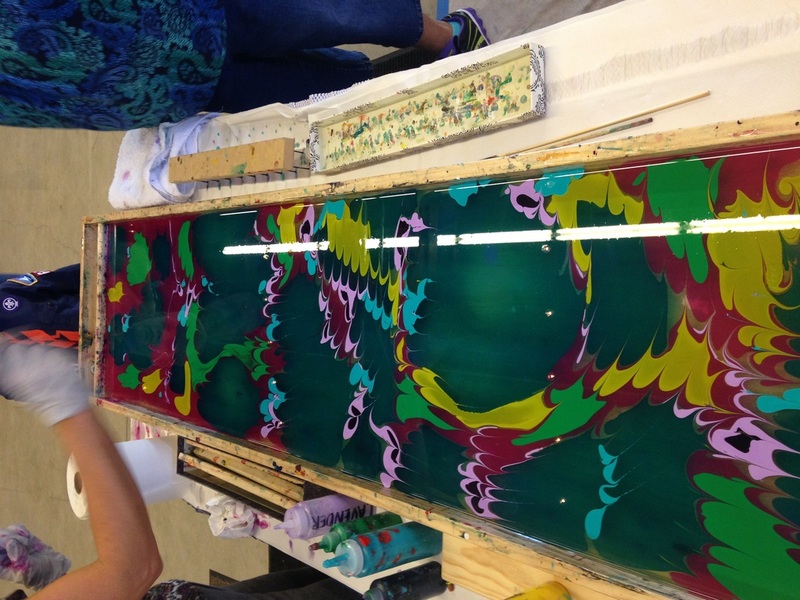 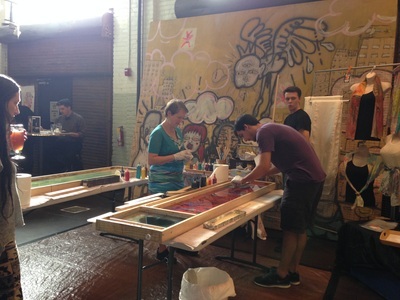 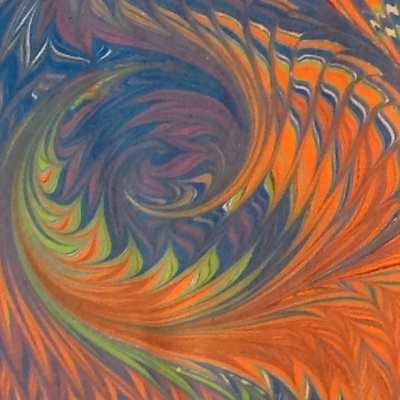 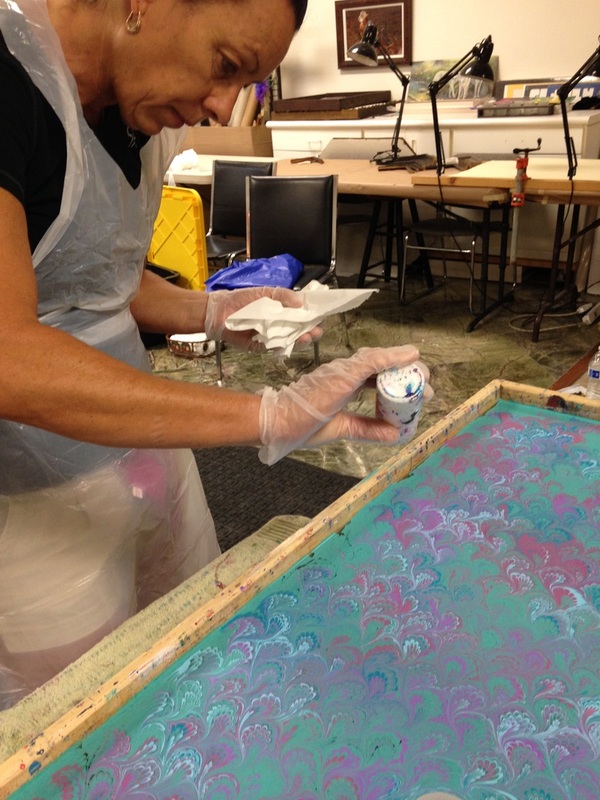 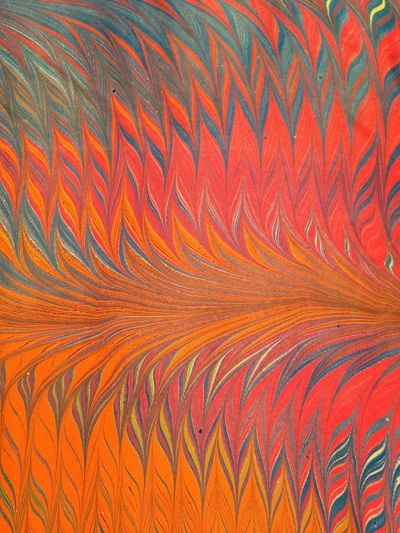 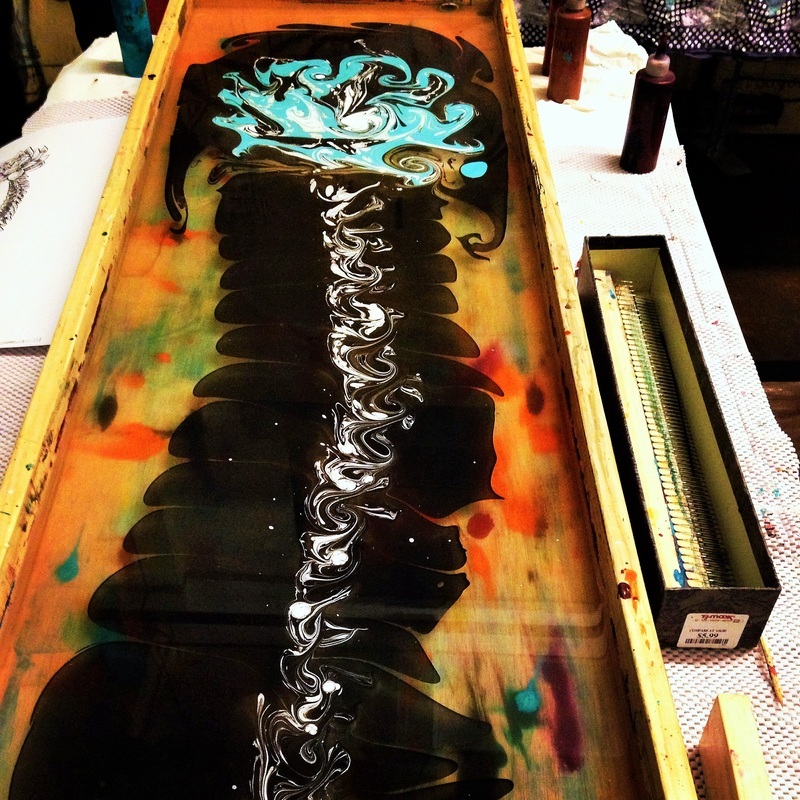 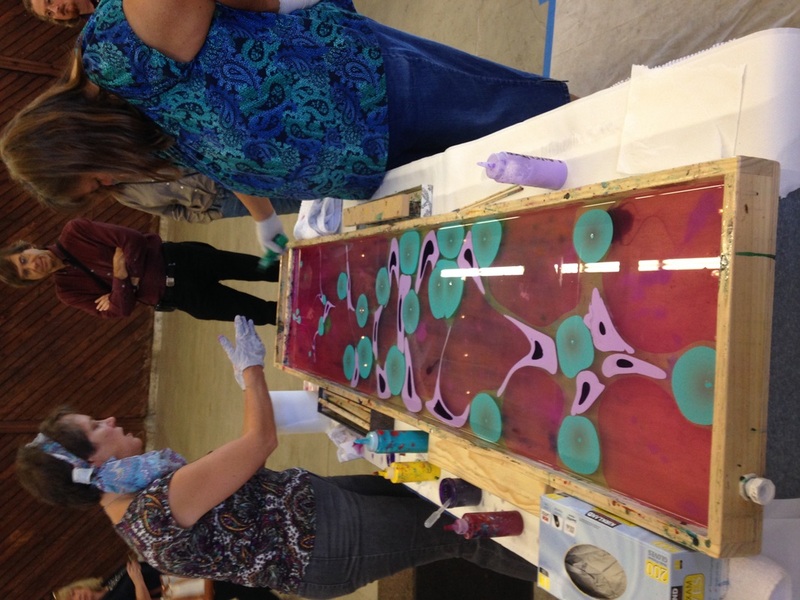 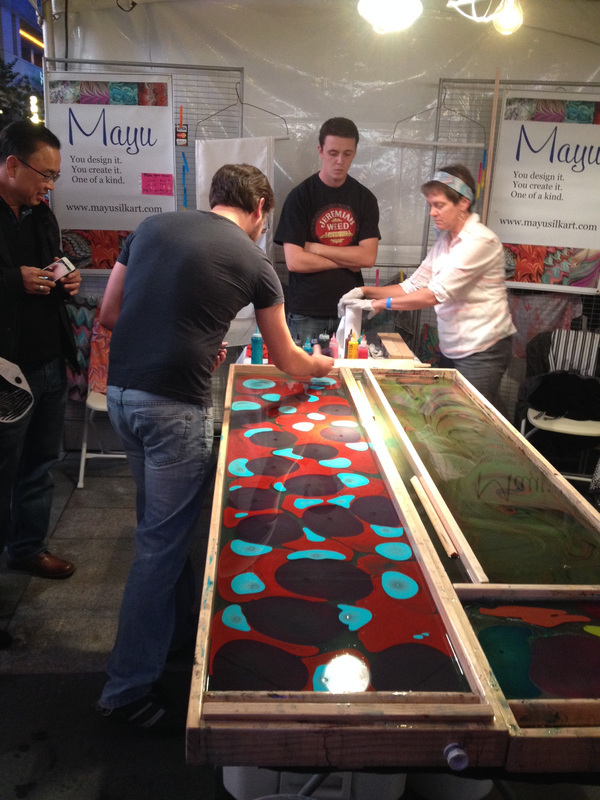 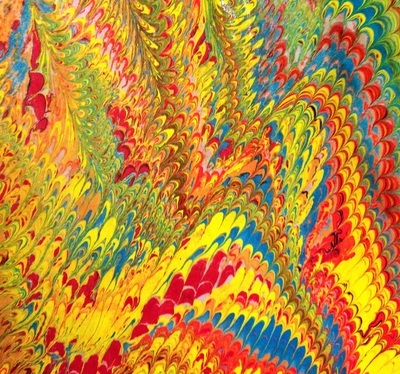 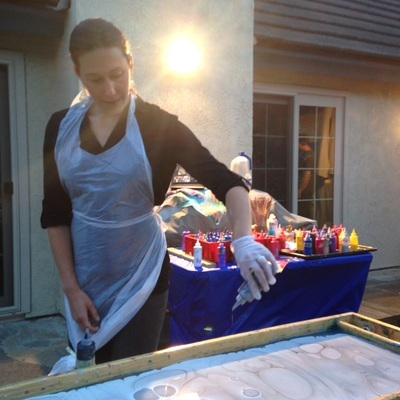 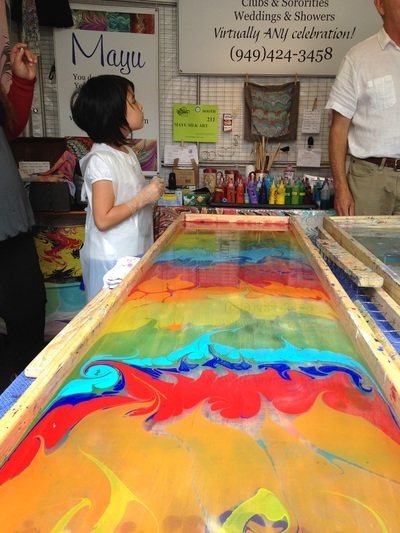 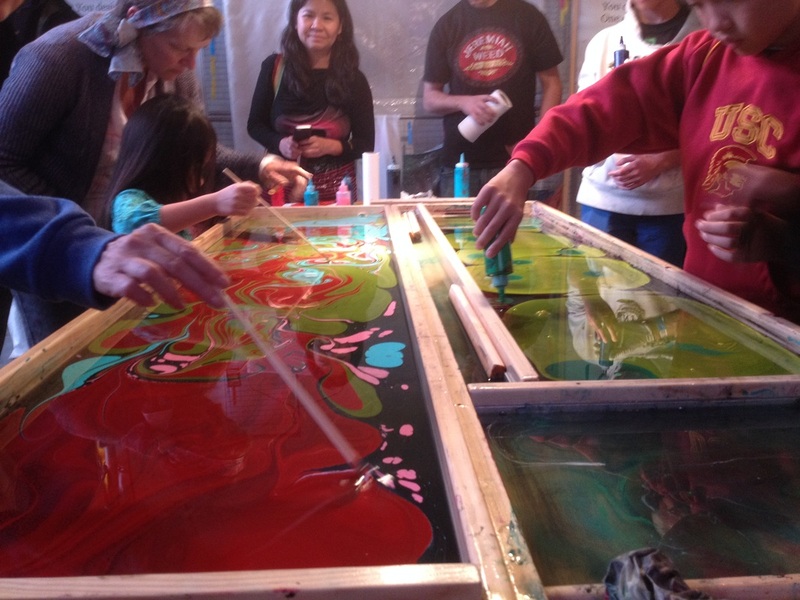 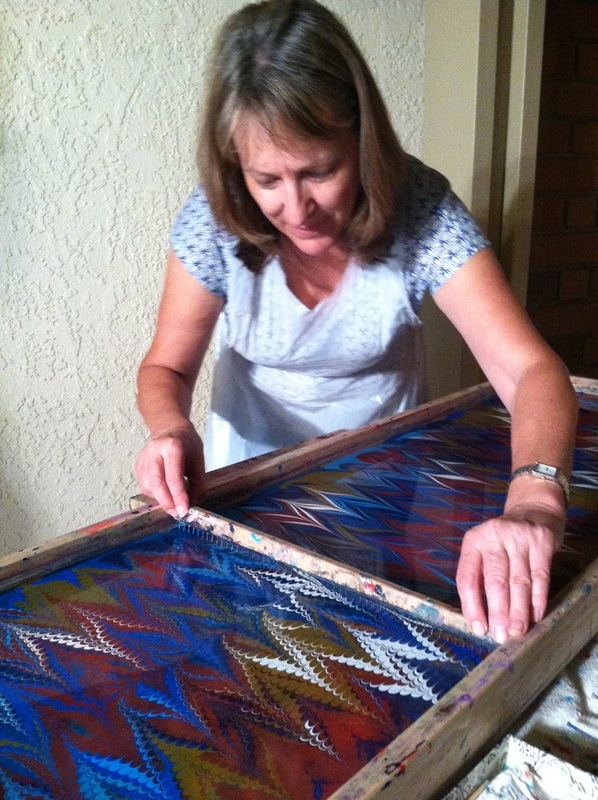 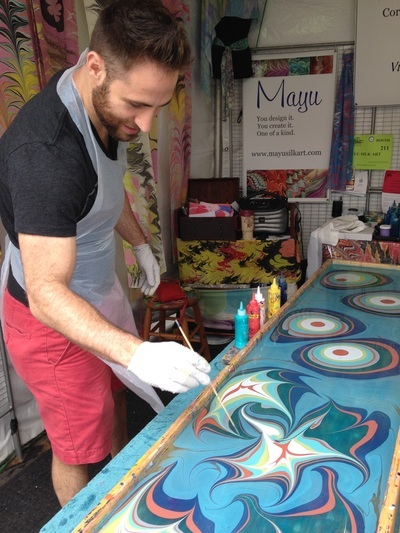 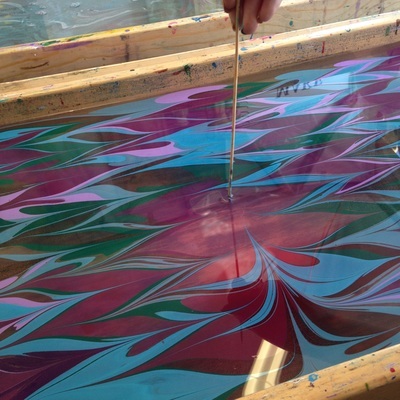 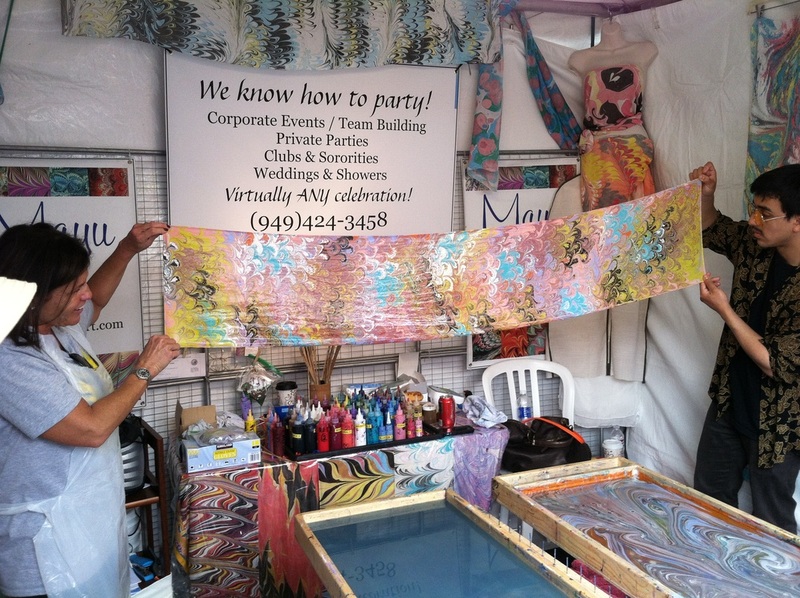 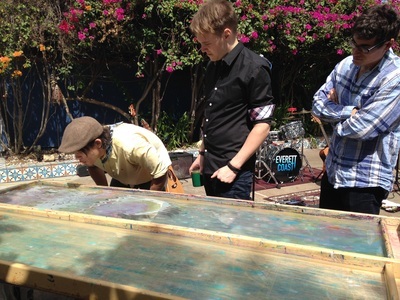 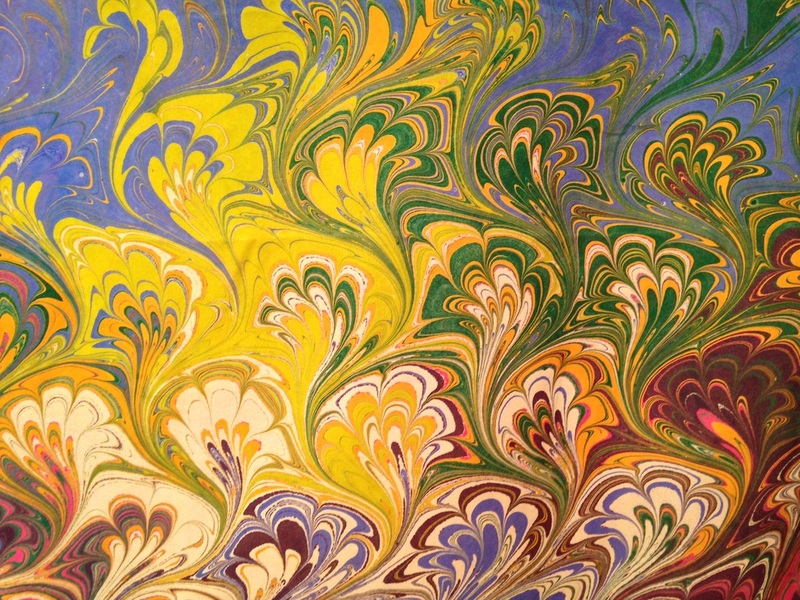 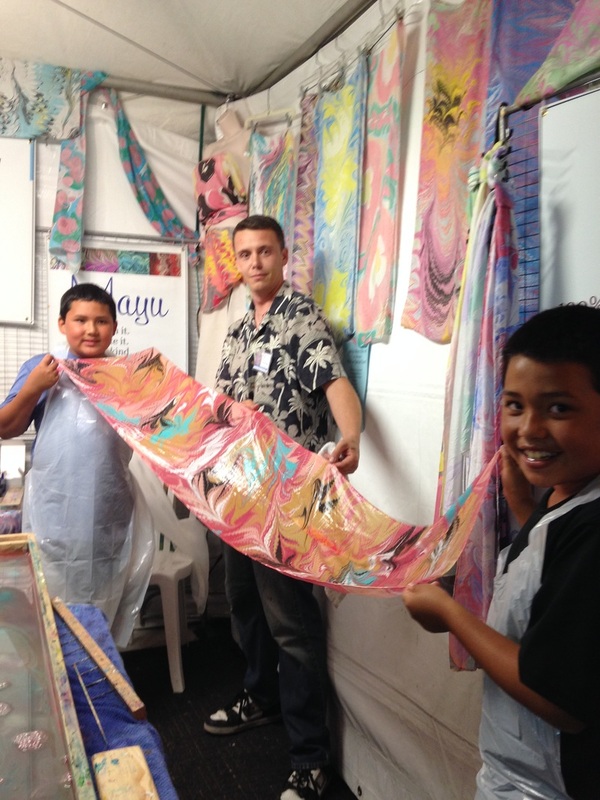 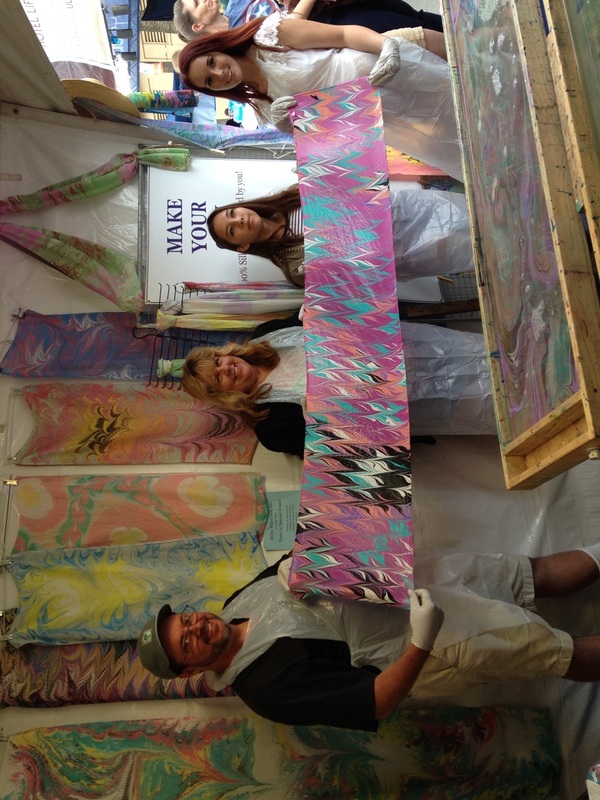 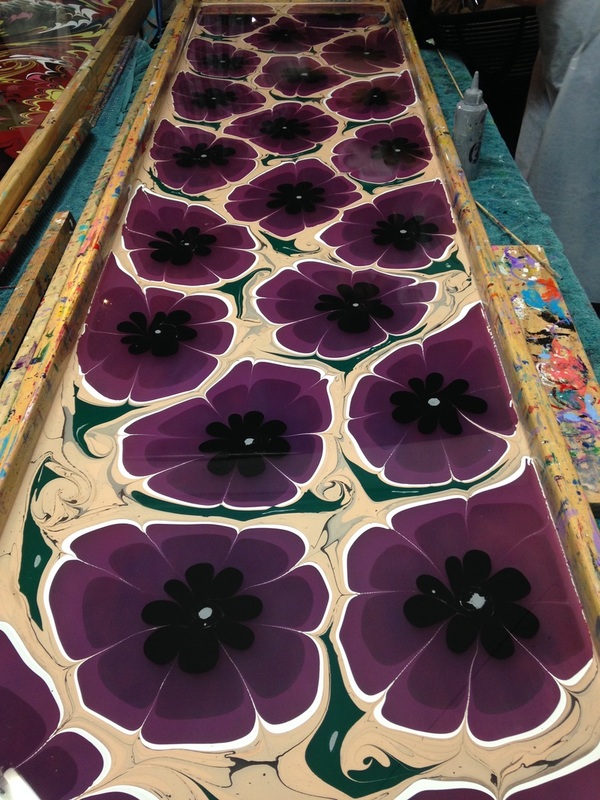 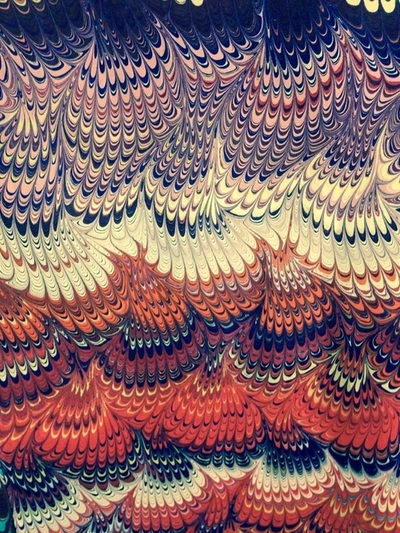 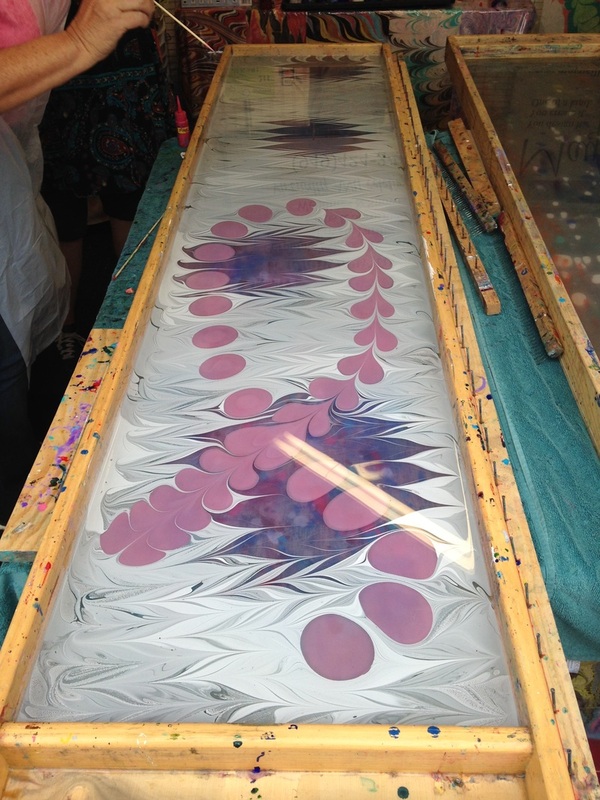 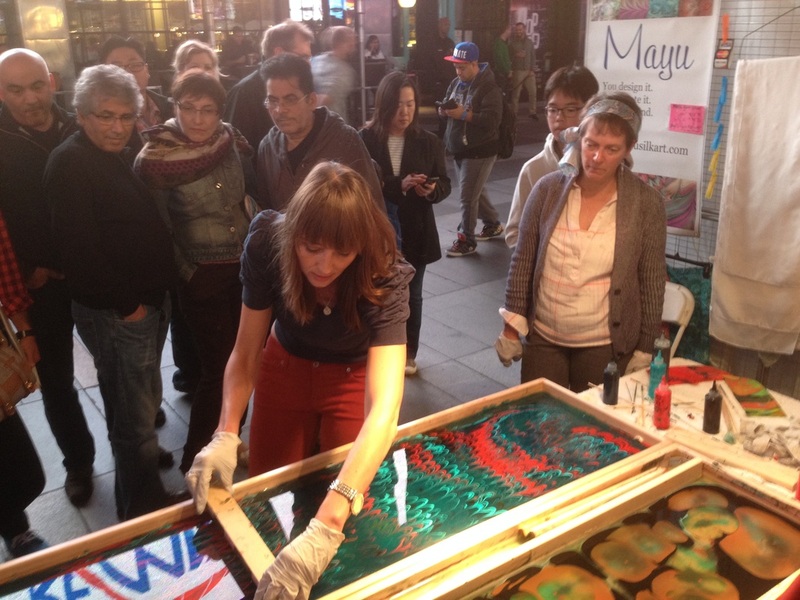 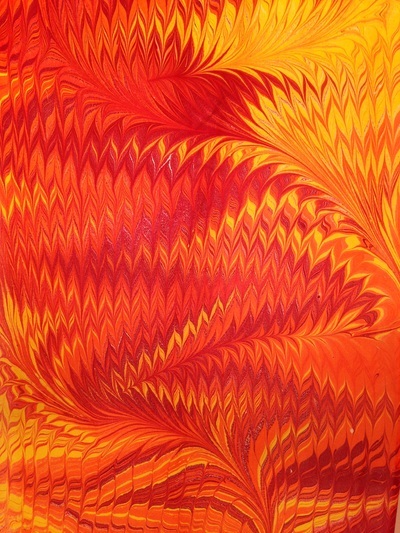 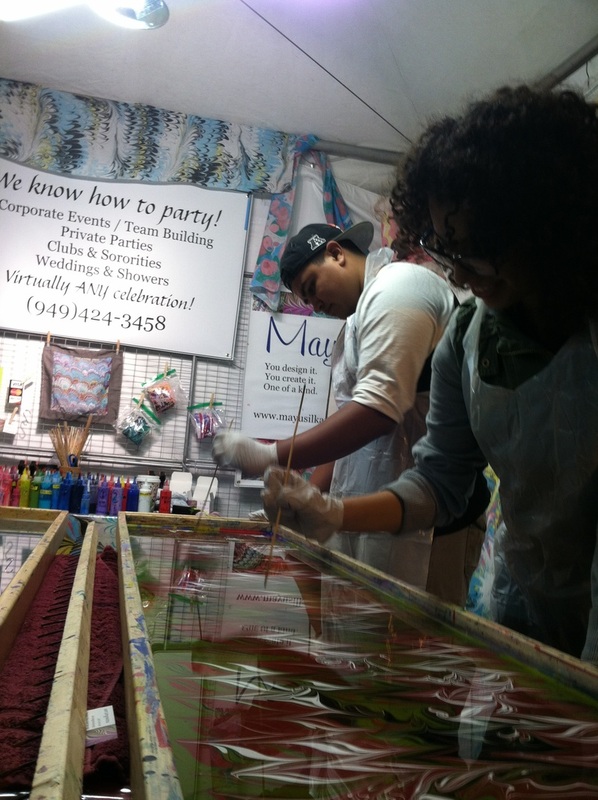 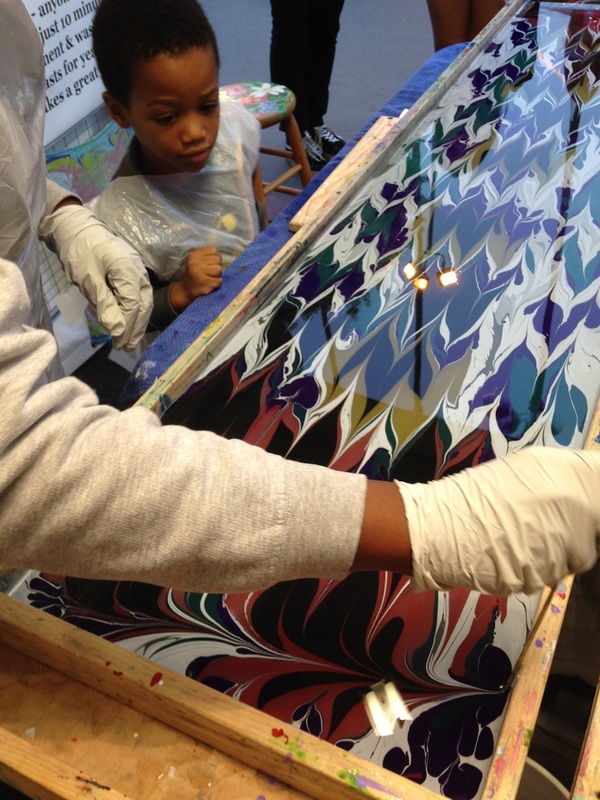 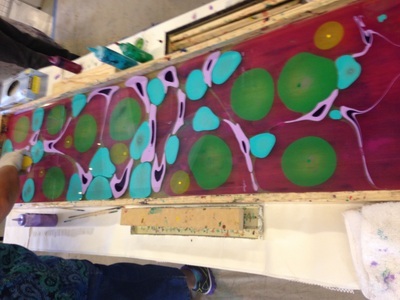 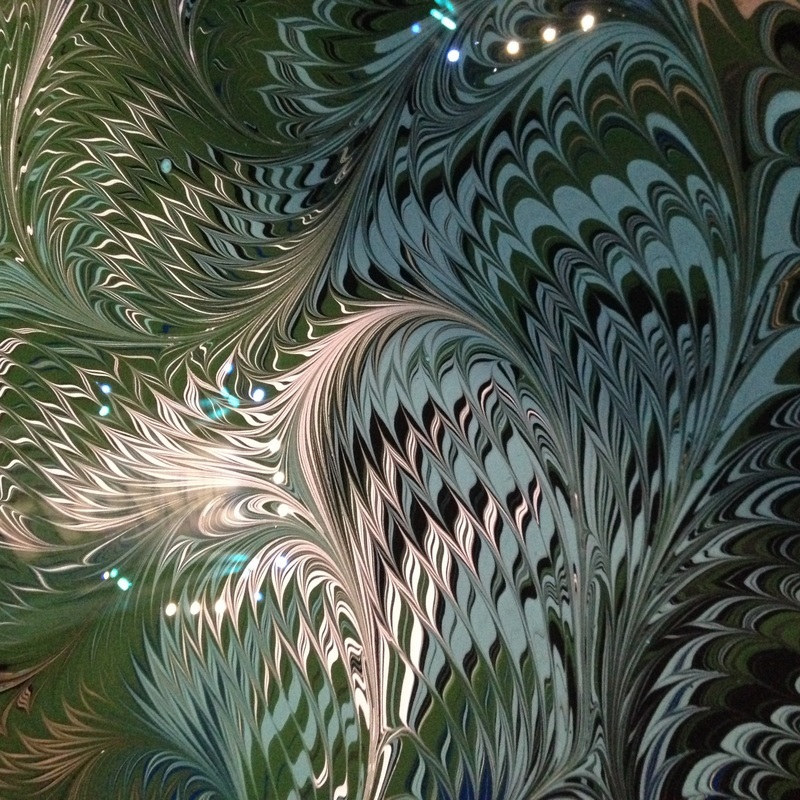 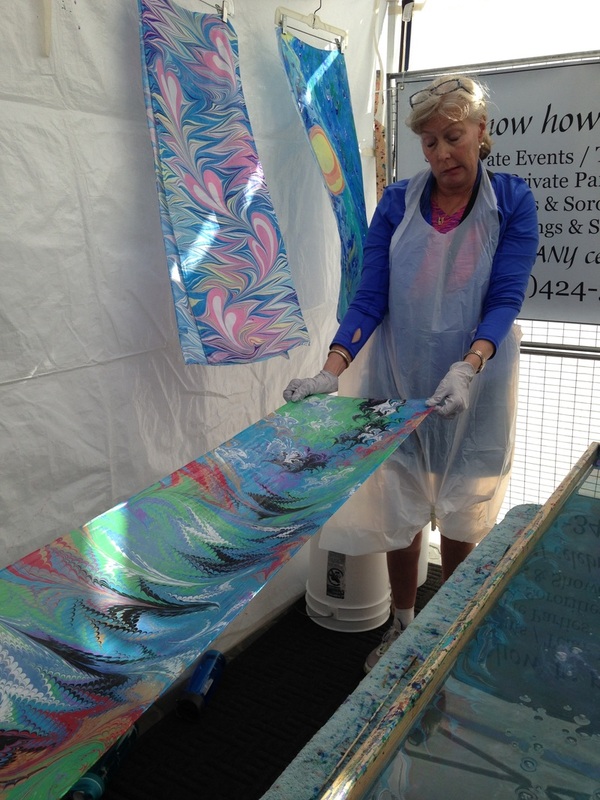 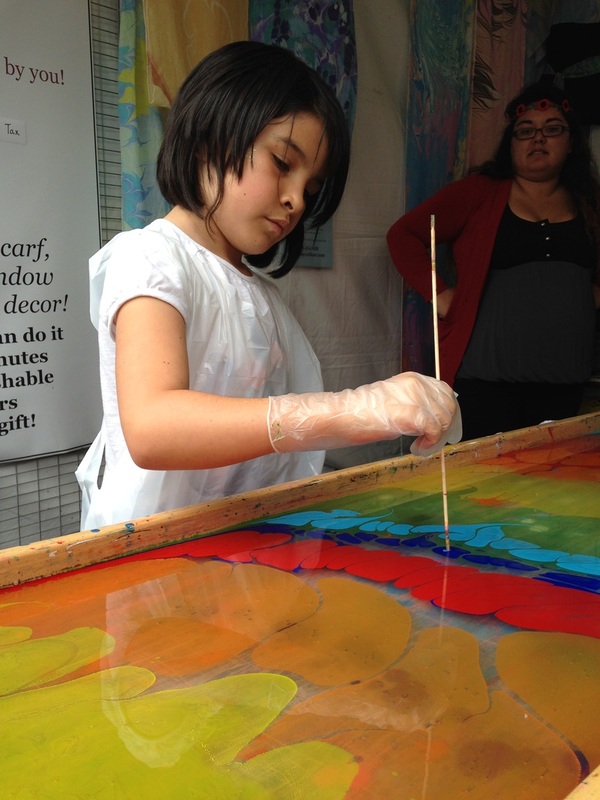 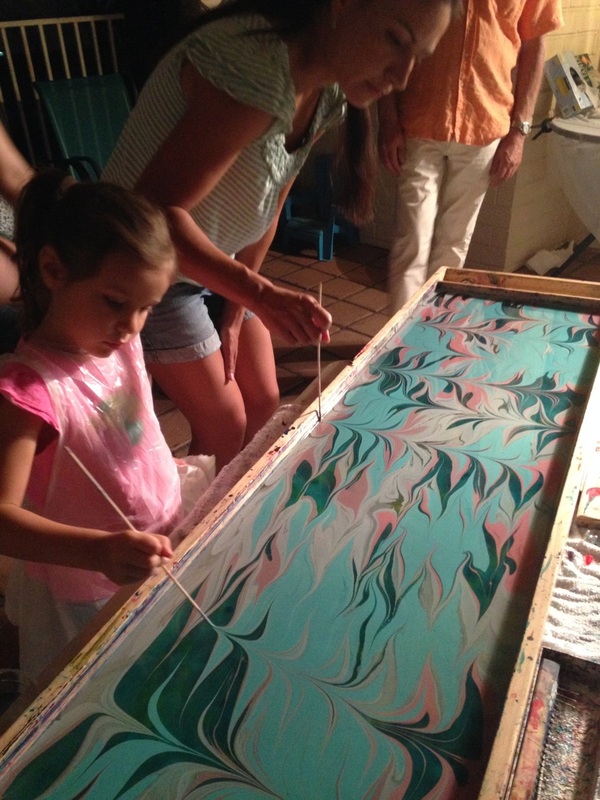 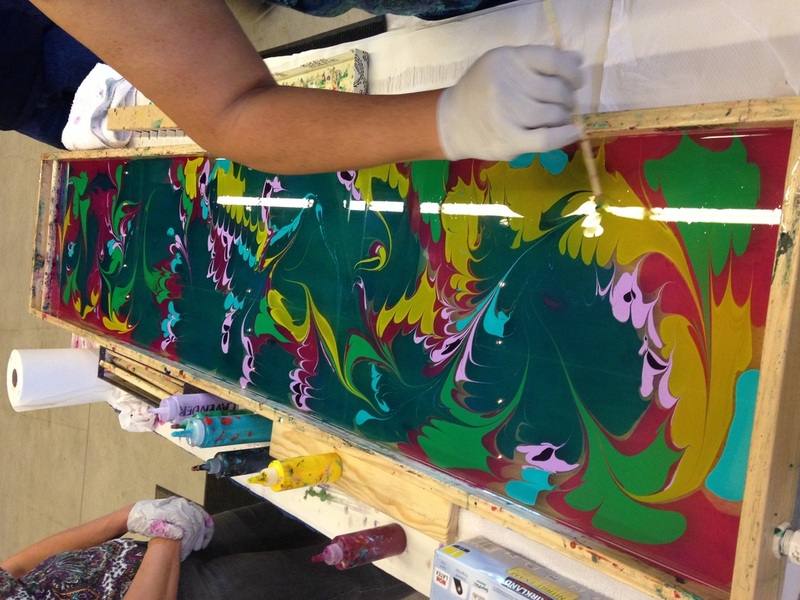 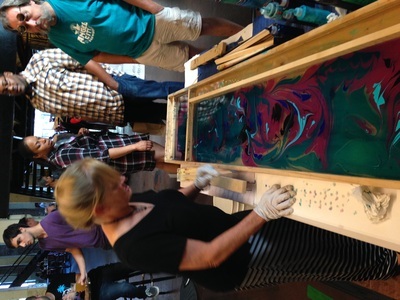 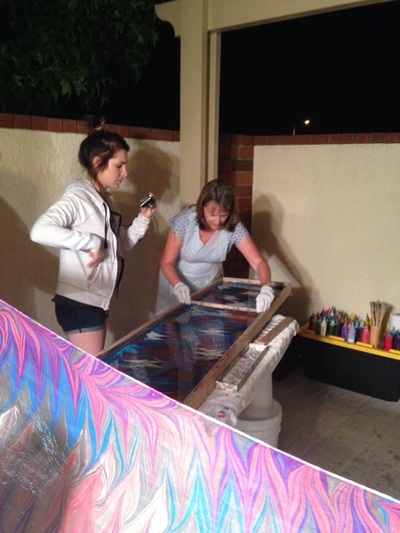 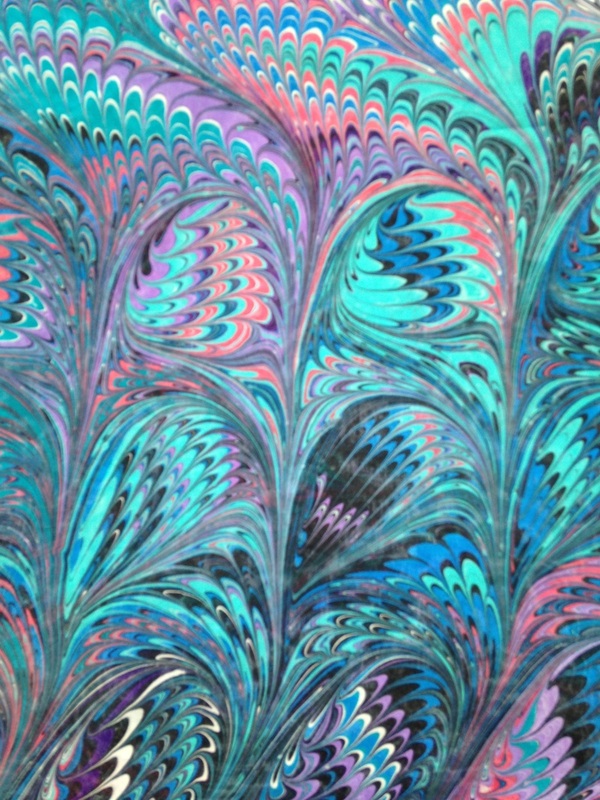 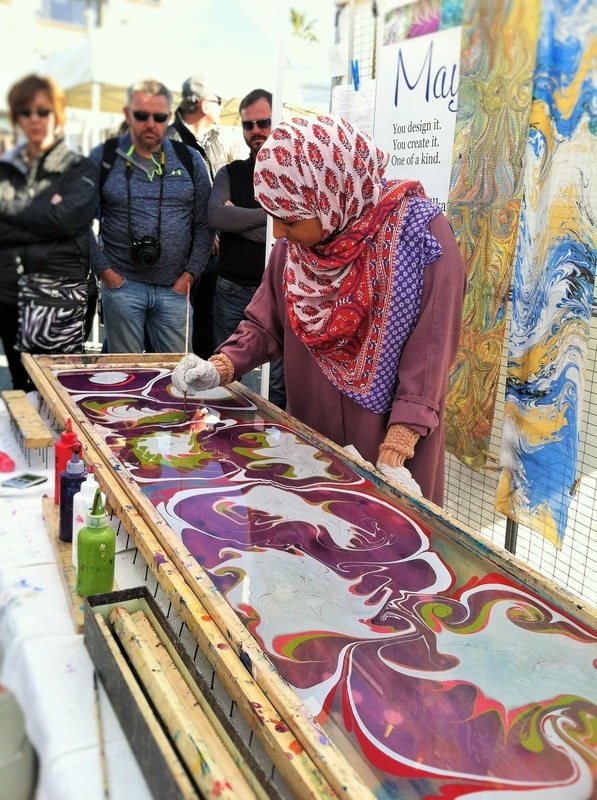 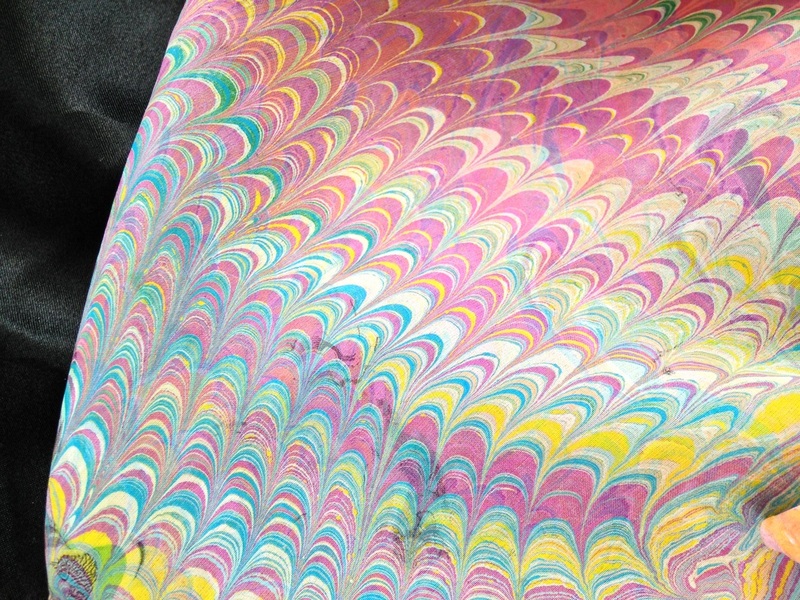 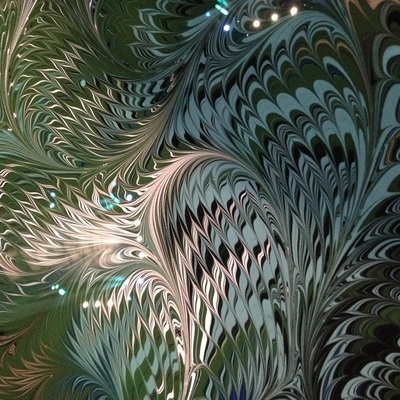 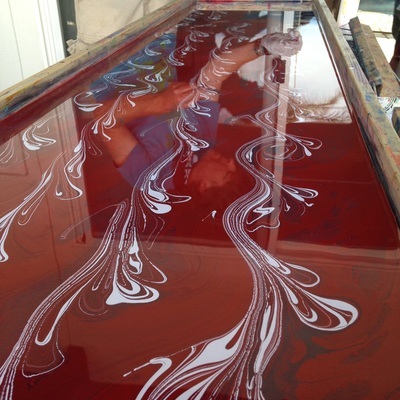 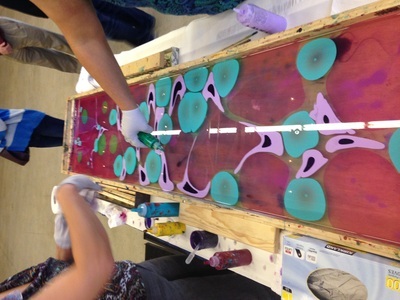 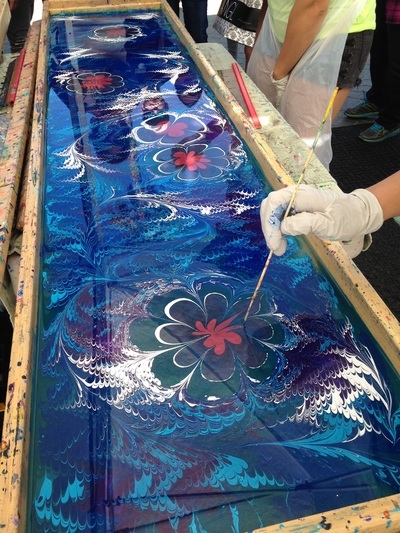 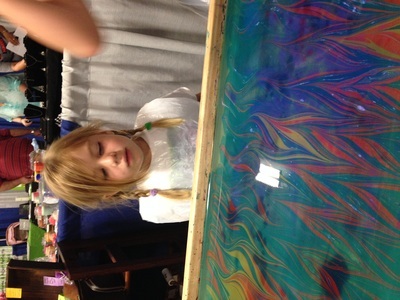 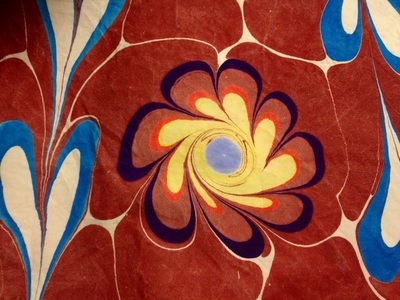 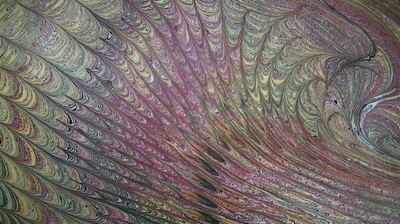 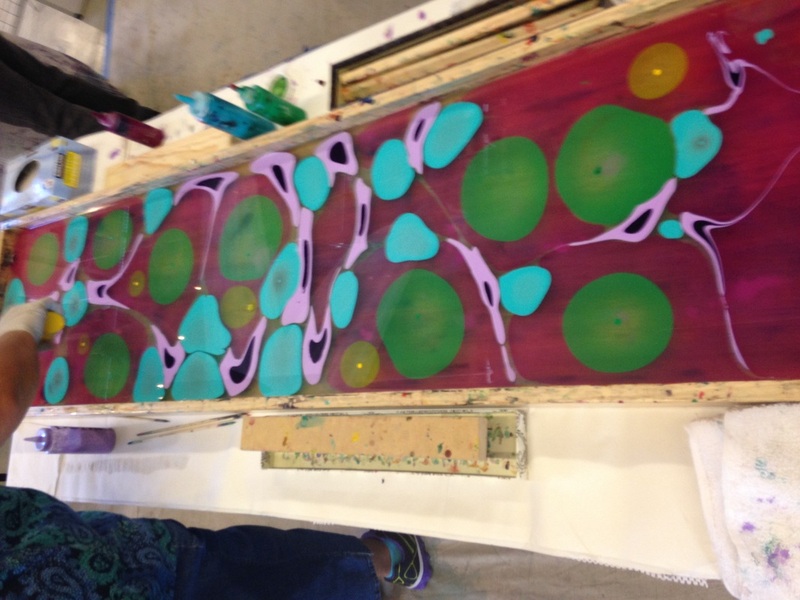 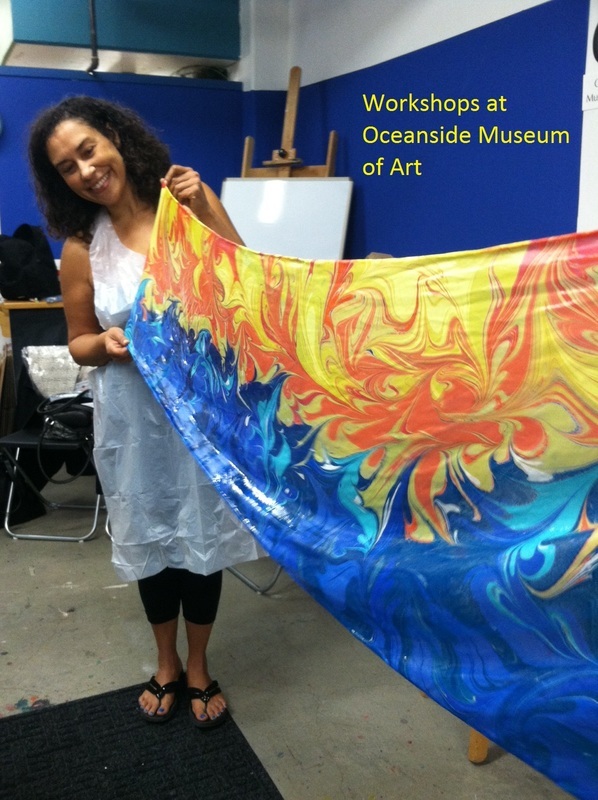 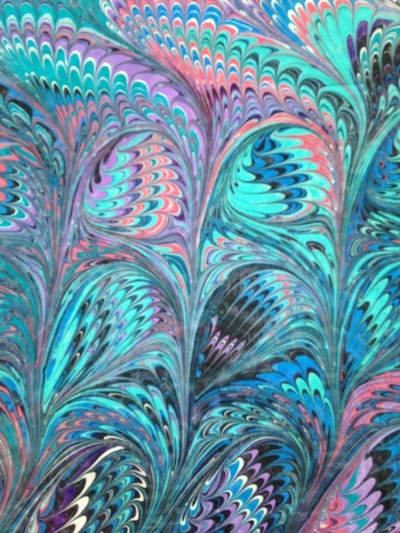 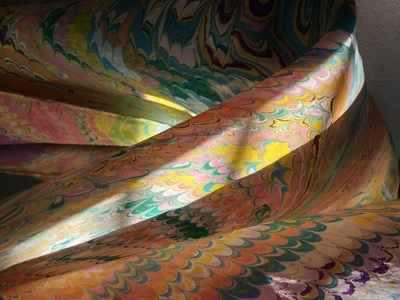 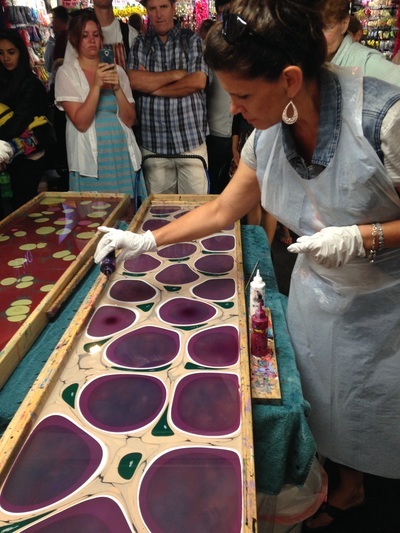 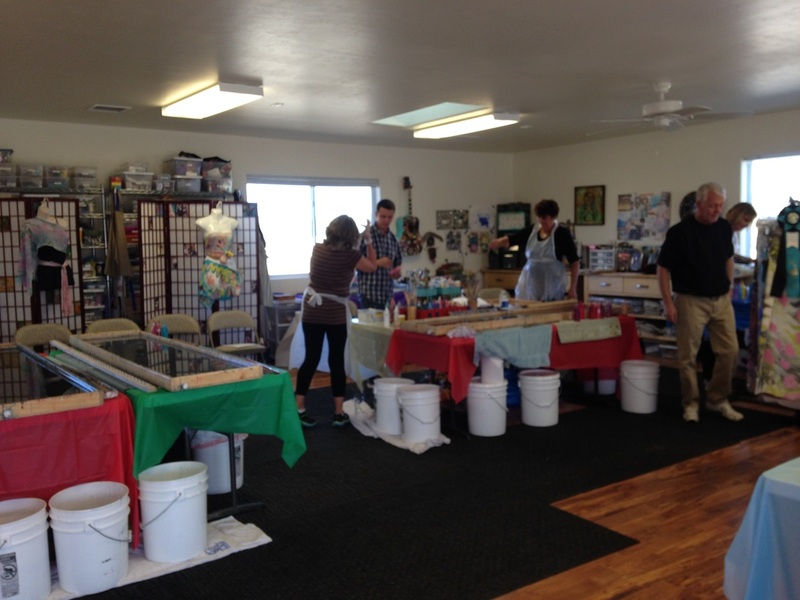 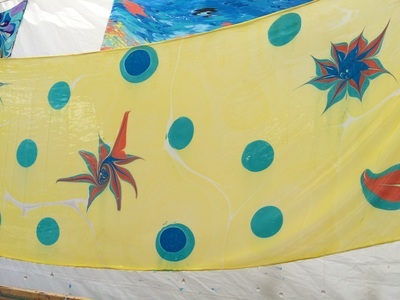 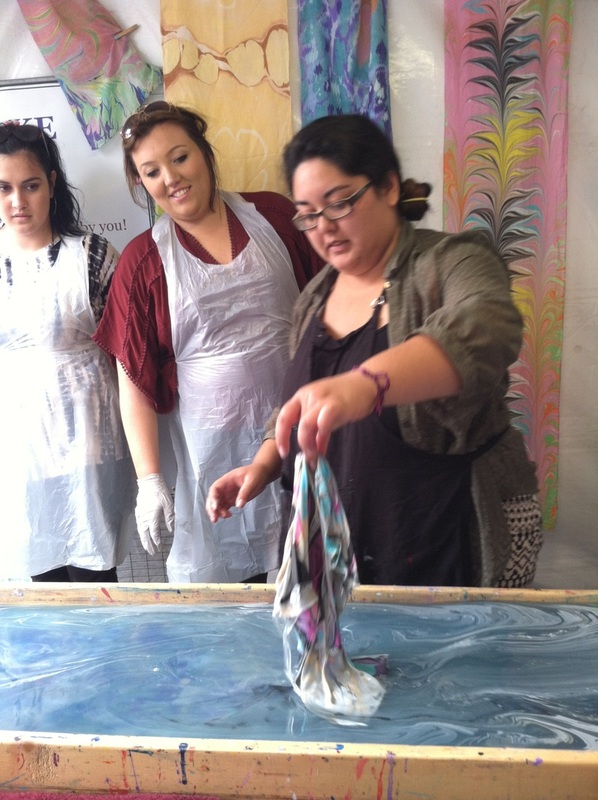 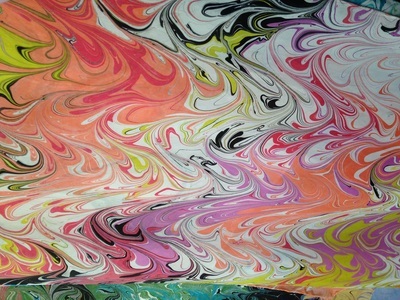 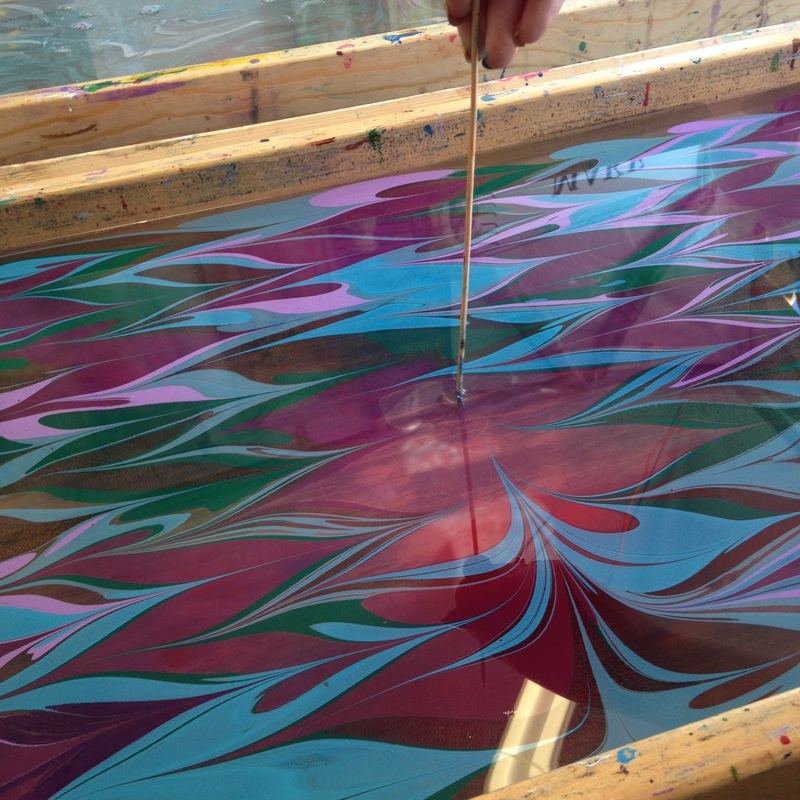 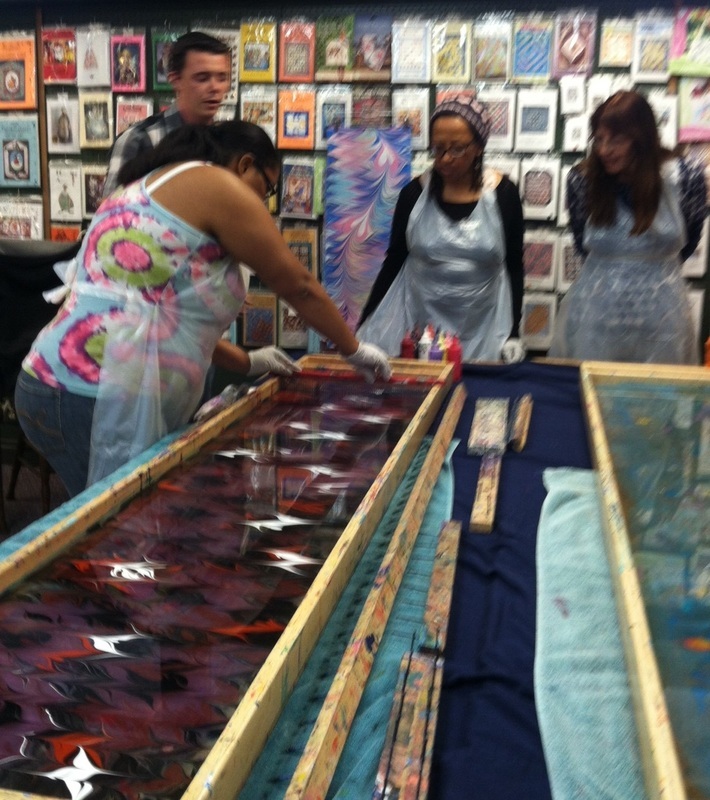 ﻿﻿Help us to spread the word about the amazing Mayu Silk Art Experience! Tell others through word of mouth or on social media platforms. Write a review, follow us on social media, or invite us to do a presentation for your club, art league, service group, or foundation. MARCH 2016 - From CA to AZ and back! 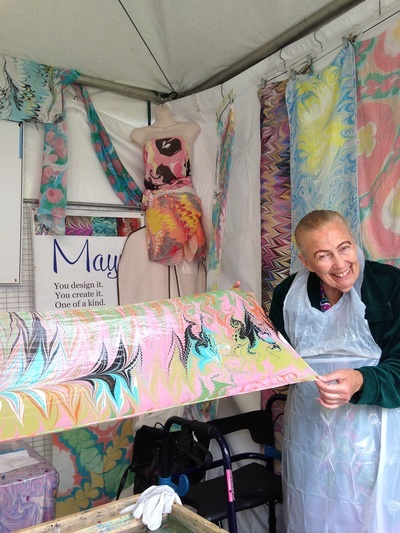 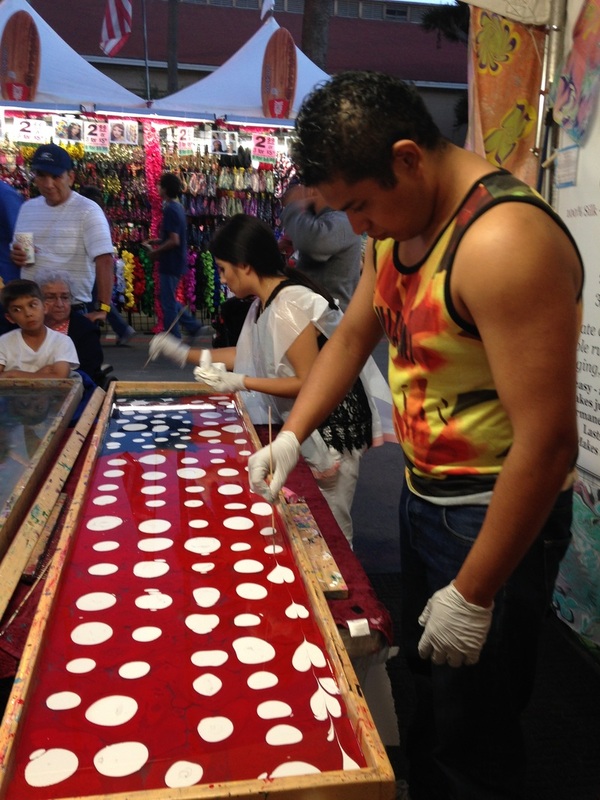 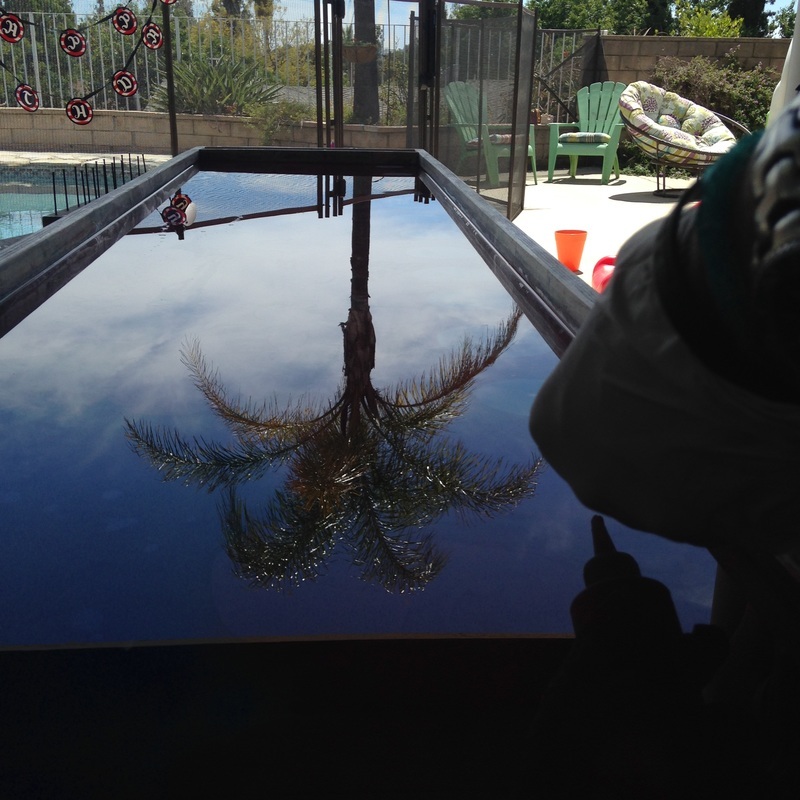 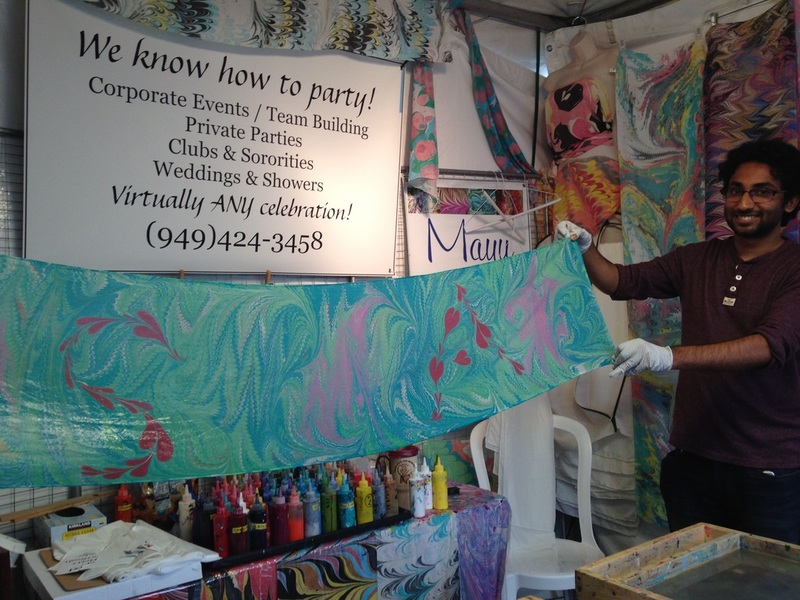 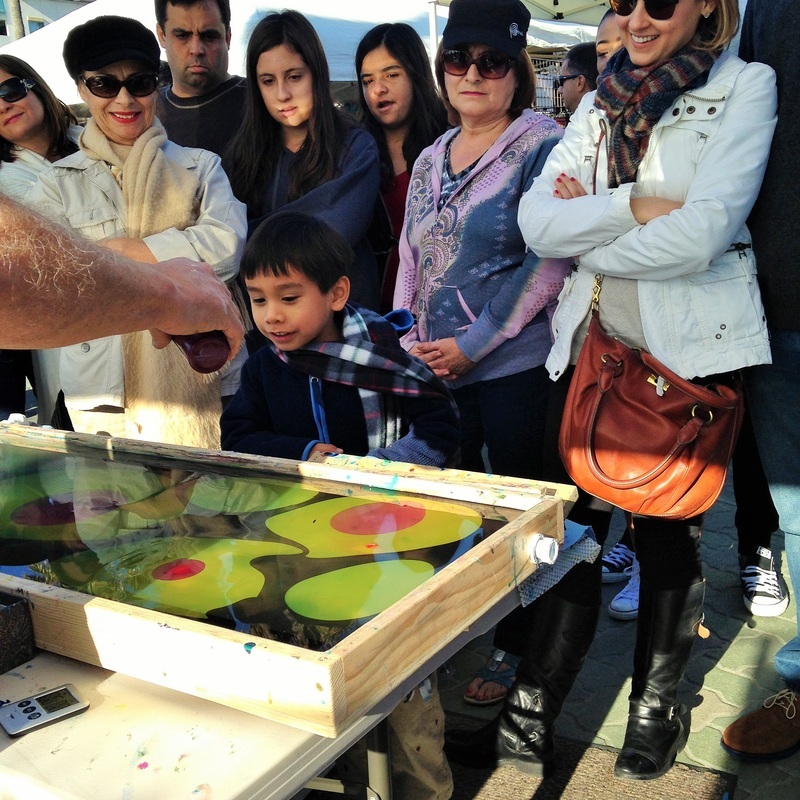 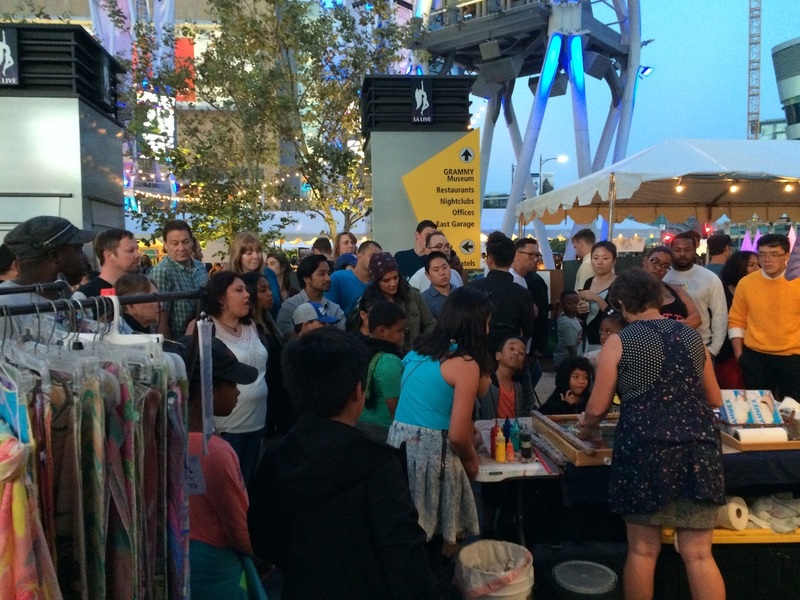 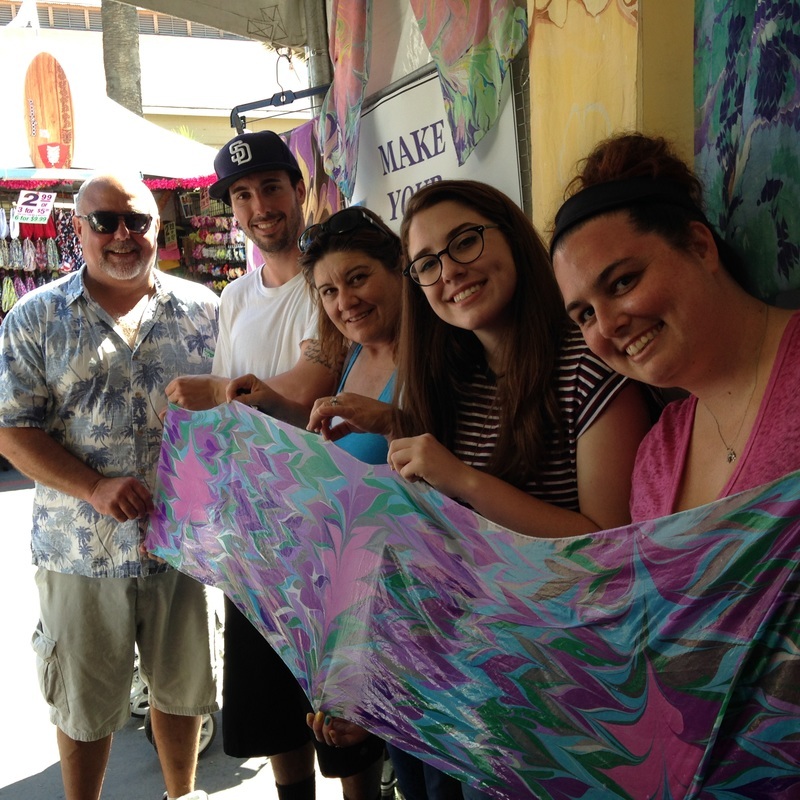 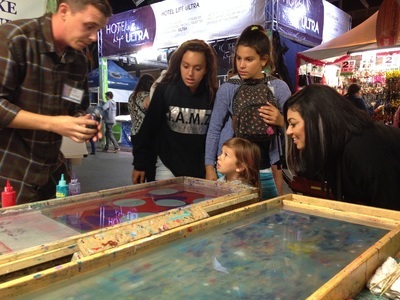 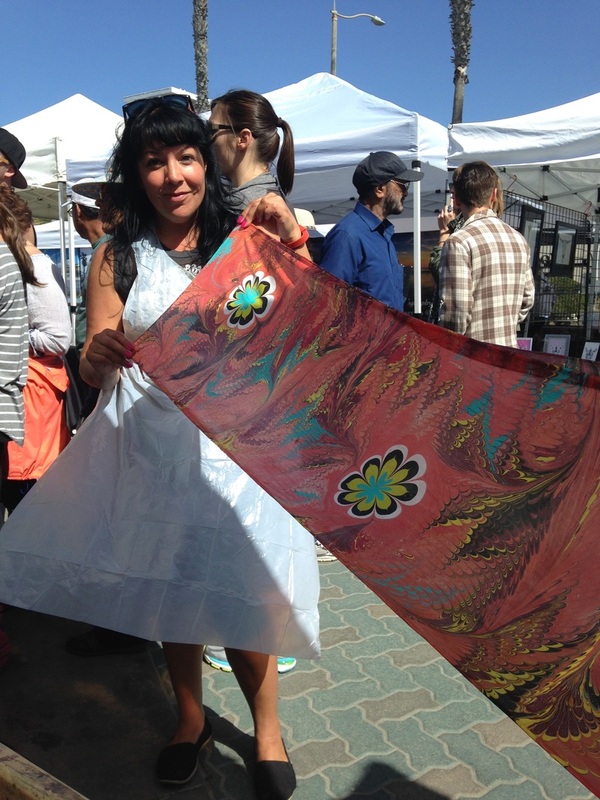 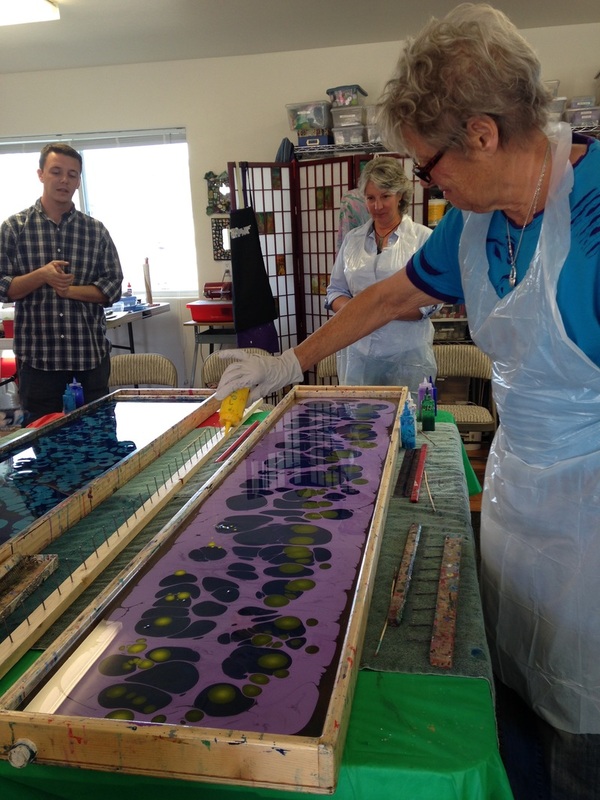 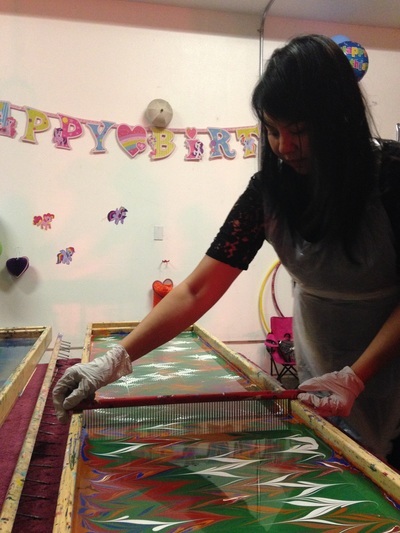 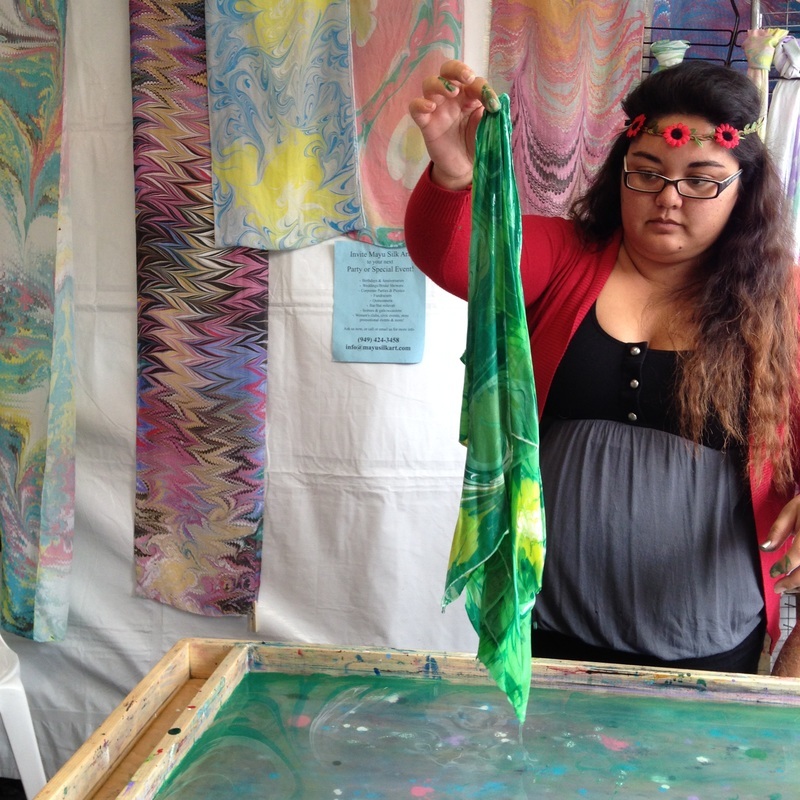 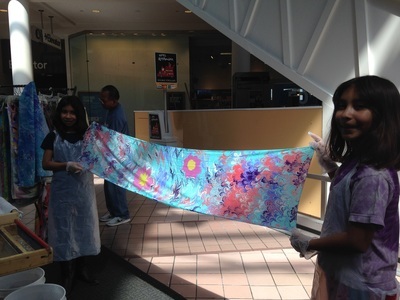 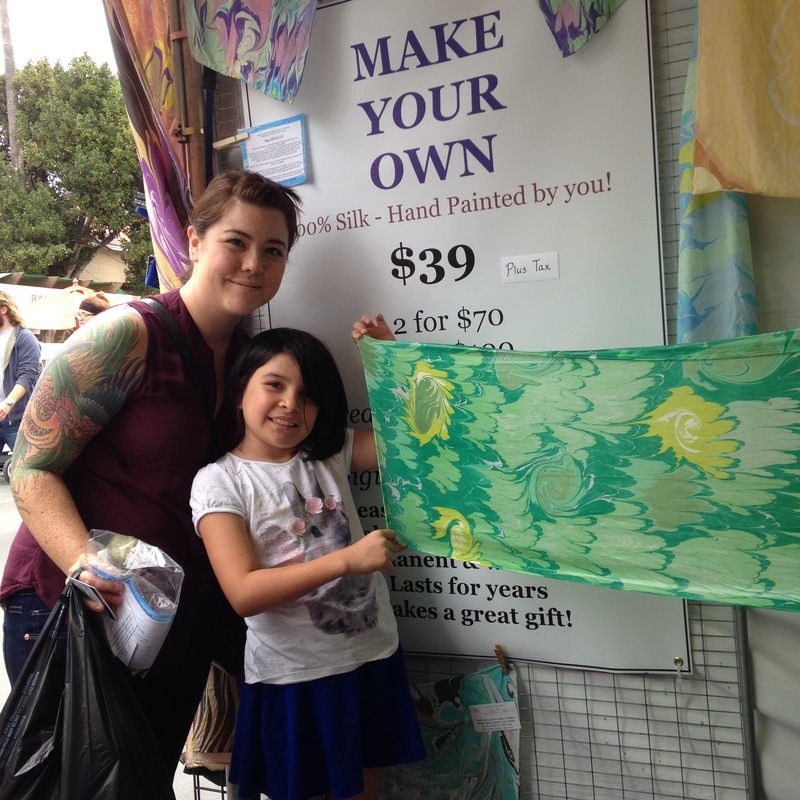 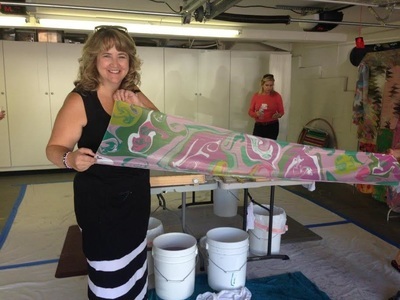 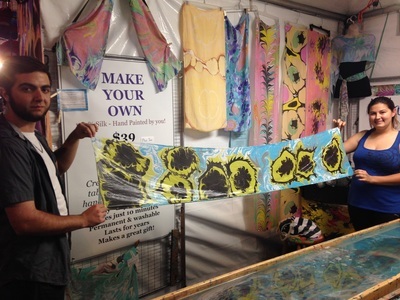 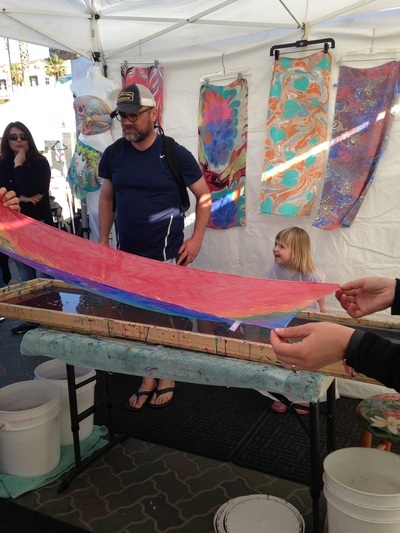 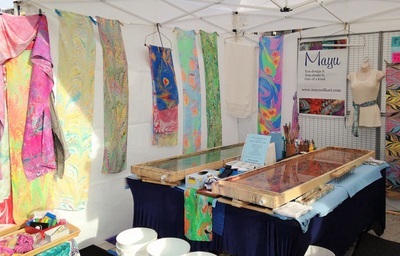 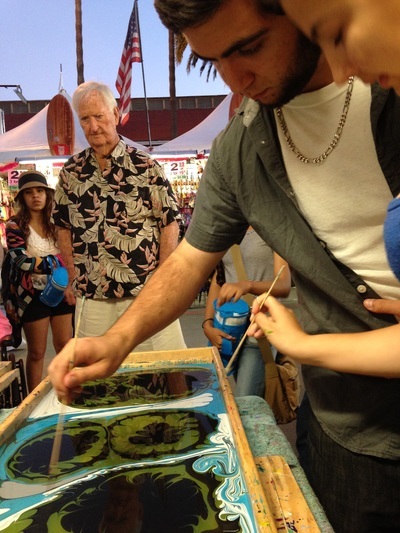 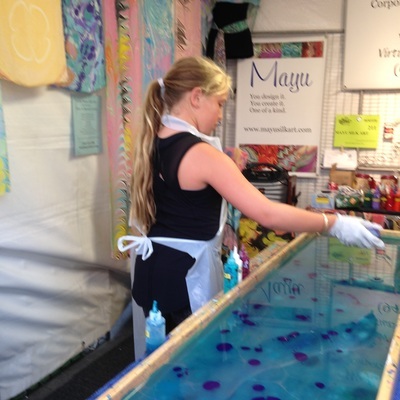 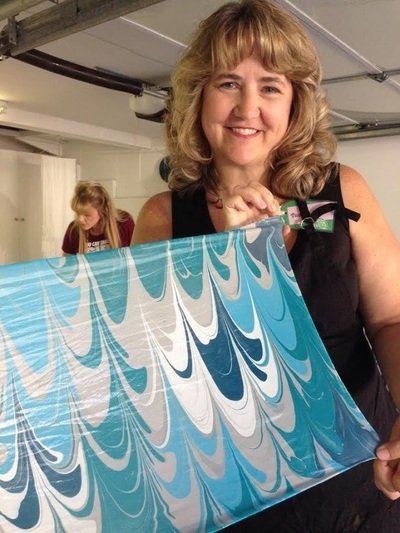 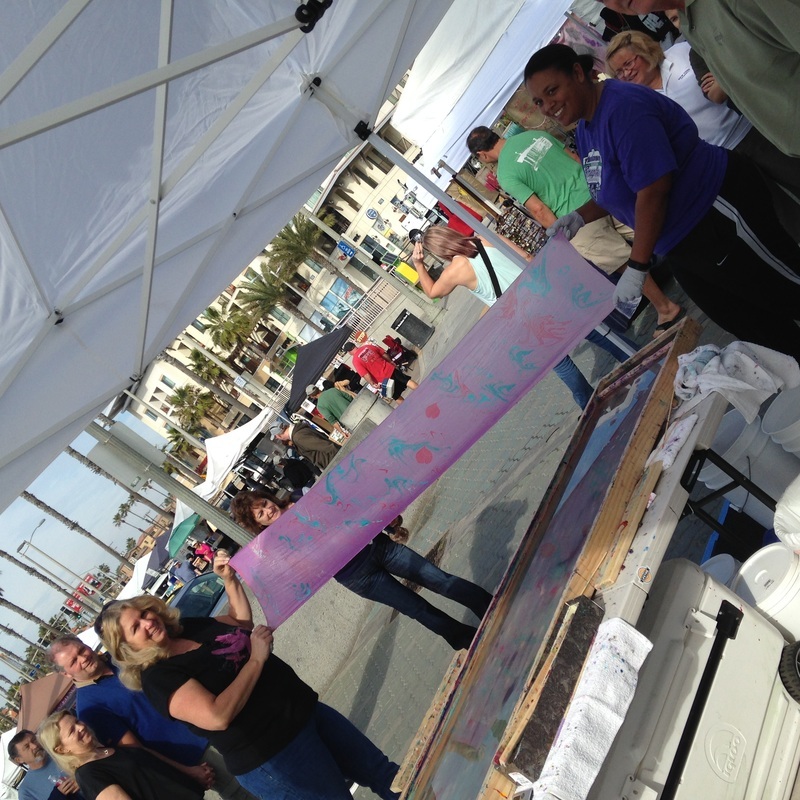 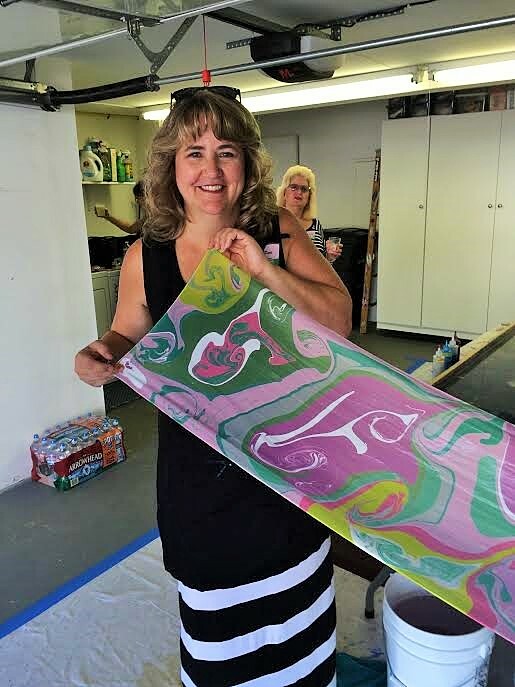 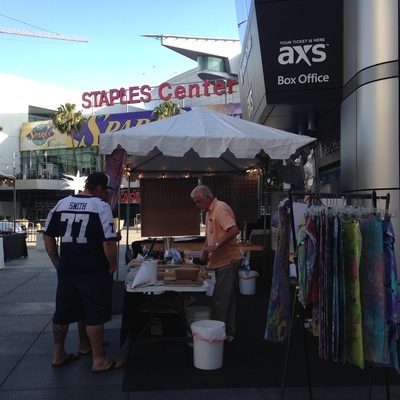 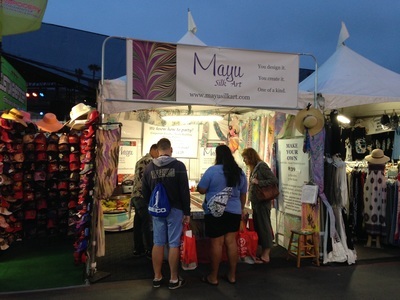 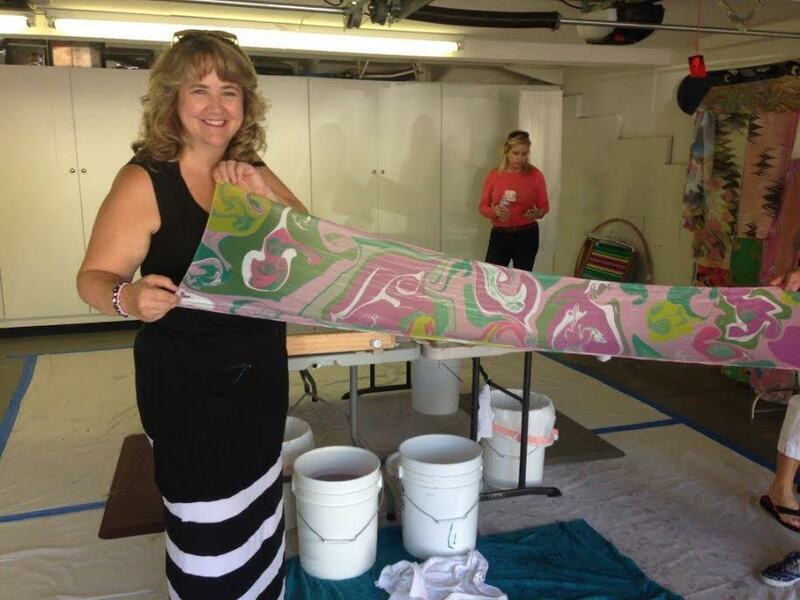 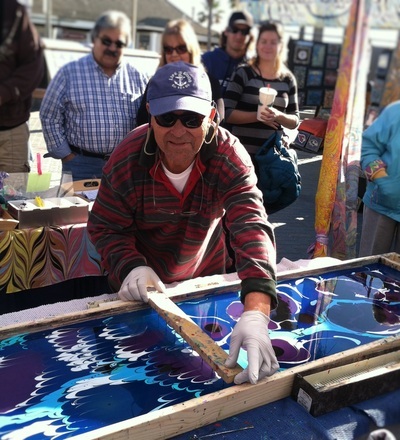 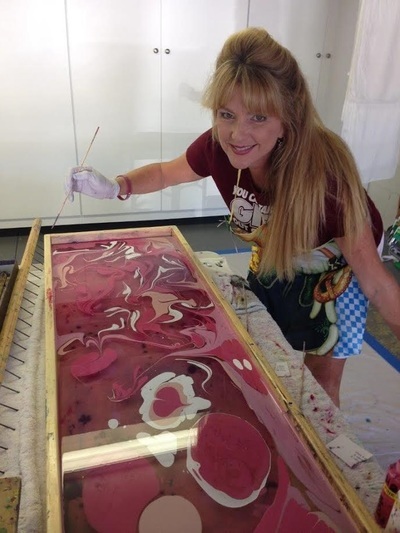 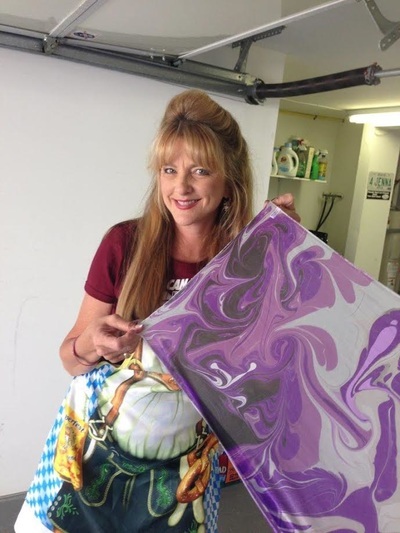 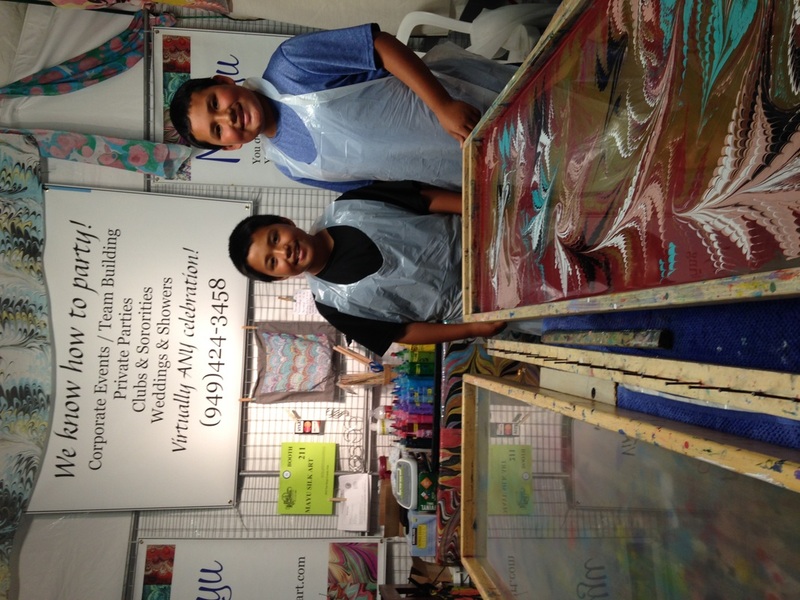 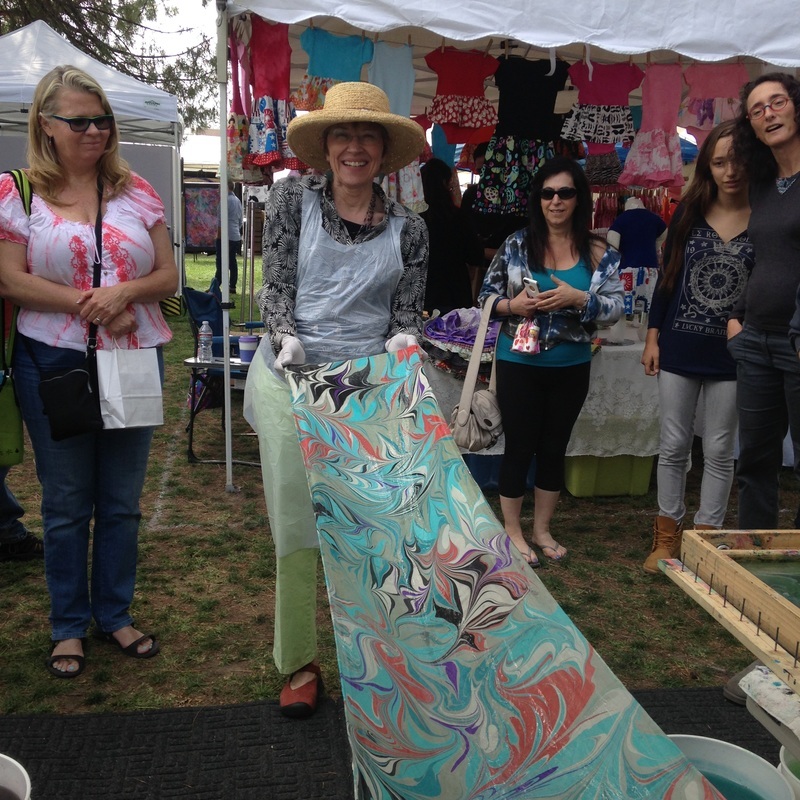 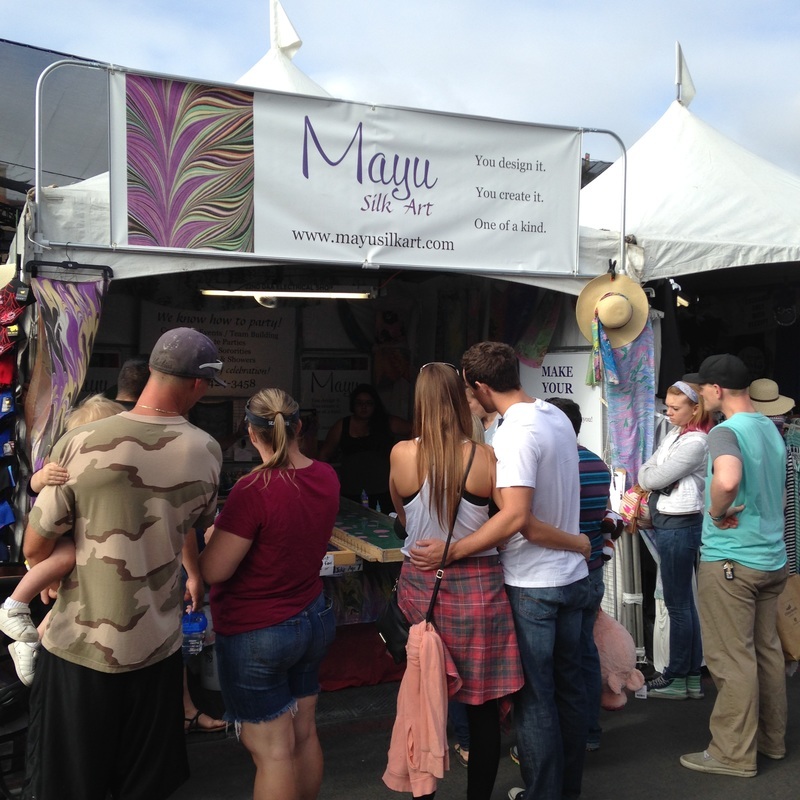 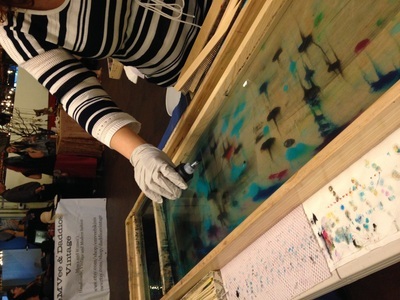 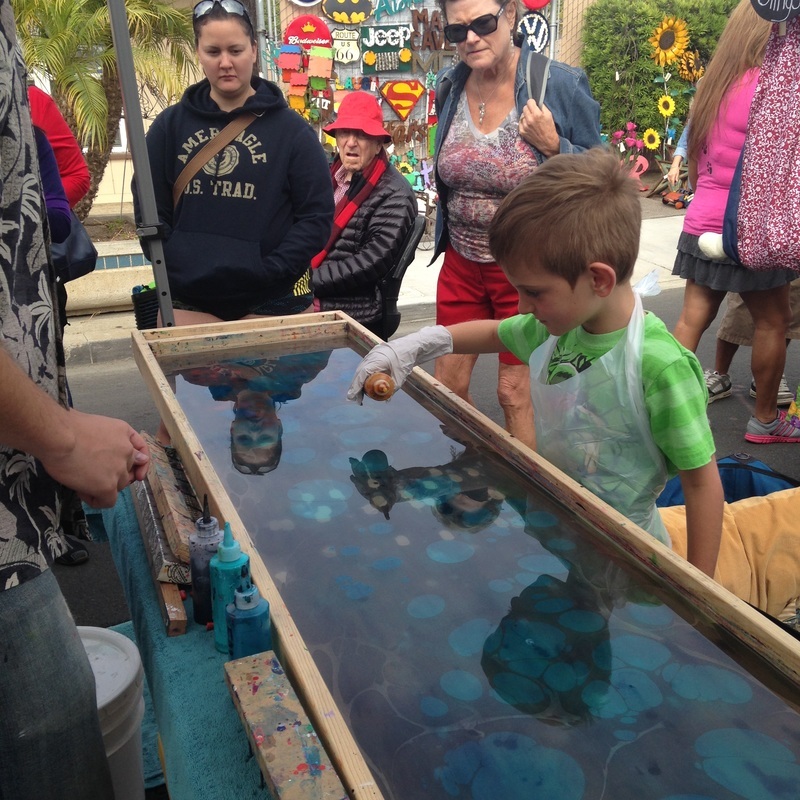 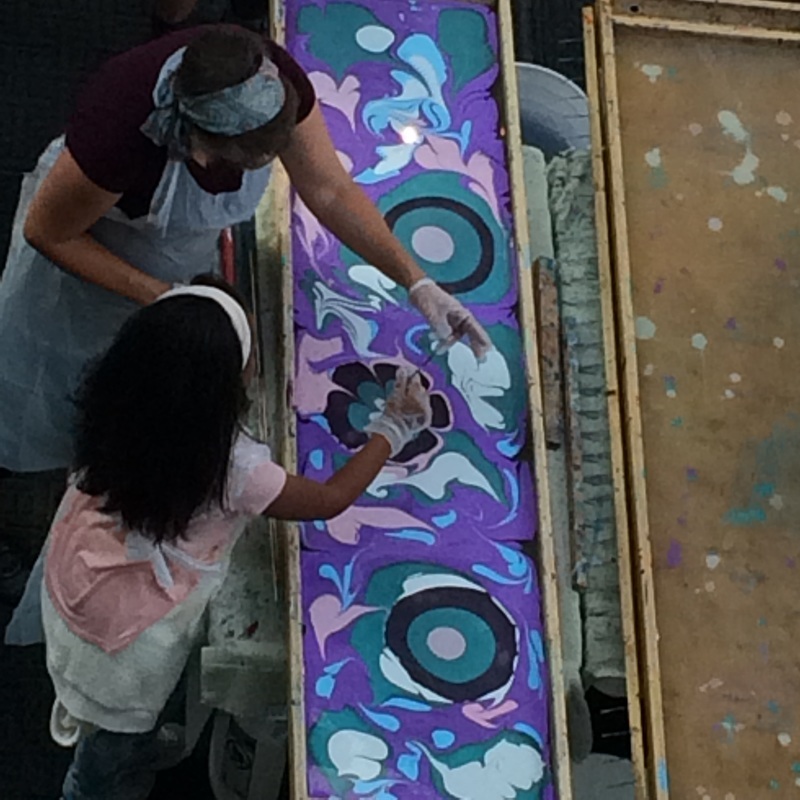 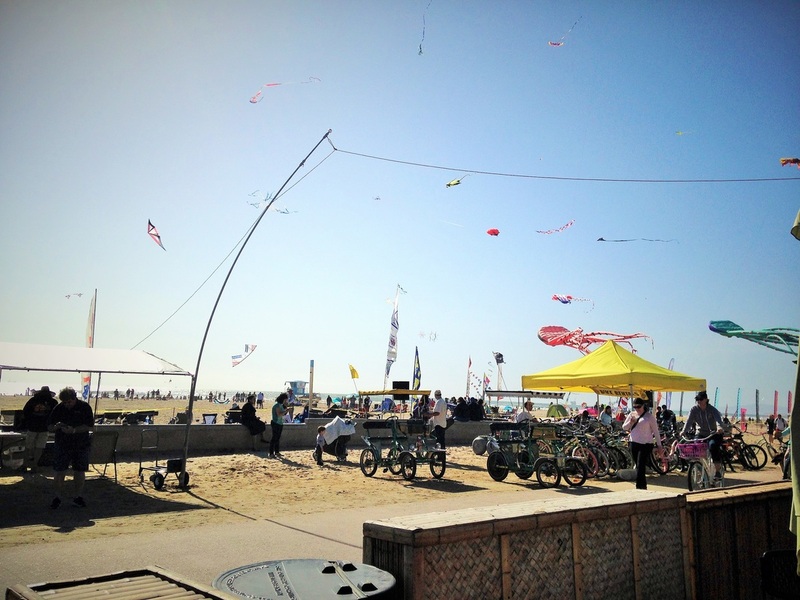 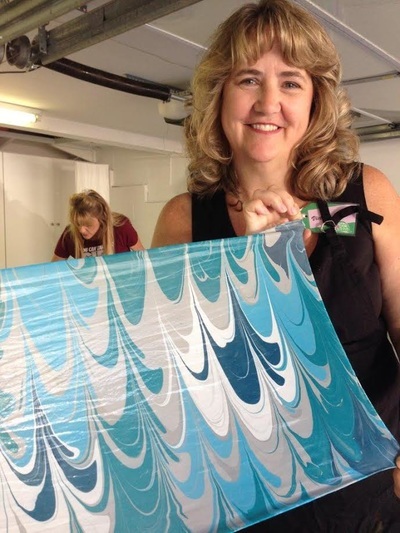 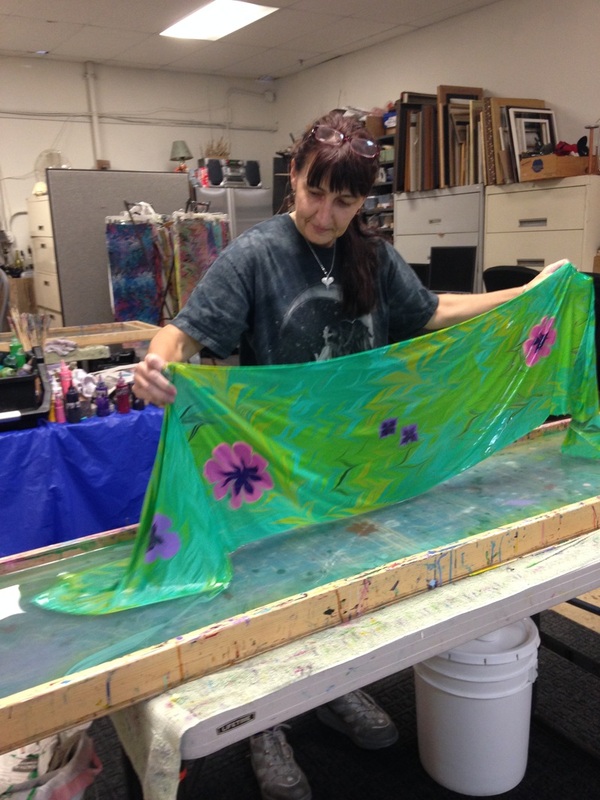 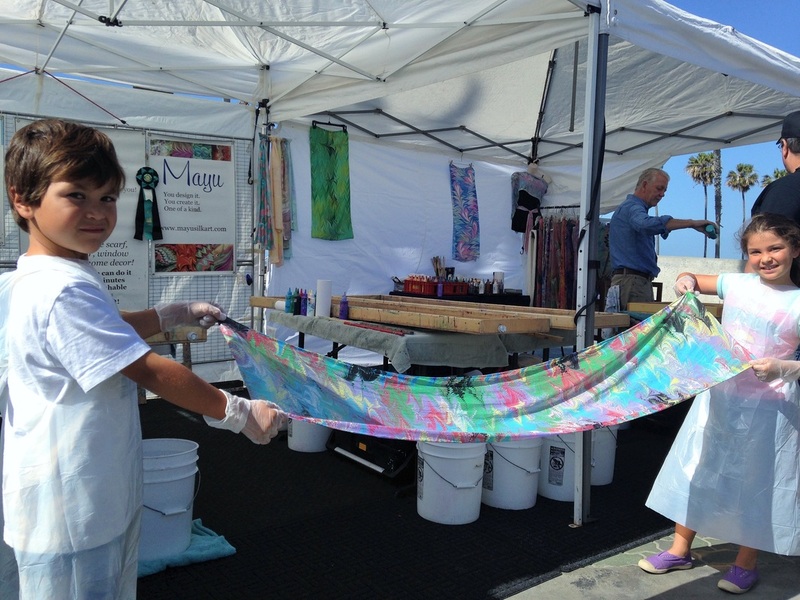 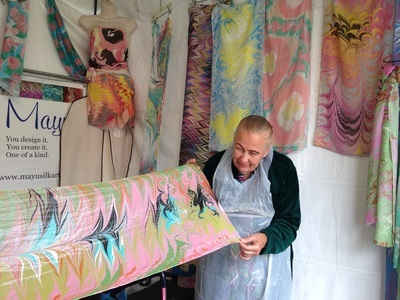 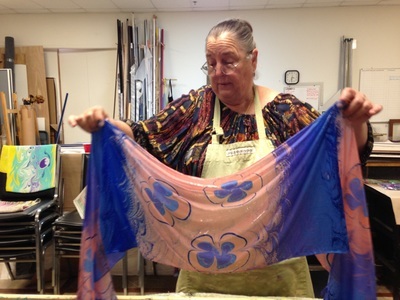 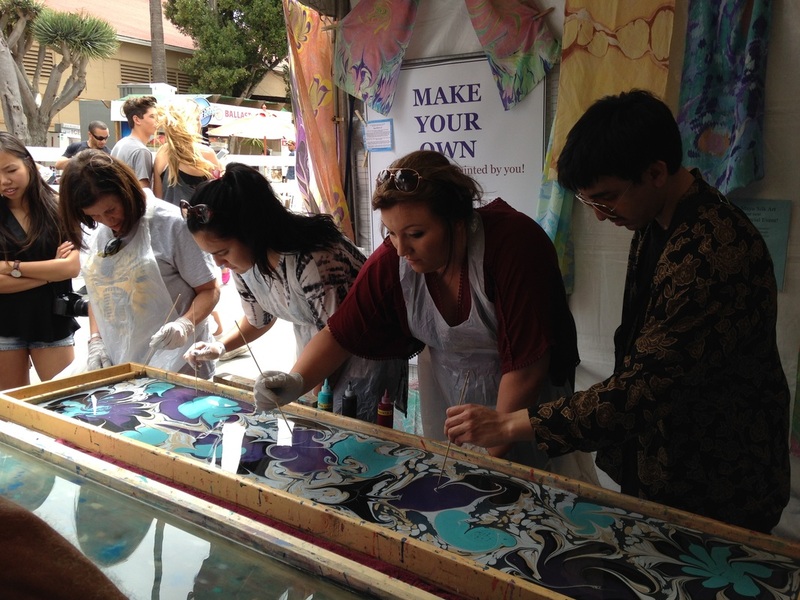 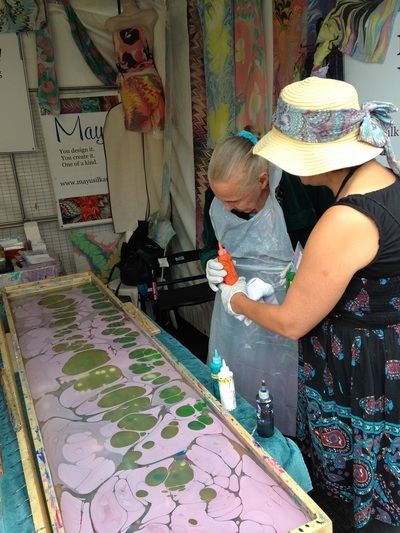 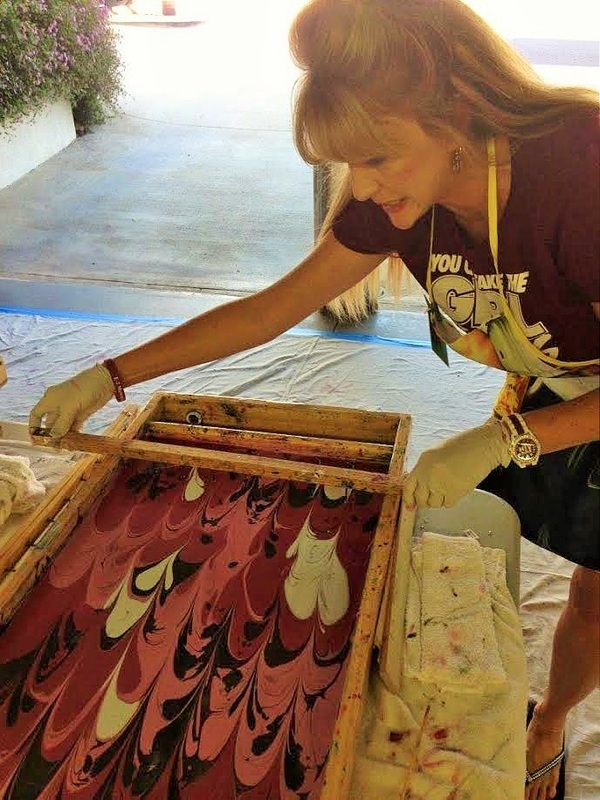 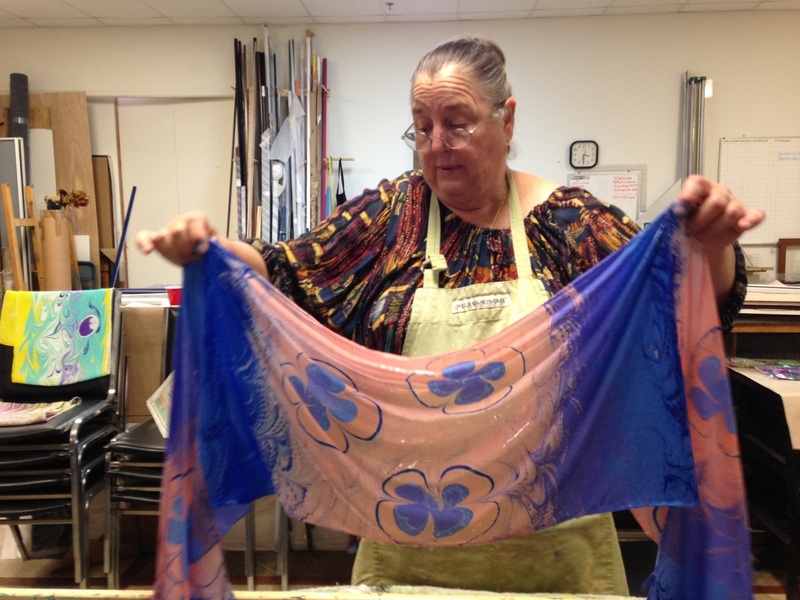 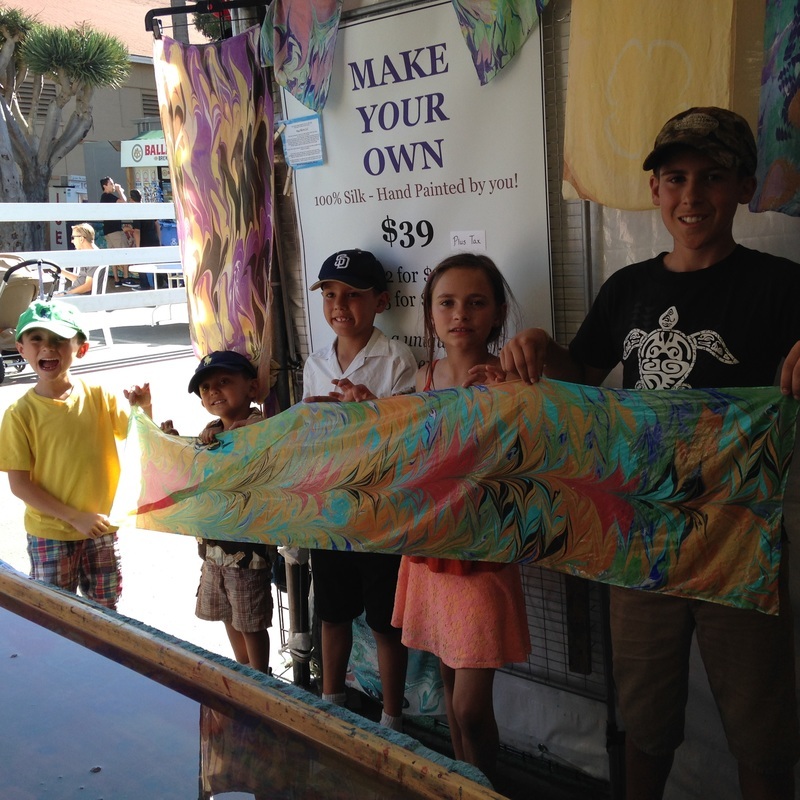 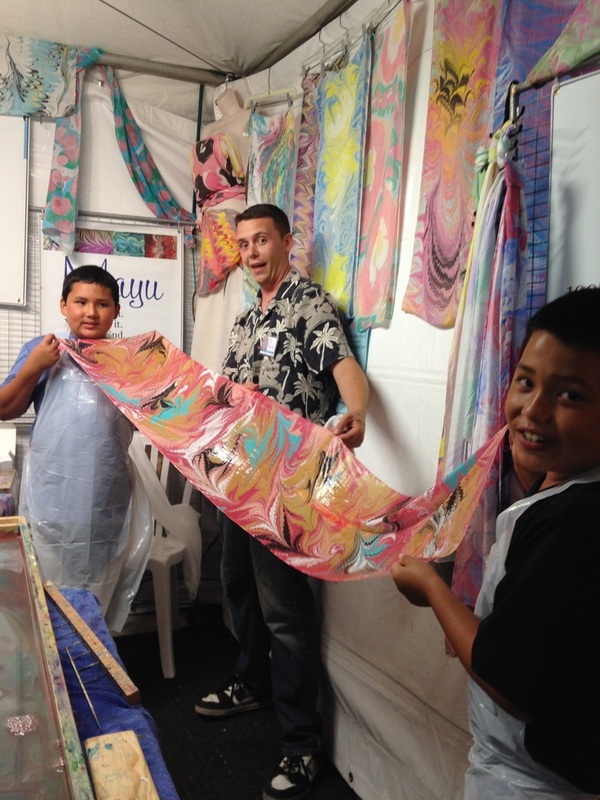 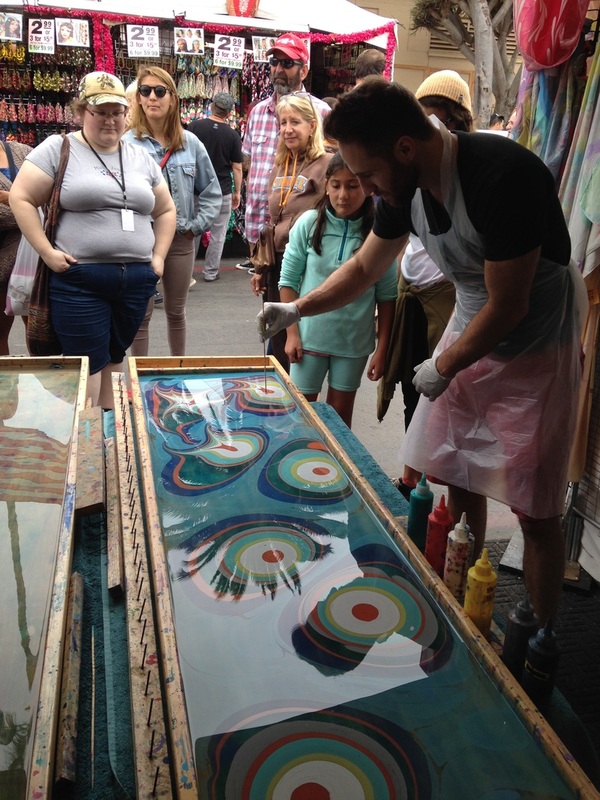 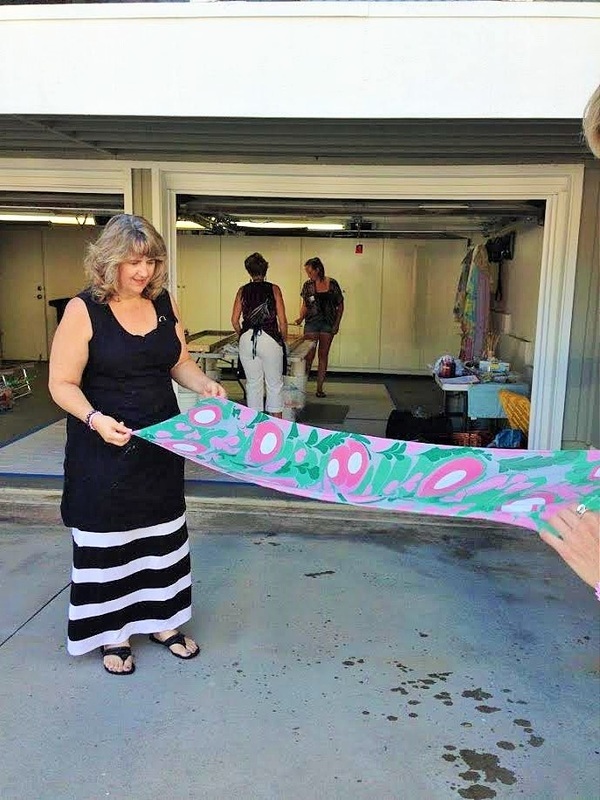 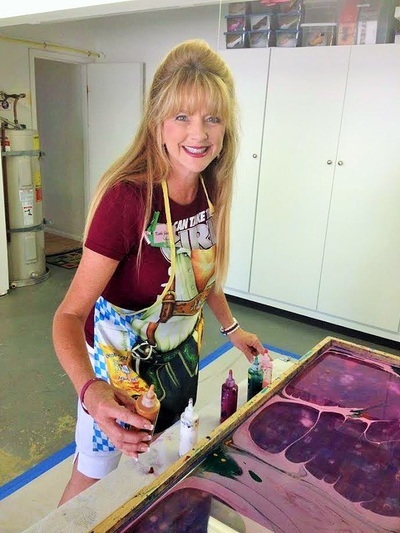 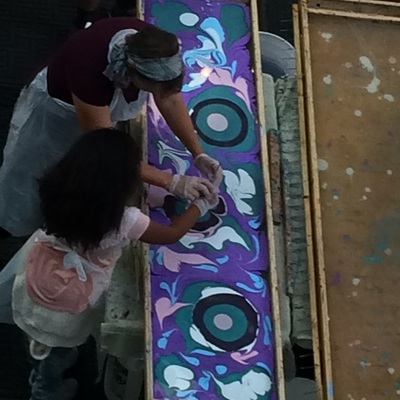 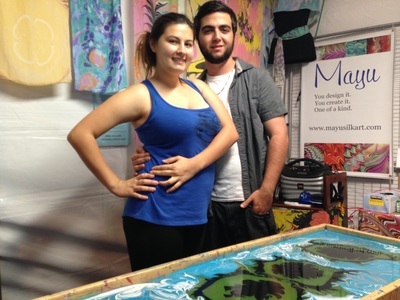 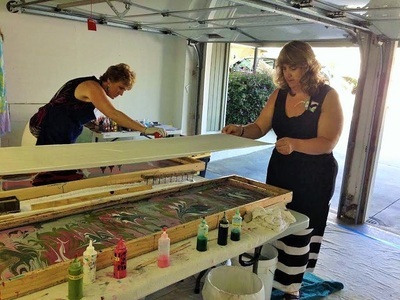 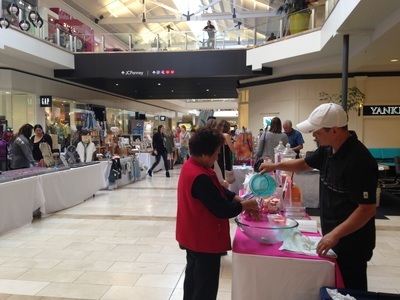 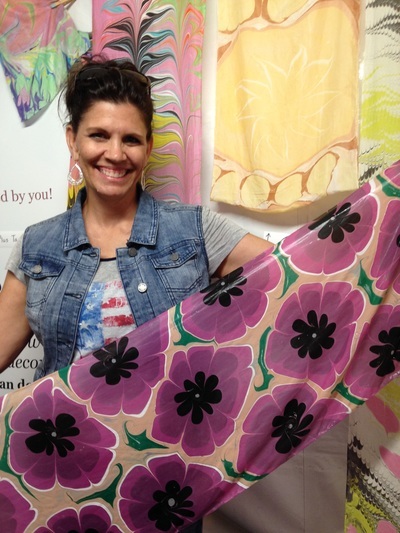 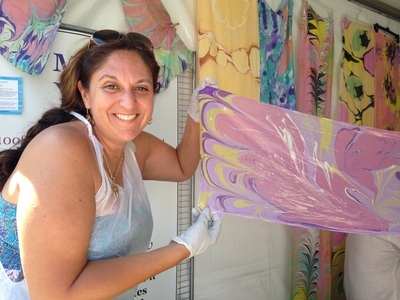 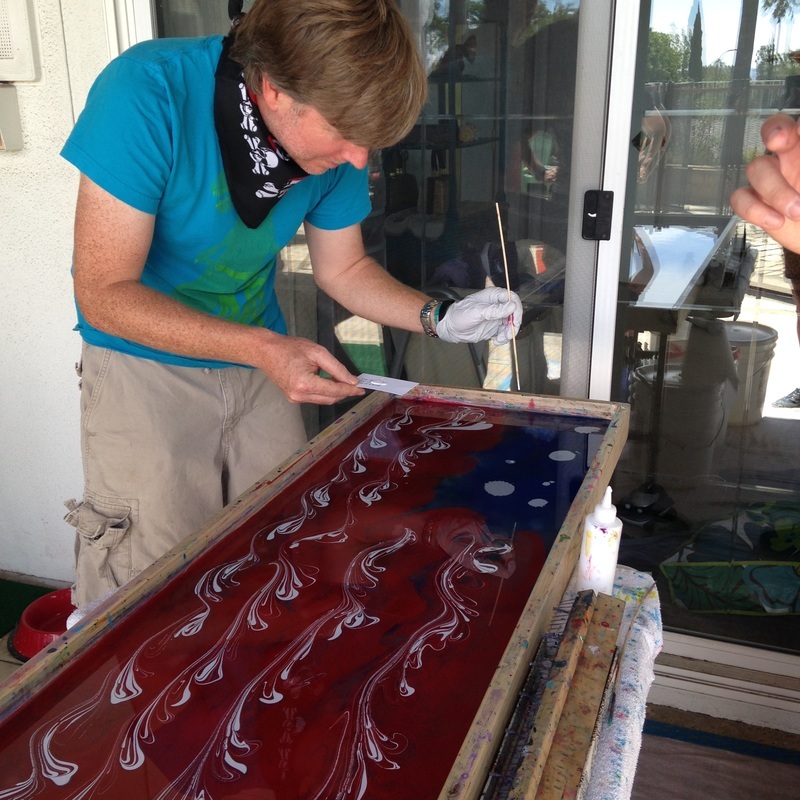 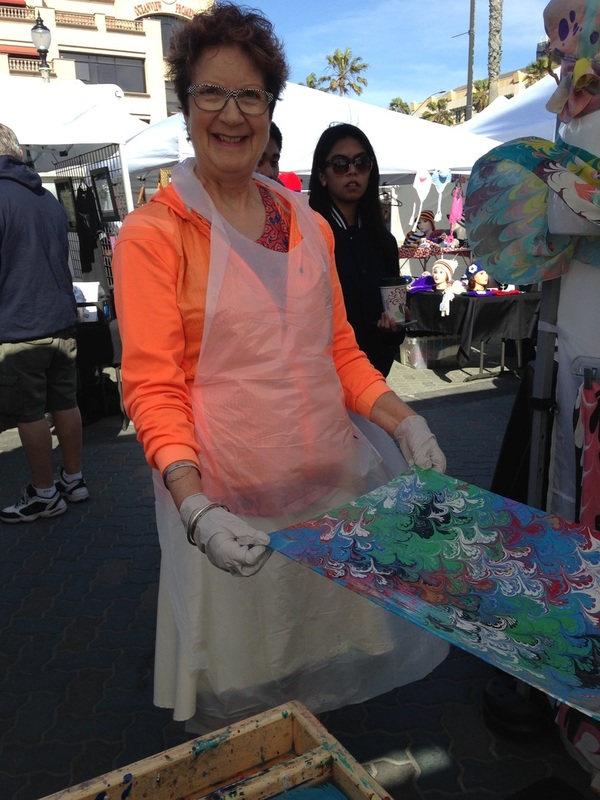 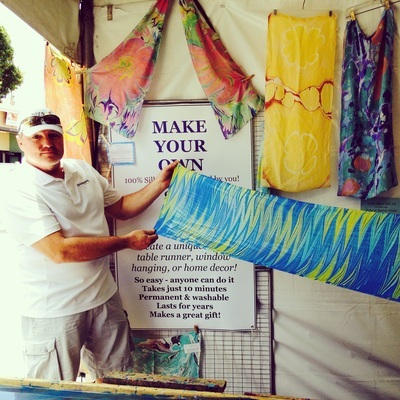 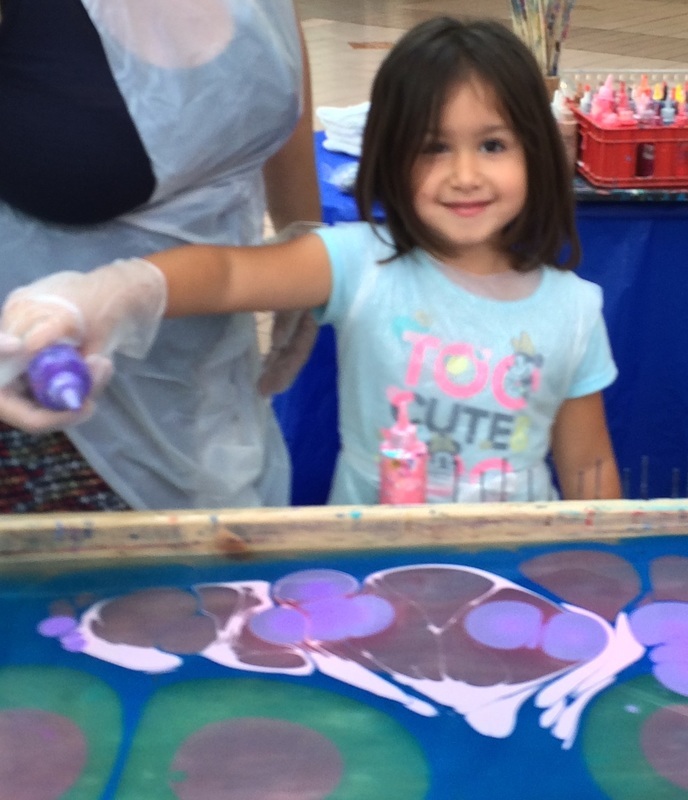 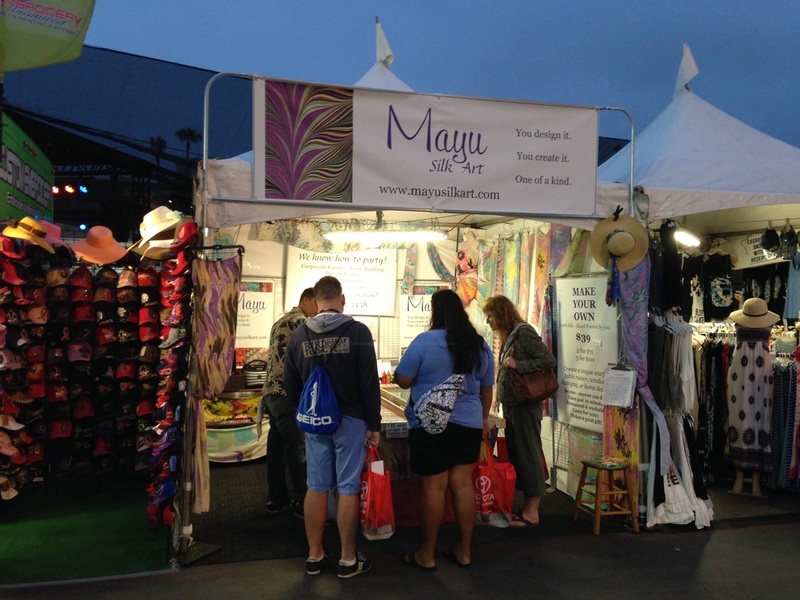 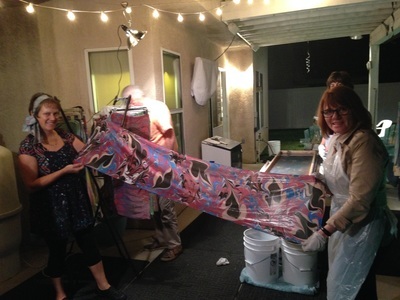 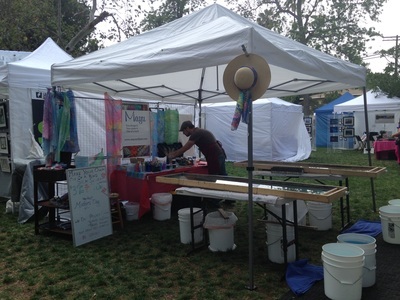 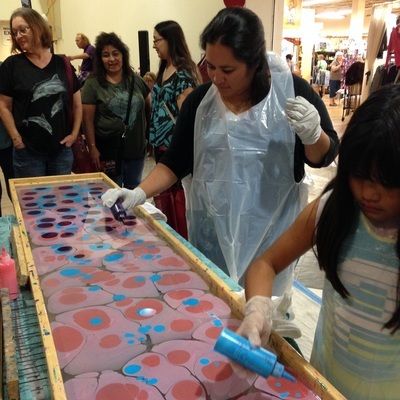 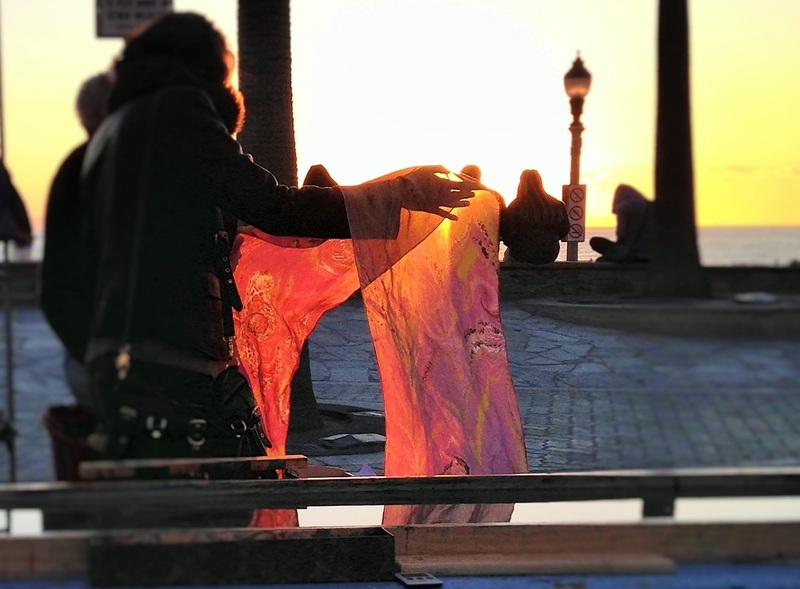 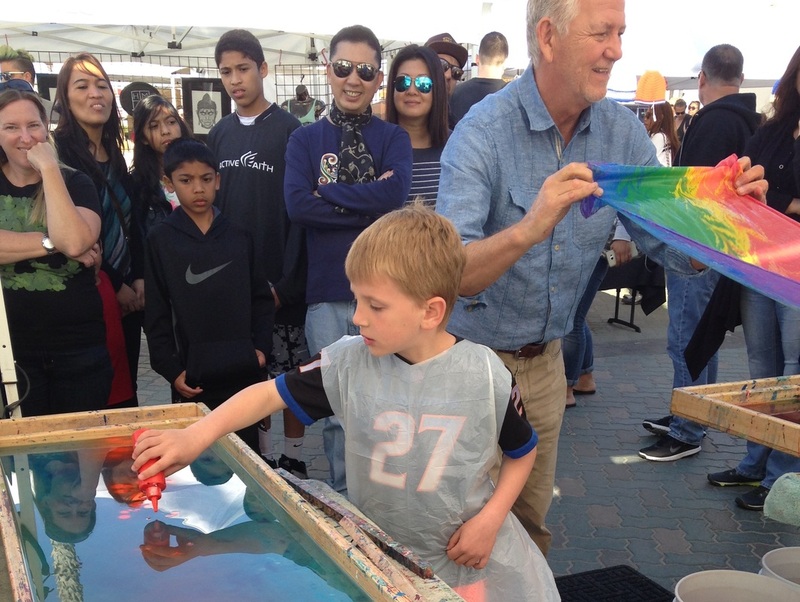 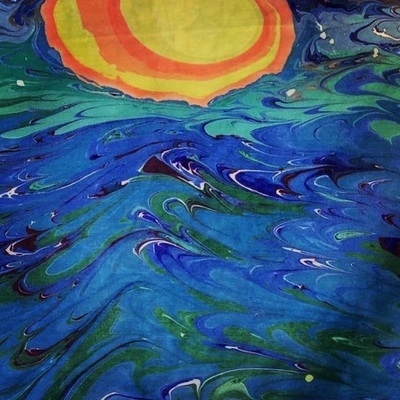 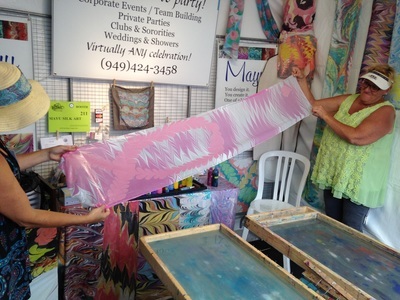 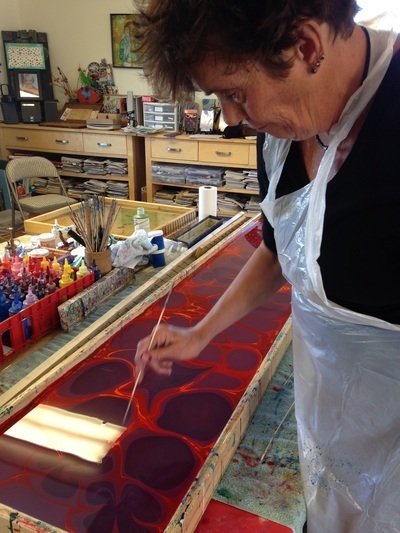 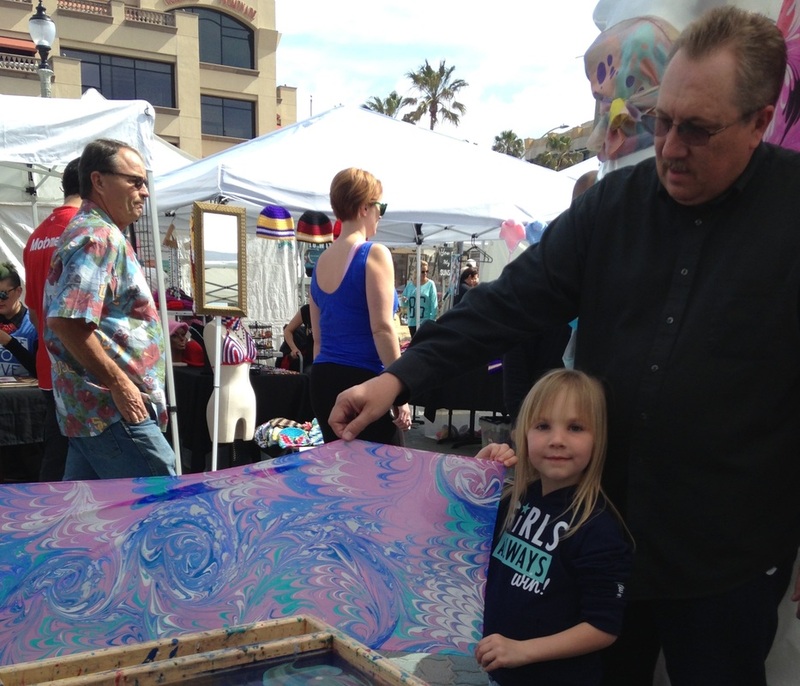 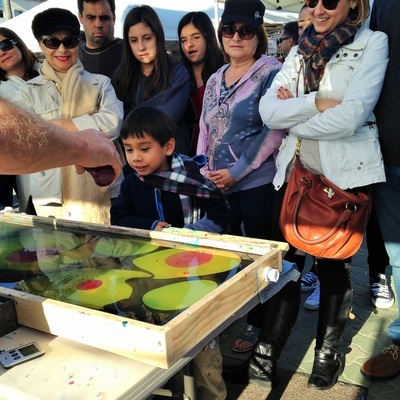 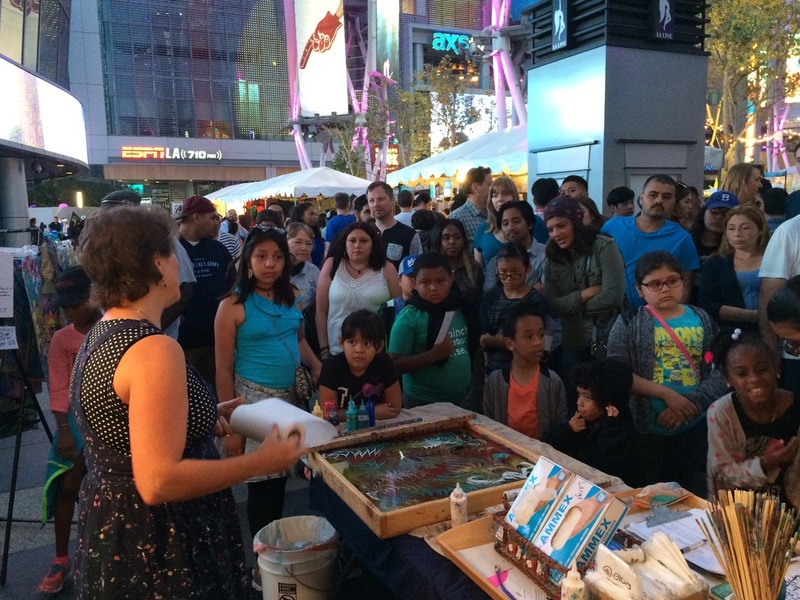 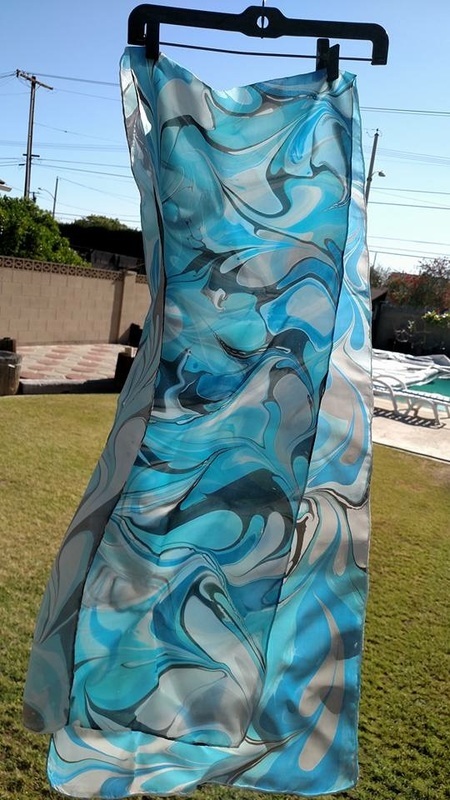 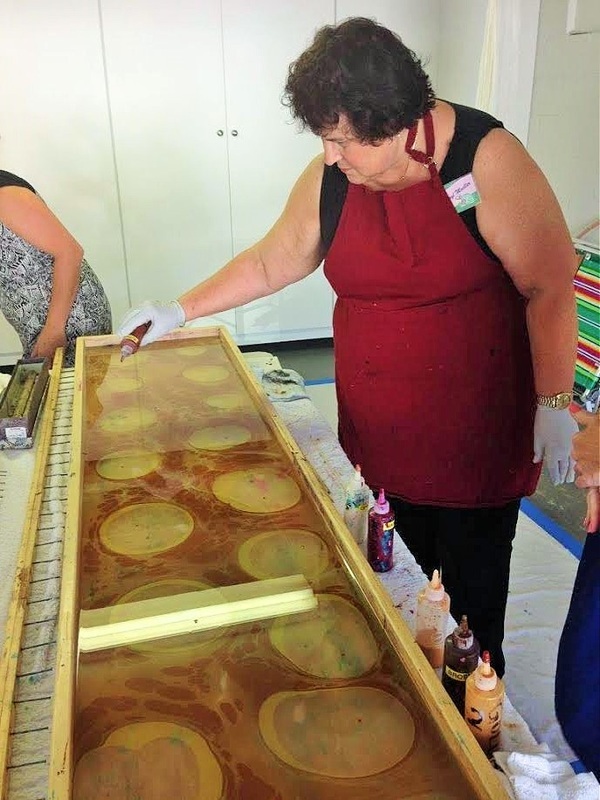 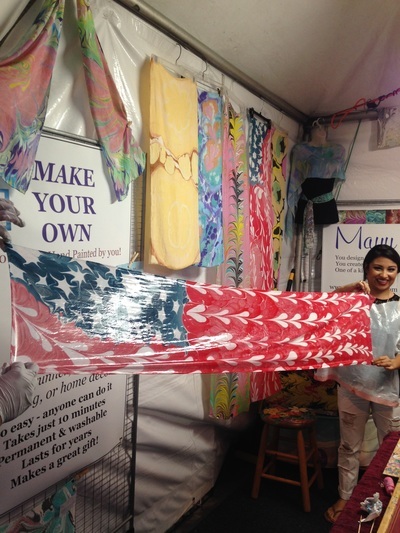 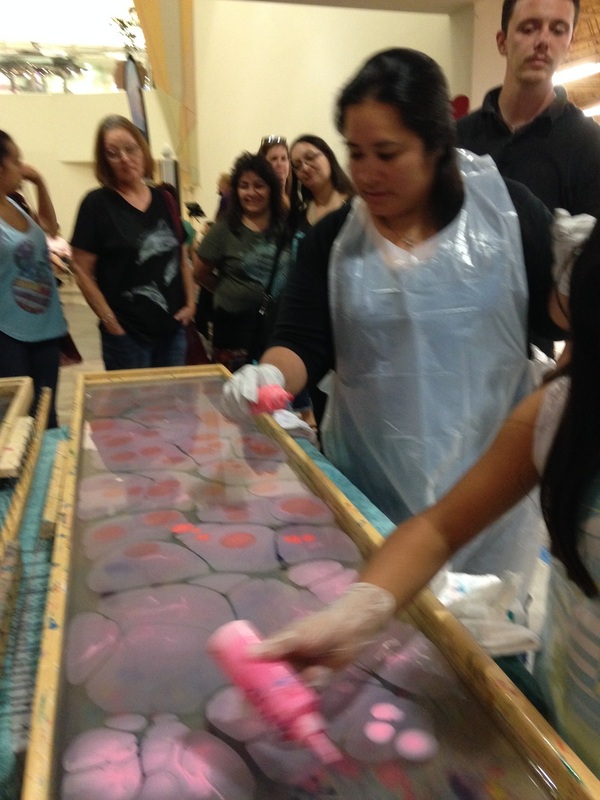 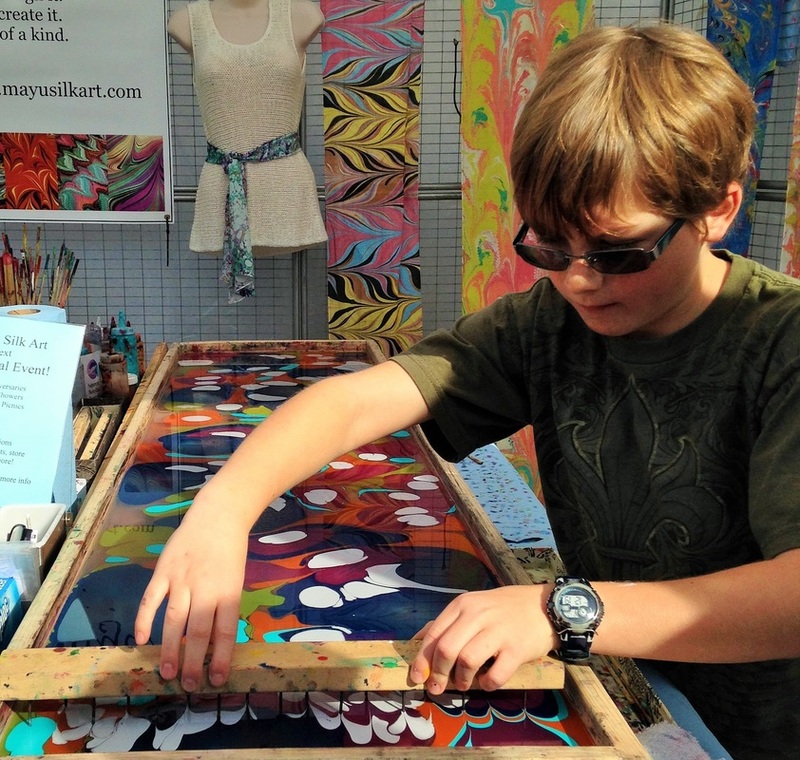 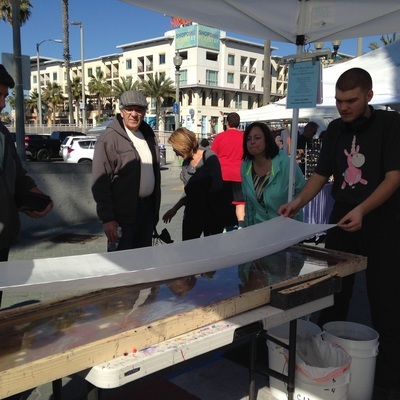 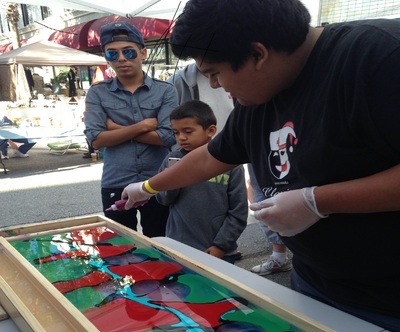 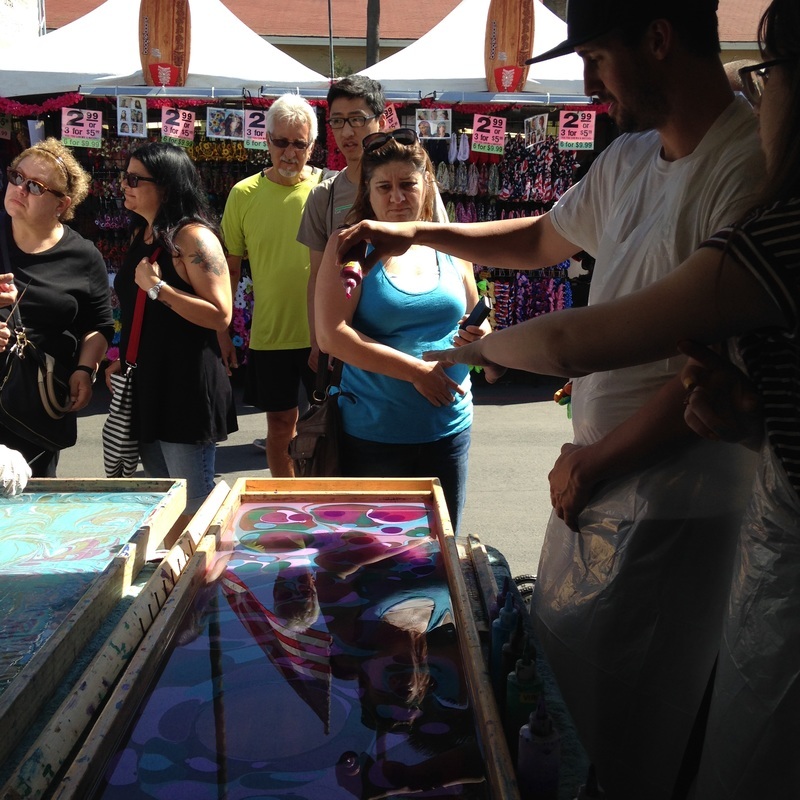 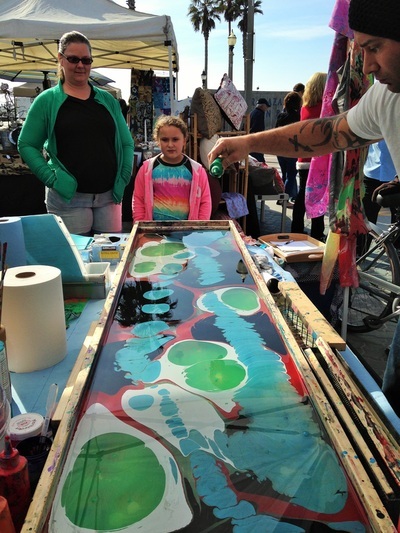 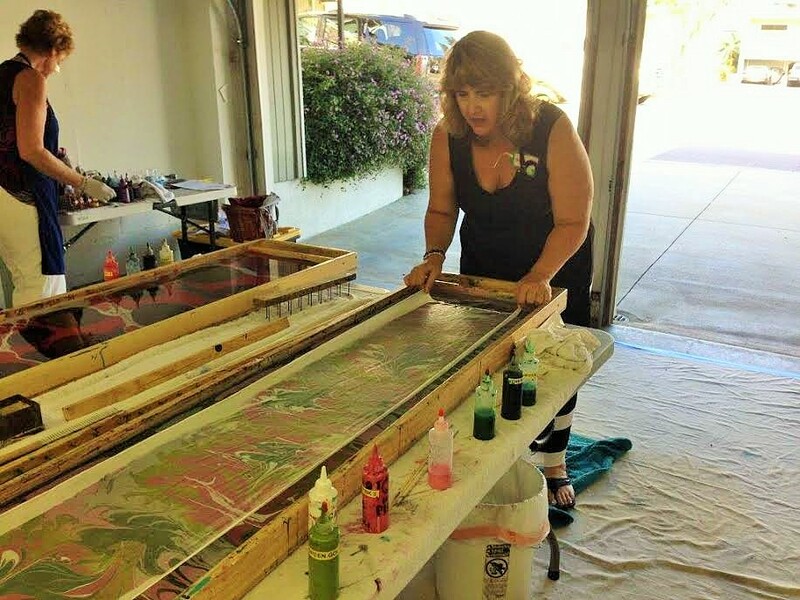 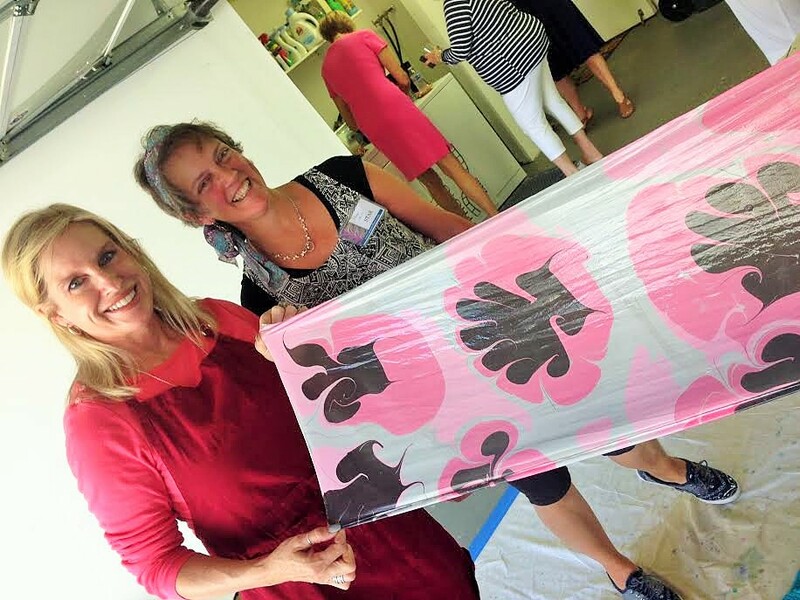 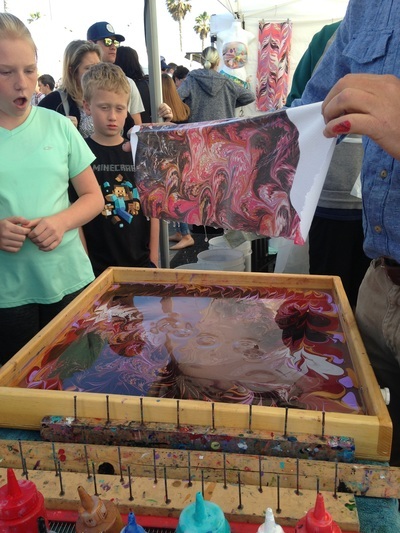 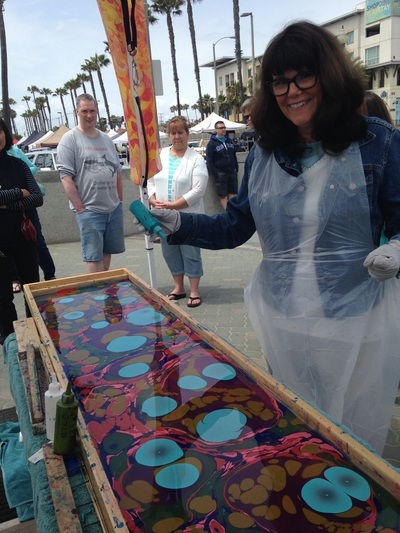 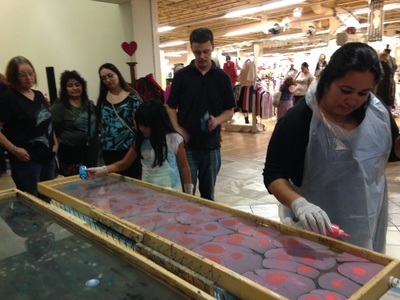 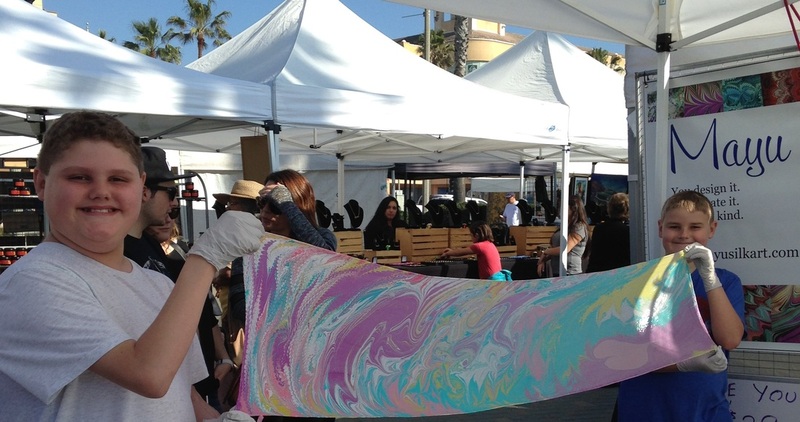 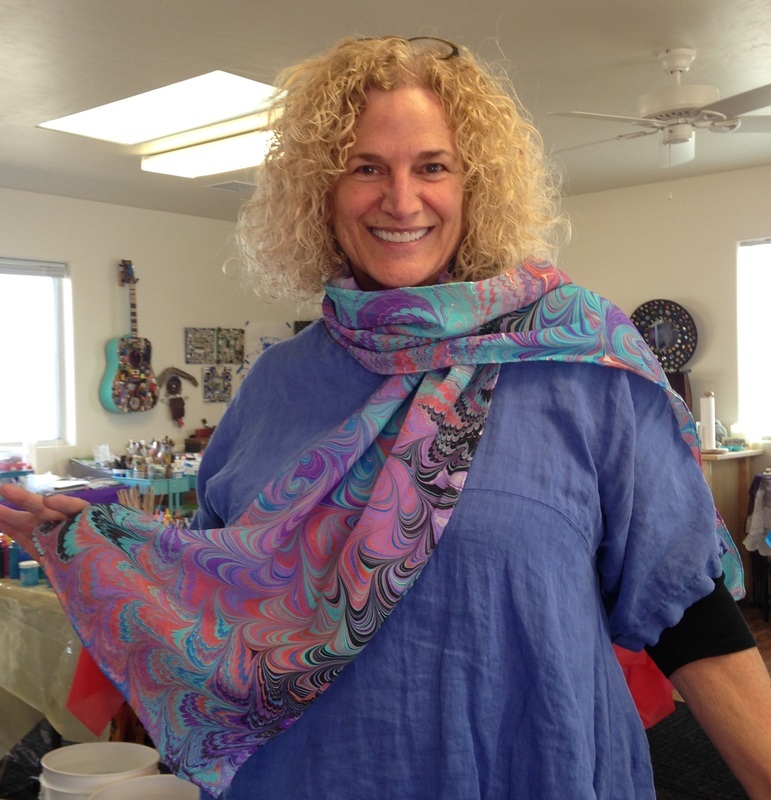 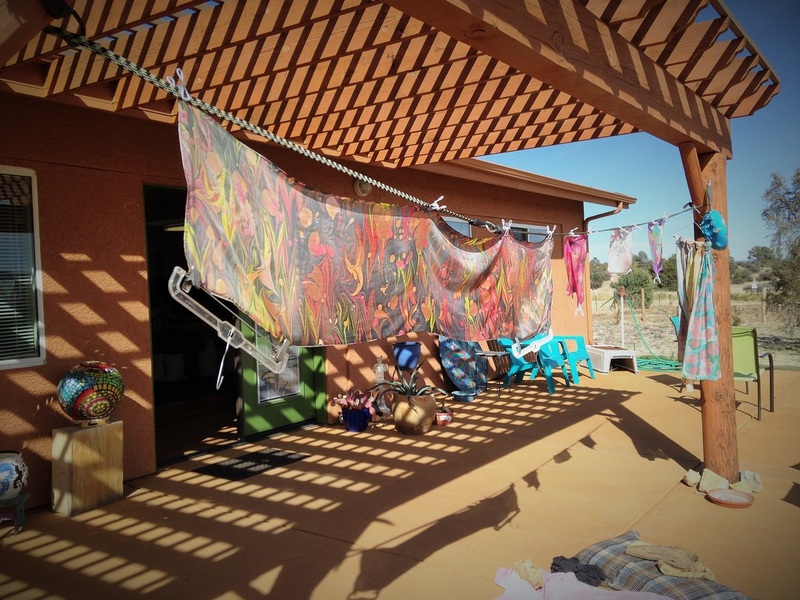 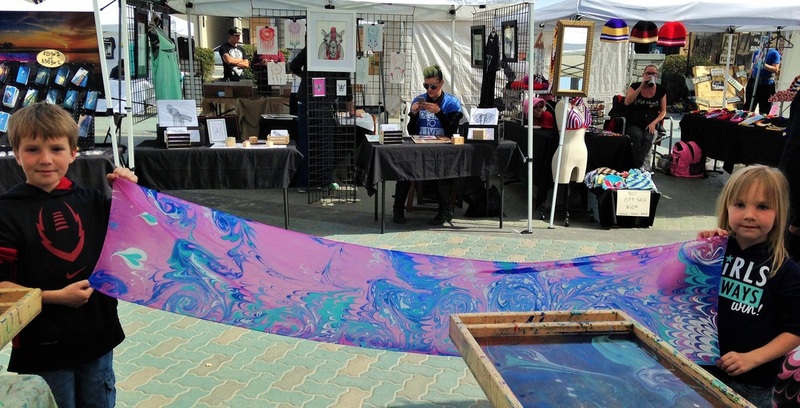 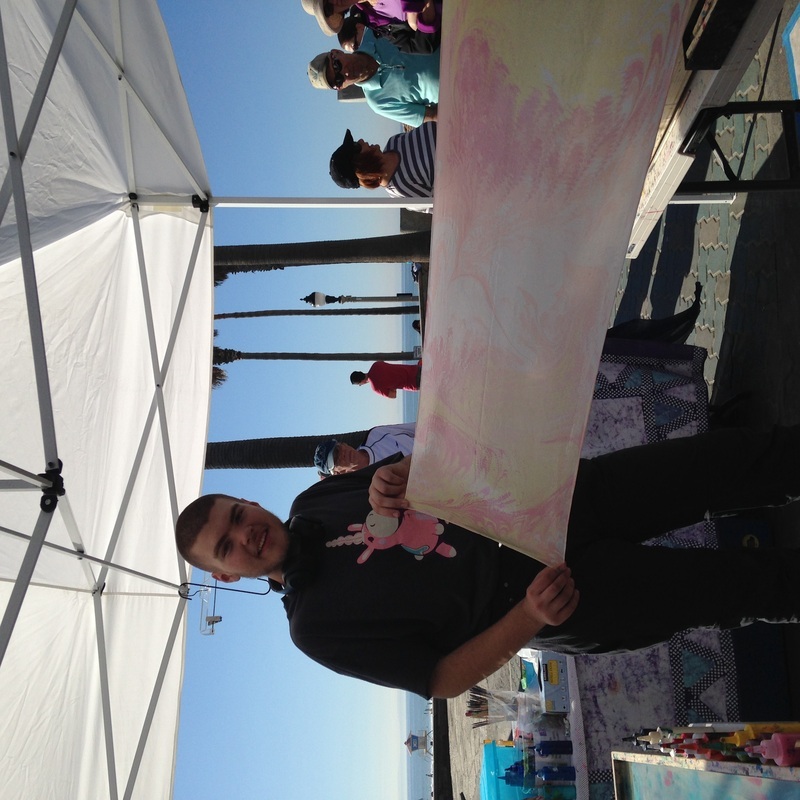 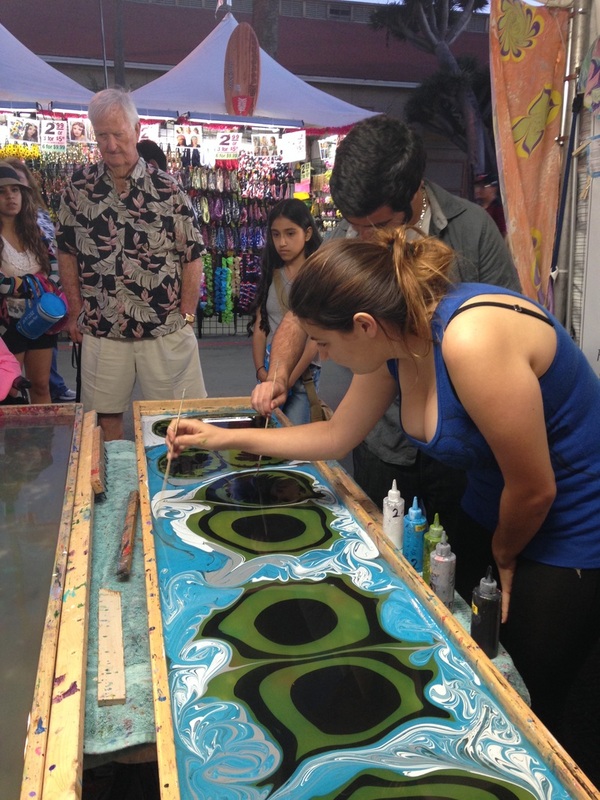 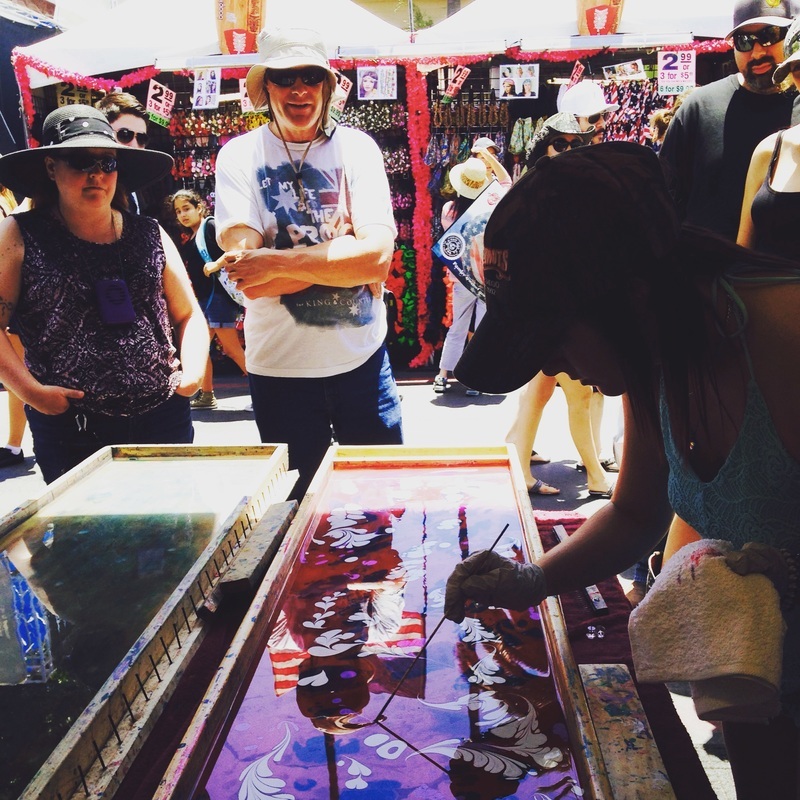 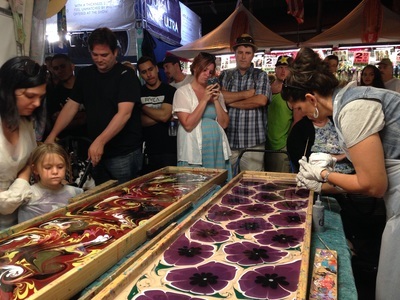 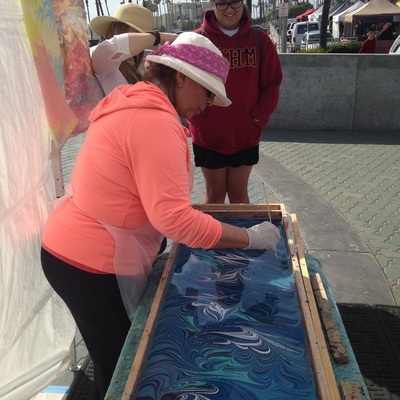 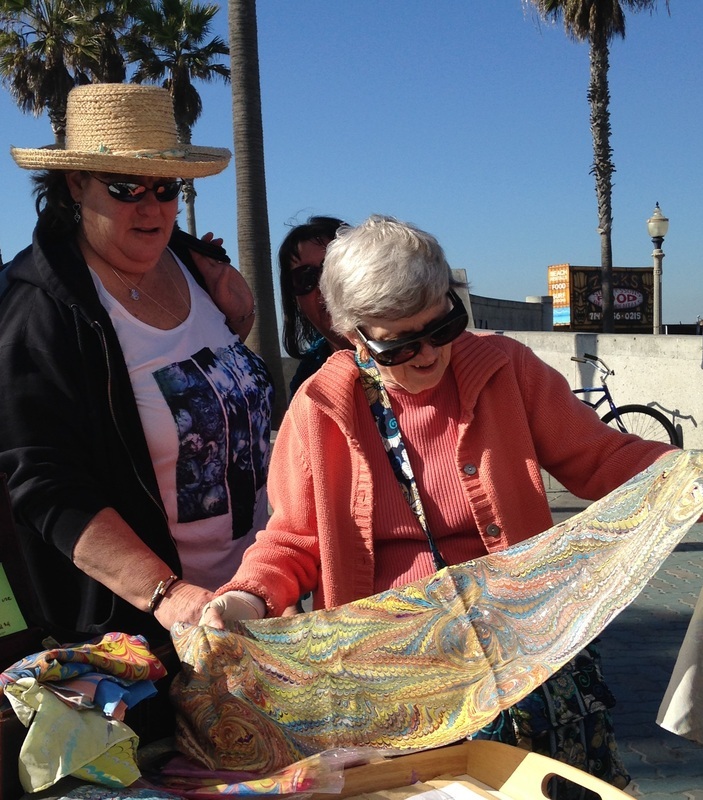 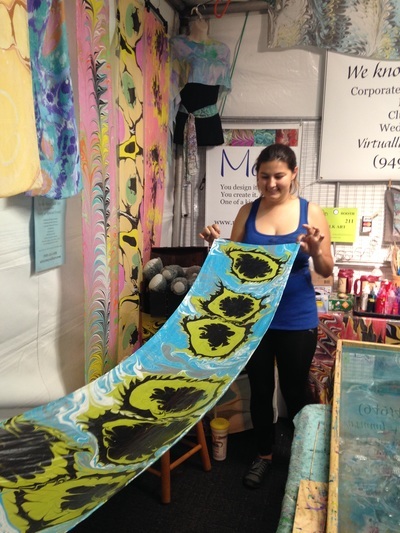 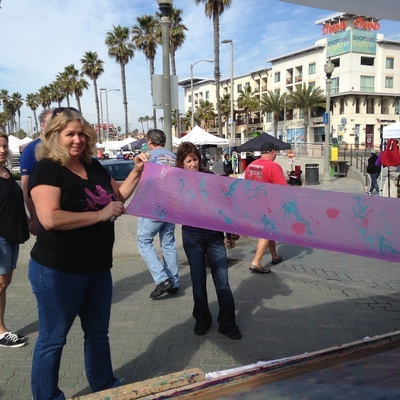 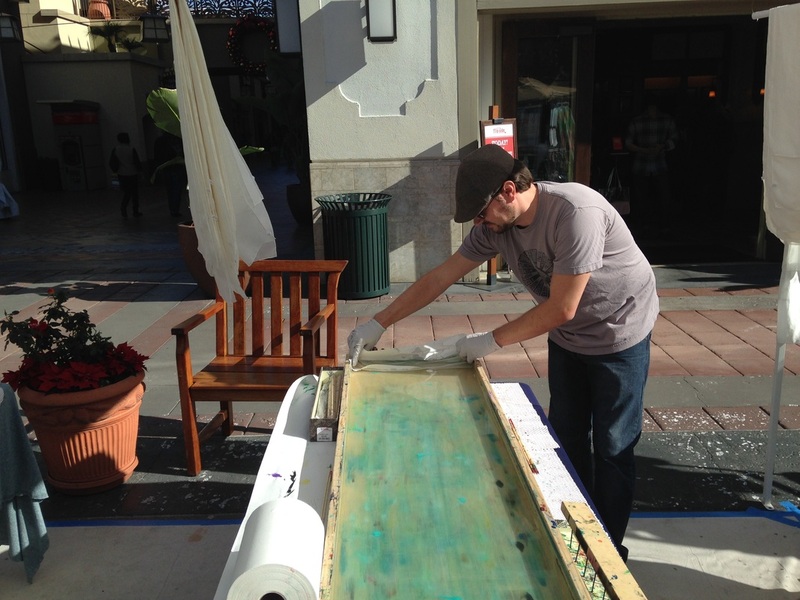 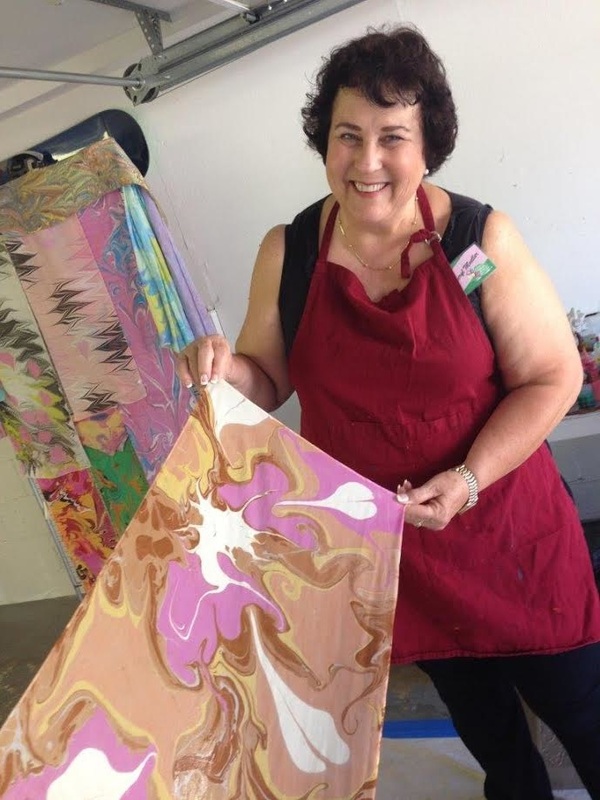 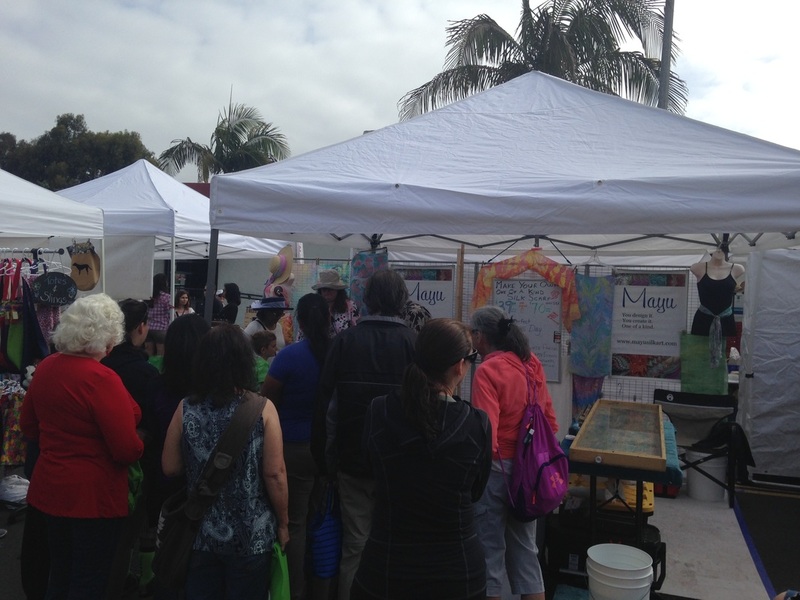 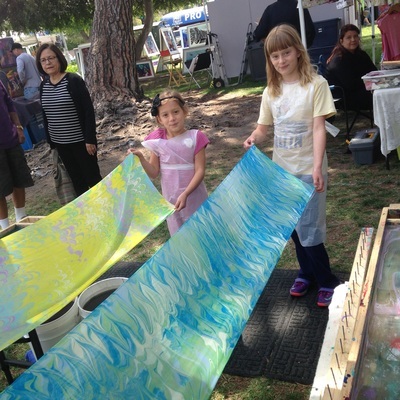 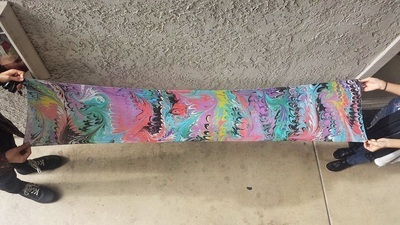 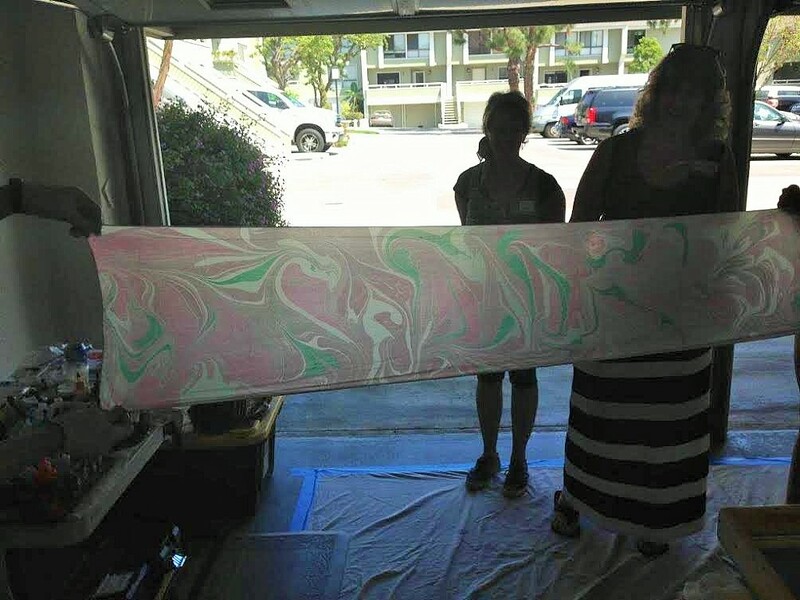 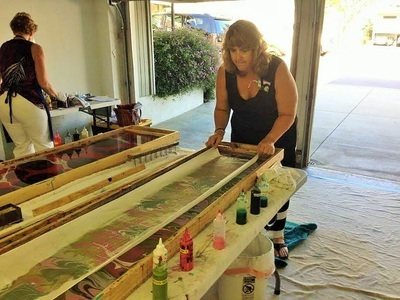 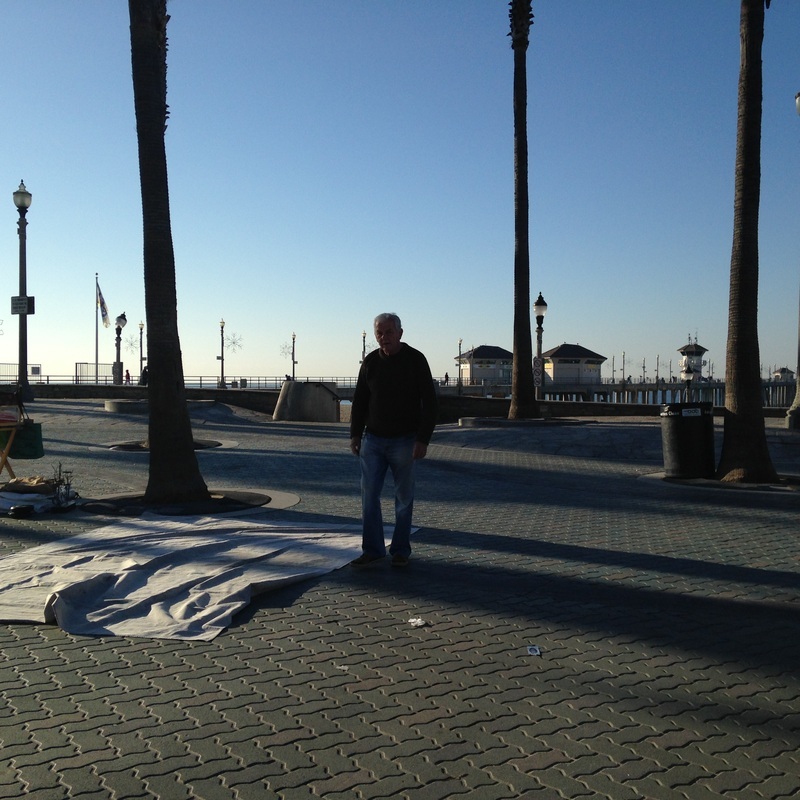 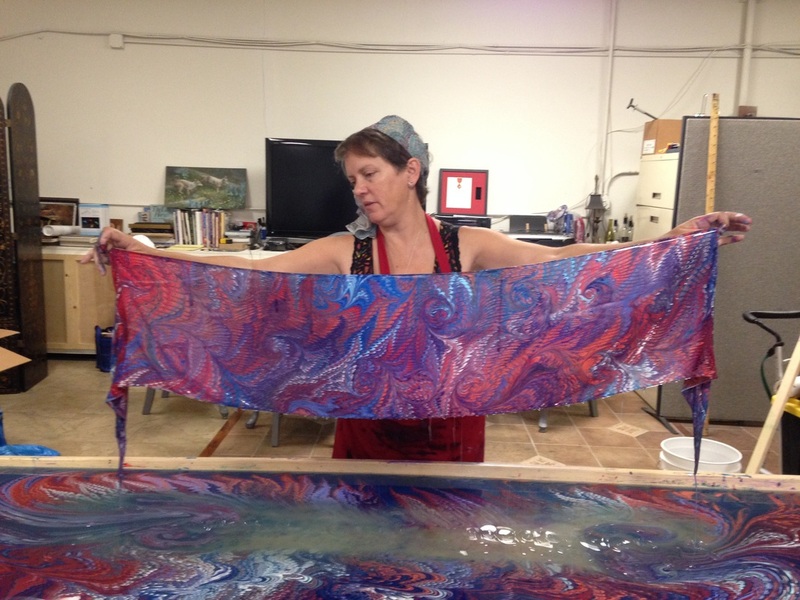 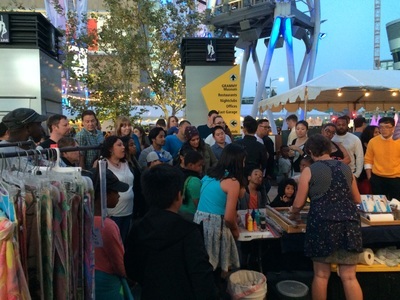 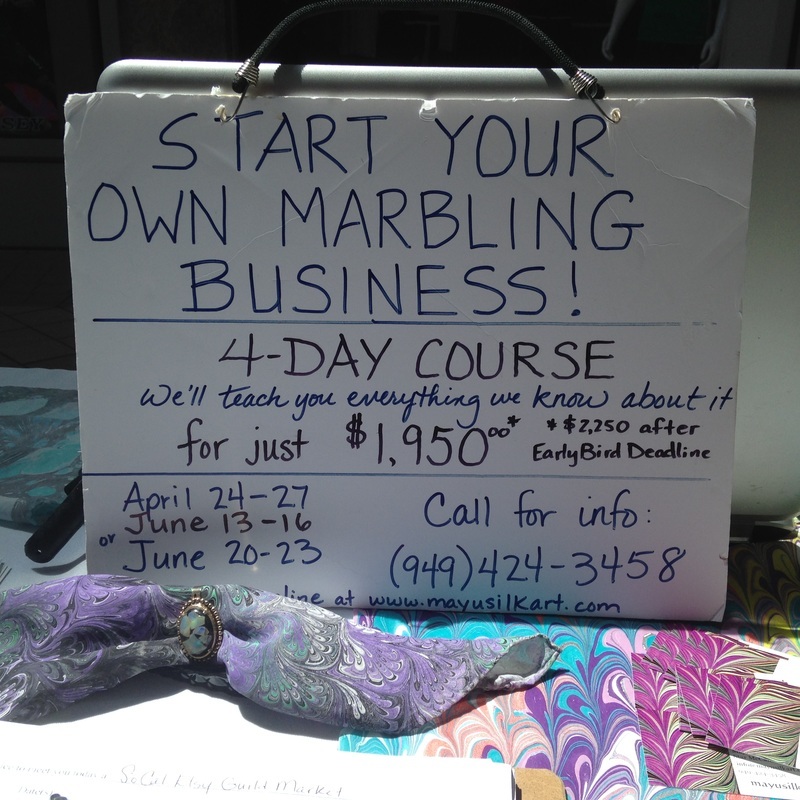 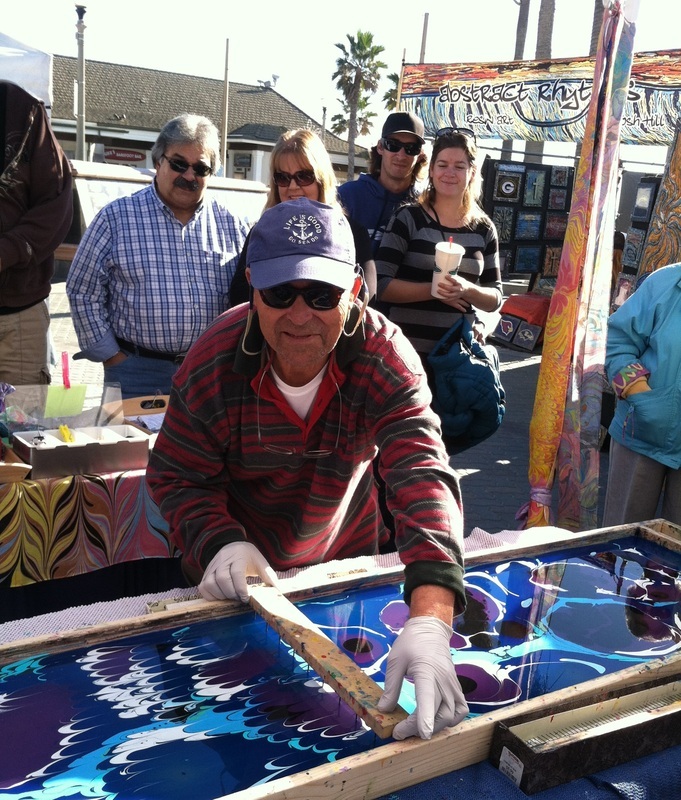 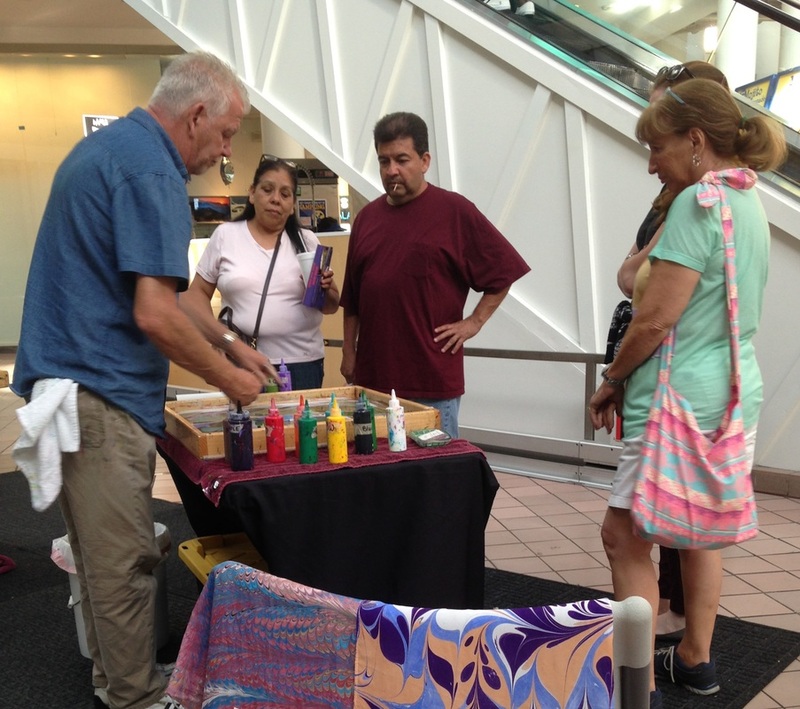 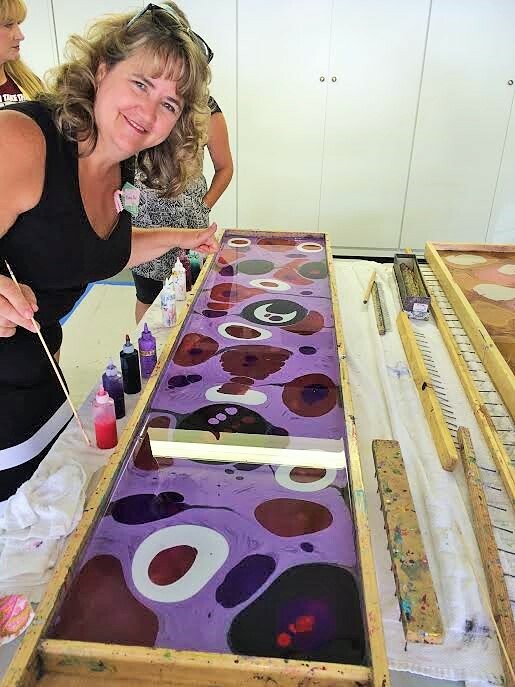 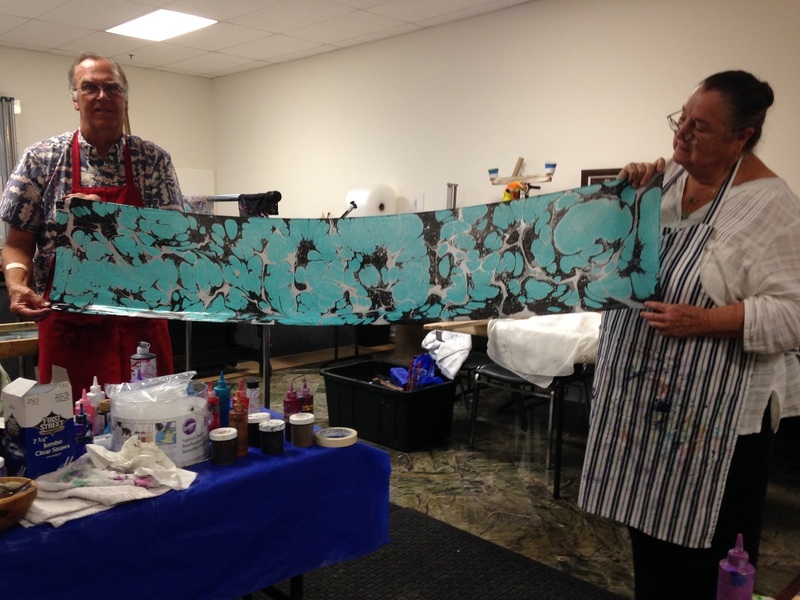 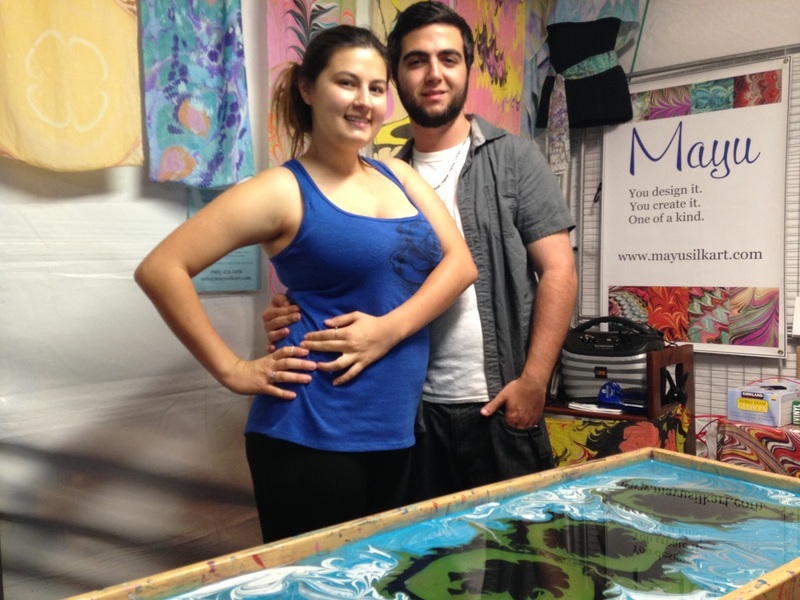 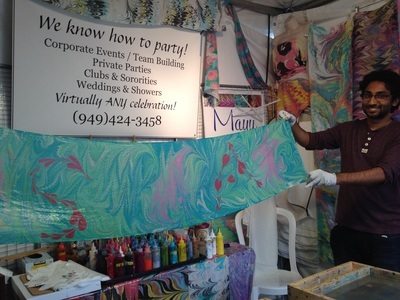 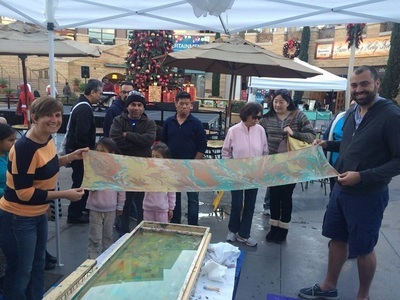 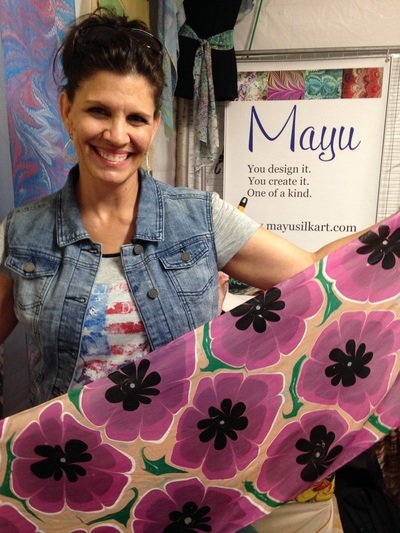 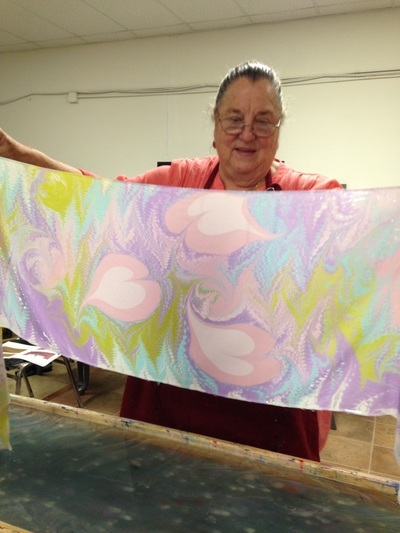 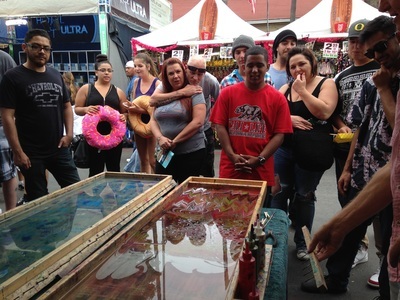 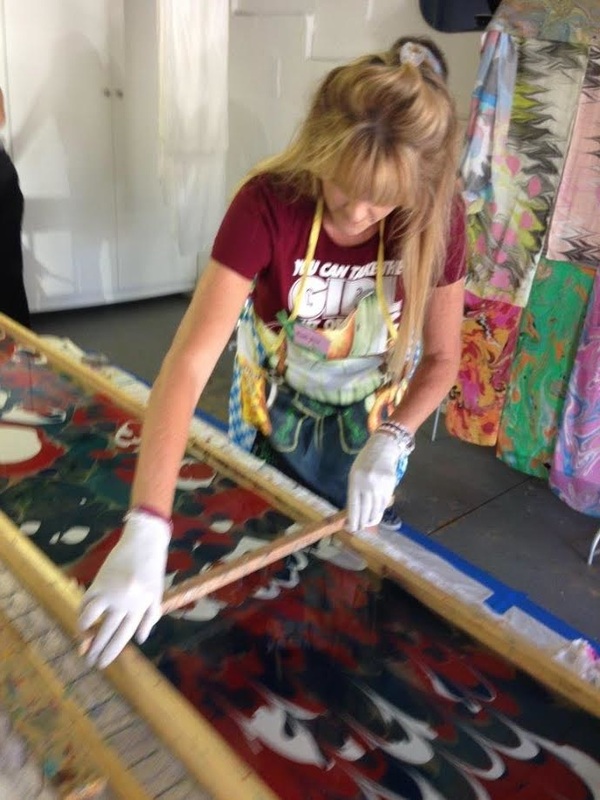 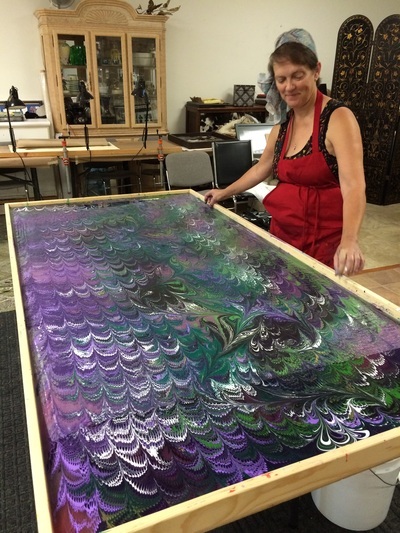 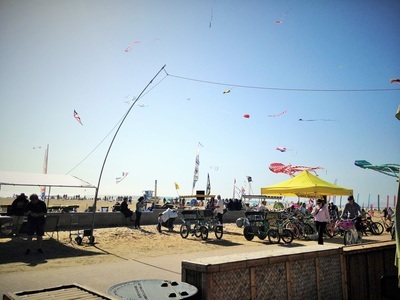 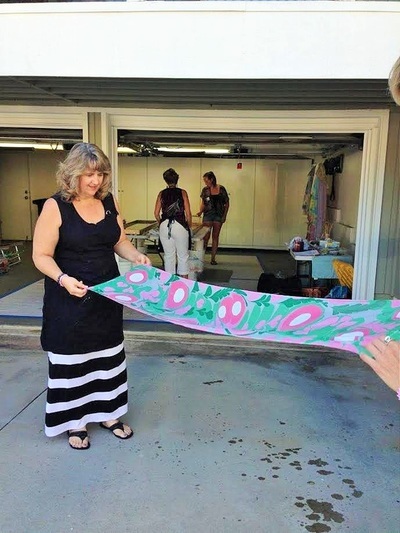 at the beach, at the mall, at the art gallery, in classrooms, hospitals, highrises and private homes - you can find people making Mayu Silk Art magic happen all over Southern California and beyond! 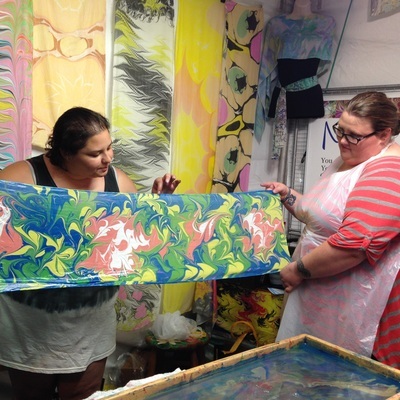 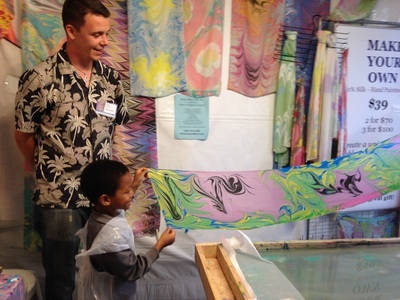 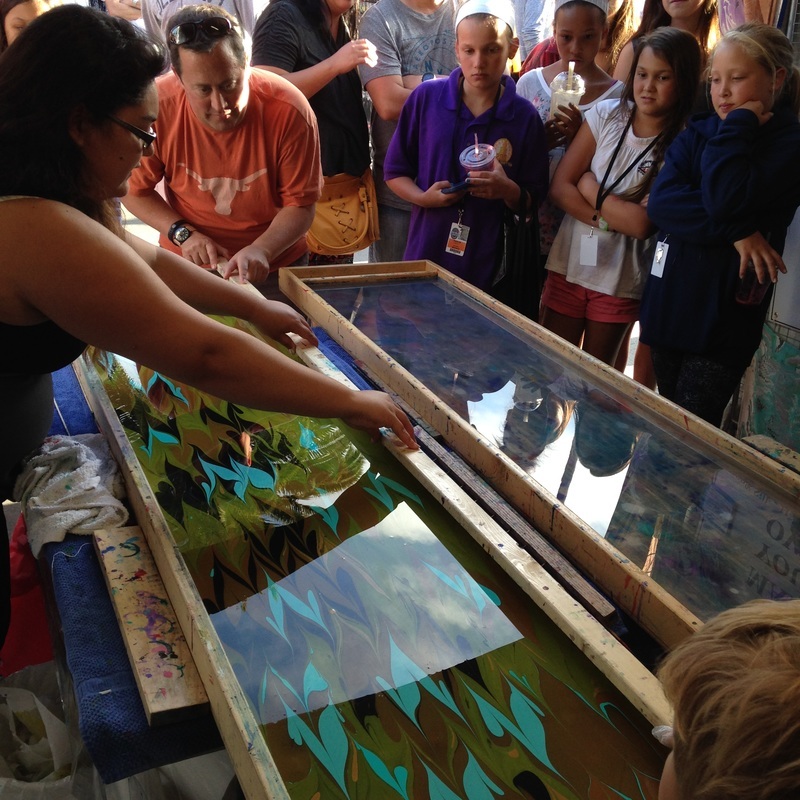 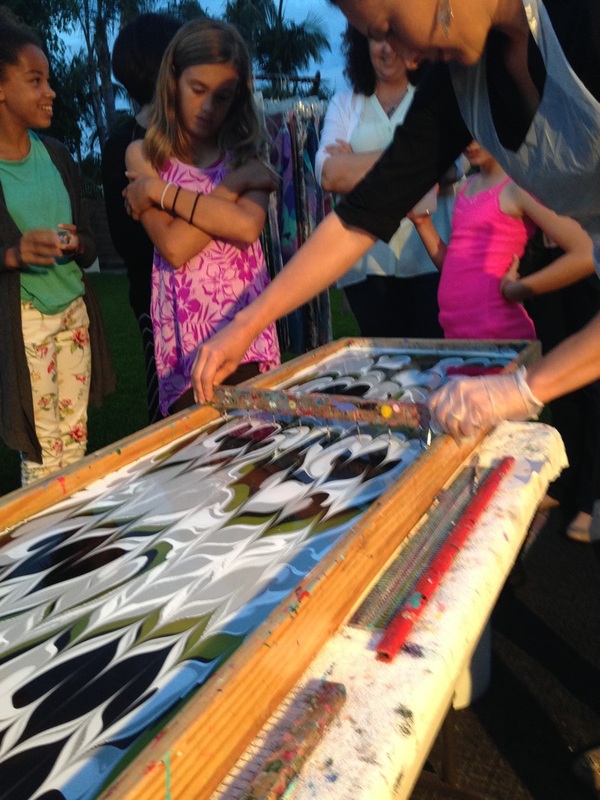 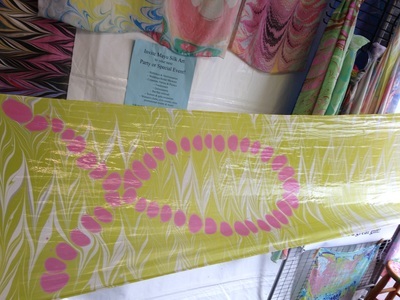 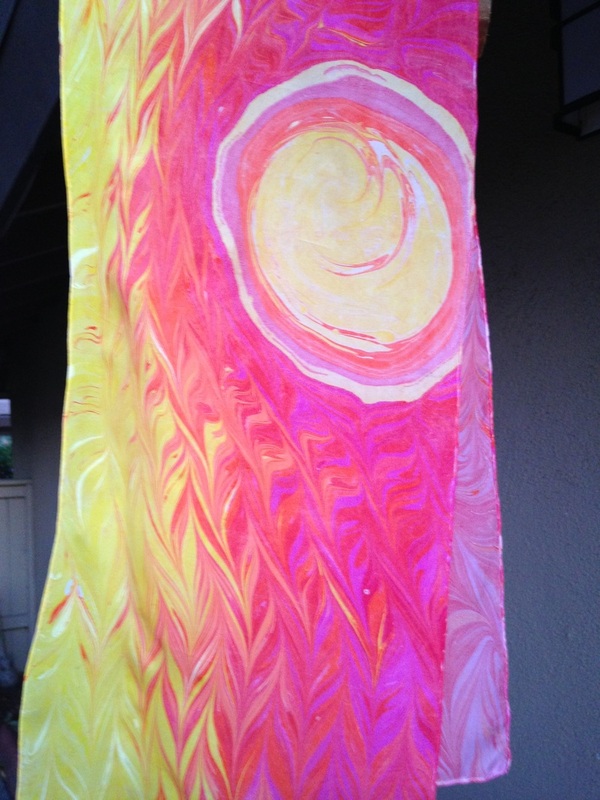 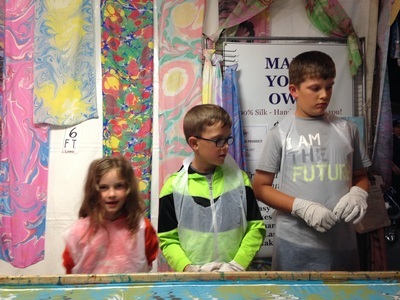 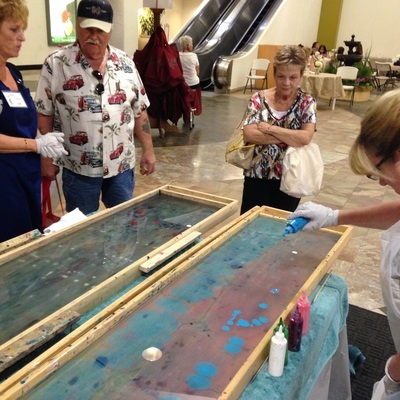 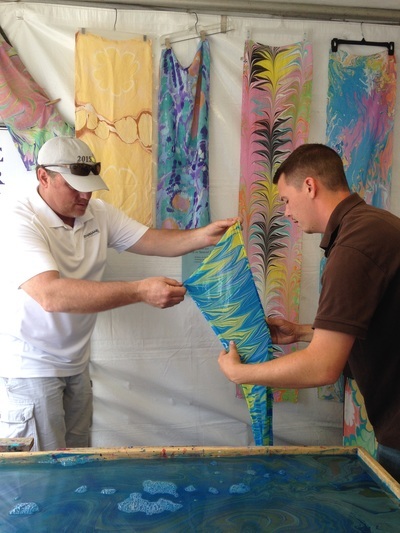 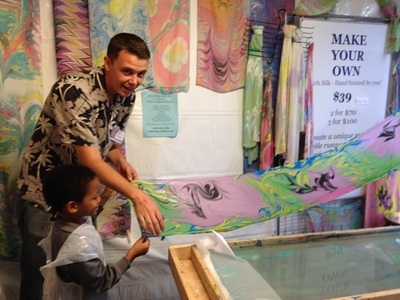 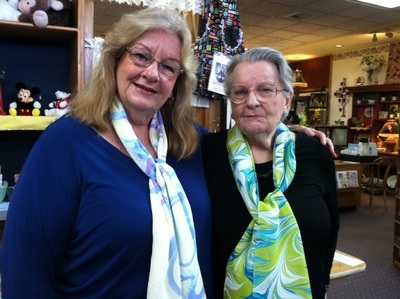 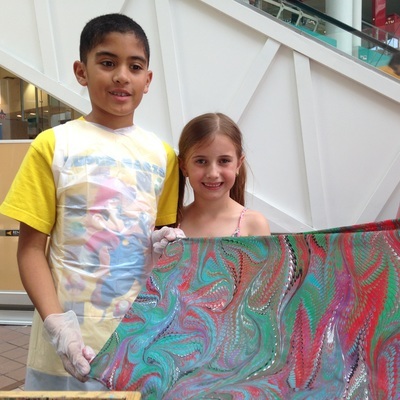 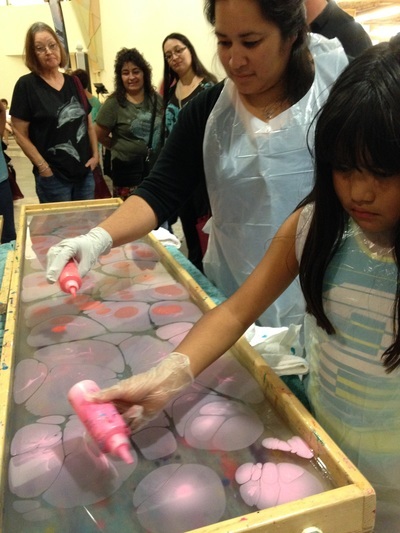 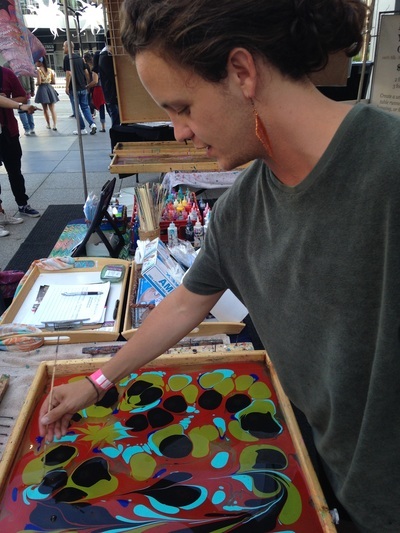 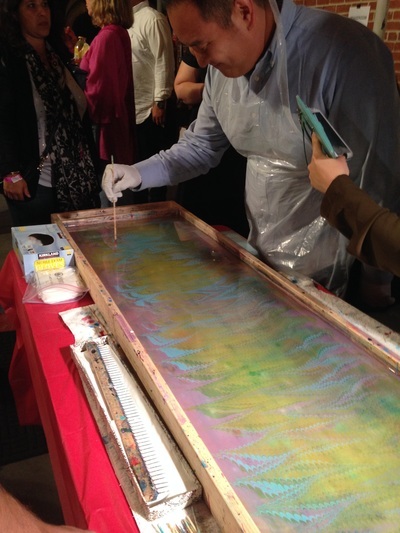 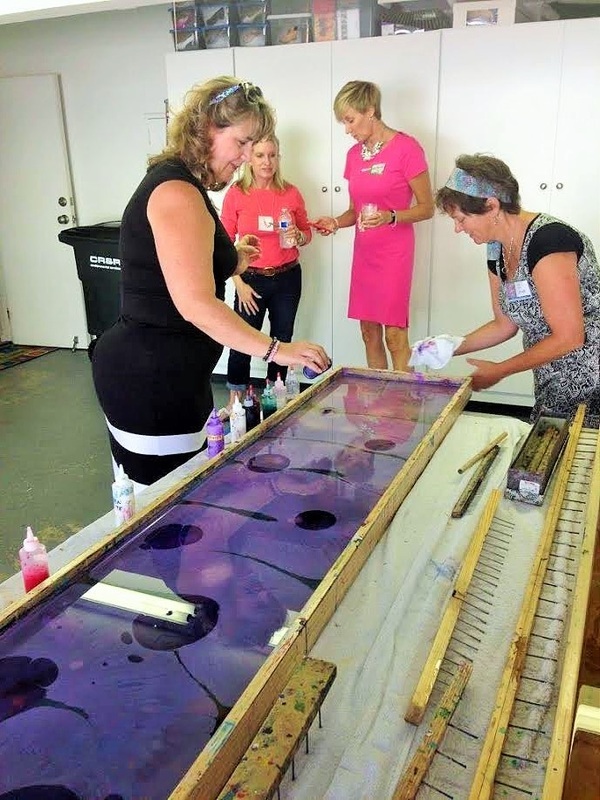 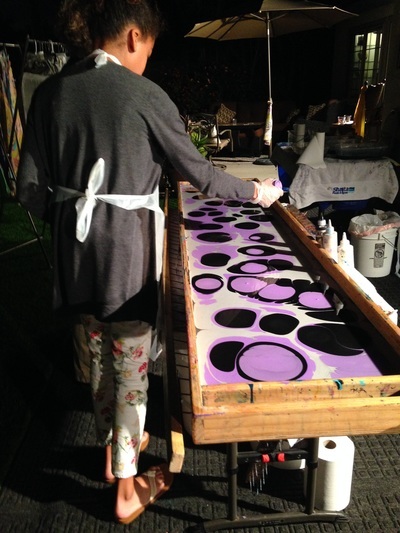 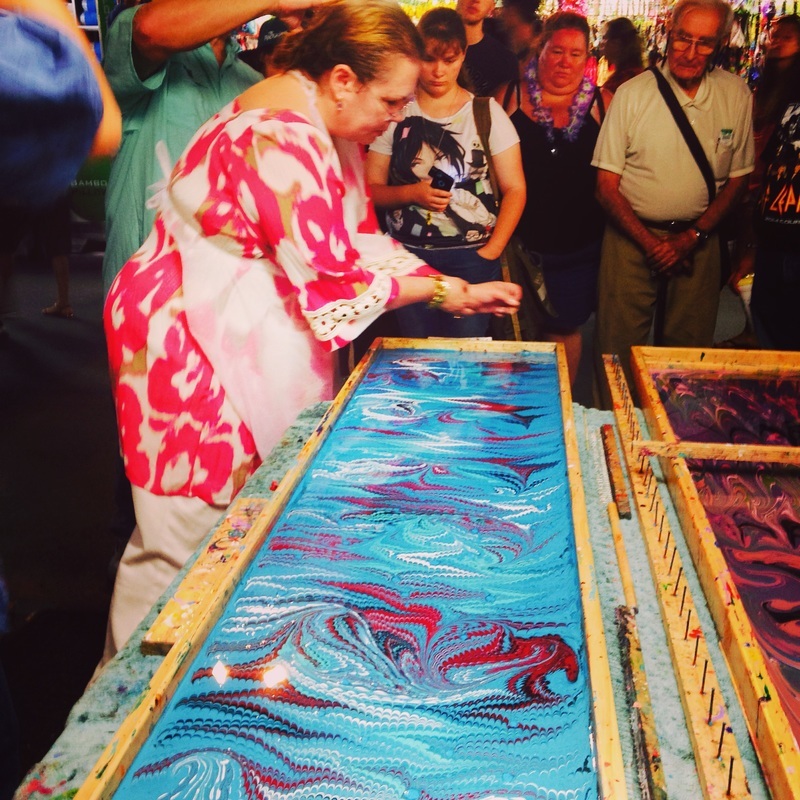 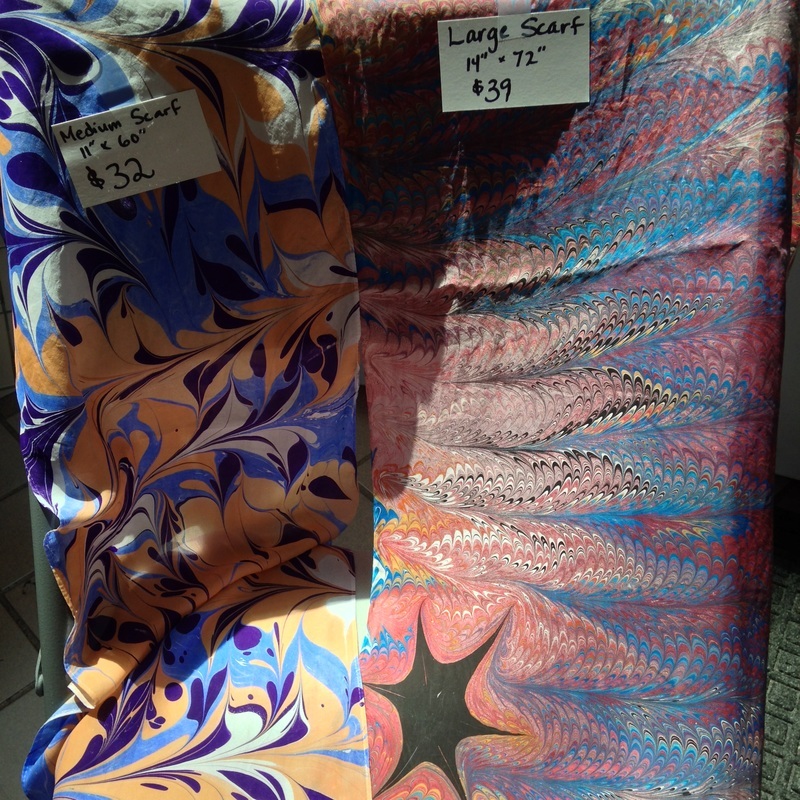 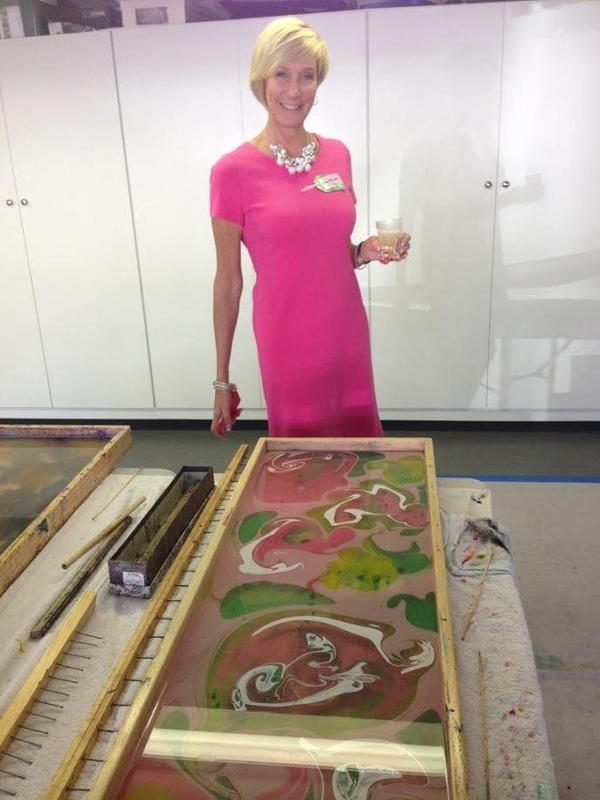 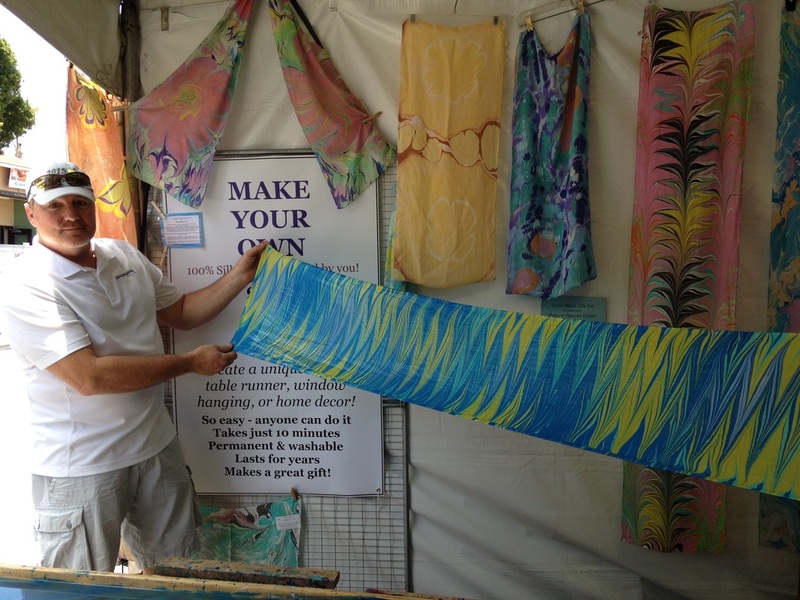 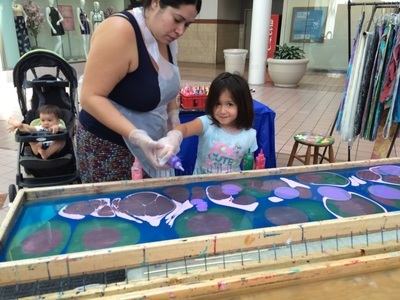 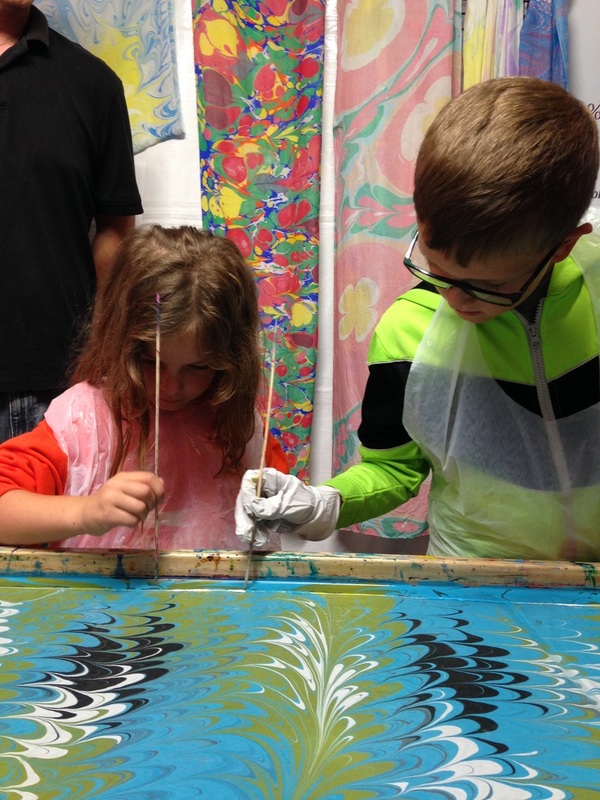 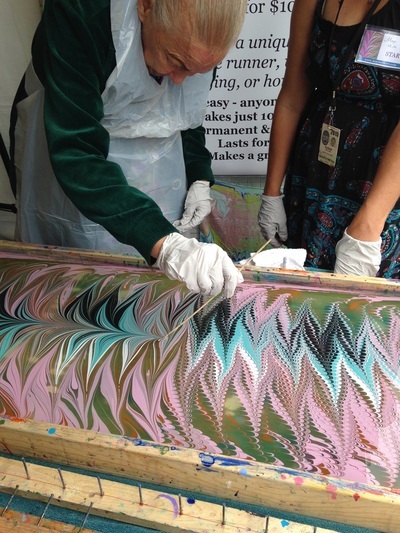 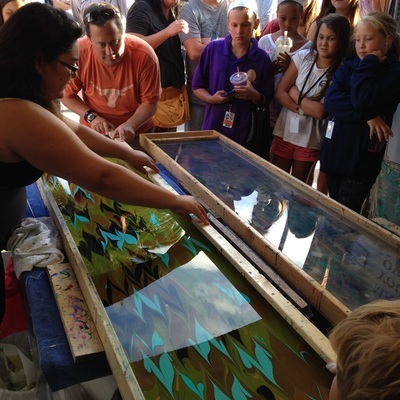 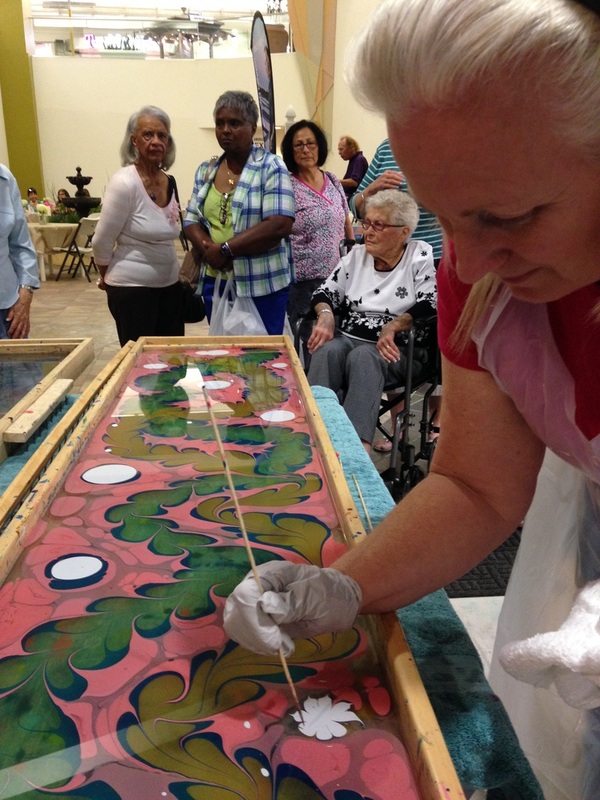 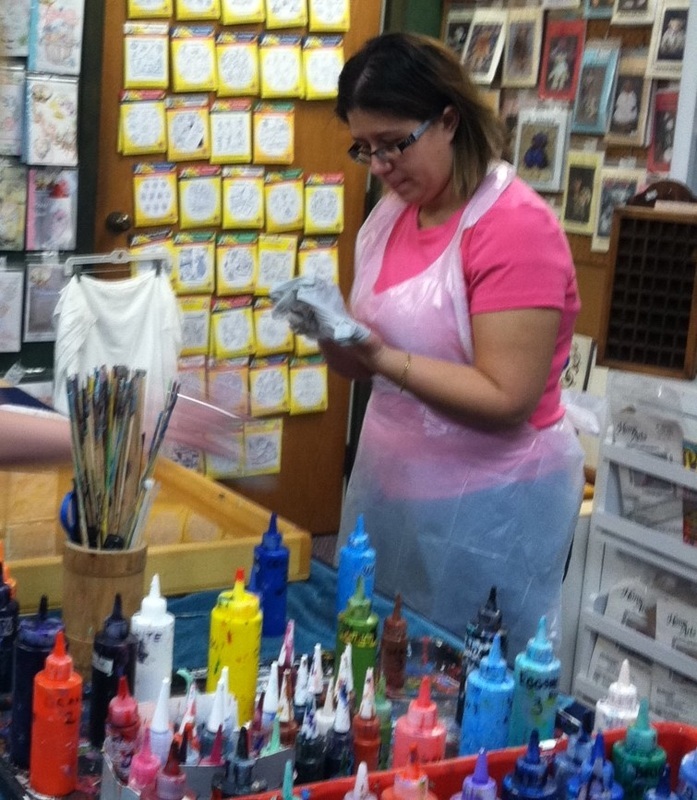 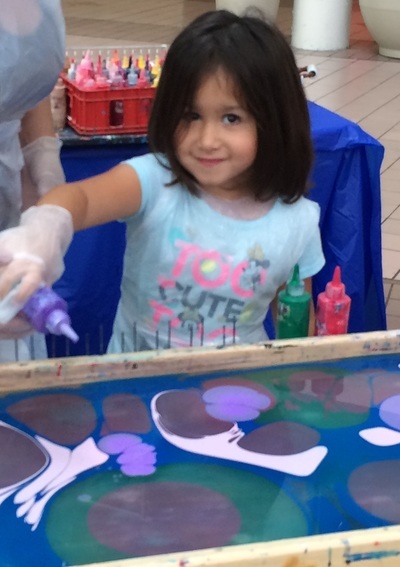 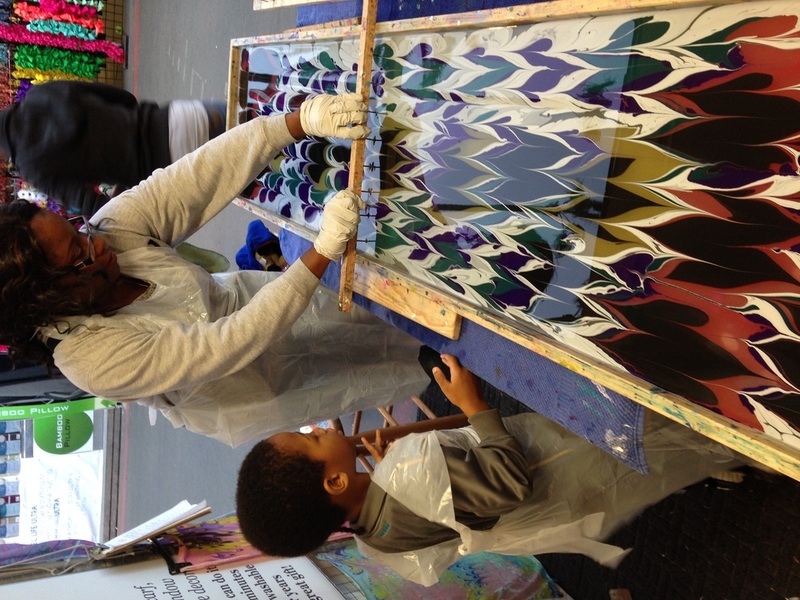 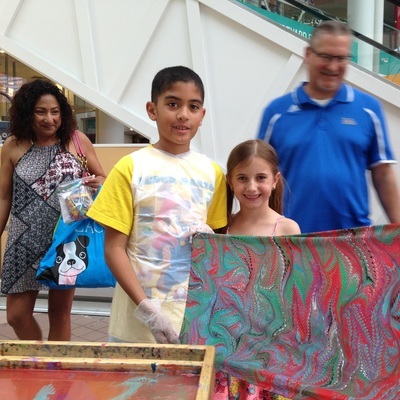 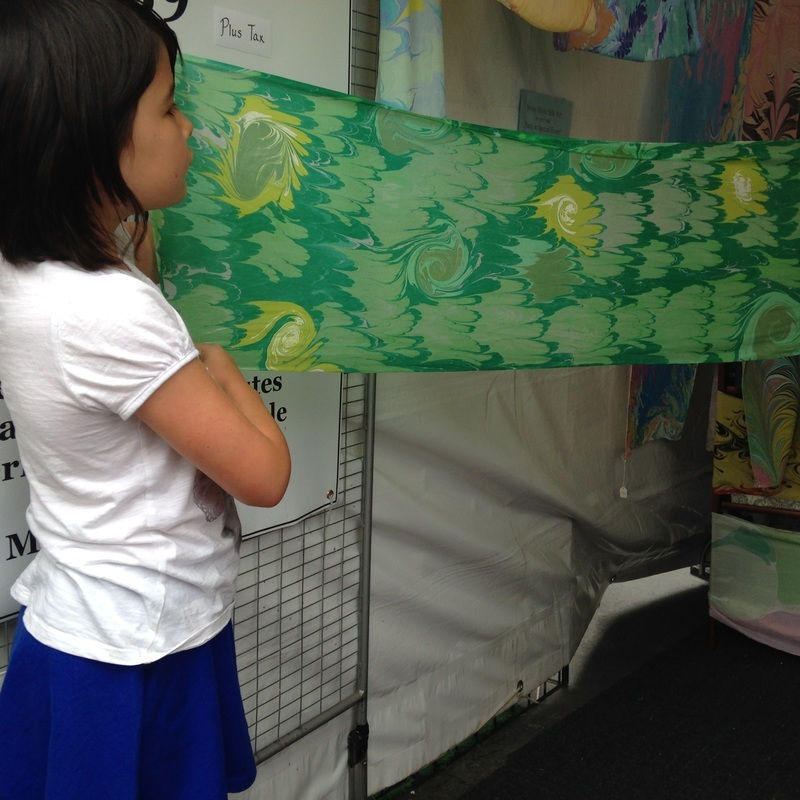 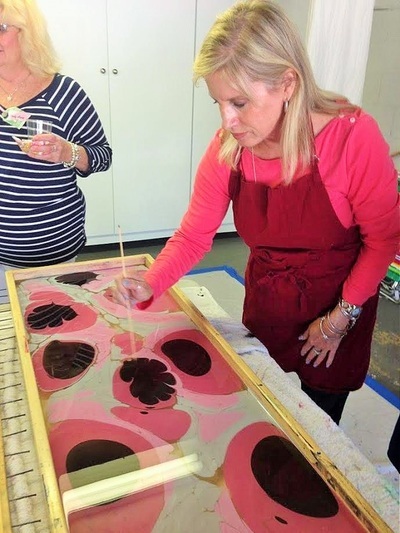 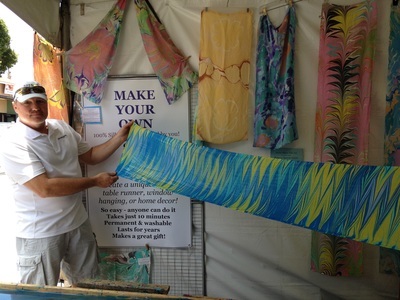 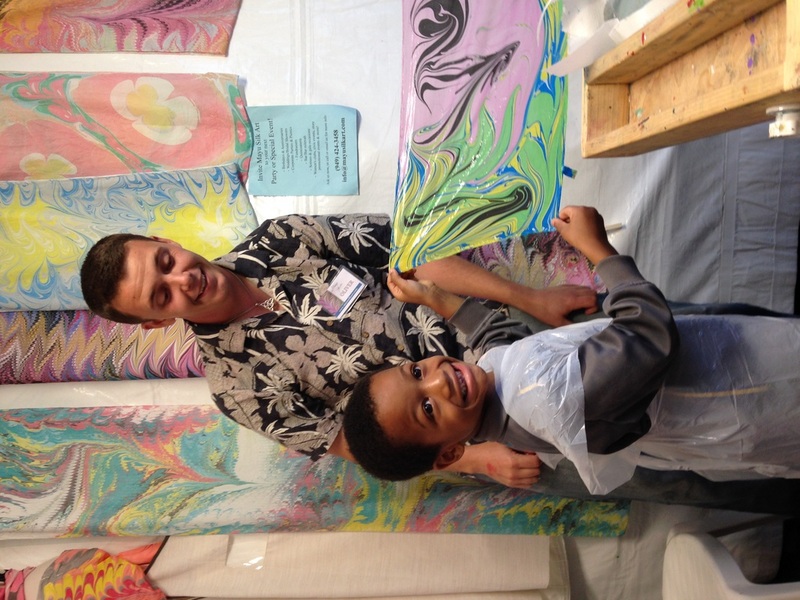 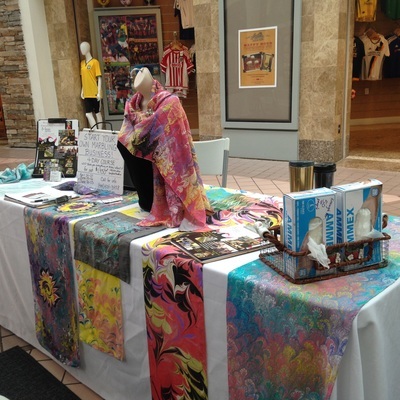 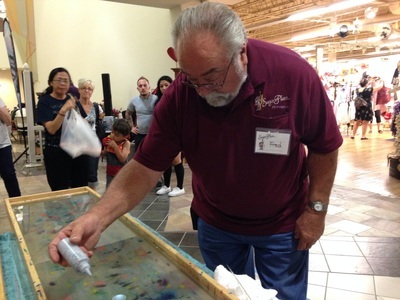 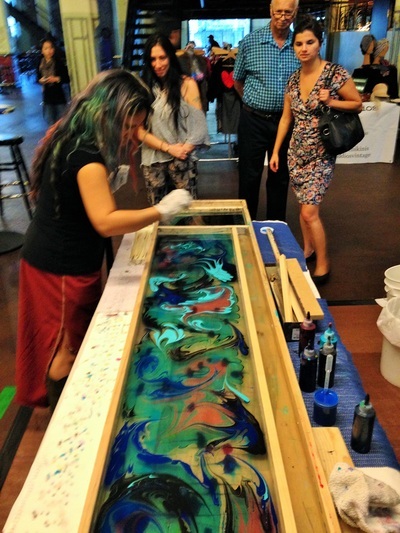 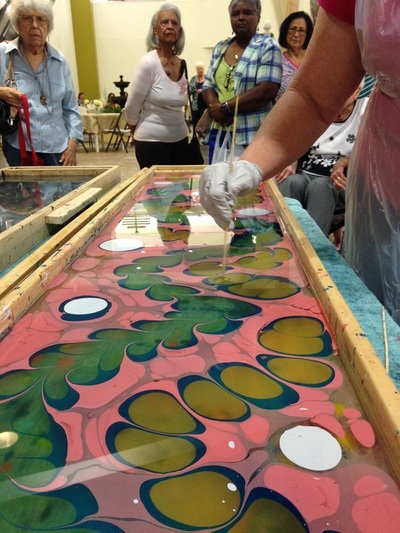 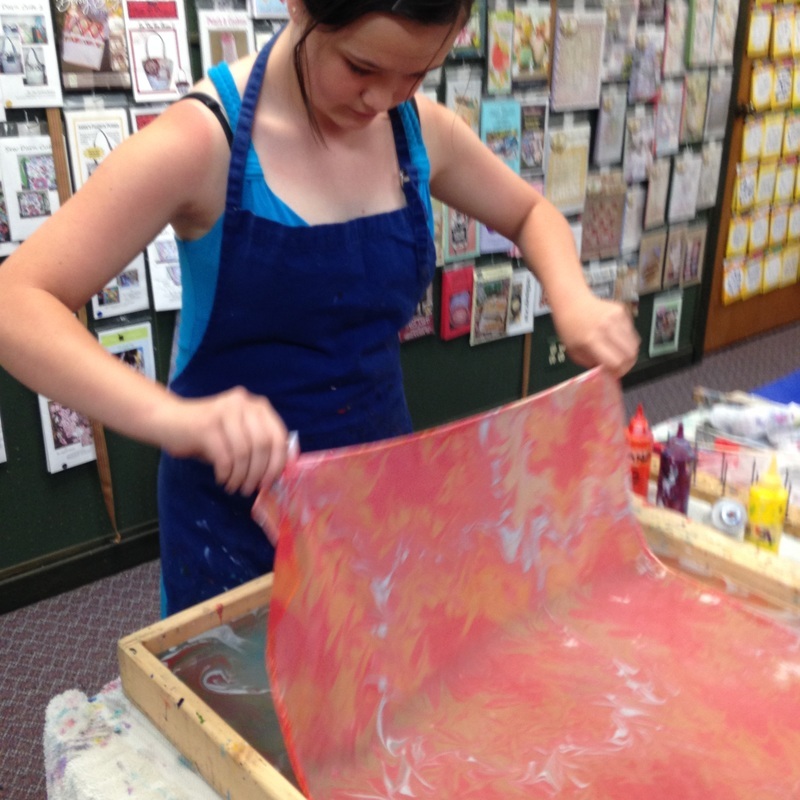 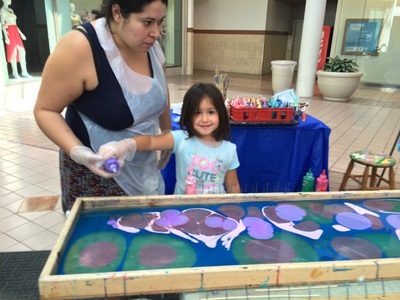 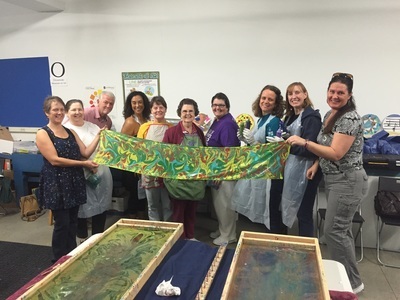 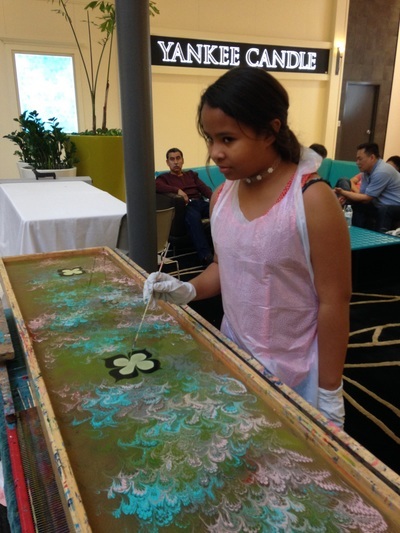 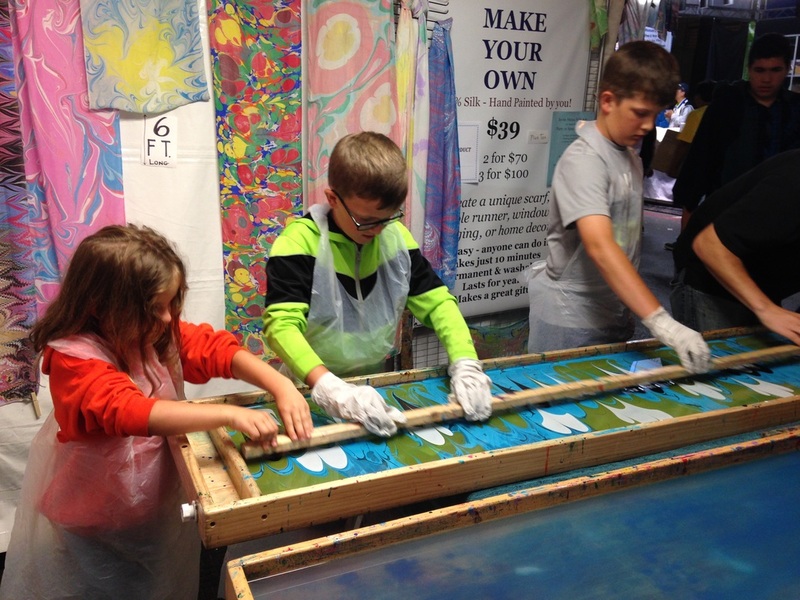 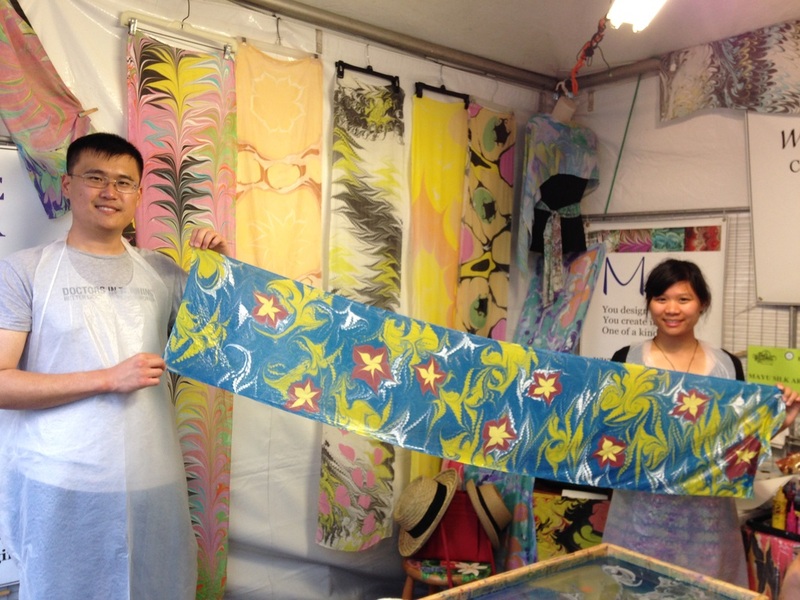 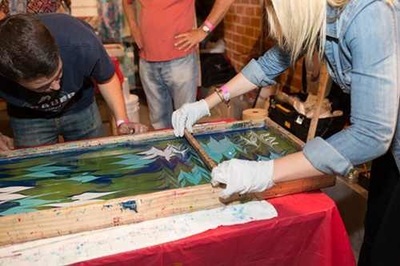 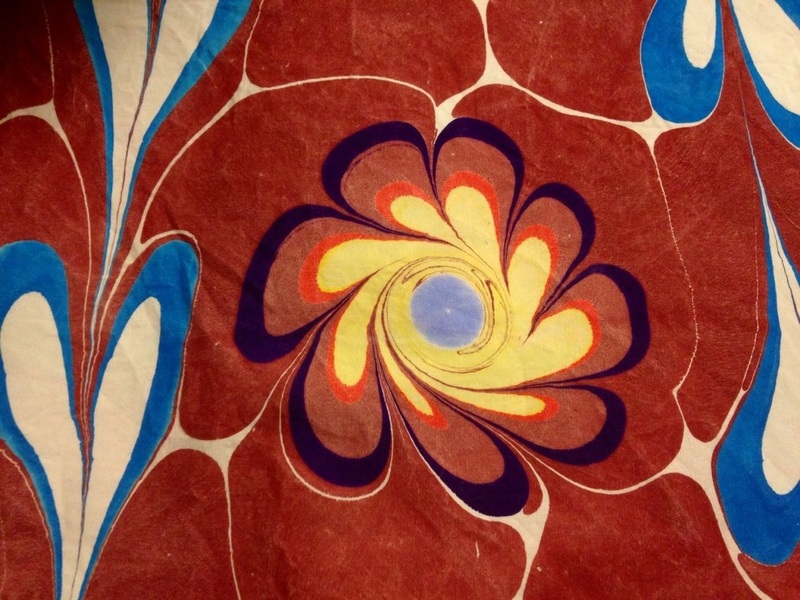 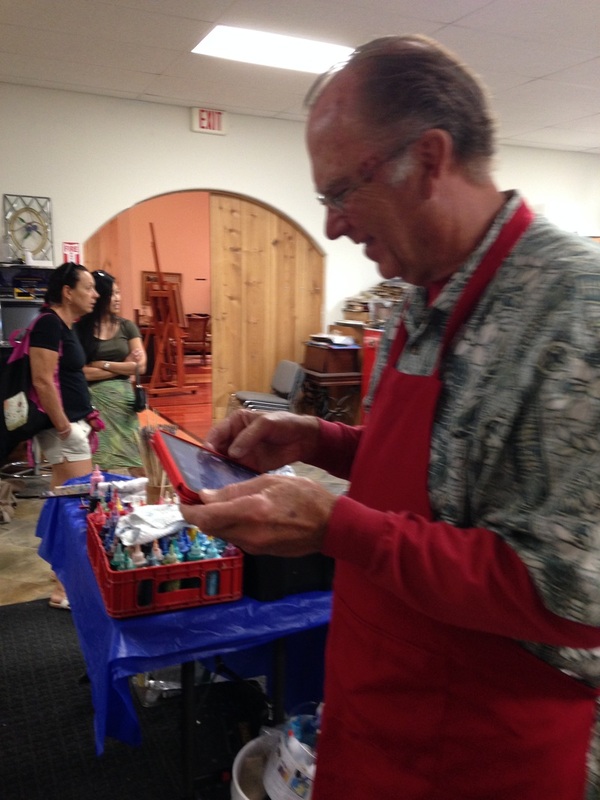 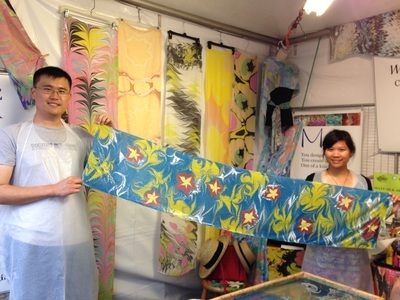 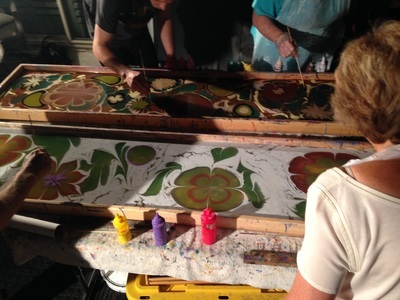 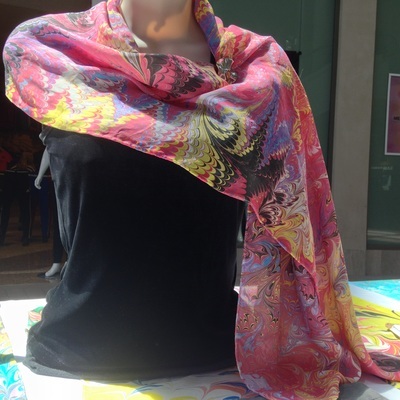 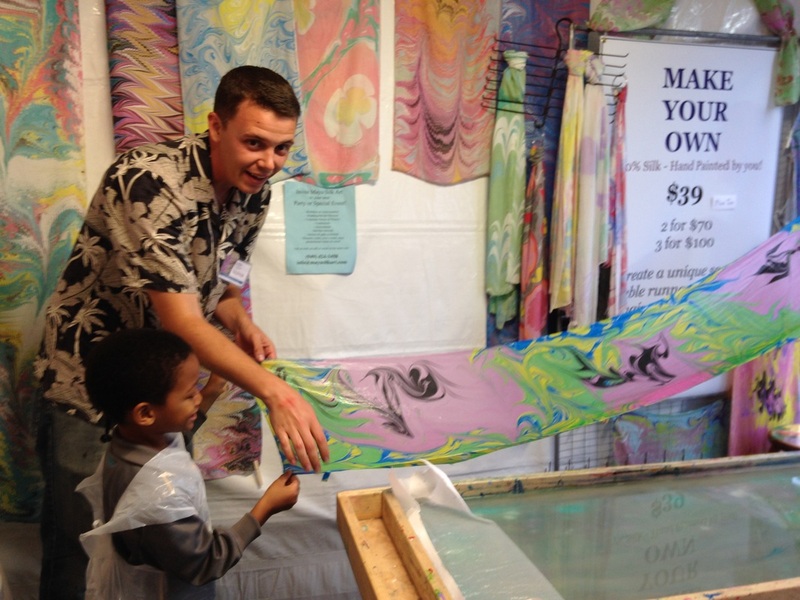 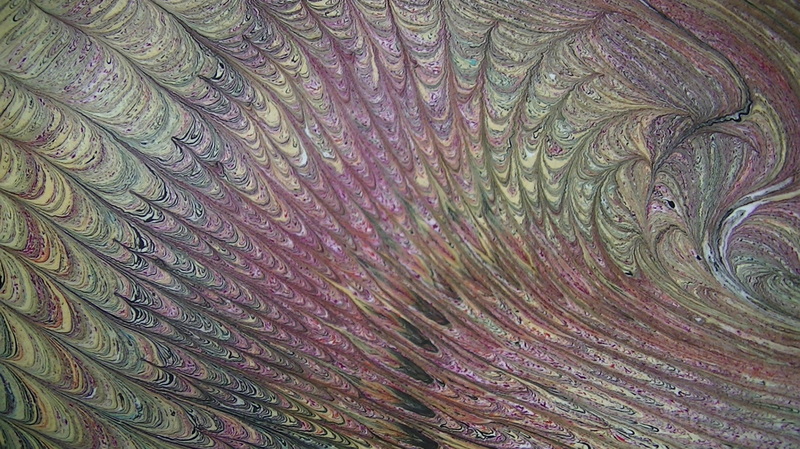 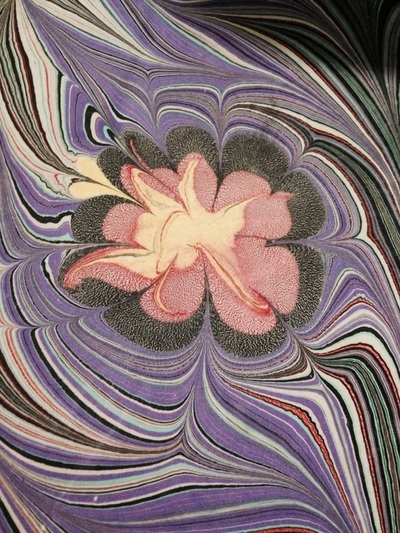 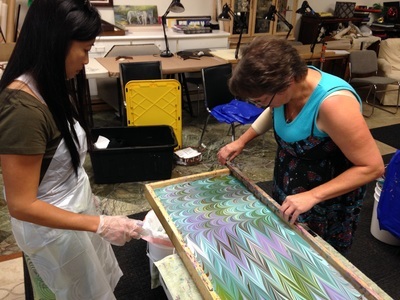 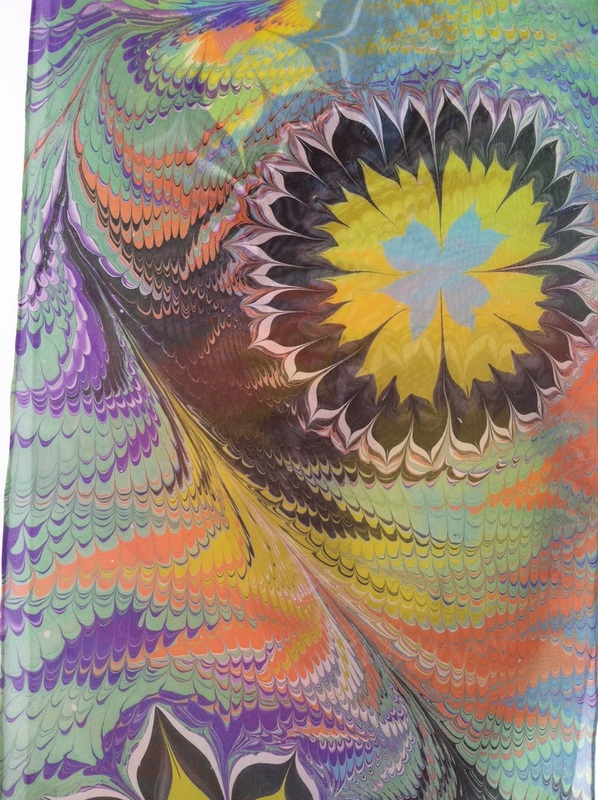 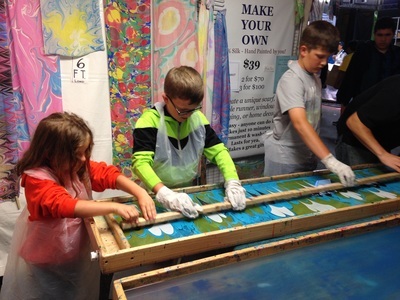 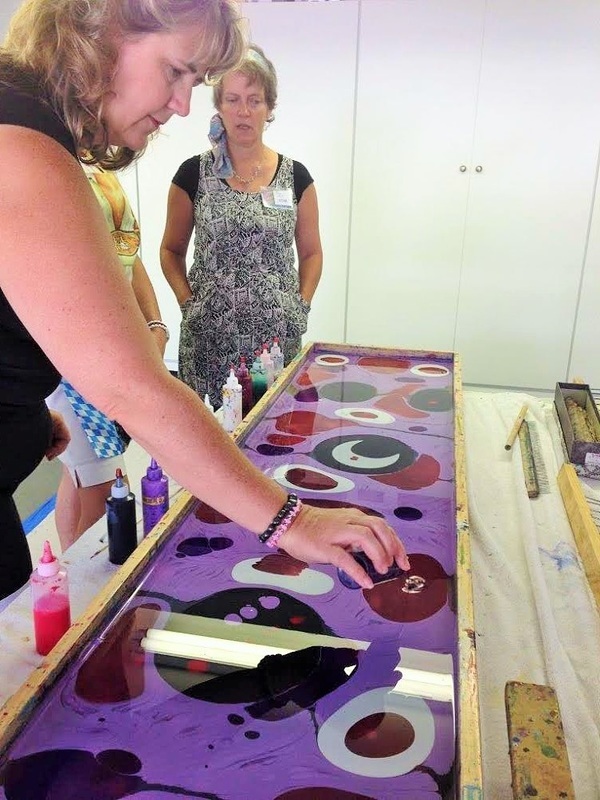 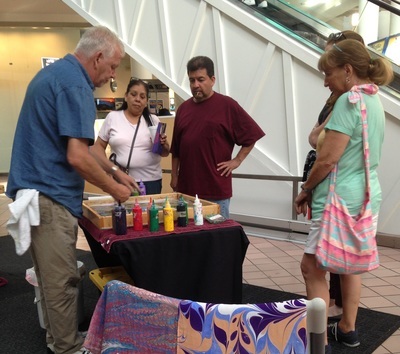 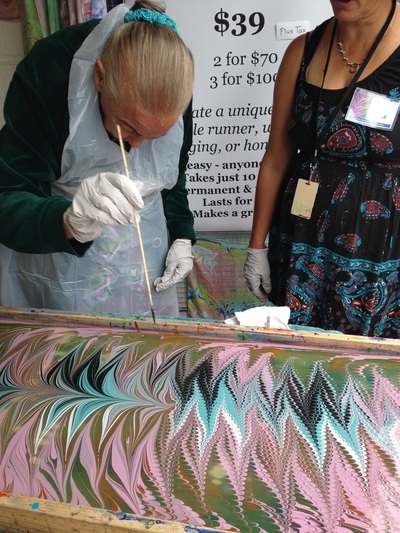 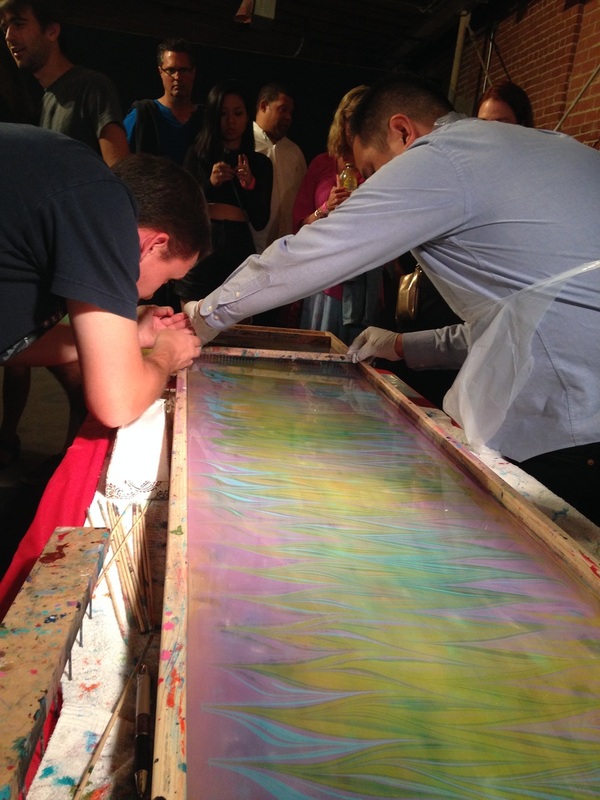 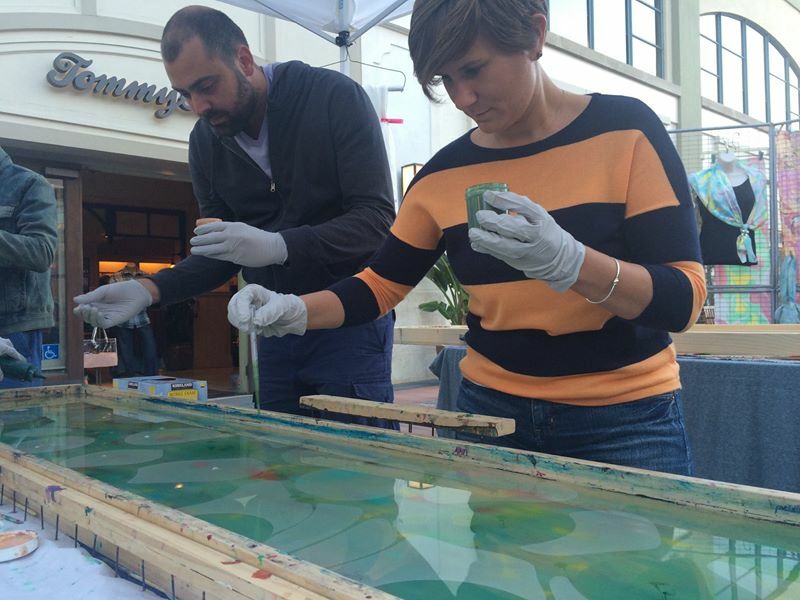 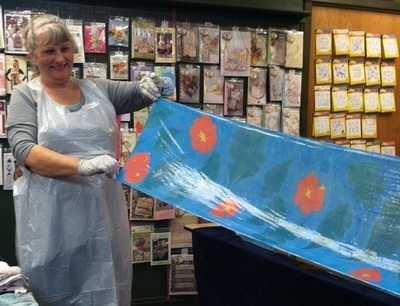 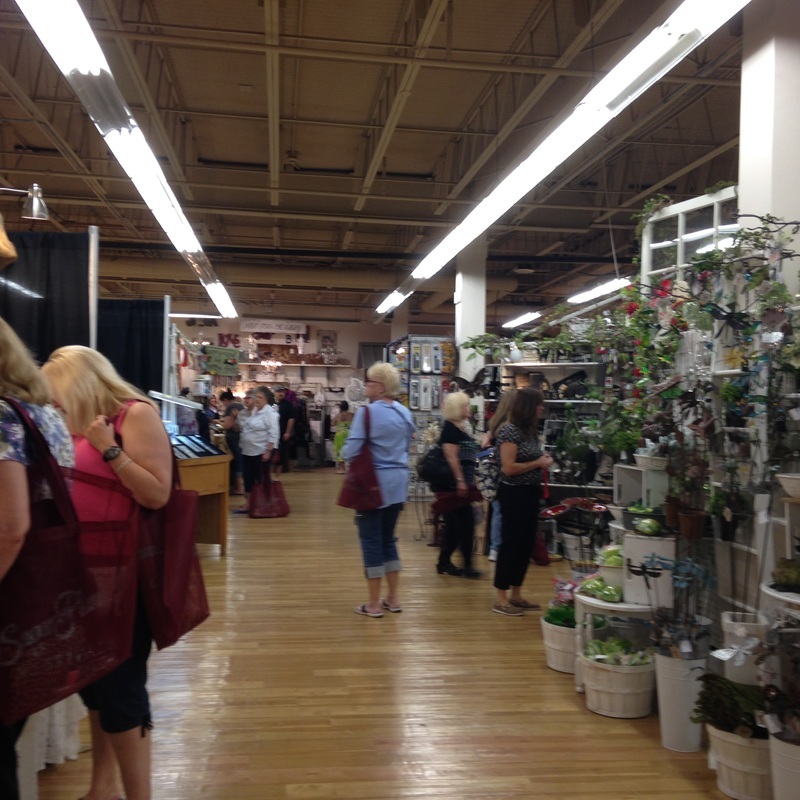 THE MAYU SILK ART EXPERIENCE AT HUNTINGTON LANDMARK, JULY 10, 2015. 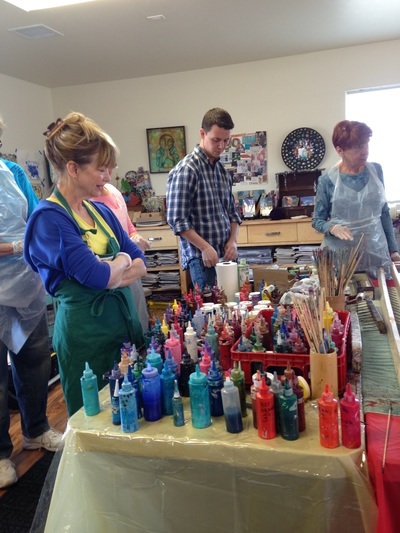 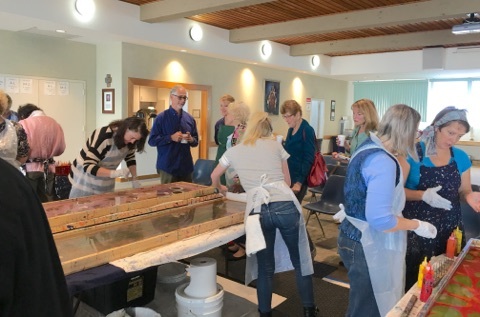 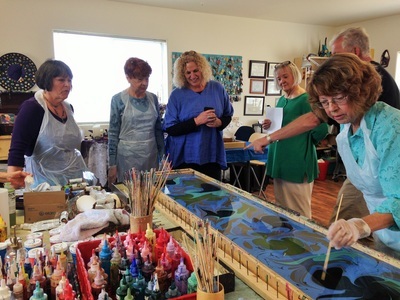 ​We had a fantastic time with this wonderful group of residents in the art room at Huntington Landmark, a beautiful retirement community in Huntington Beach, CA. 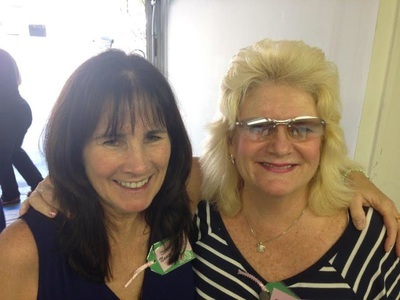 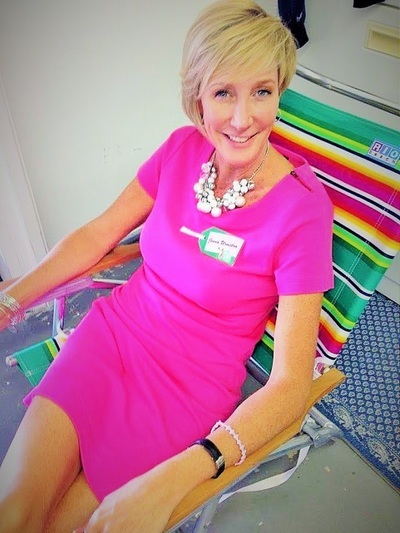 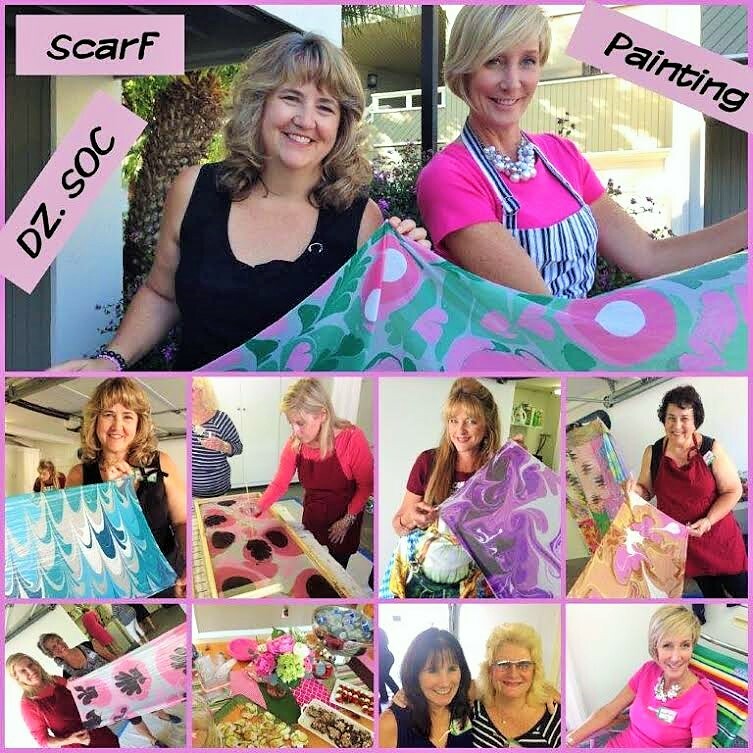 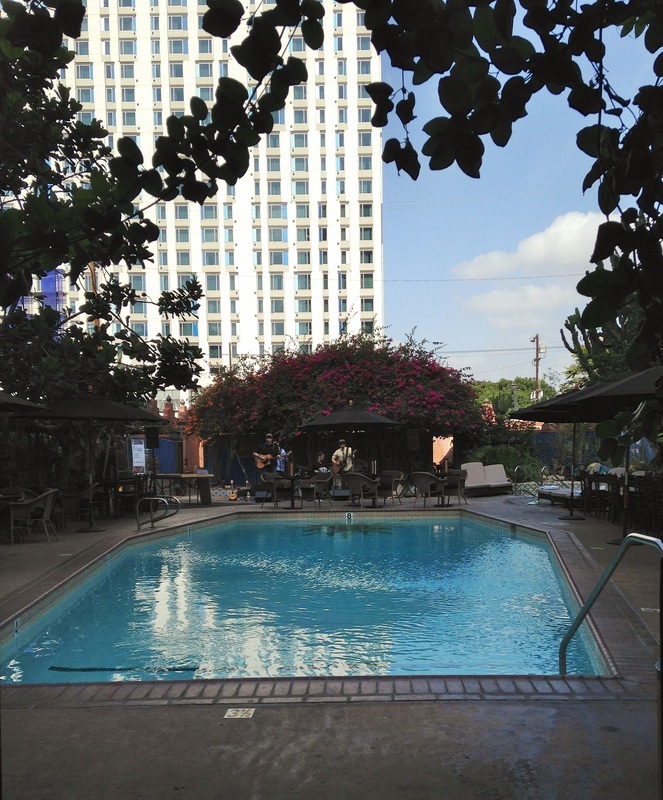 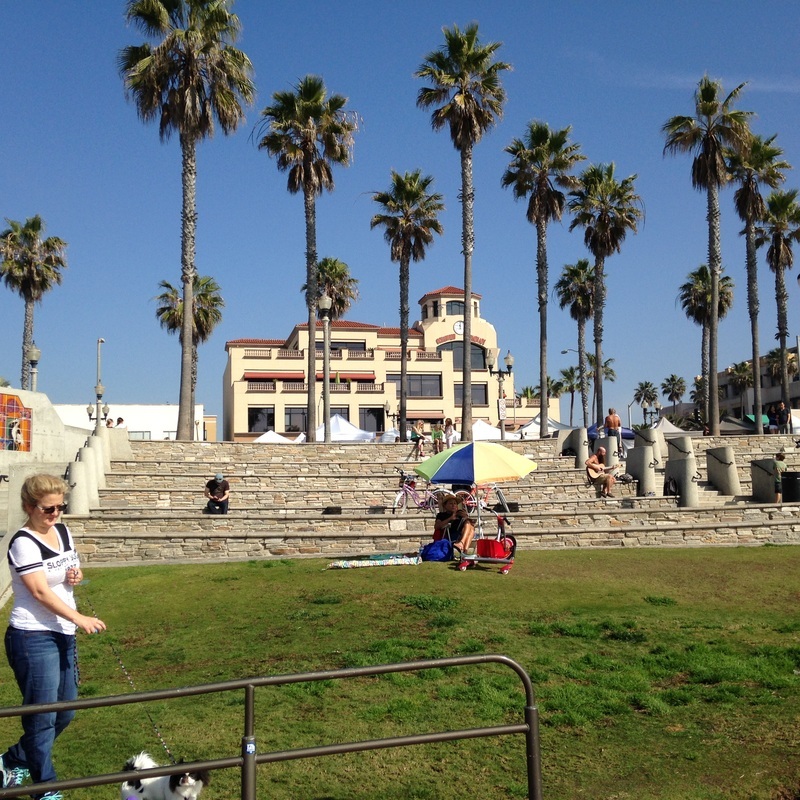 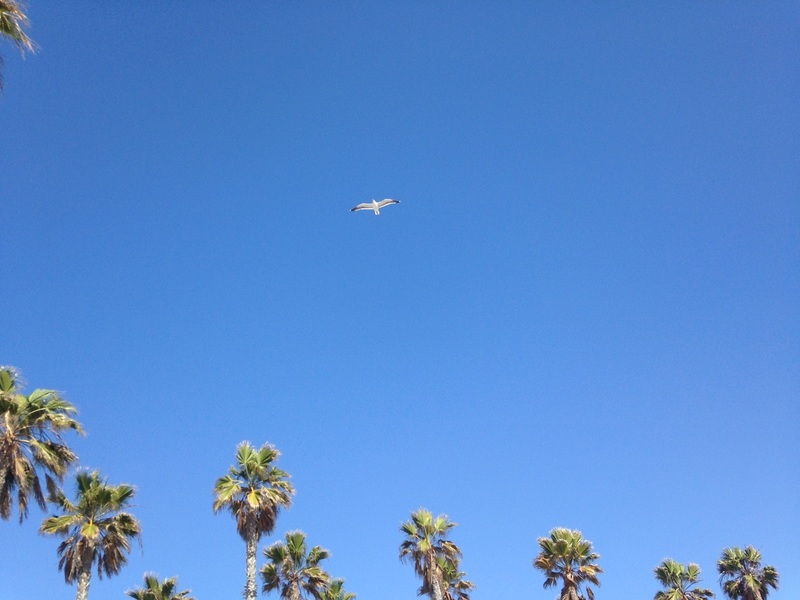 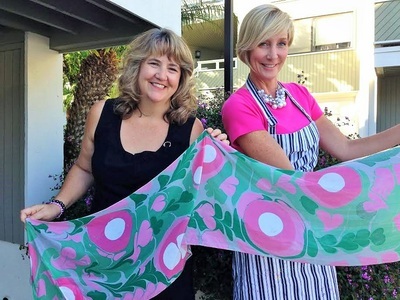 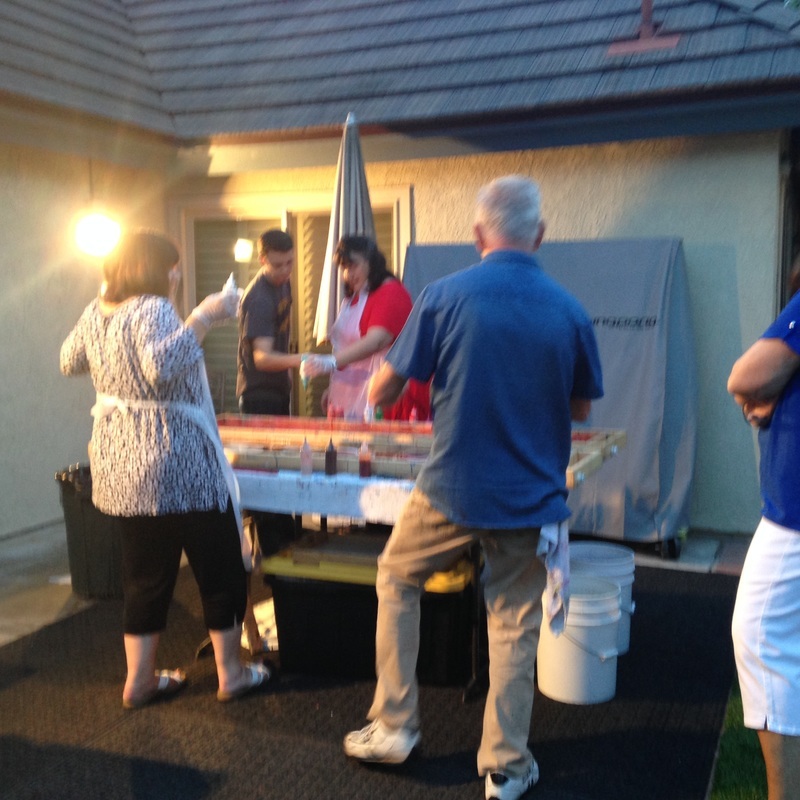 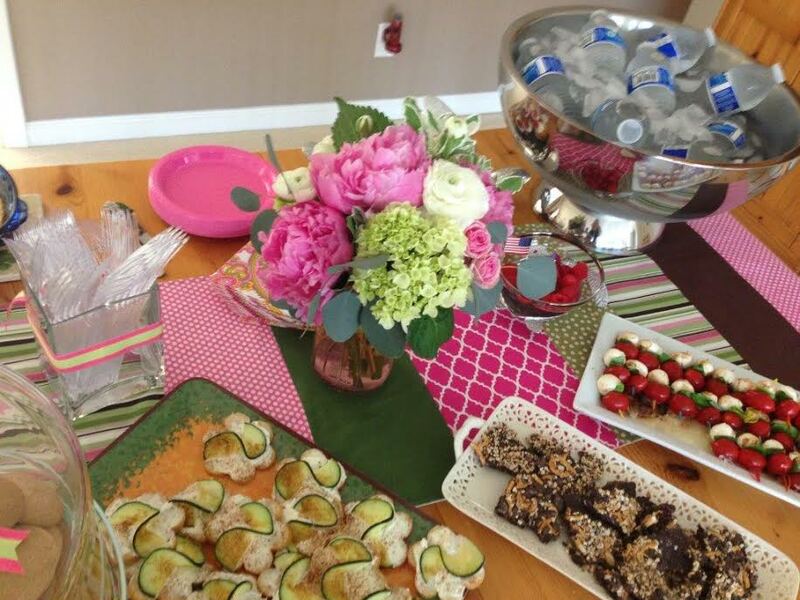 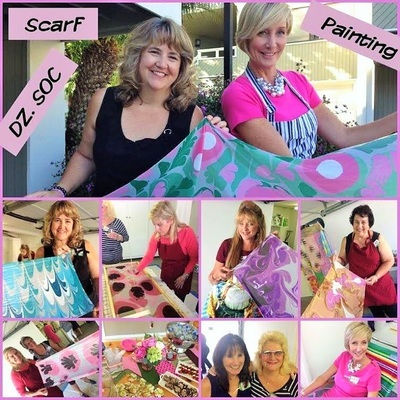 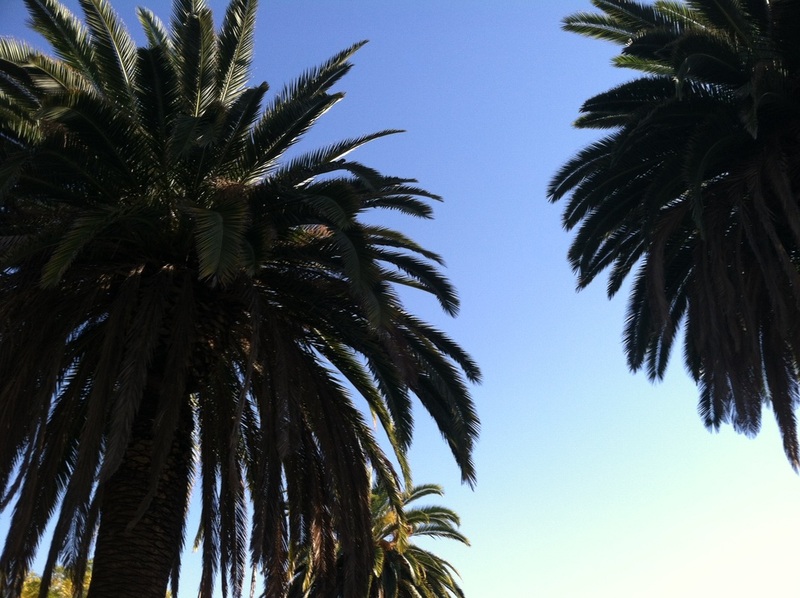 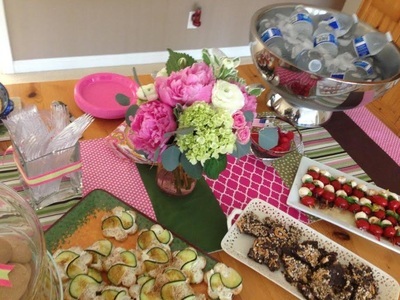 Southern Orange County Delta Zeta Alumni Party, June 14, 2015 - Newport Beach, CA. 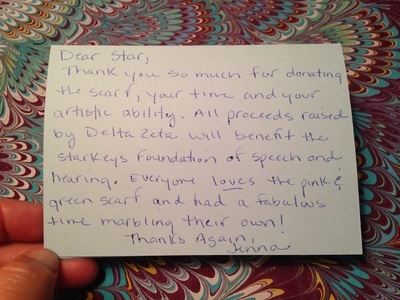 Thanks to our host, Jenna Urmston, for making it very special for all of us! 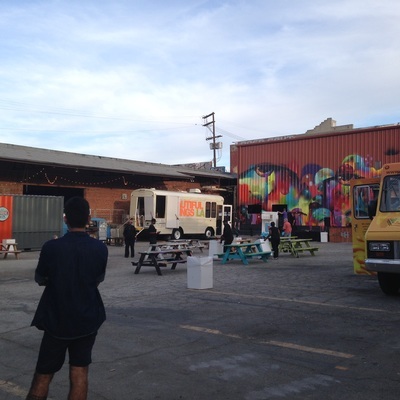 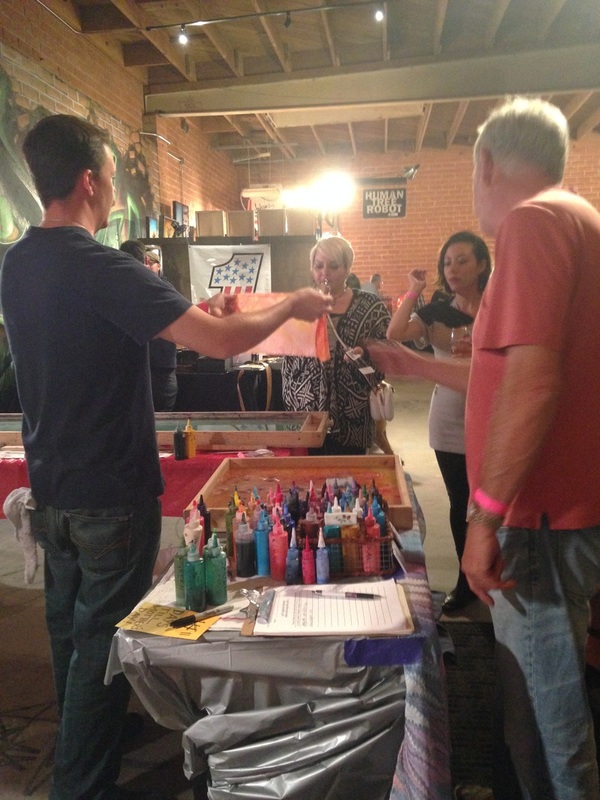 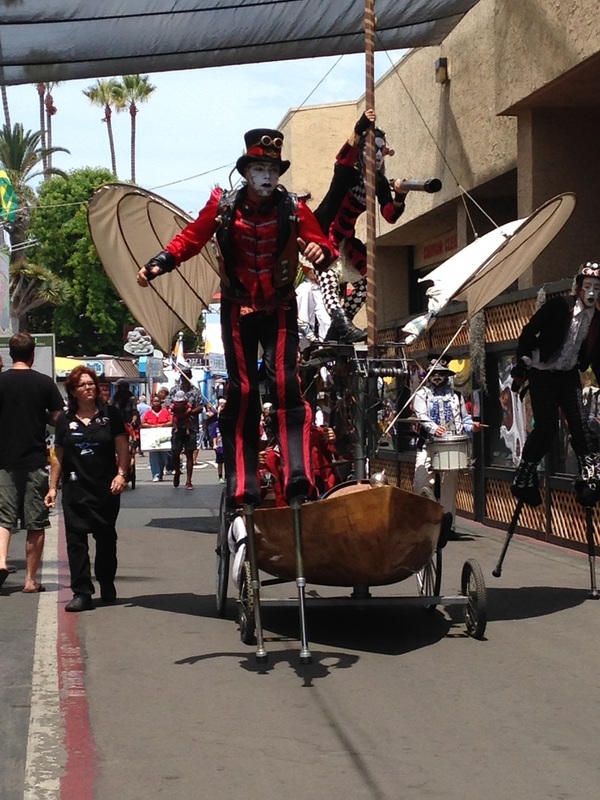 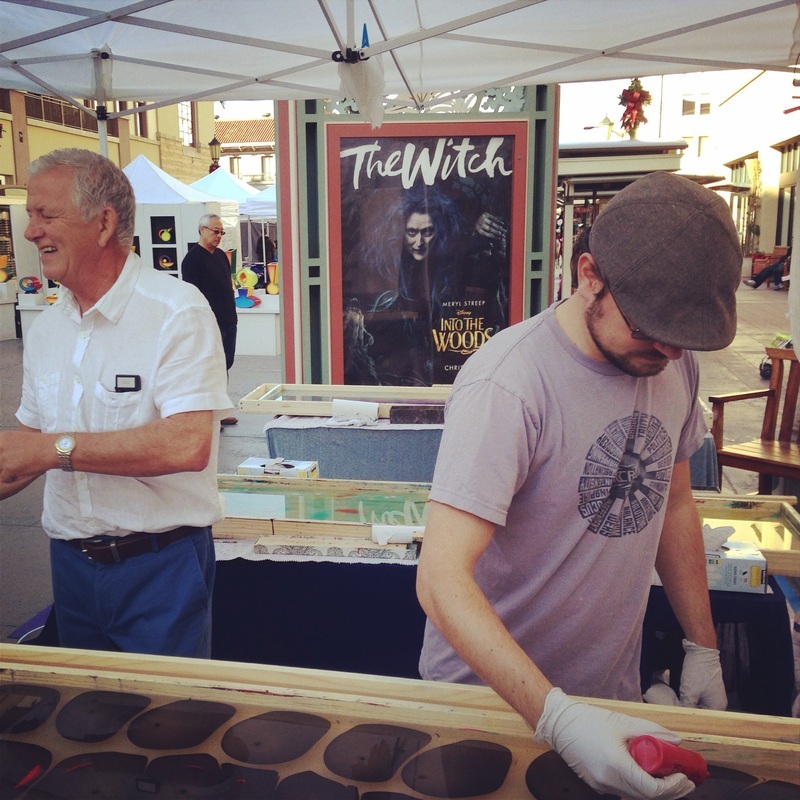 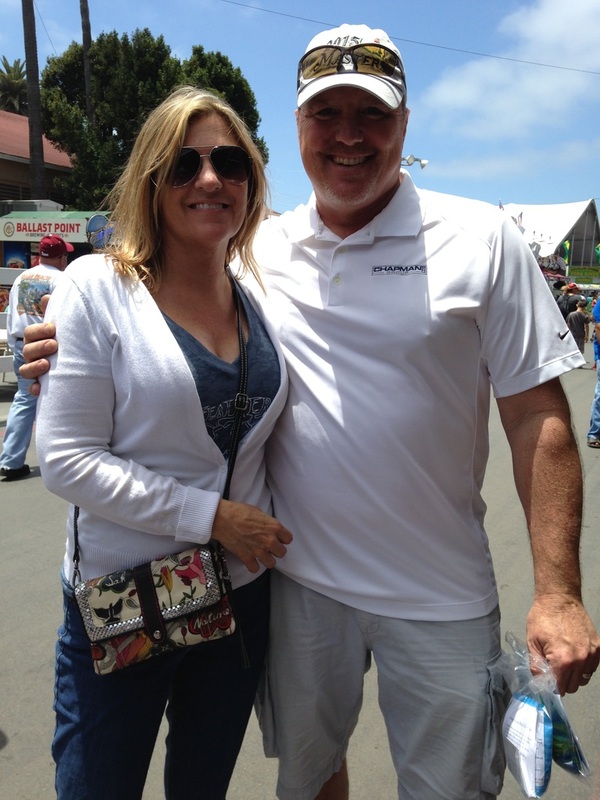 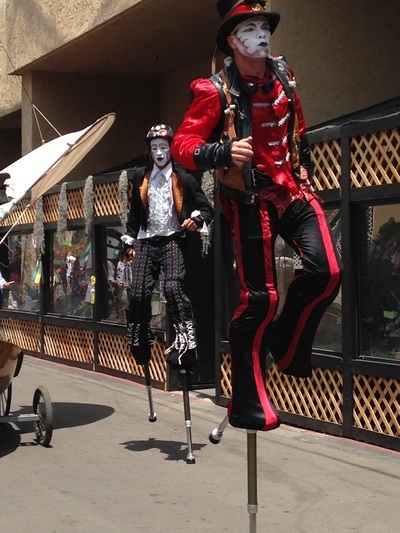 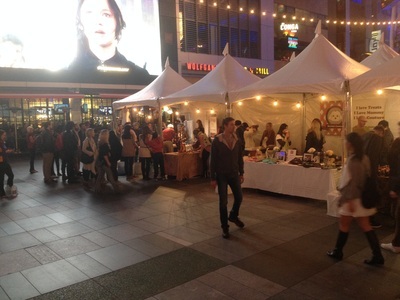 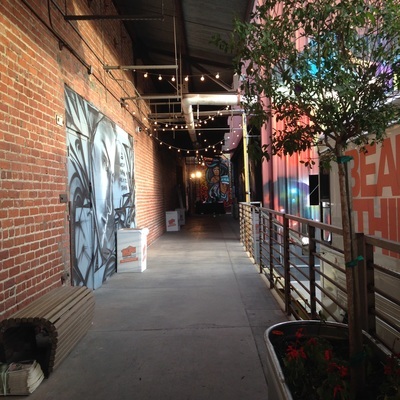 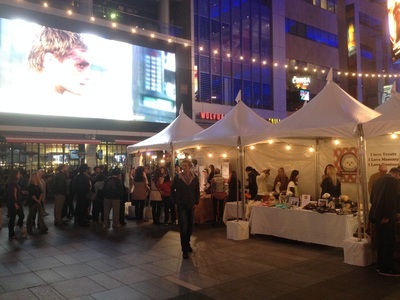 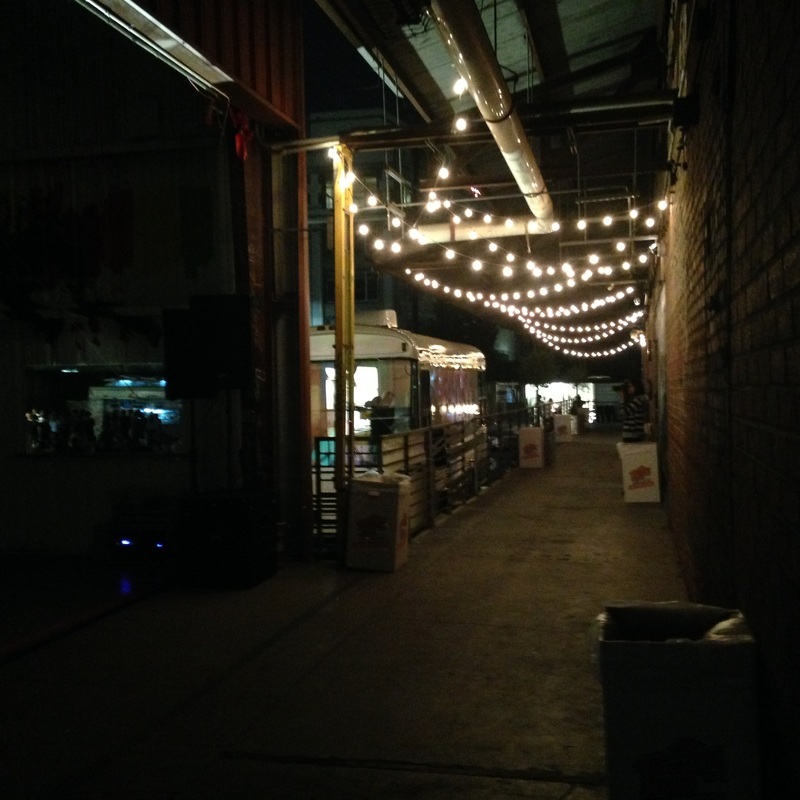 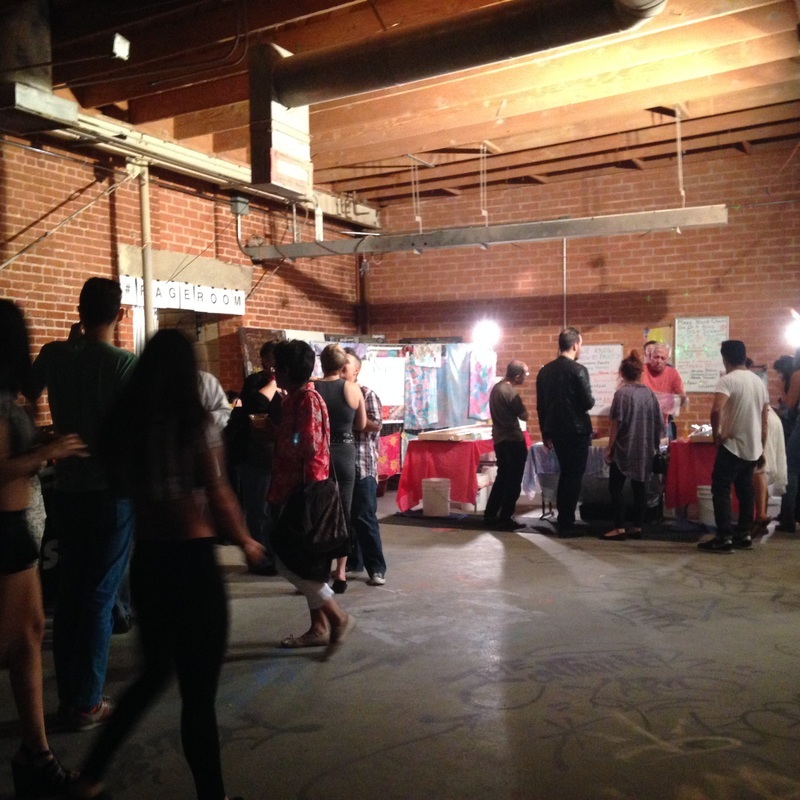 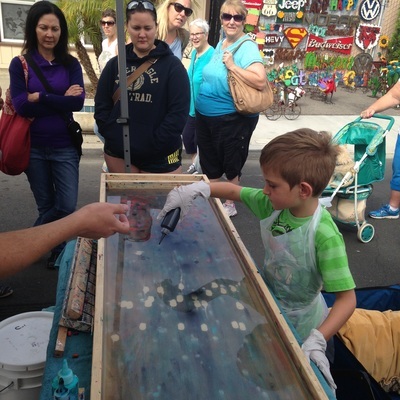 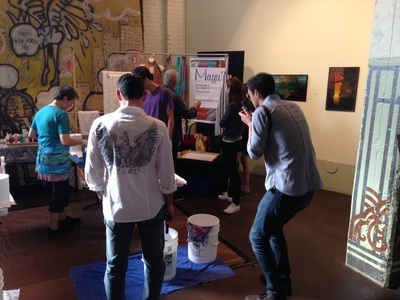 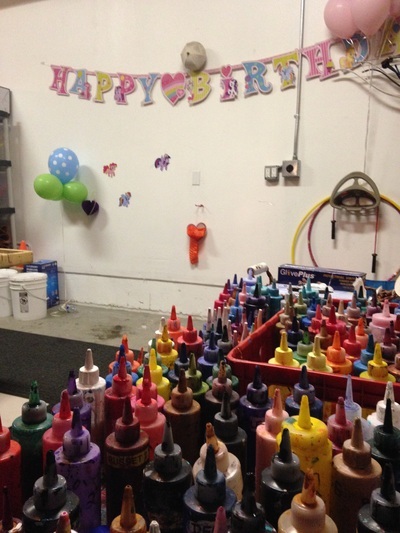 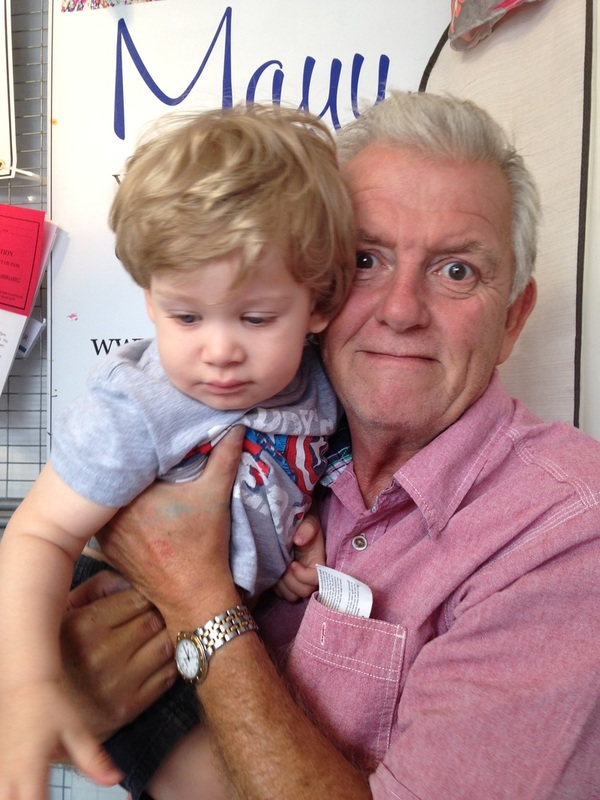 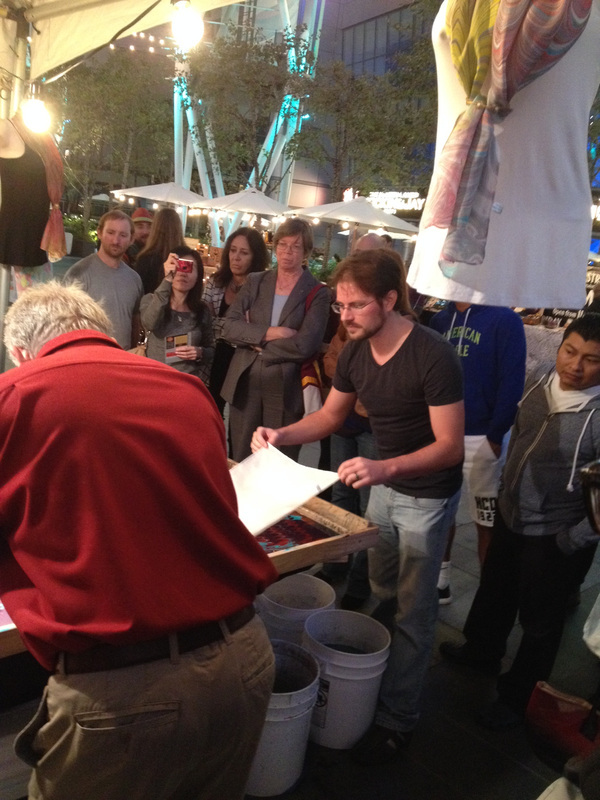 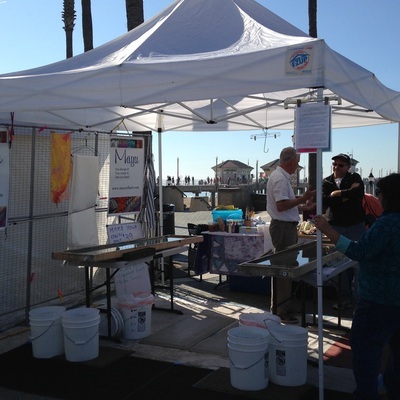 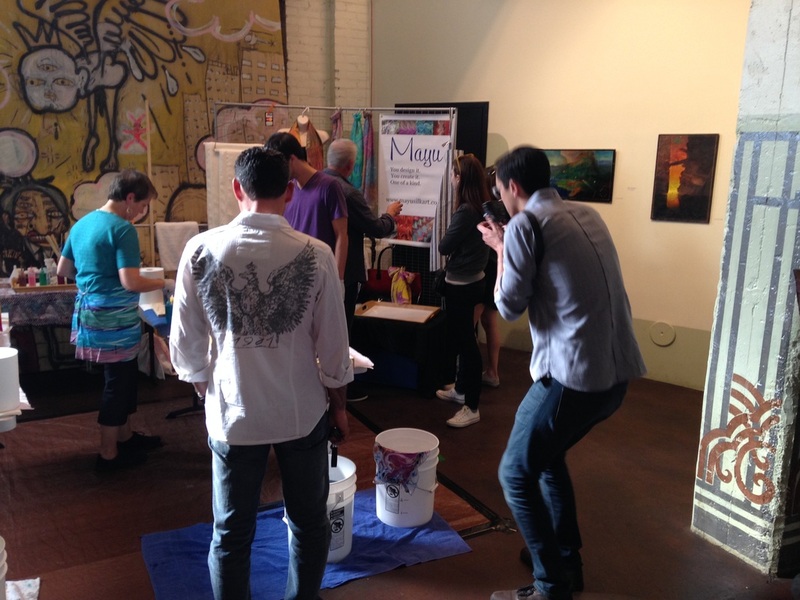 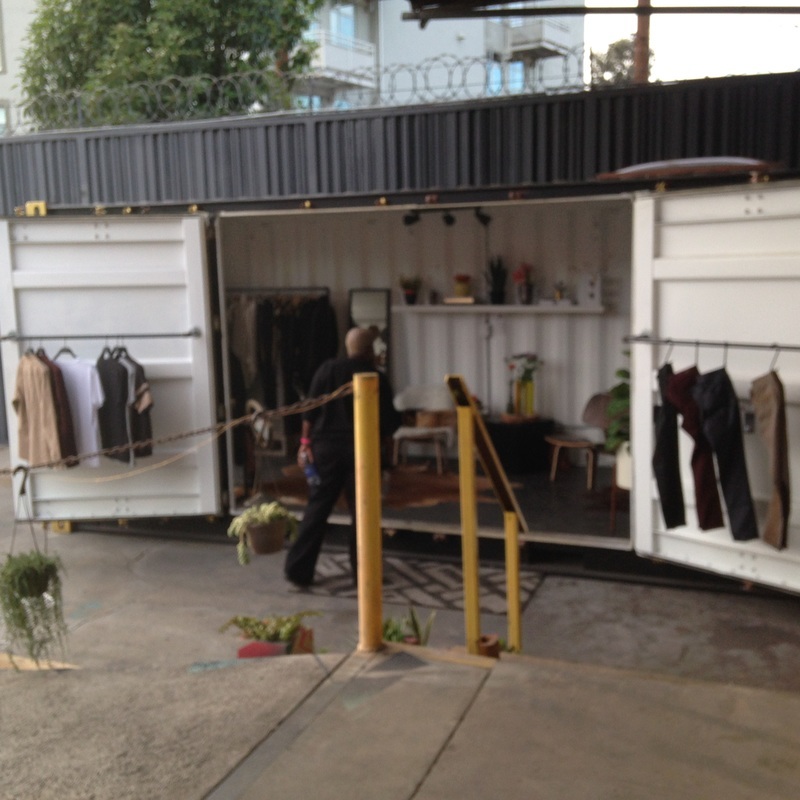 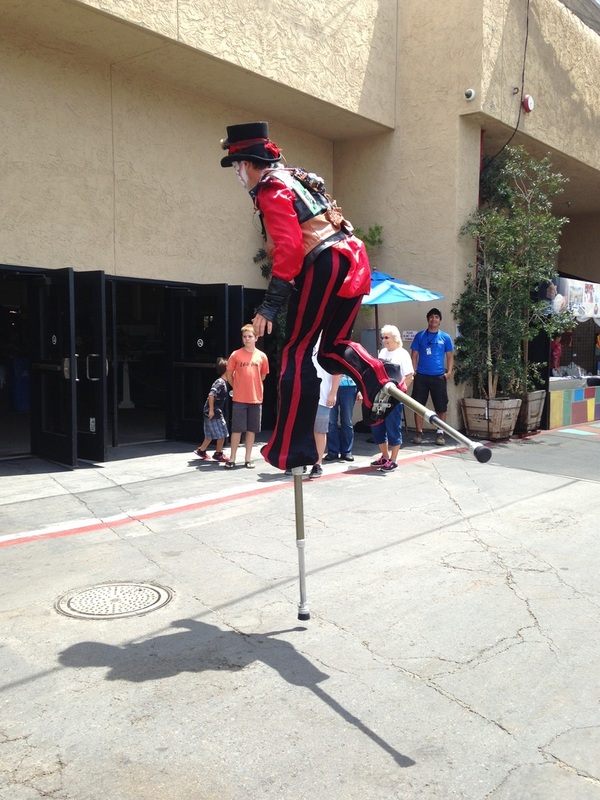 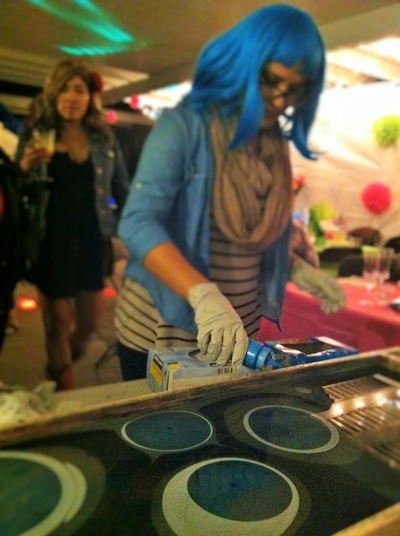 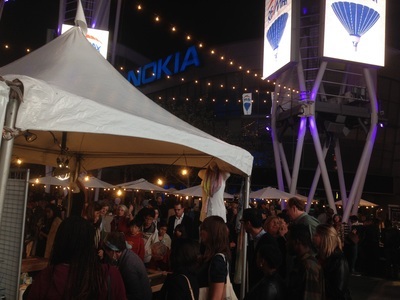 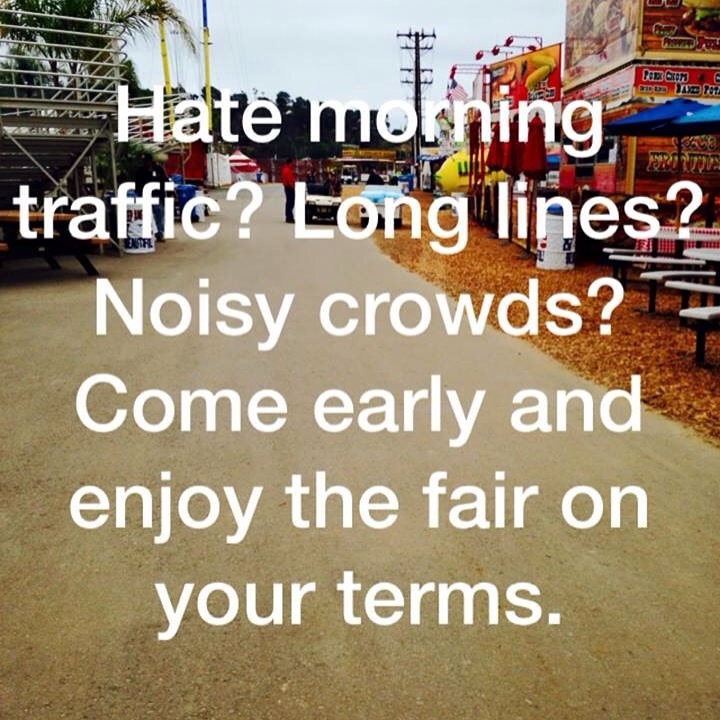 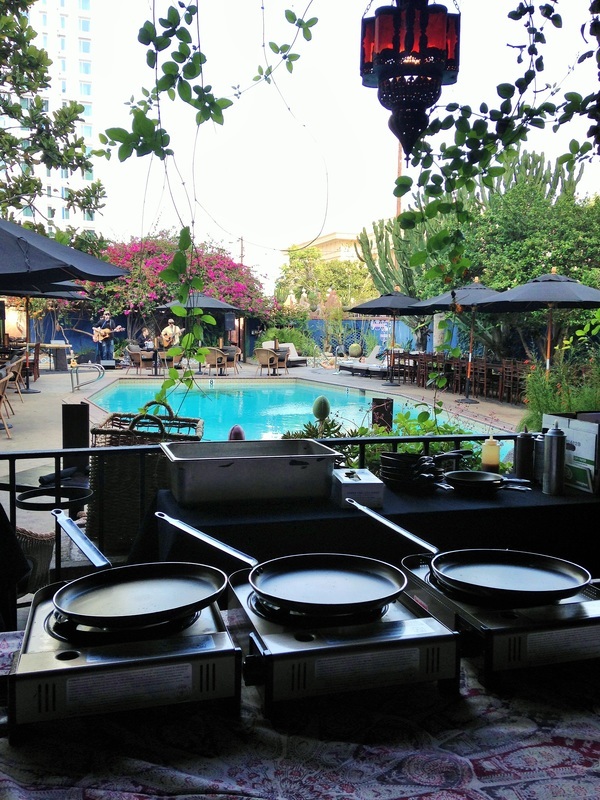 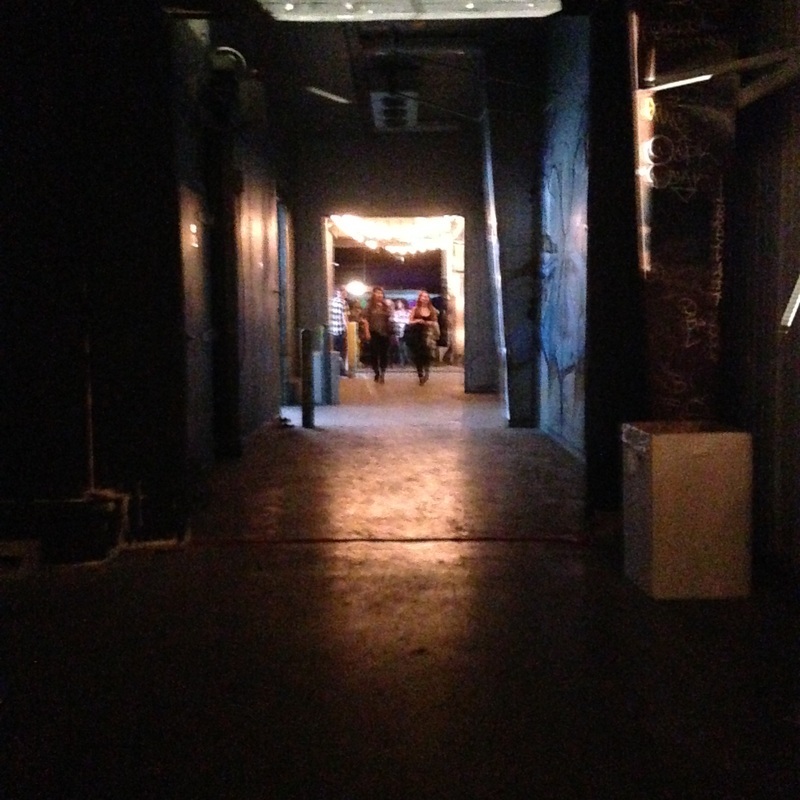 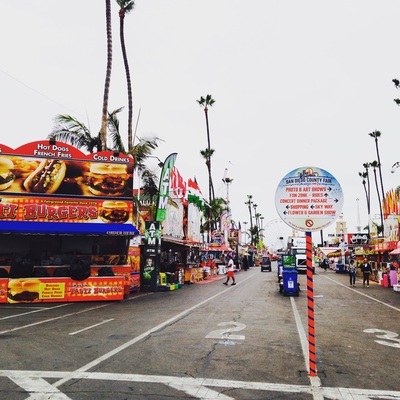 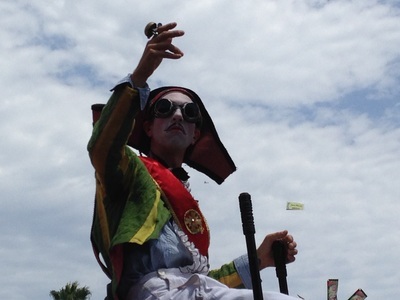 San Diego (Del Mar) County Fair: "A Faire to Remember"
EMPLOYEE APPRECIATION DAY AT FILM L.A.